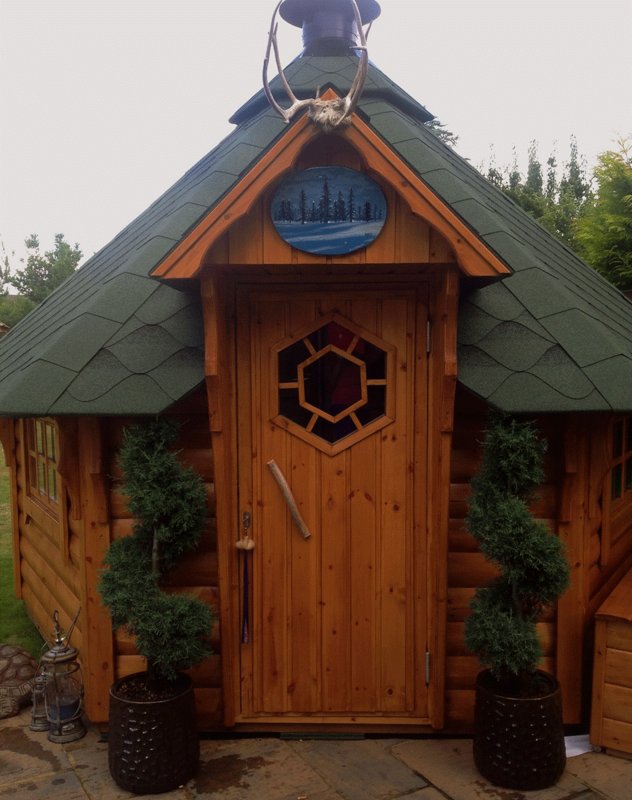 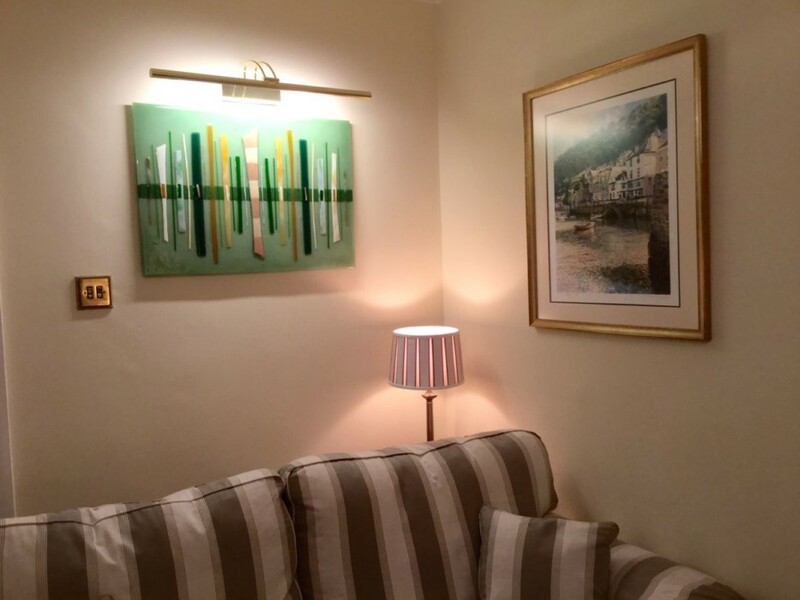 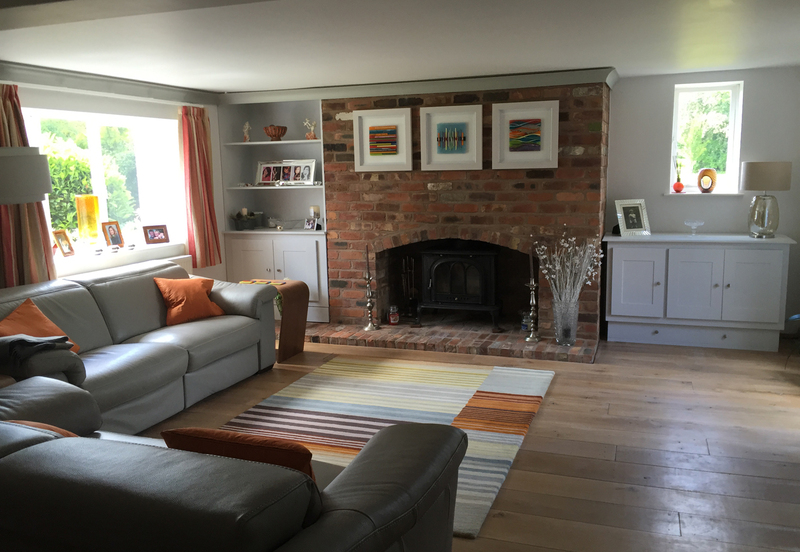 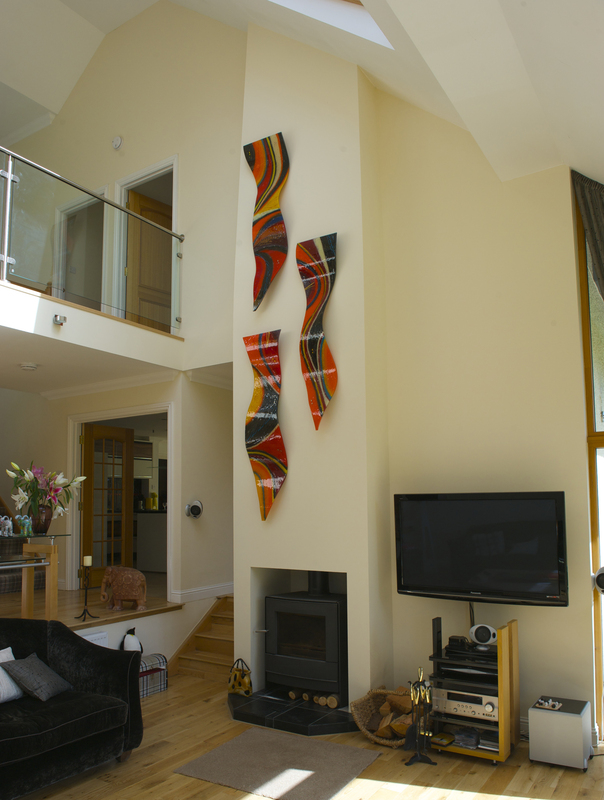 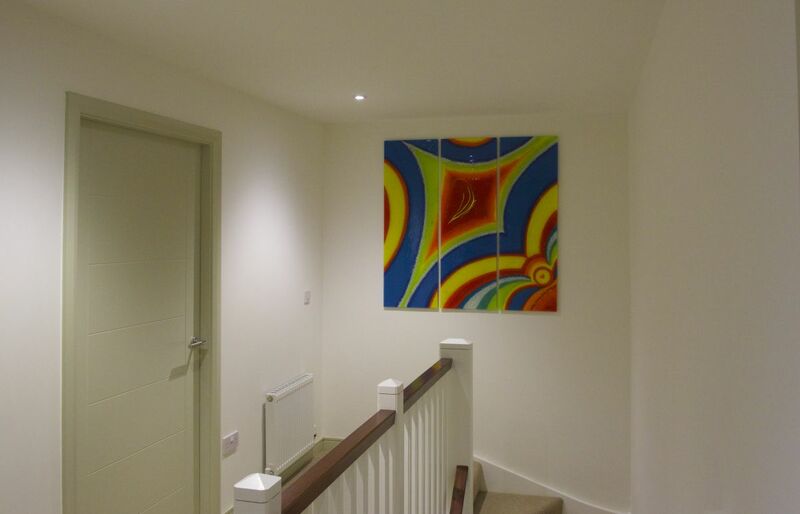 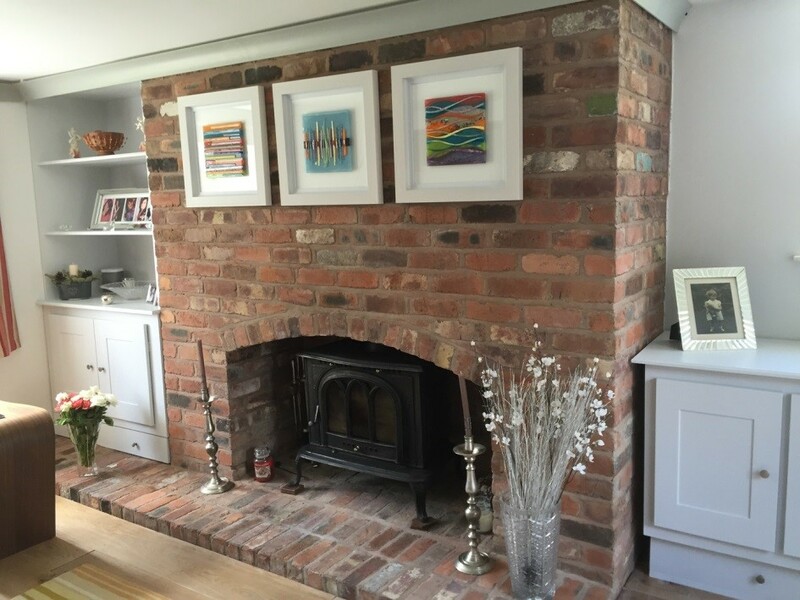 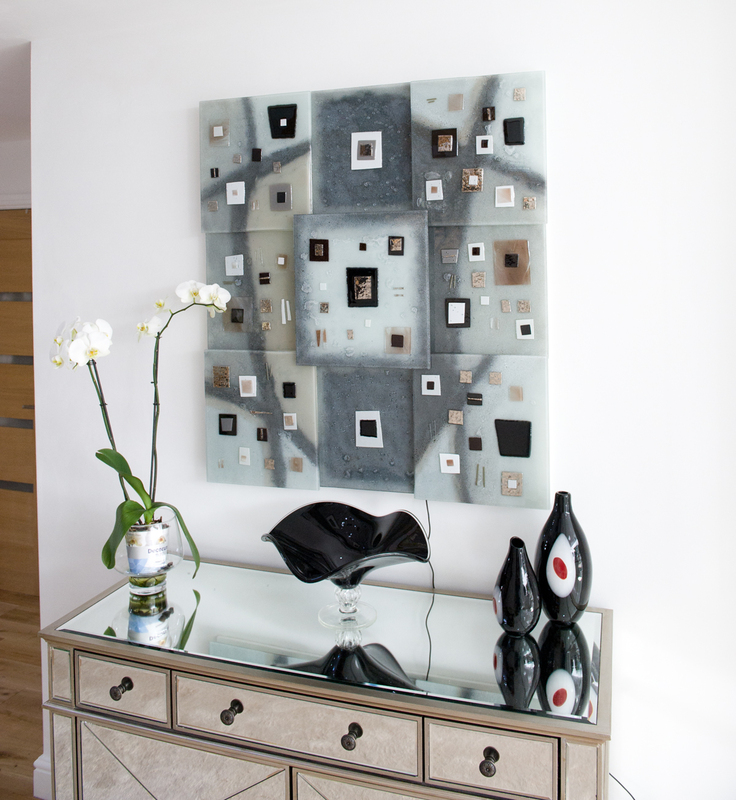 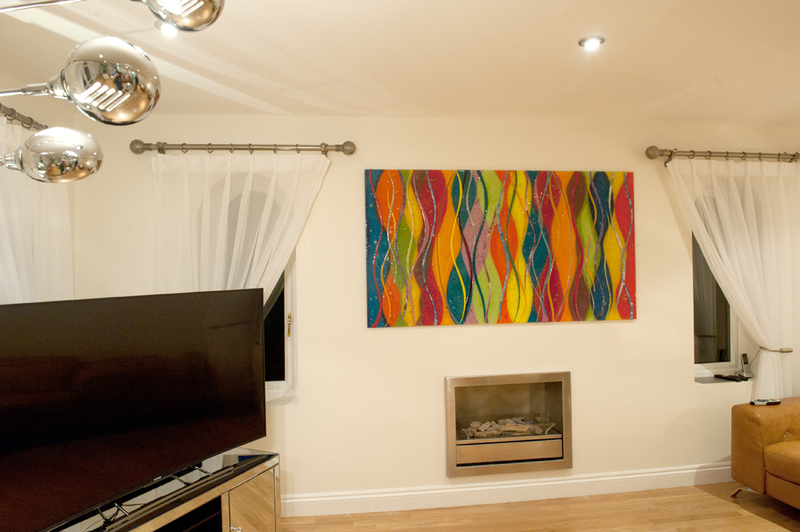 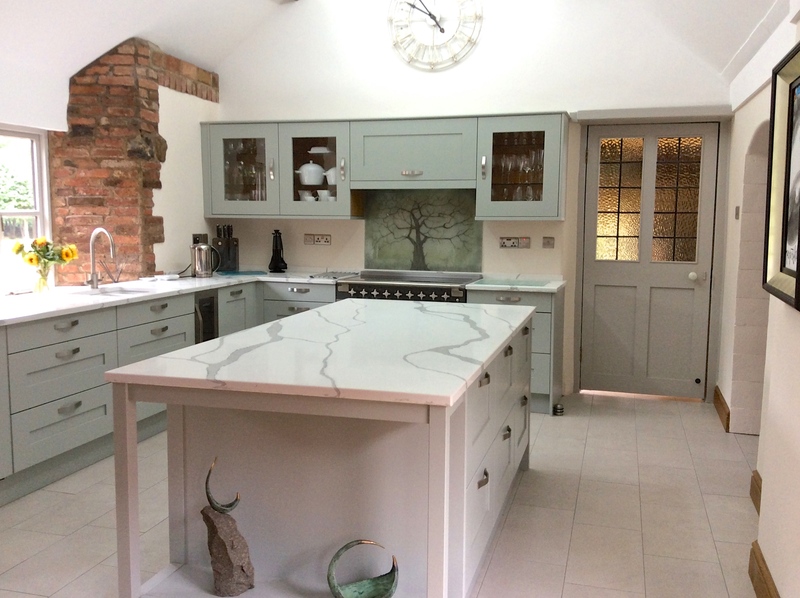 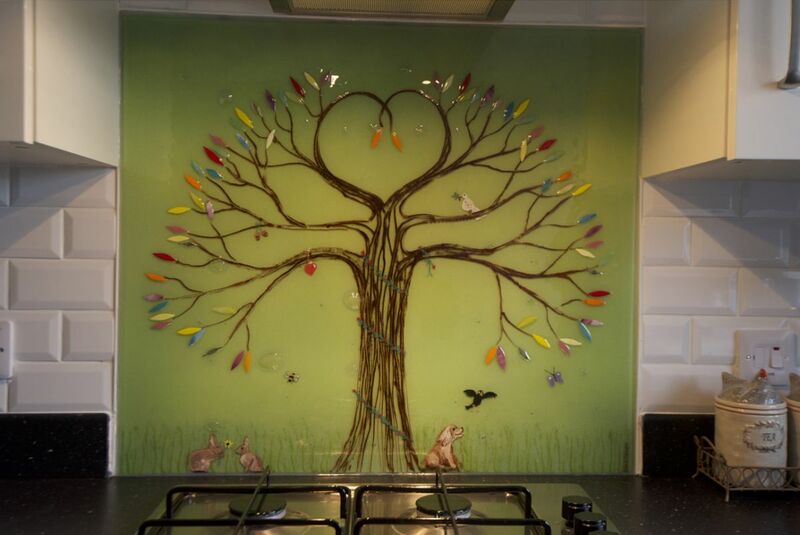 Here’s a piece we recently crafted and delivered to a home in Lymm, Cheshire. 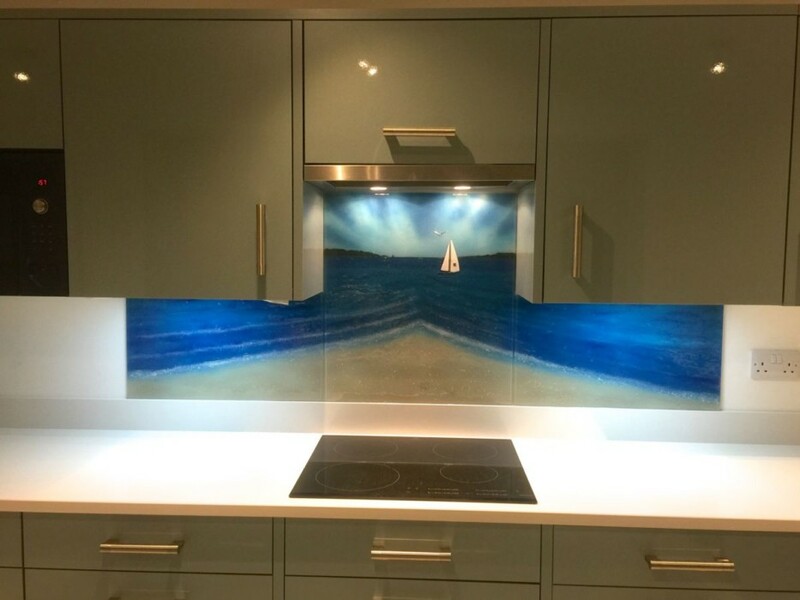 Centred around a gorgeously deep blue sea theme, the design of this grand bathroom splashback depicts an incredible seascape. 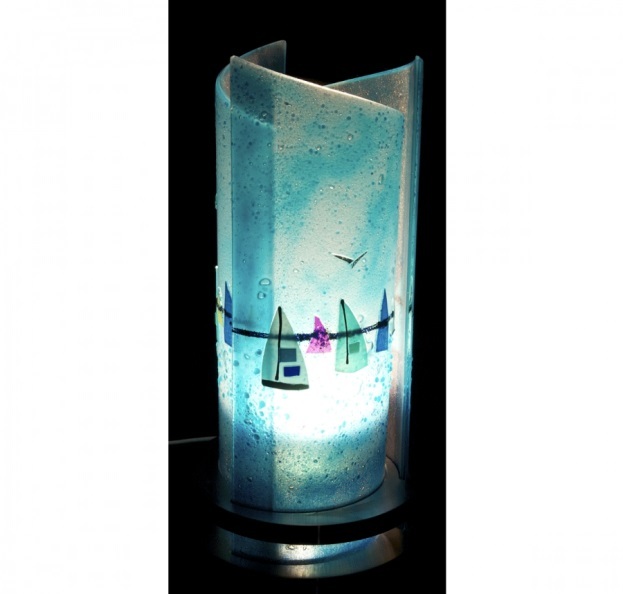 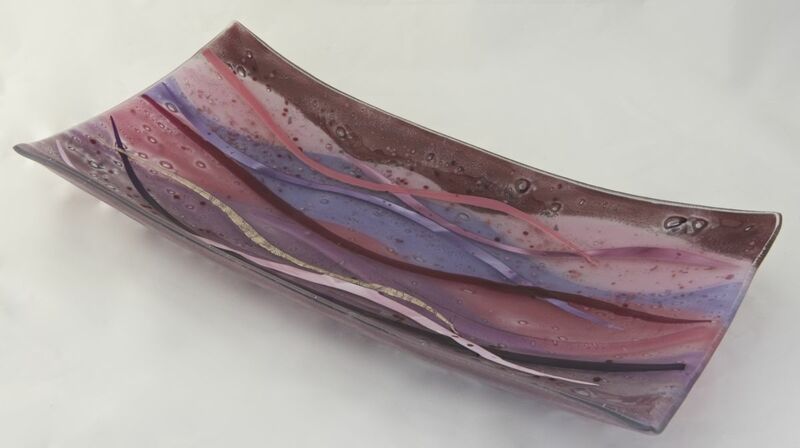 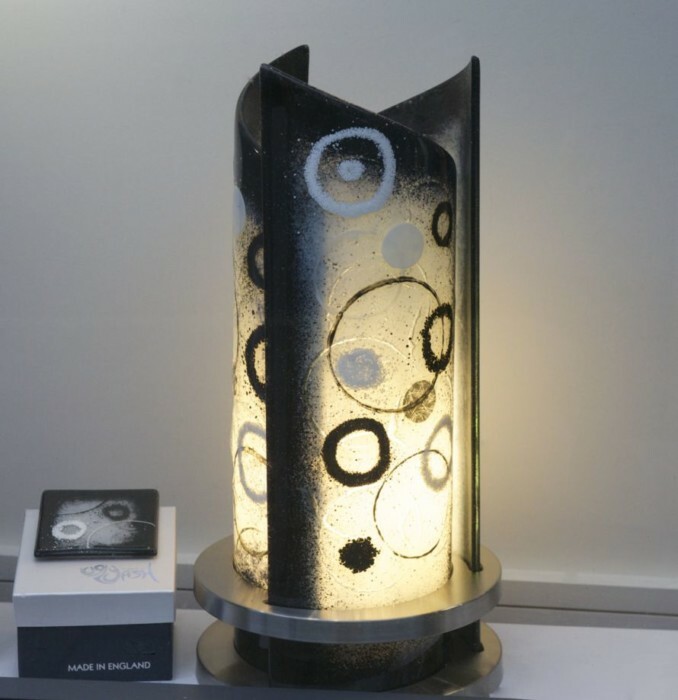 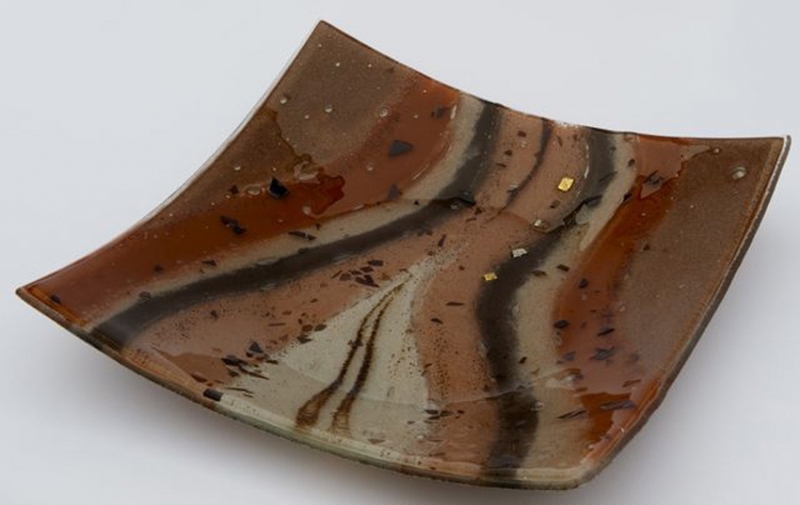 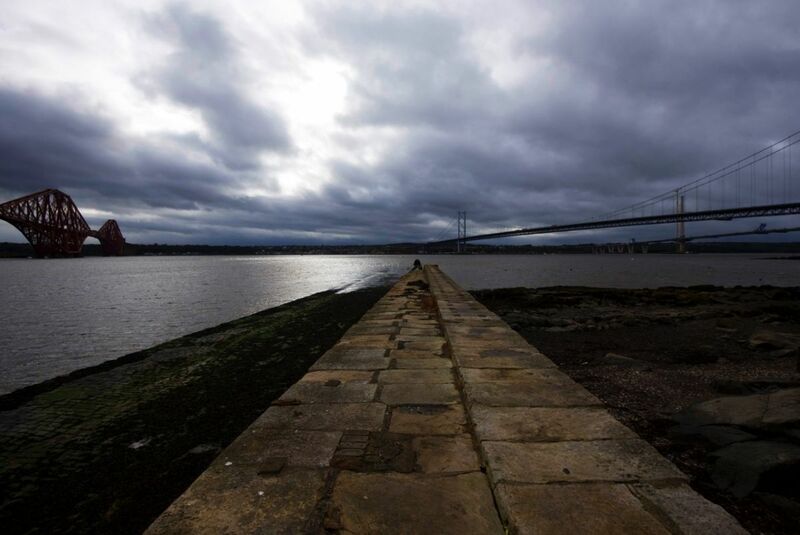 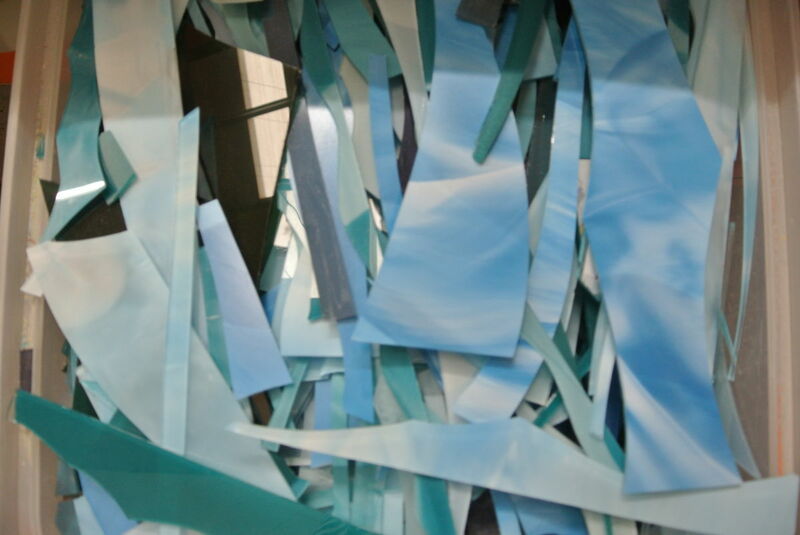 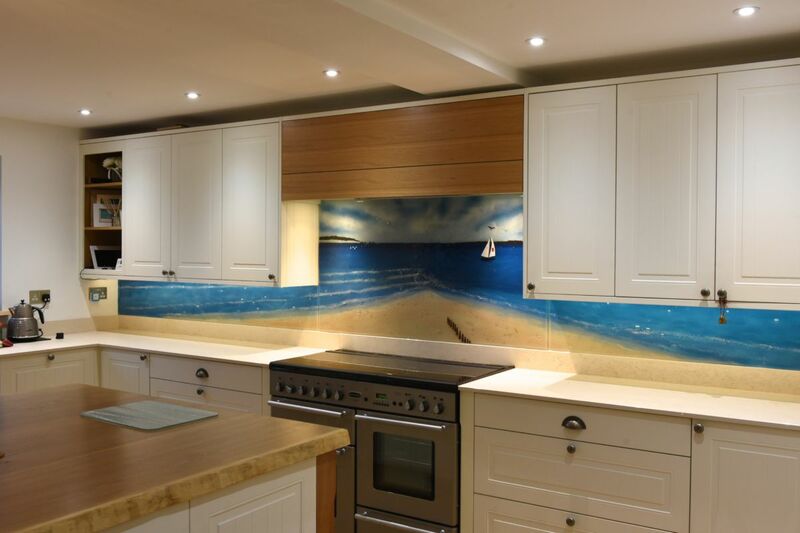 The waters are brought to life by a beautifully crafted gradient that runs throughout the piece, and you should be able to see where darker shades depict deeper depths compared to the bright shallows overhead. 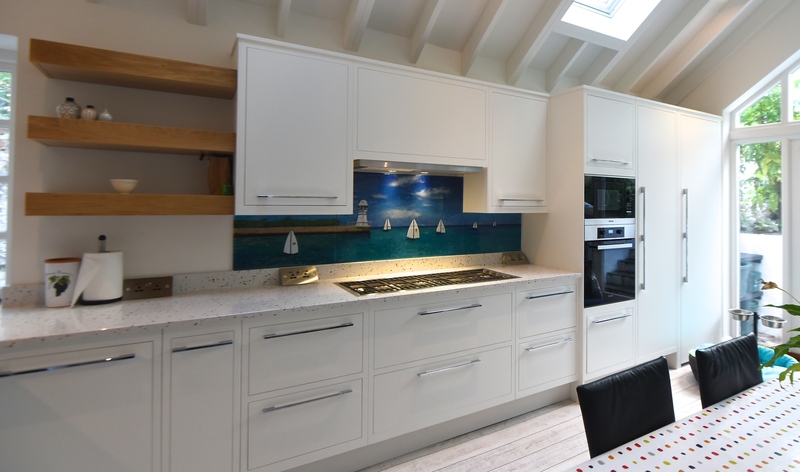 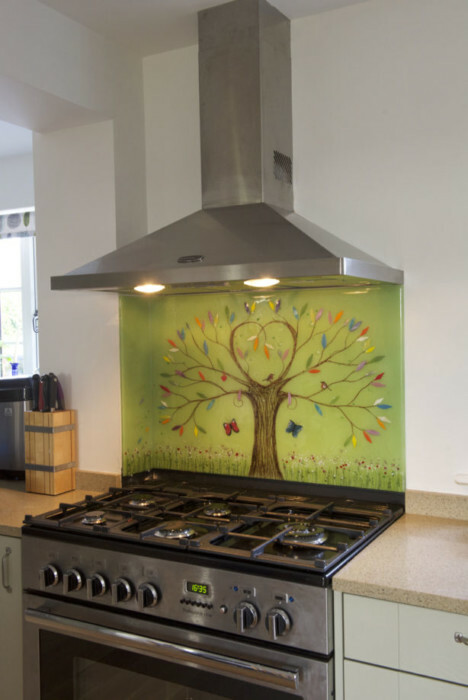 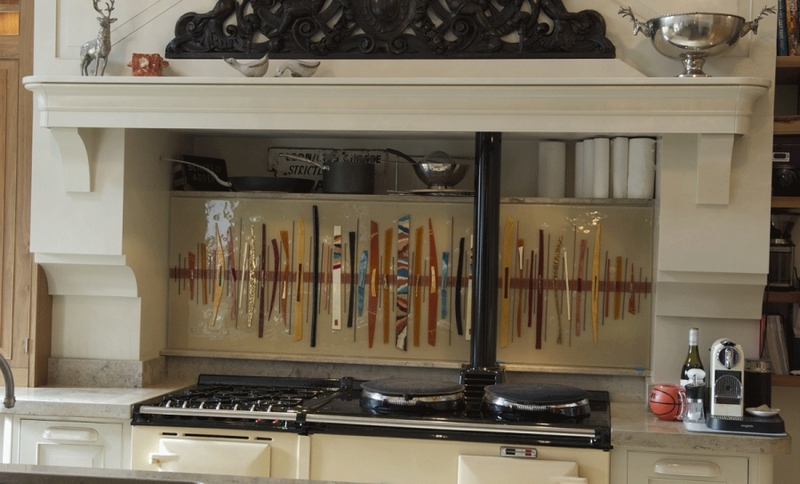 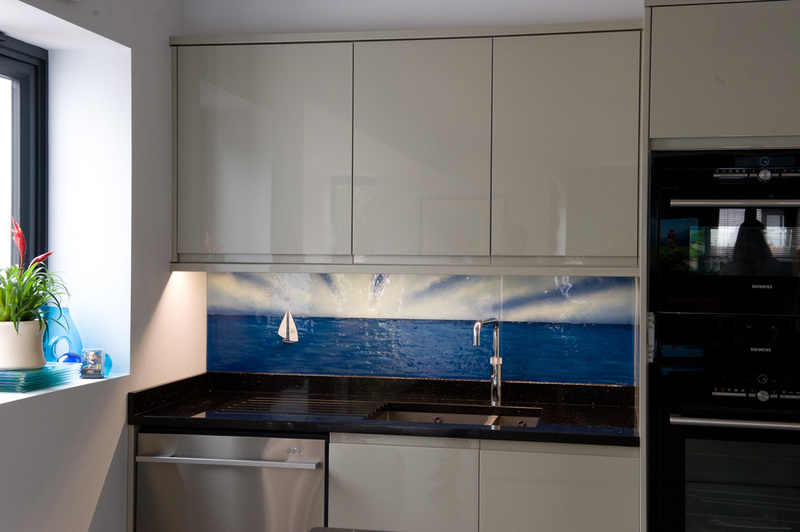 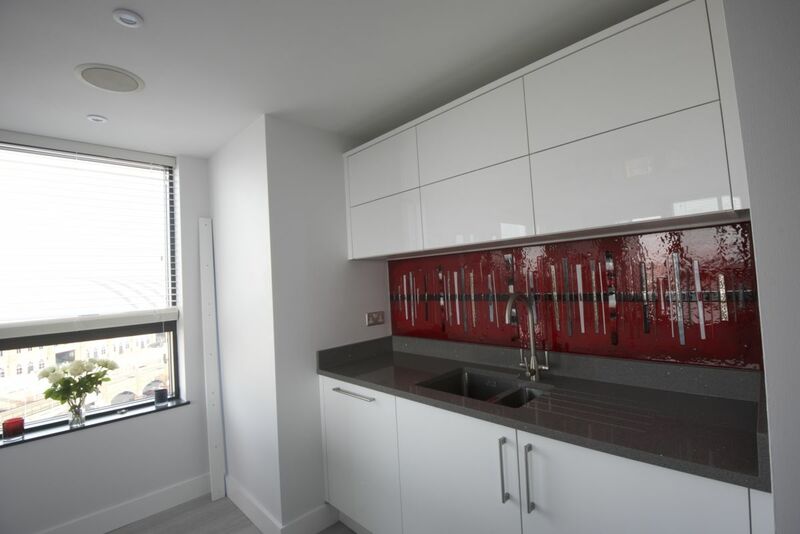 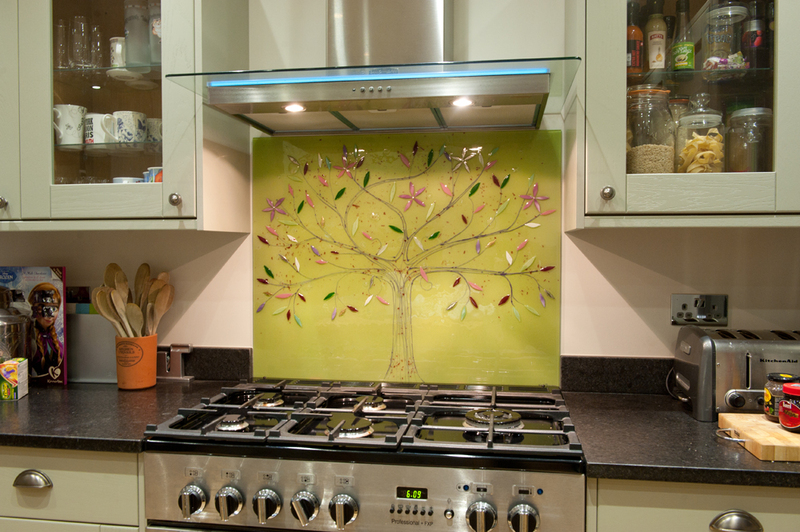 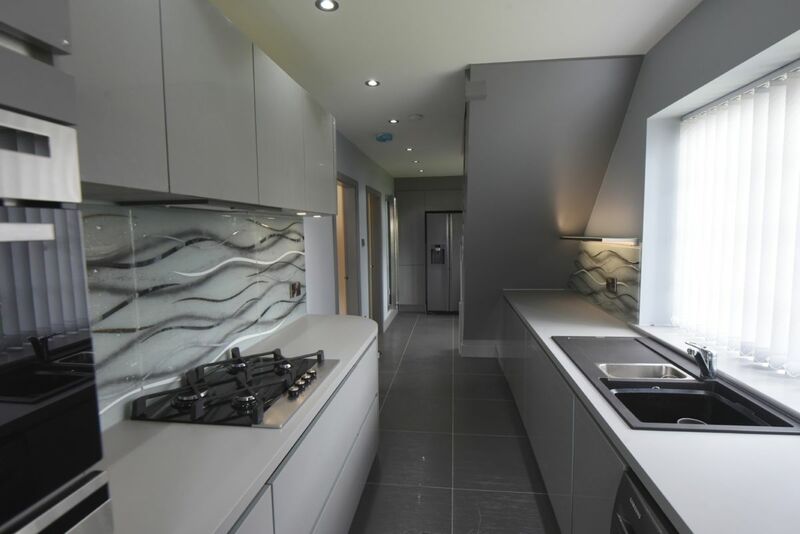 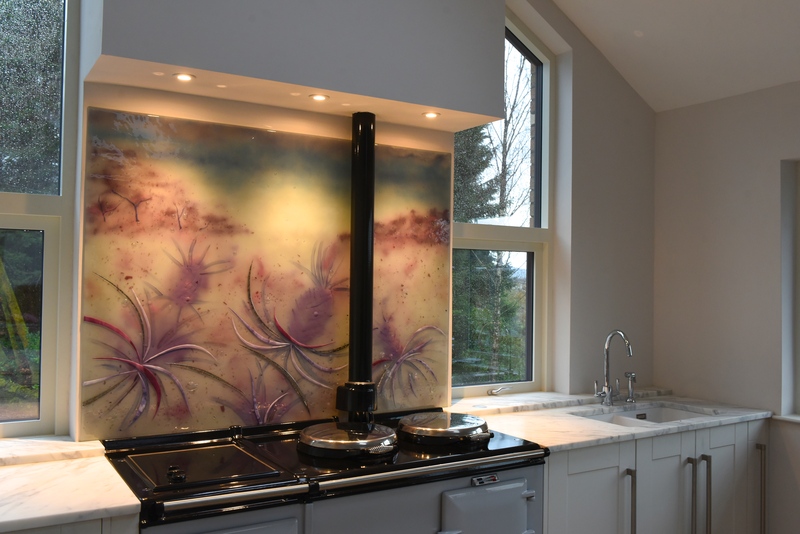 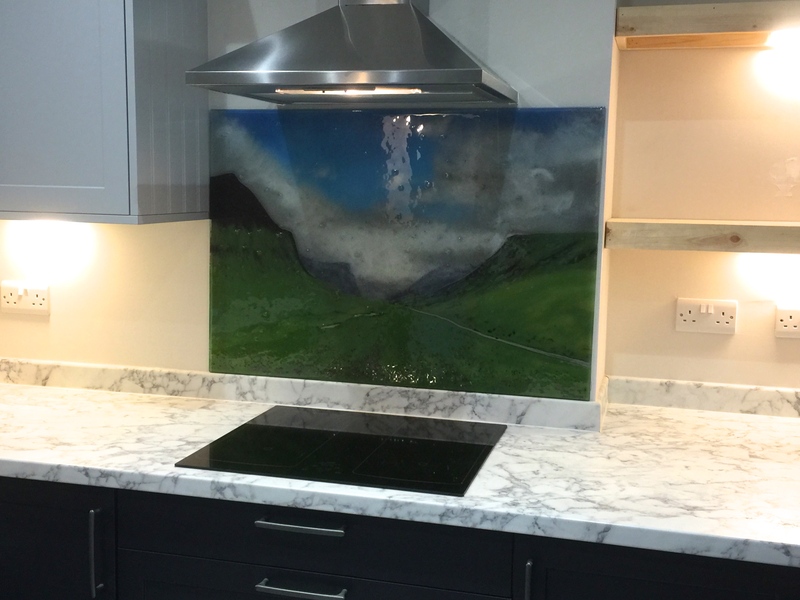 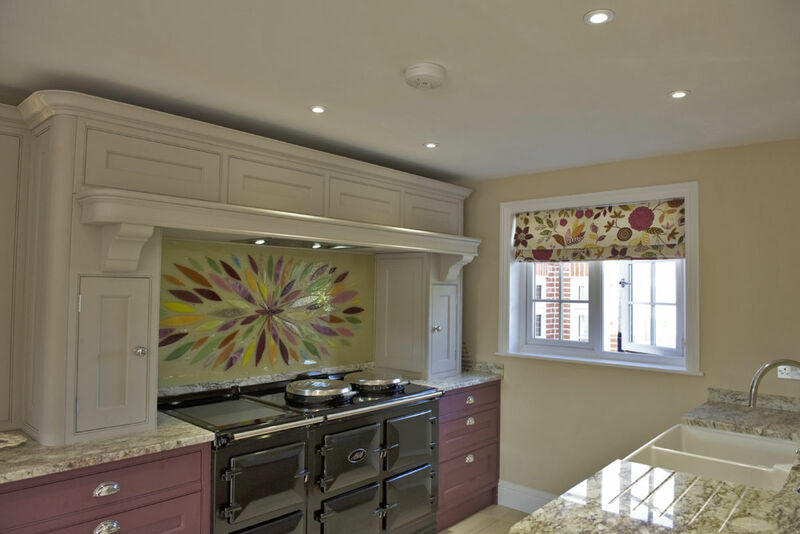 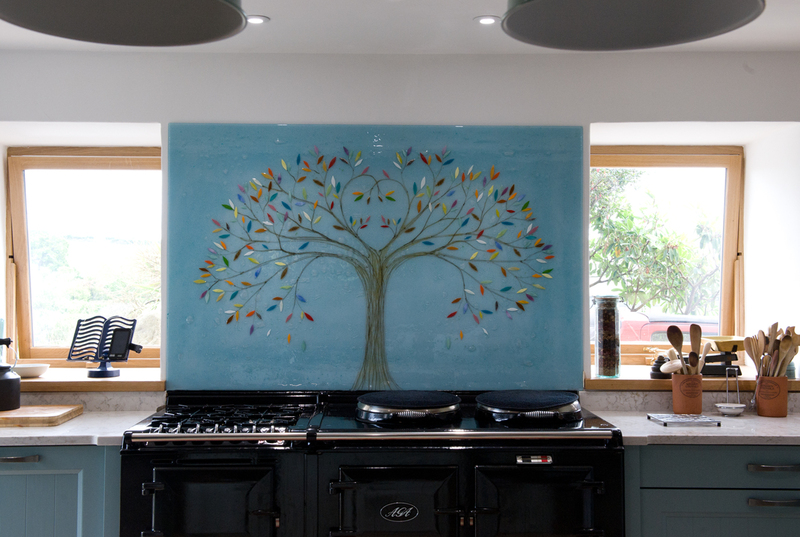 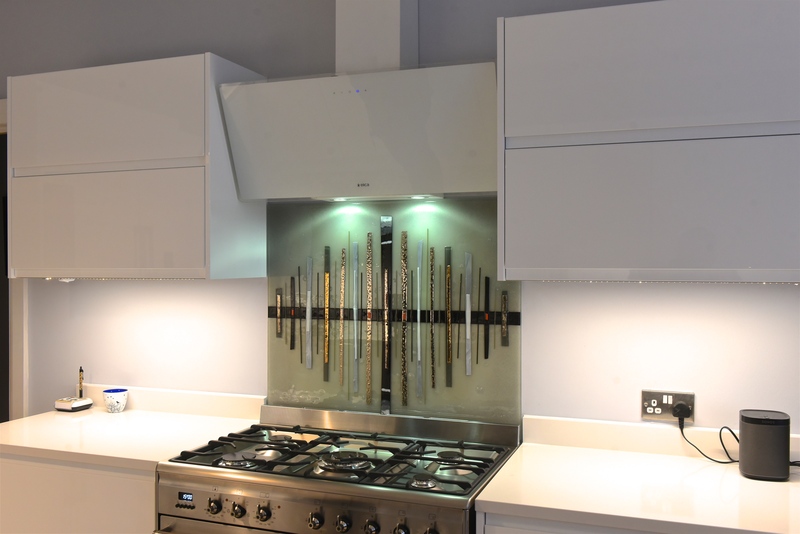 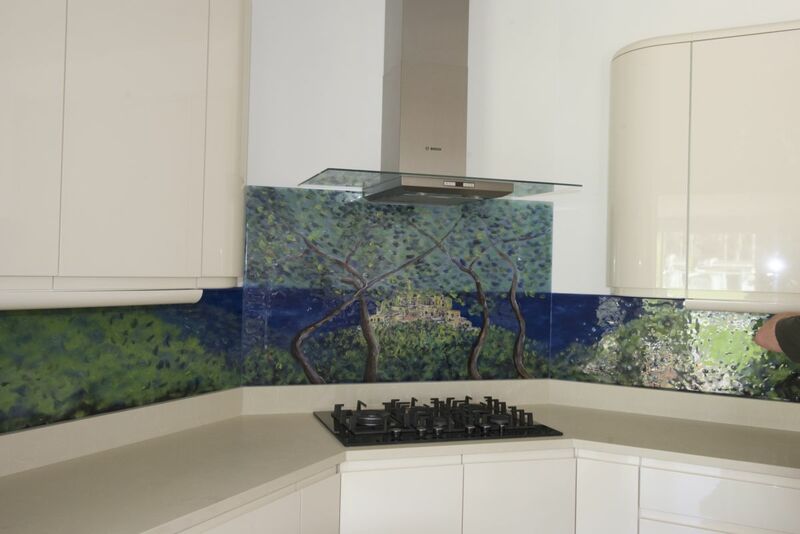 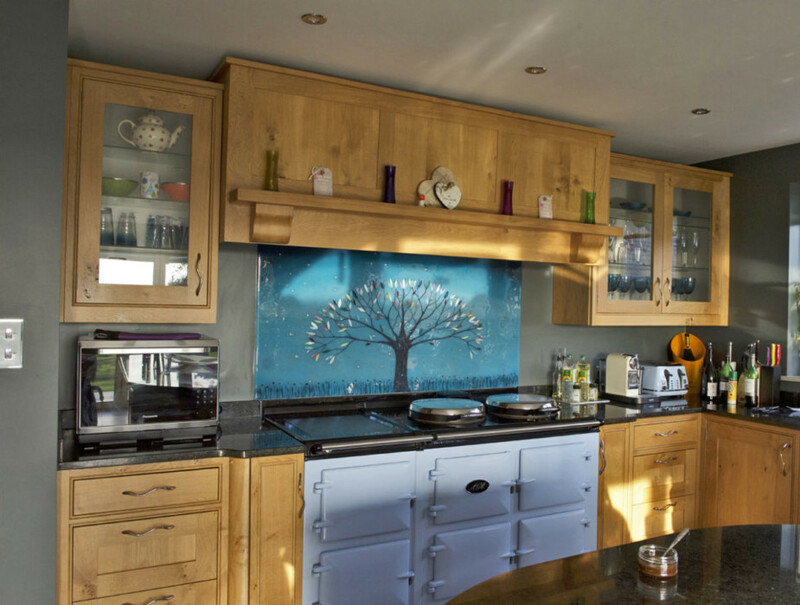 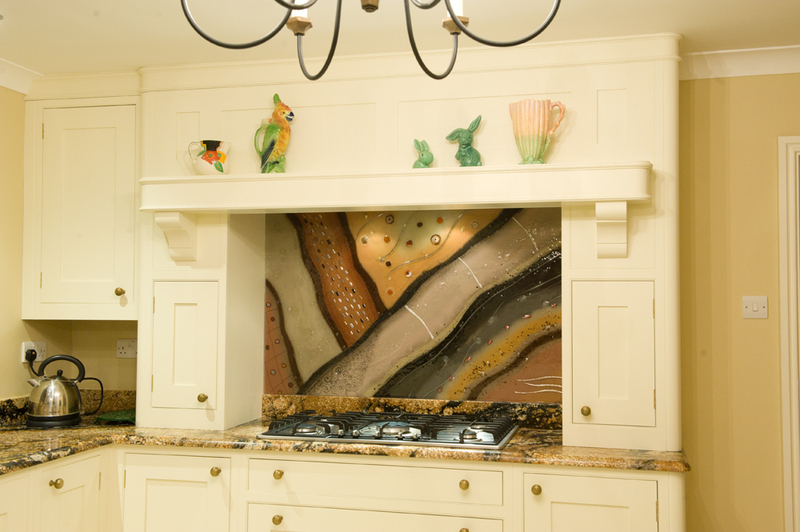 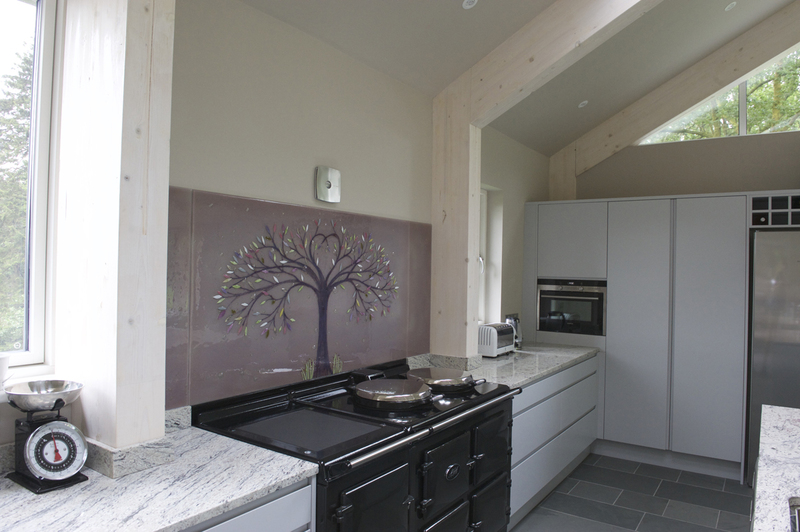 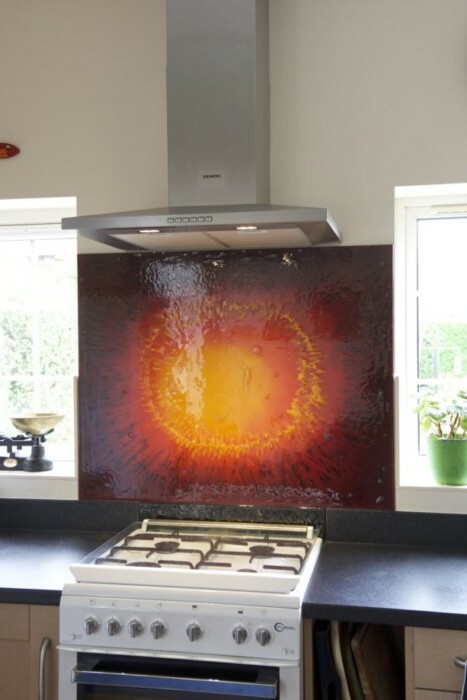 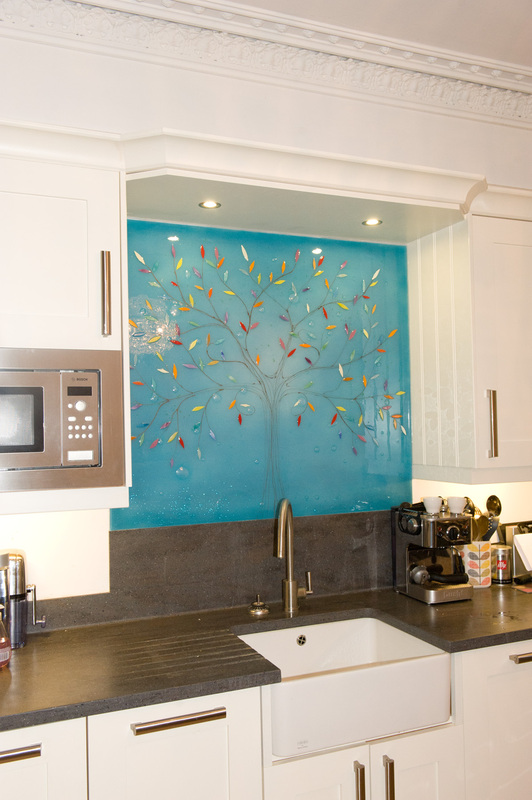 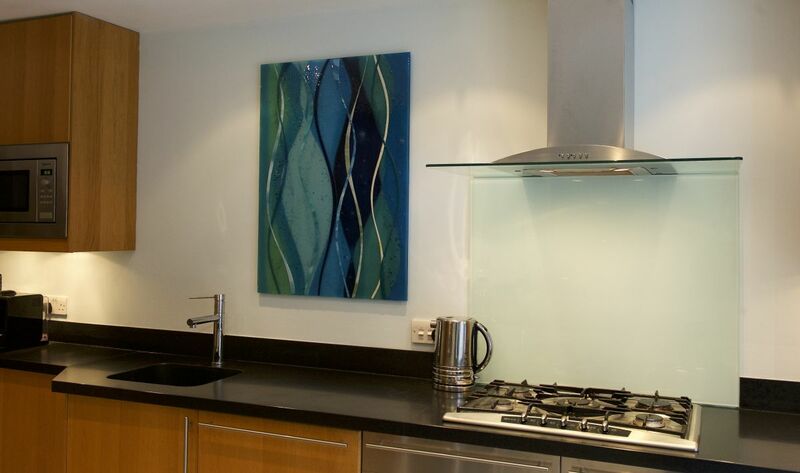 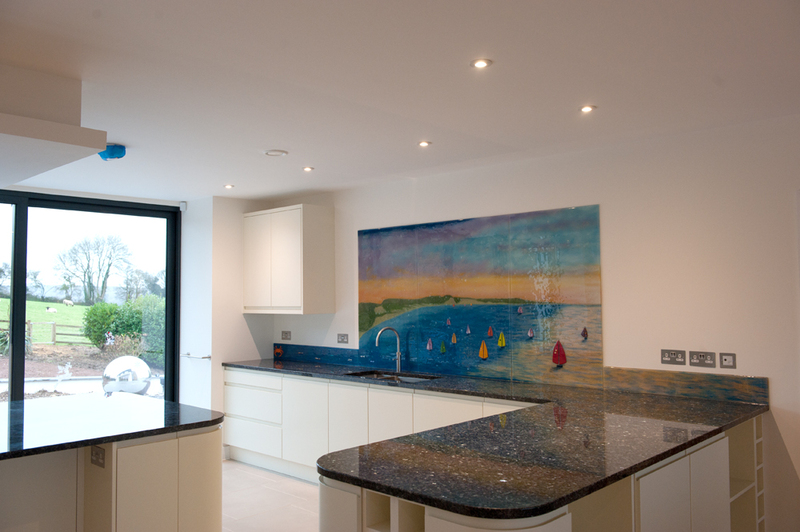 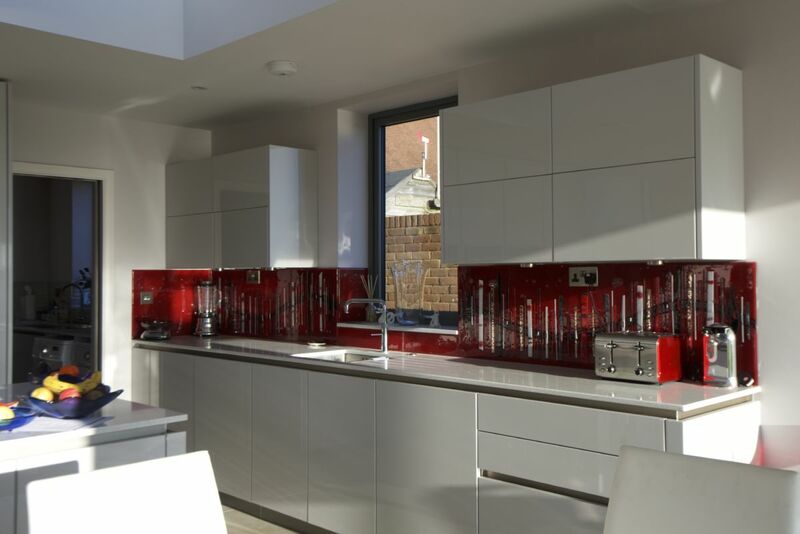 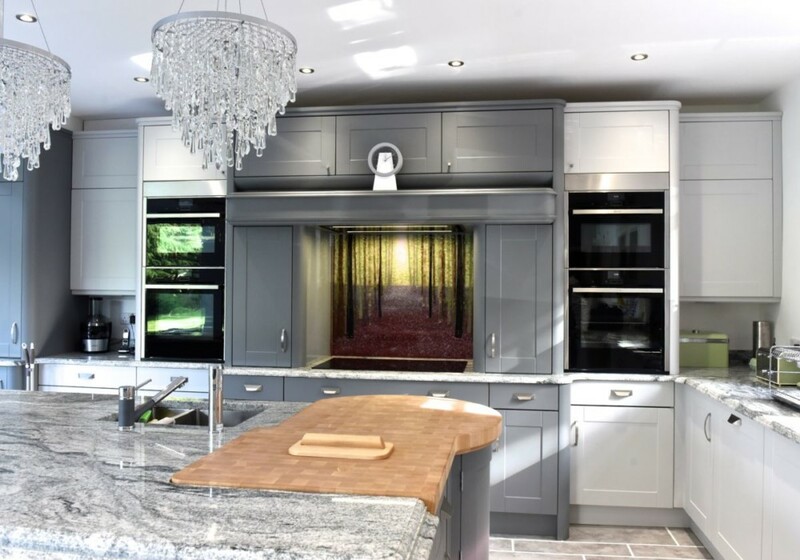 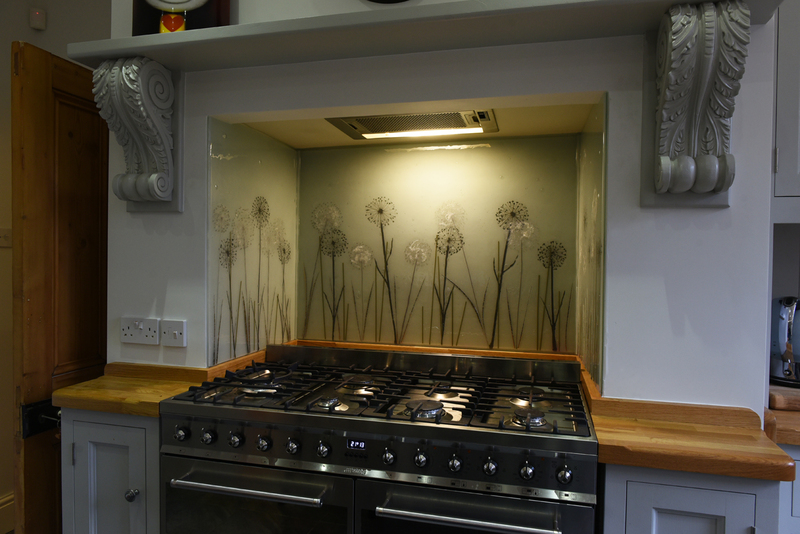 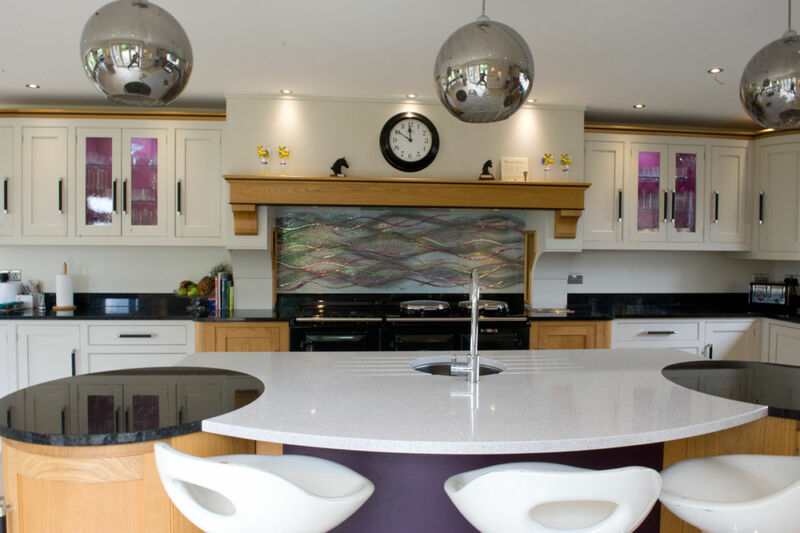 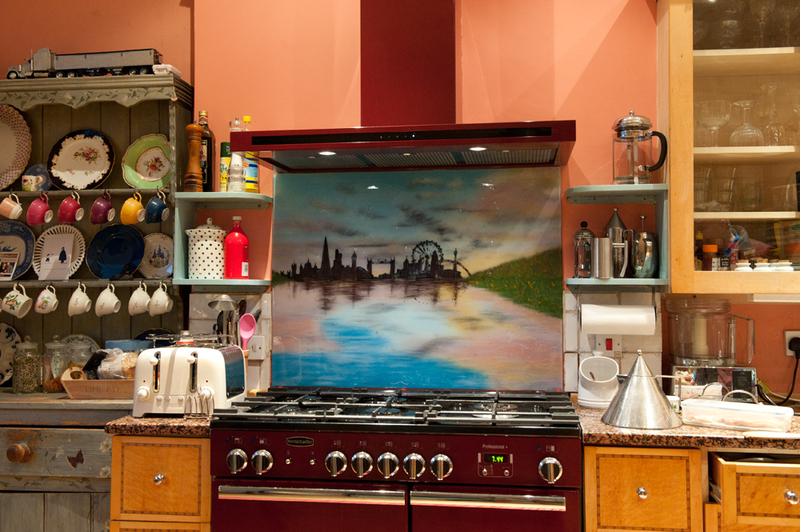 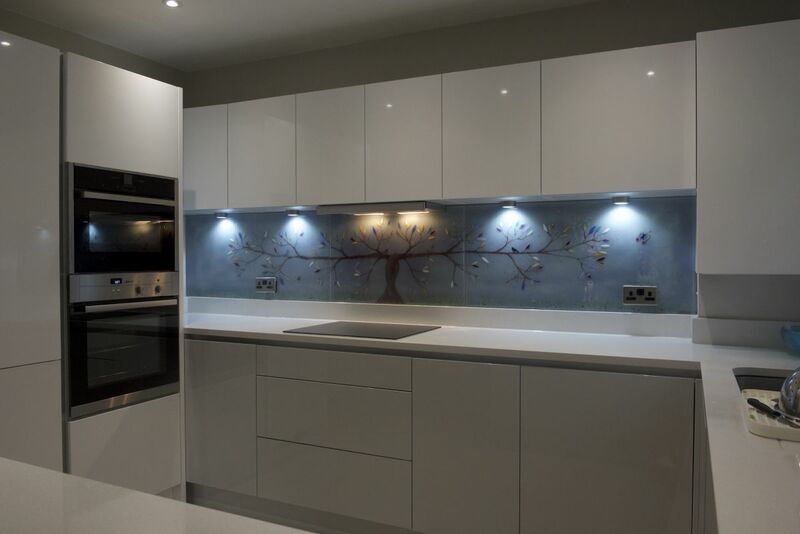 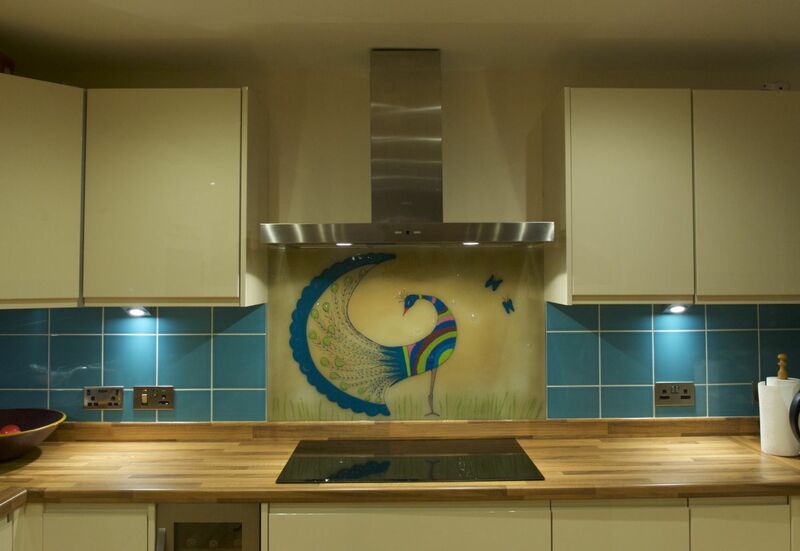 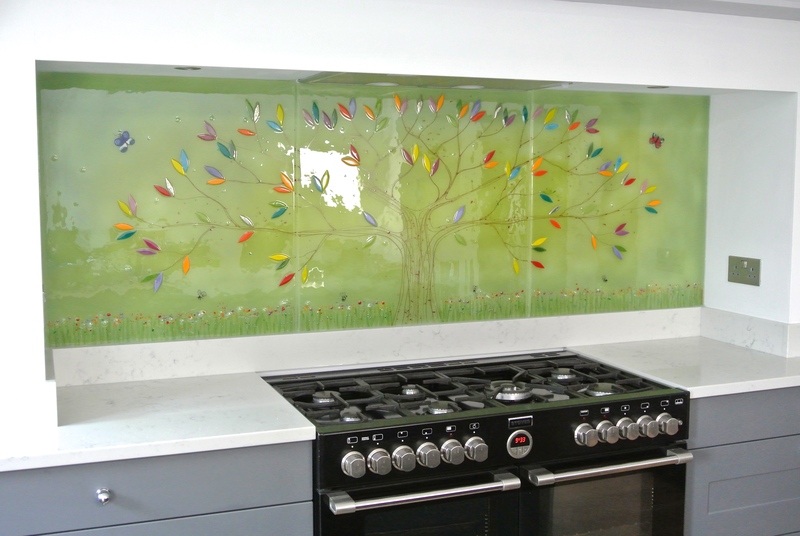 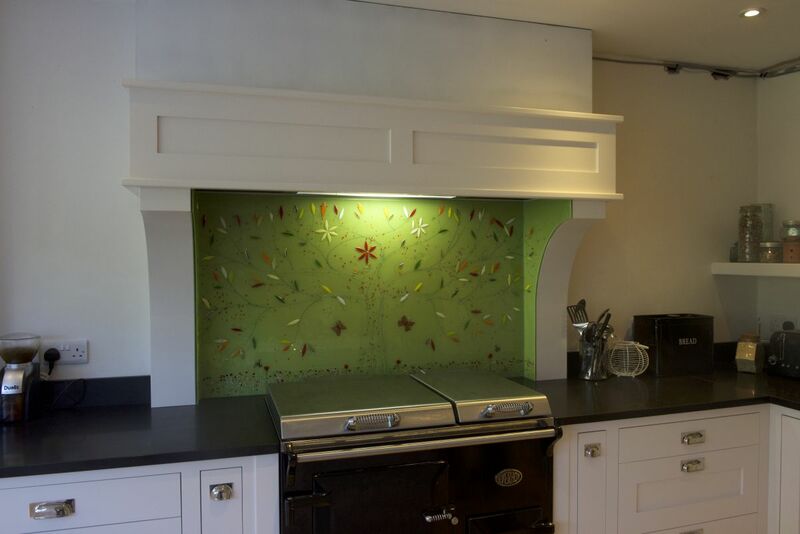 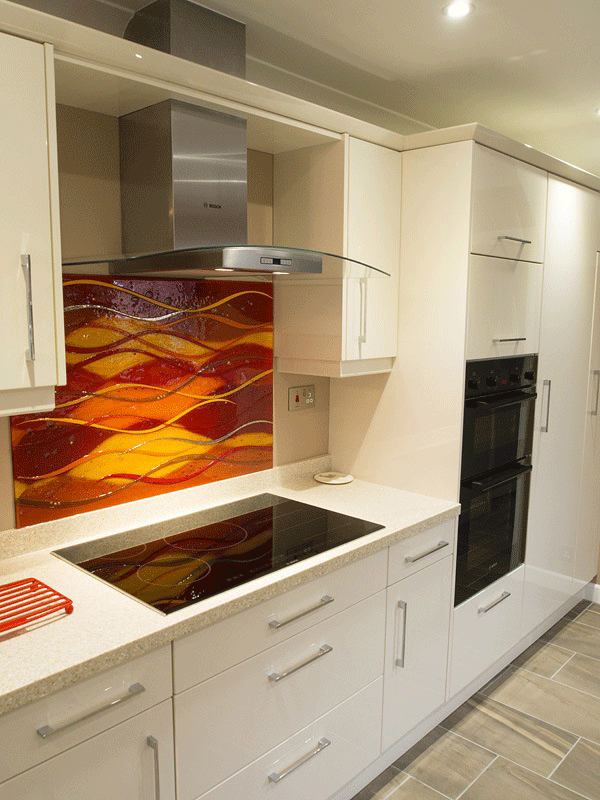 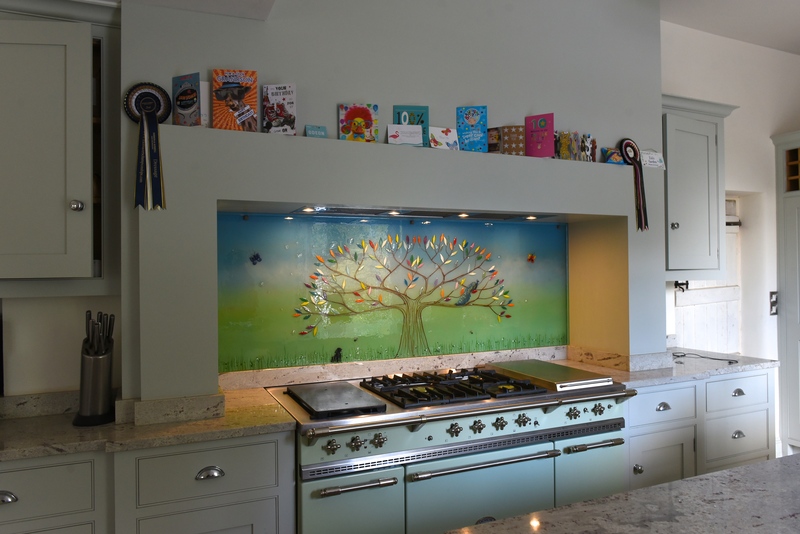 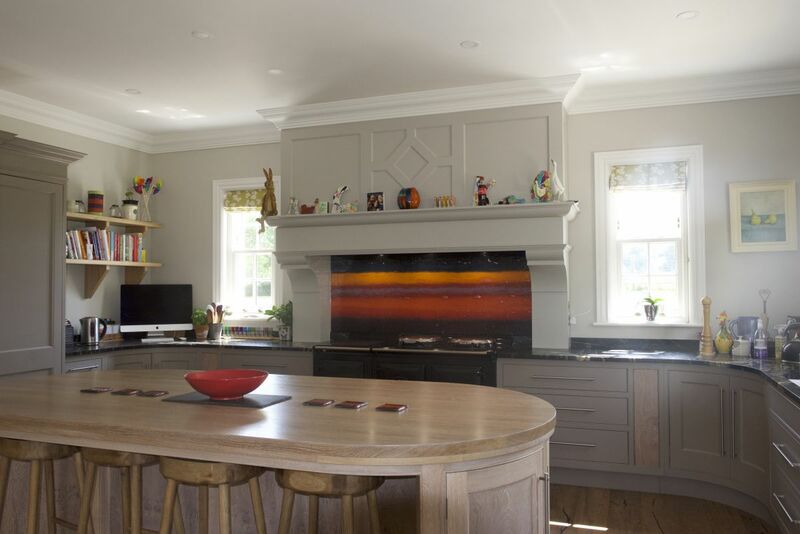 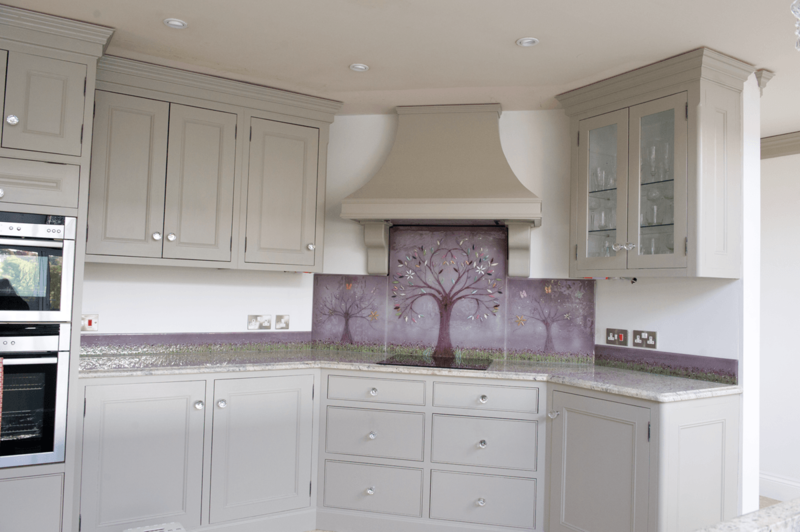 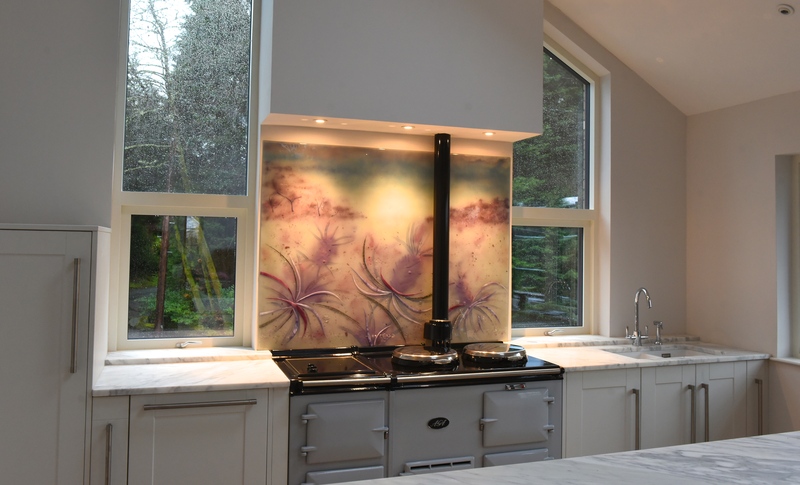 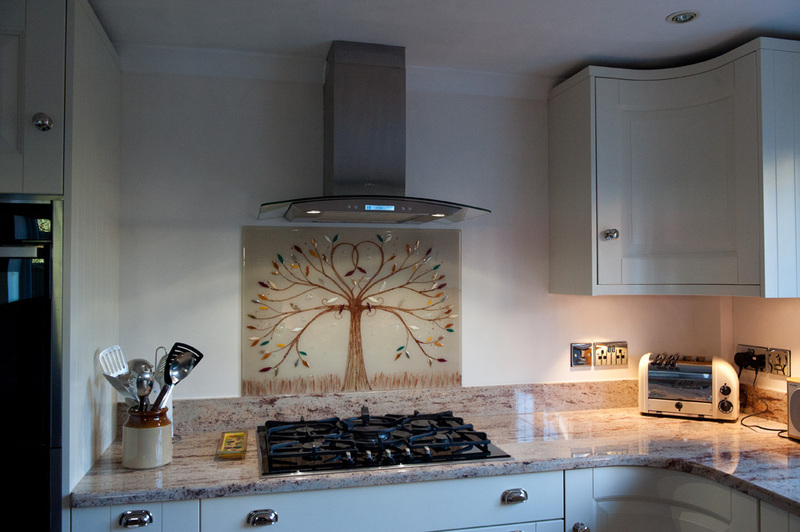 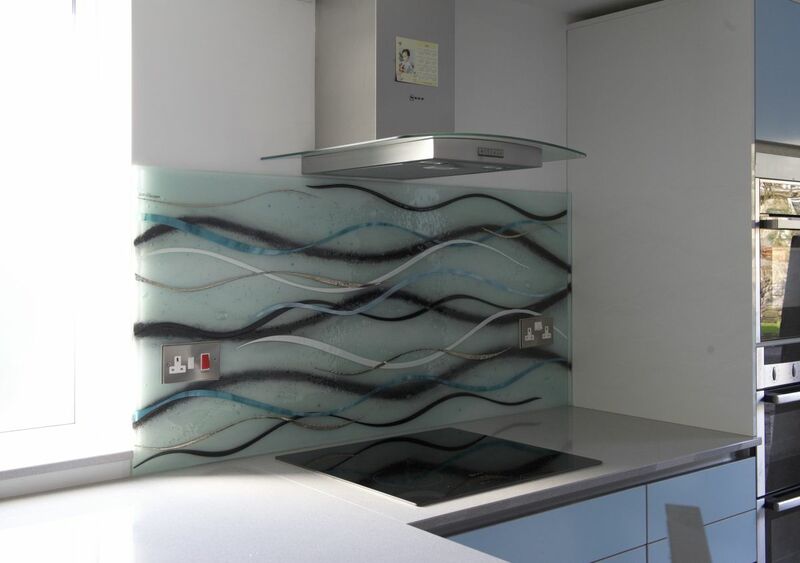 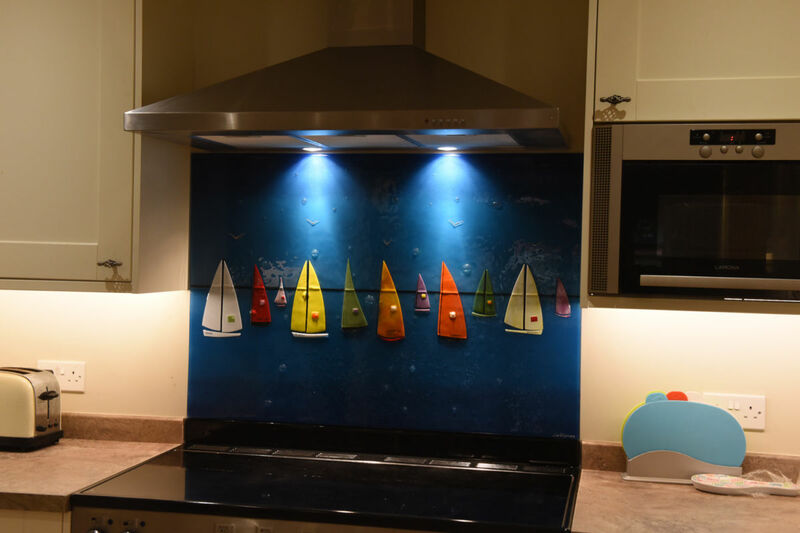 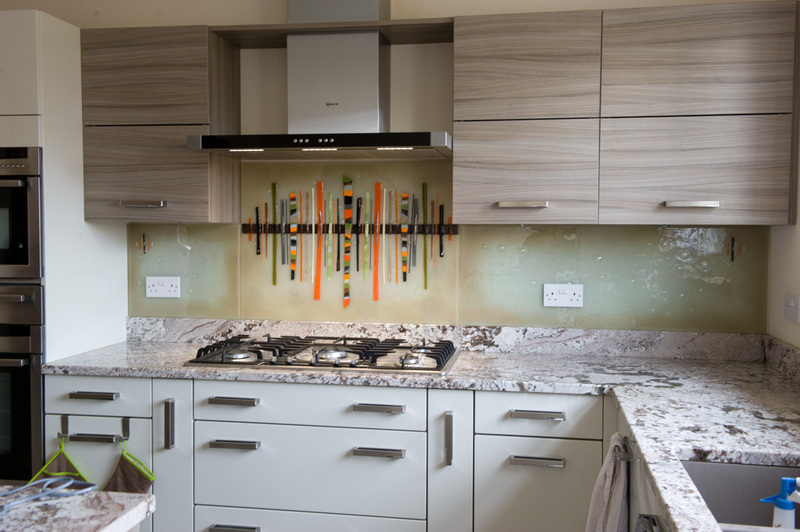 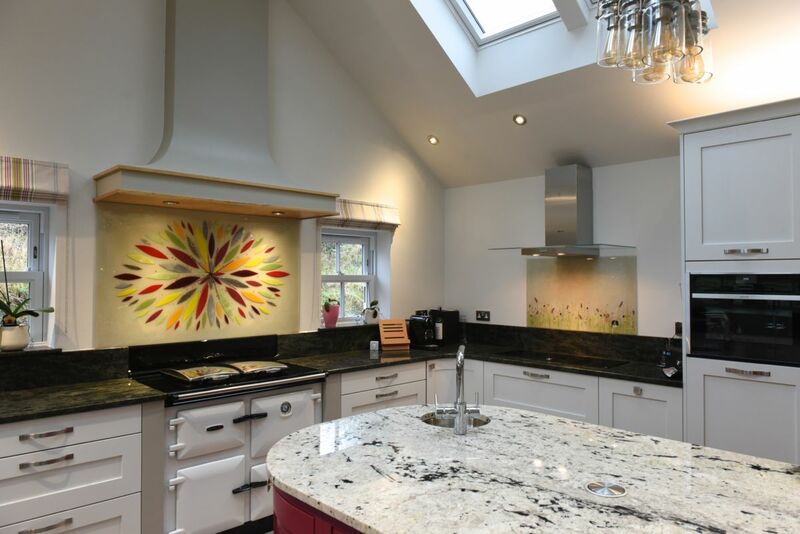 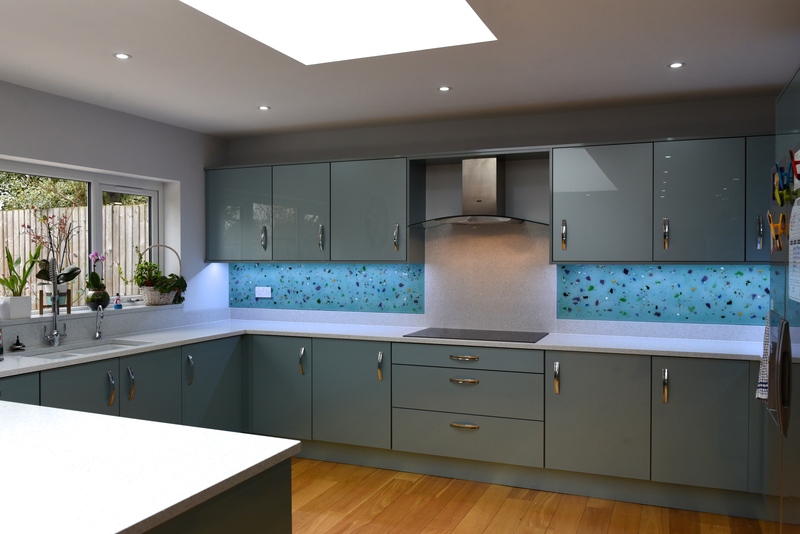 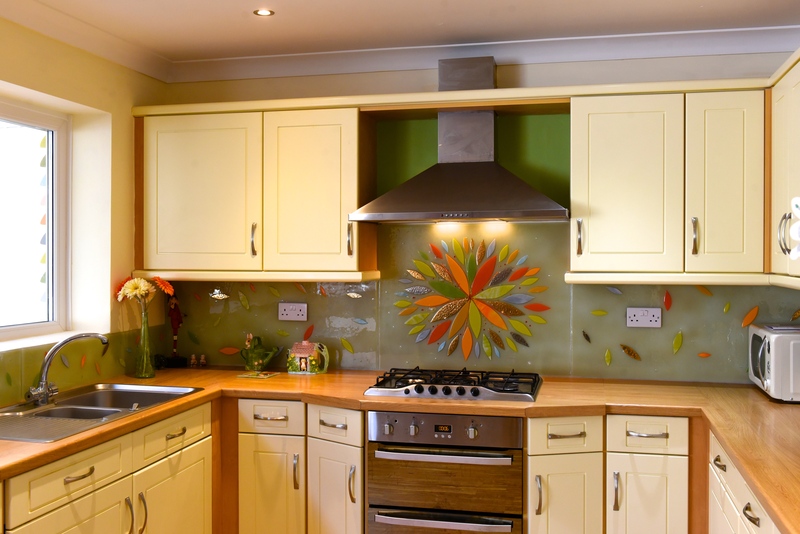 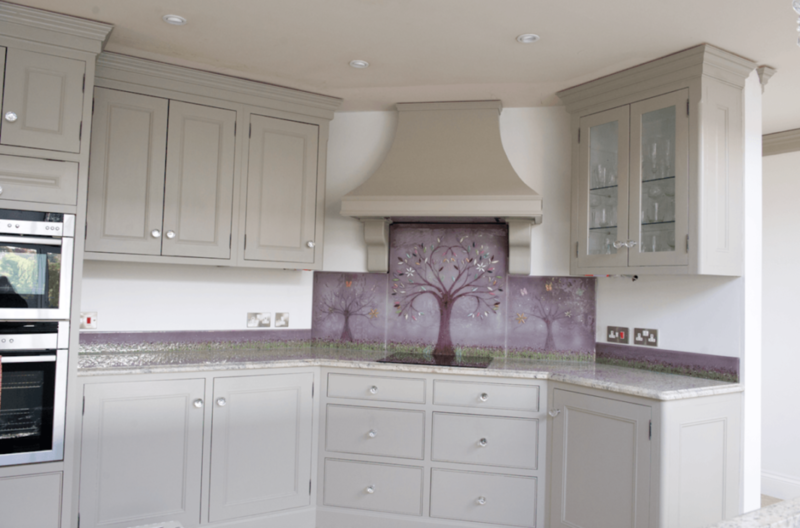 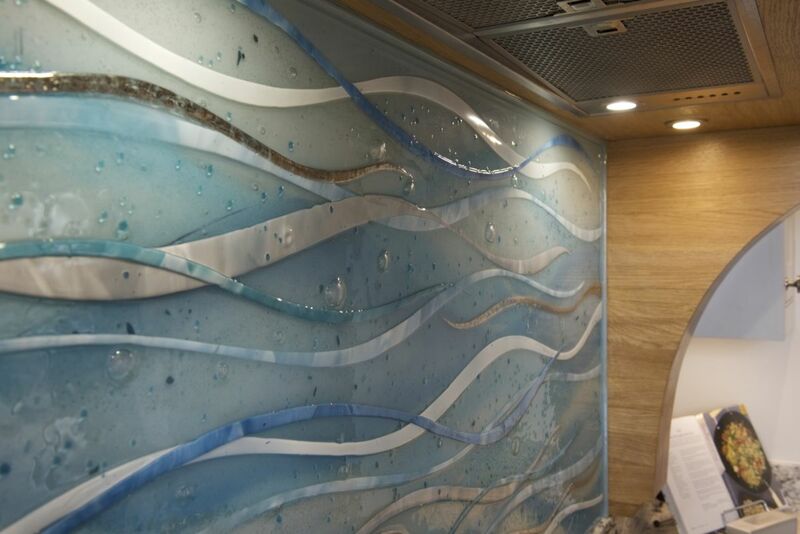 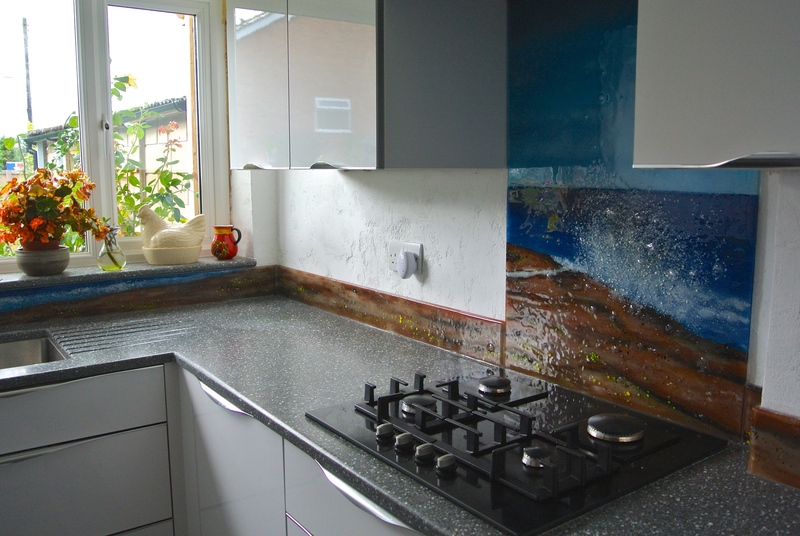 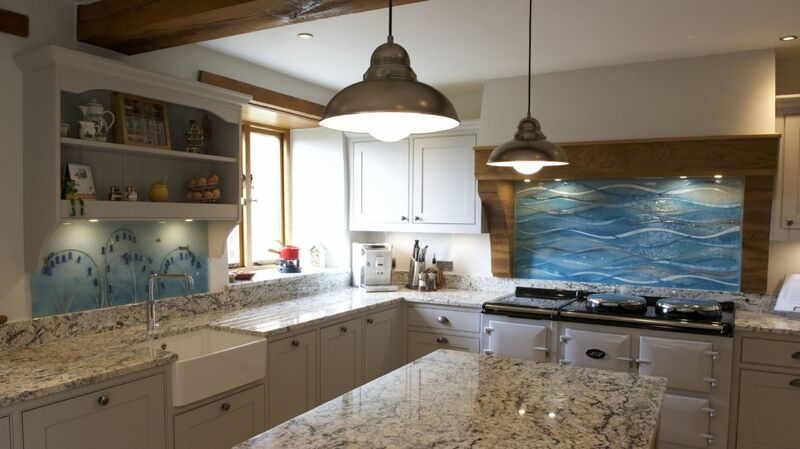 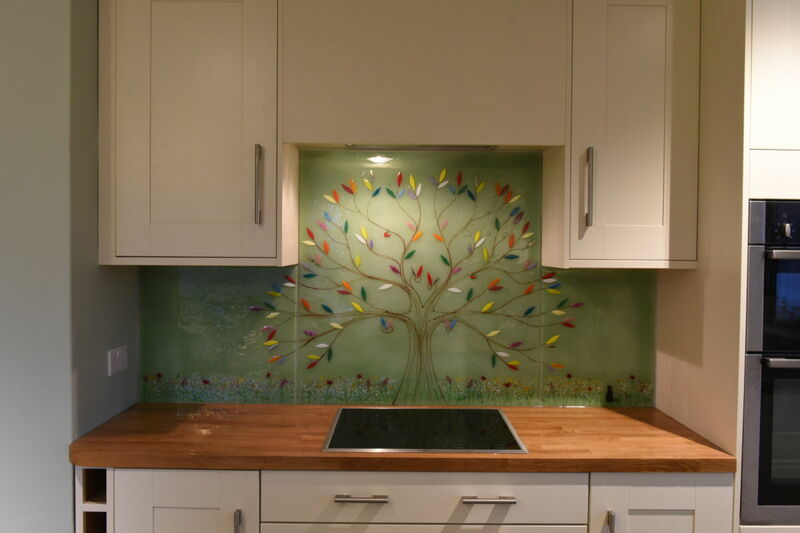 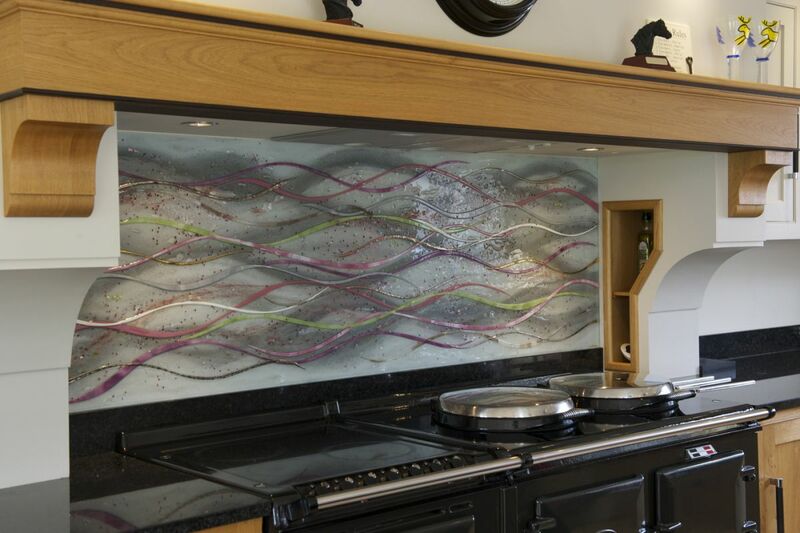 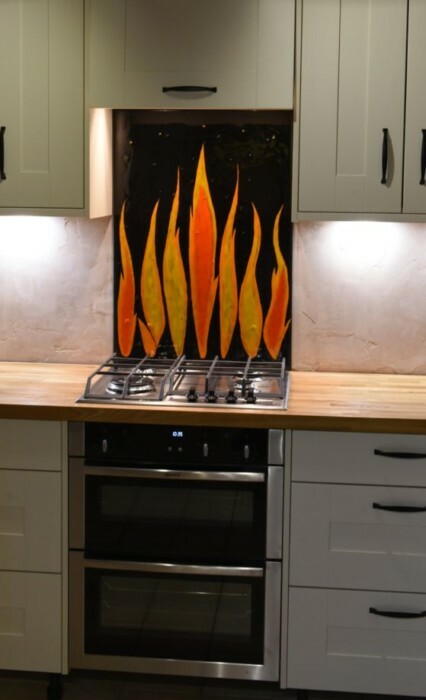 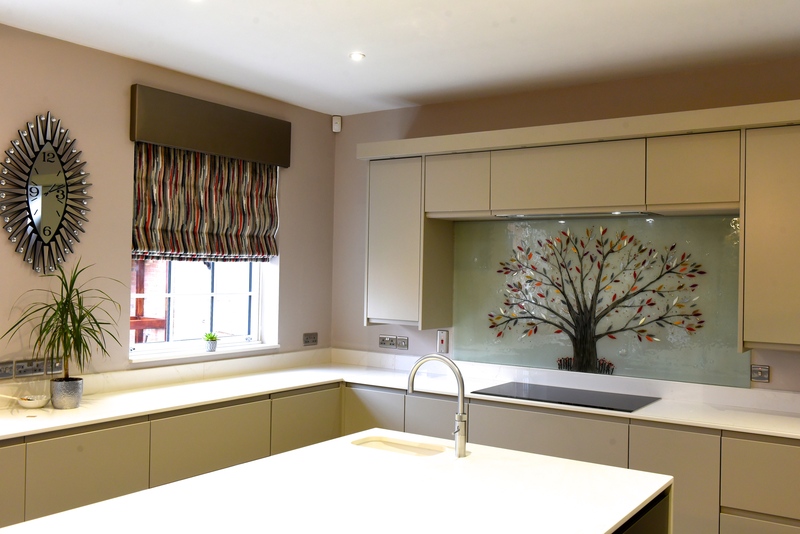 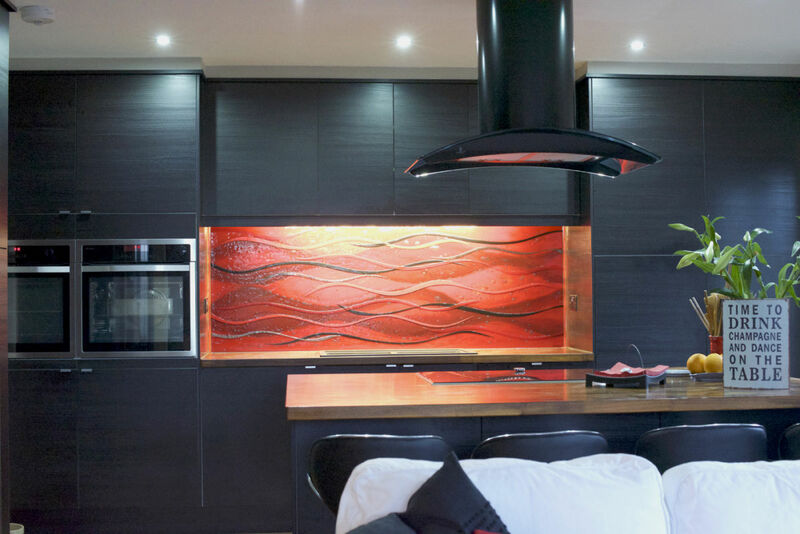 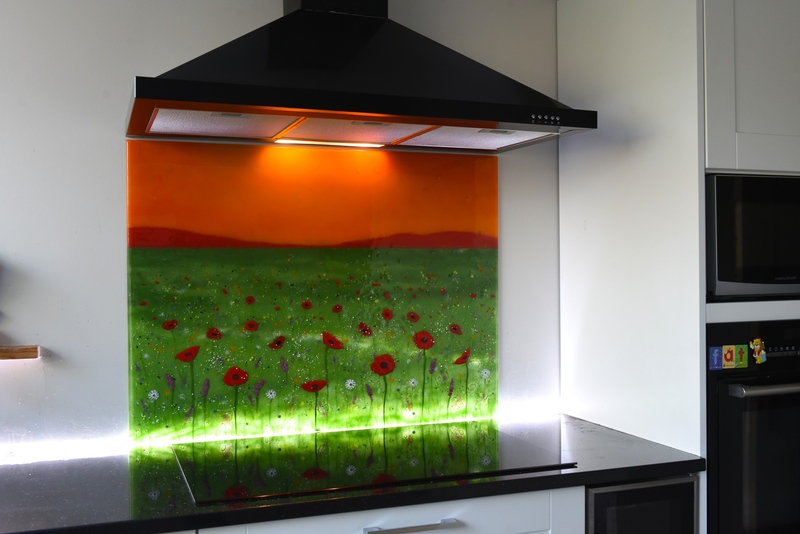 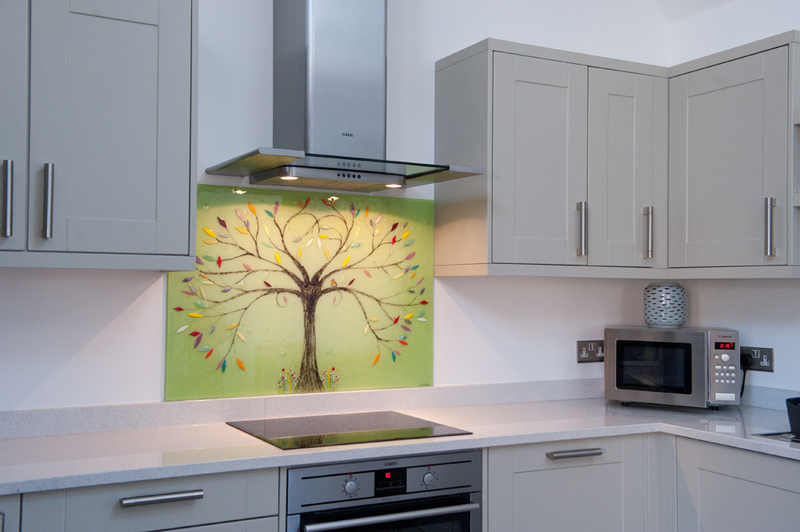 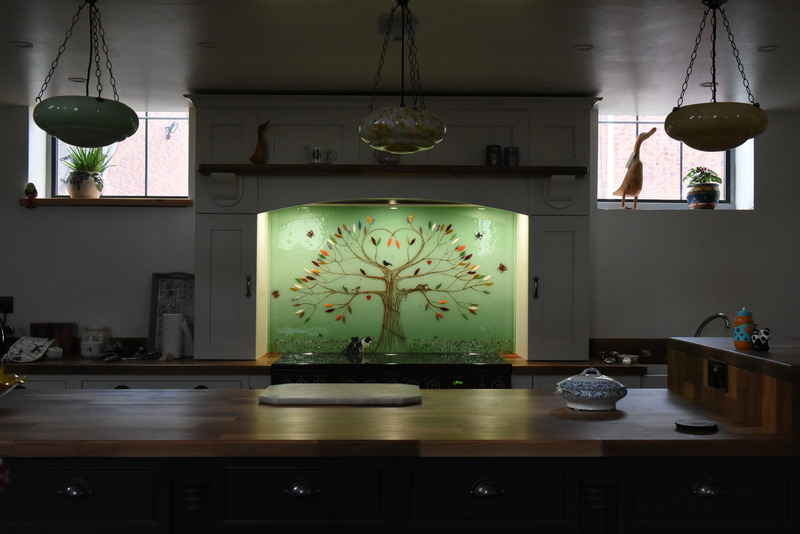 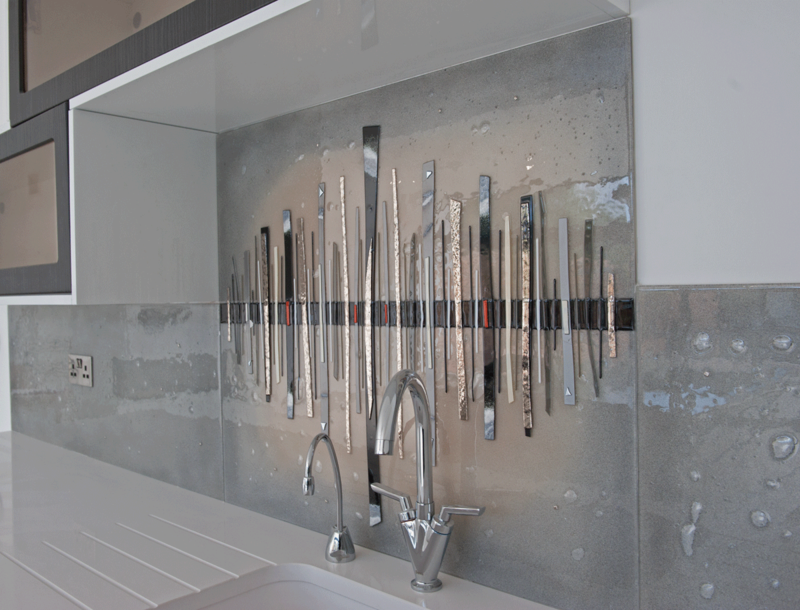 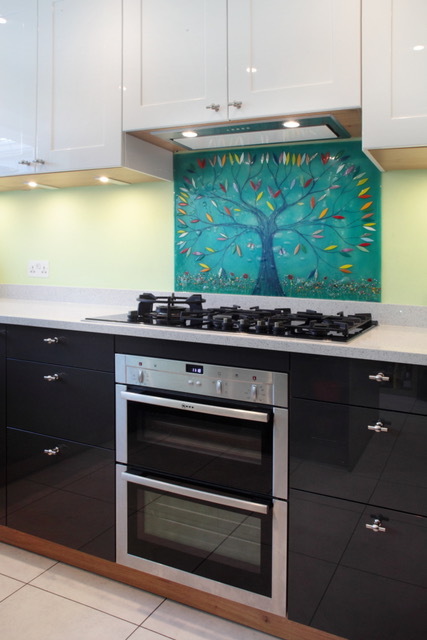 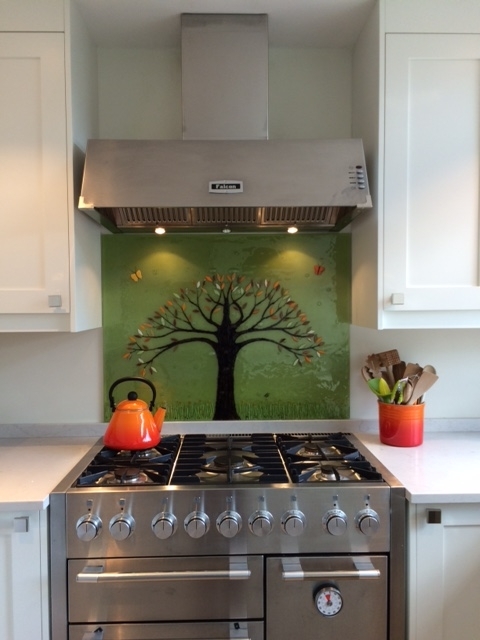 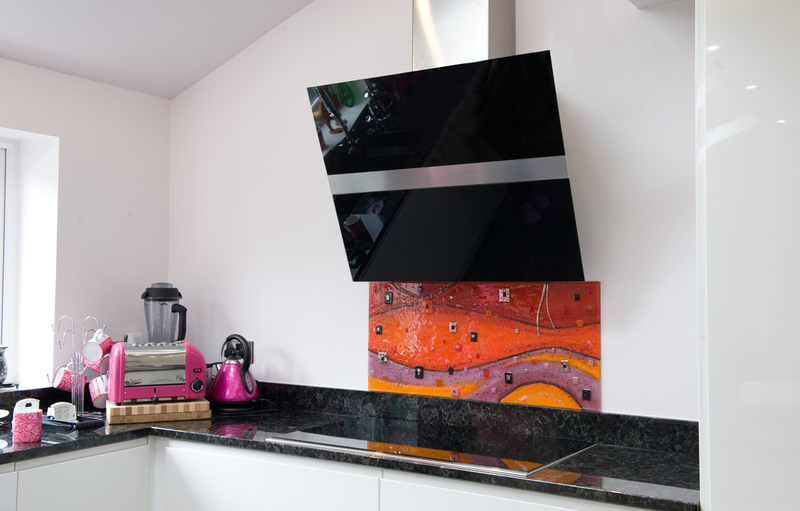 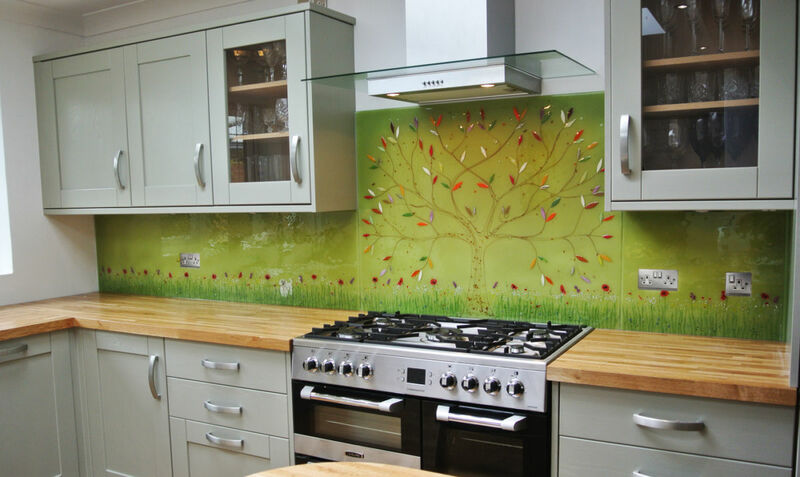 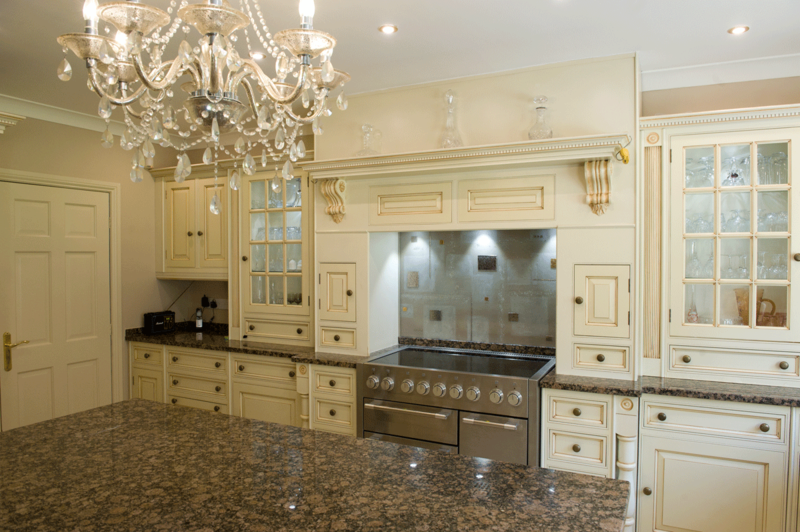 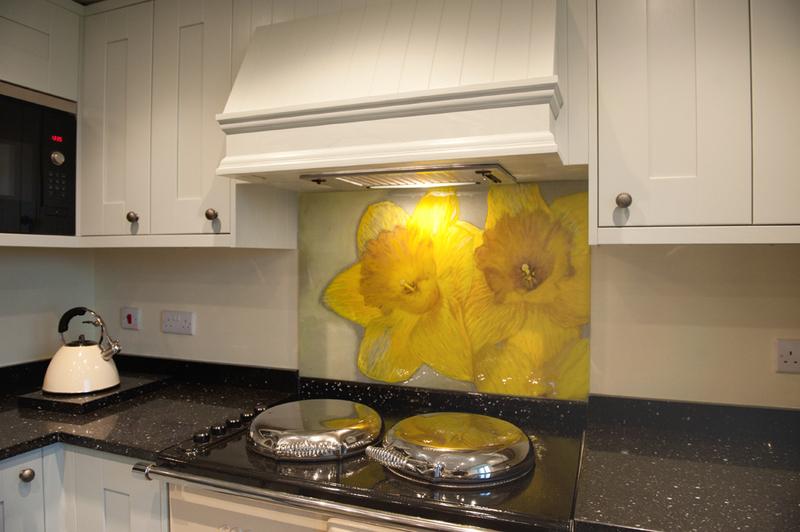 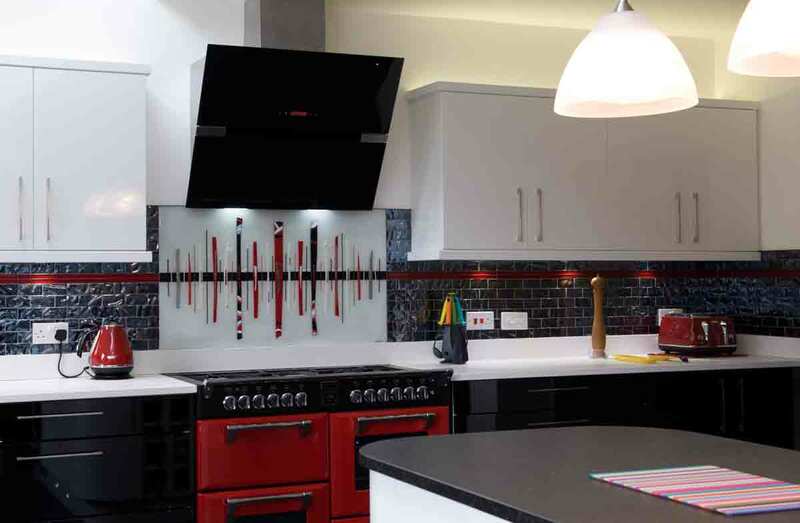 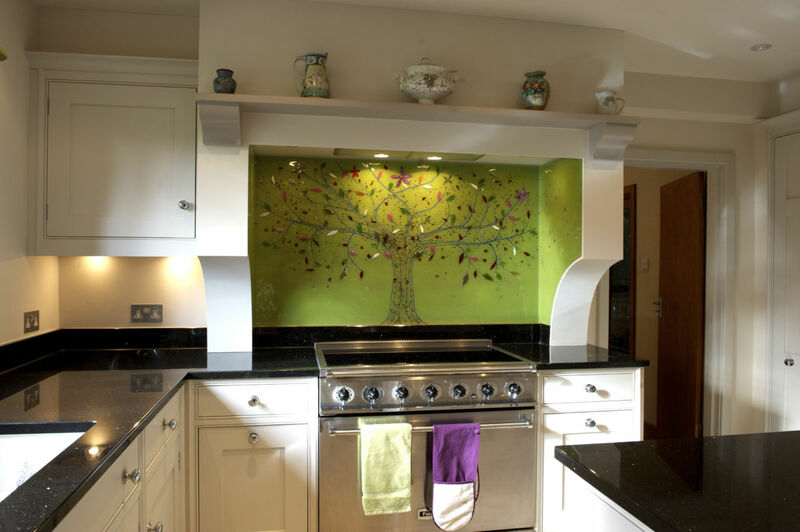 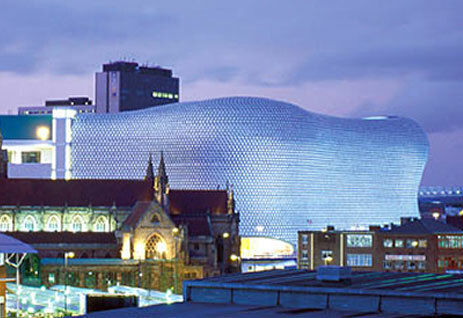 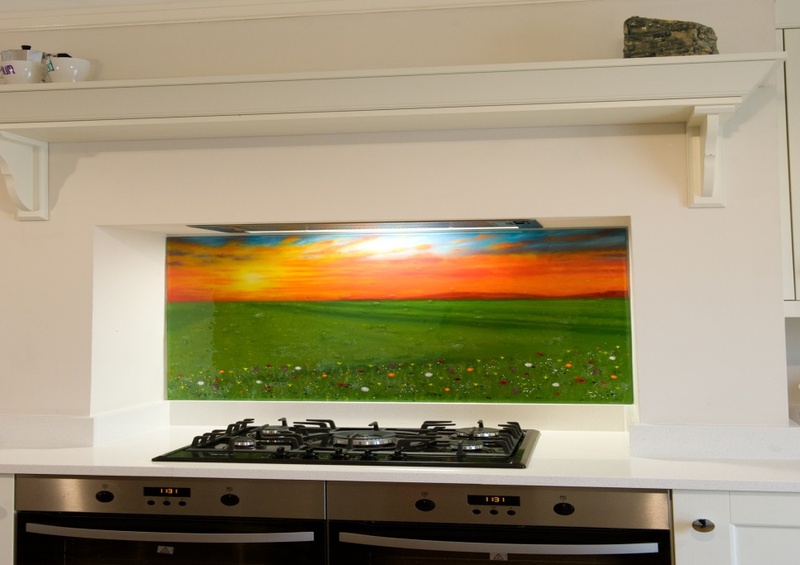 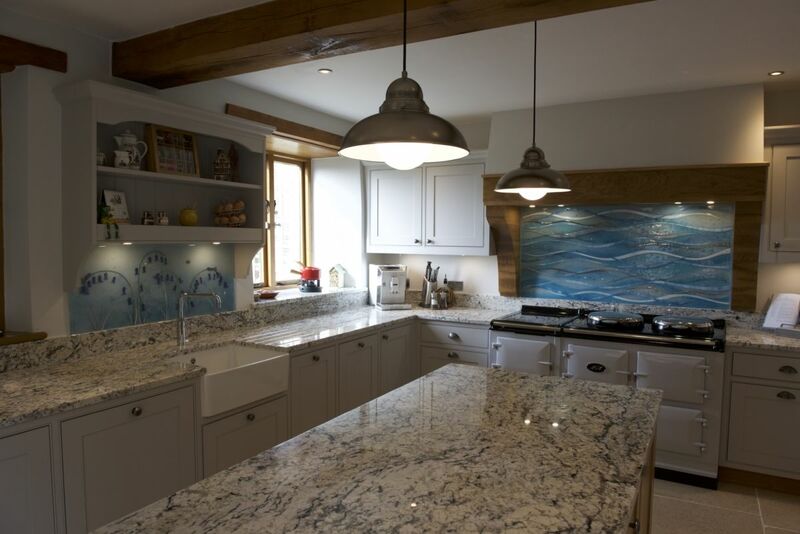 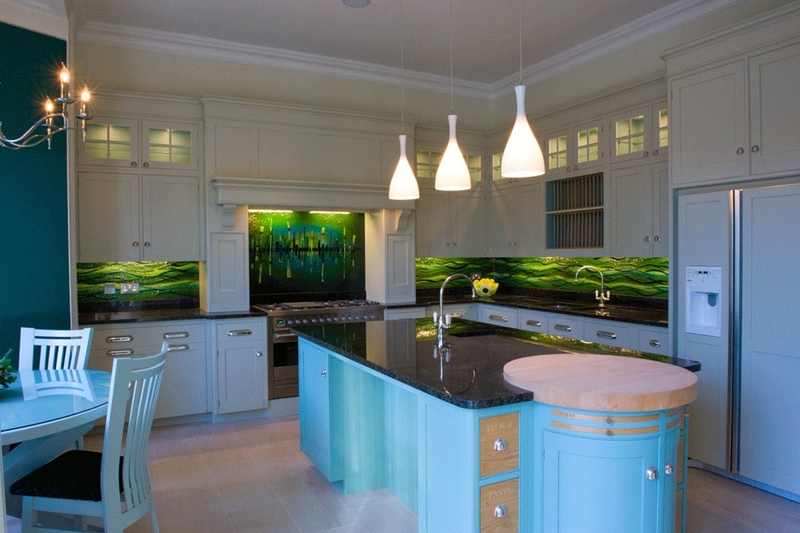 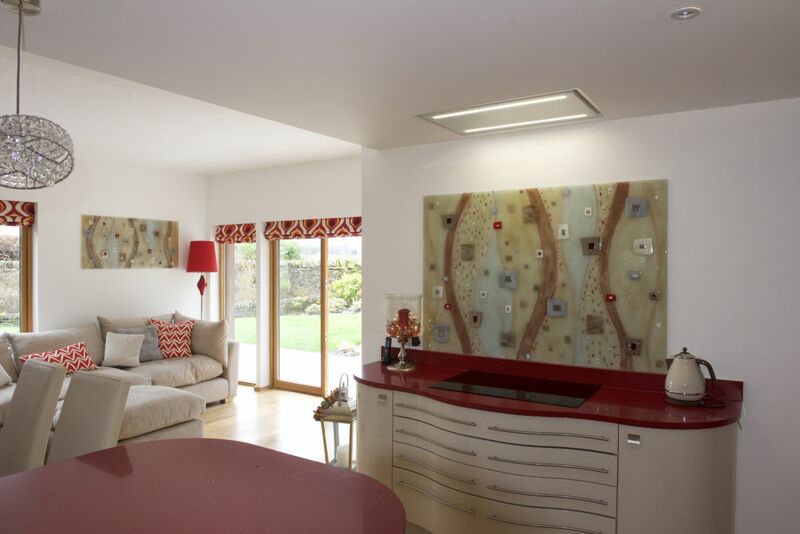 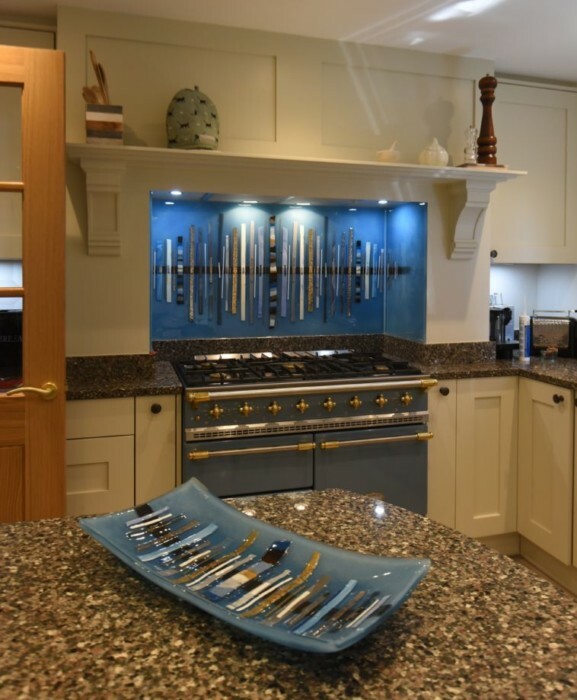 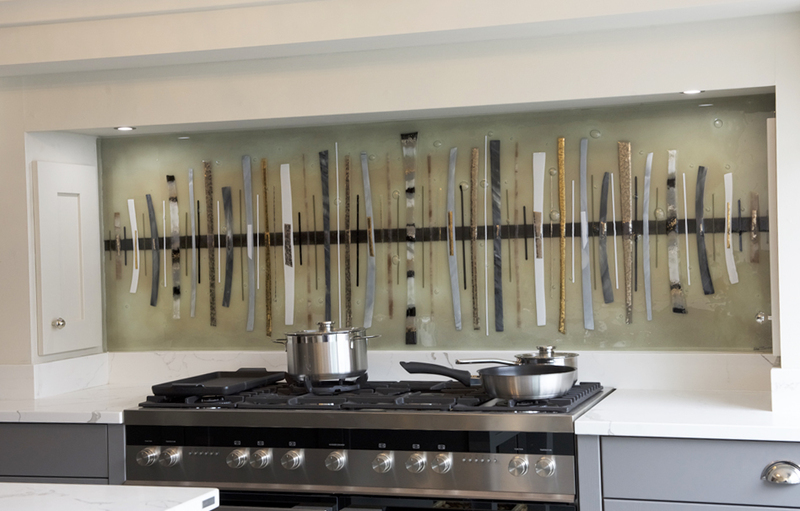 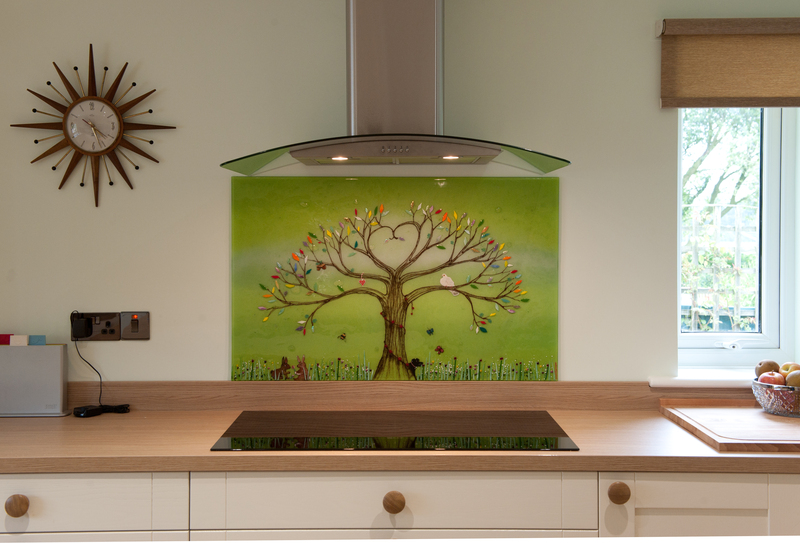 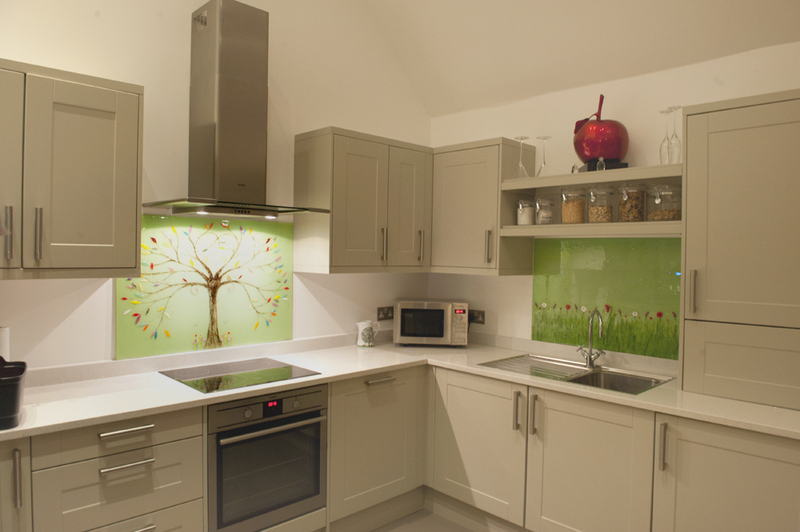 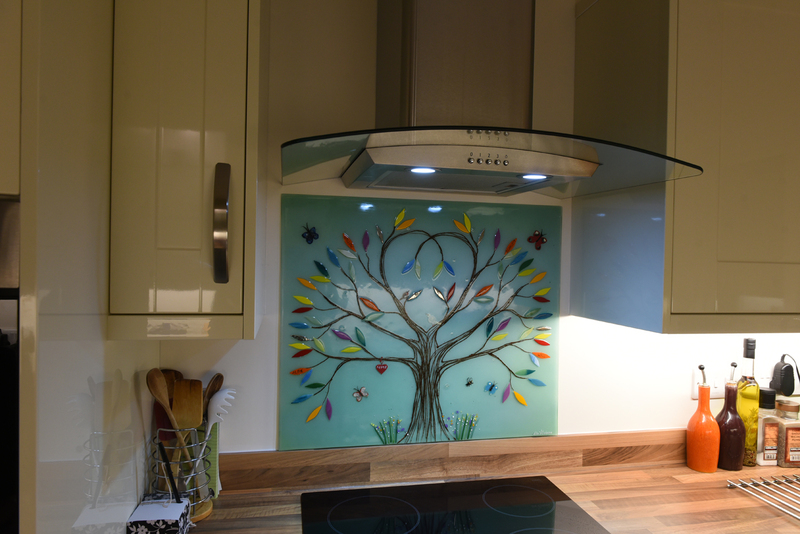 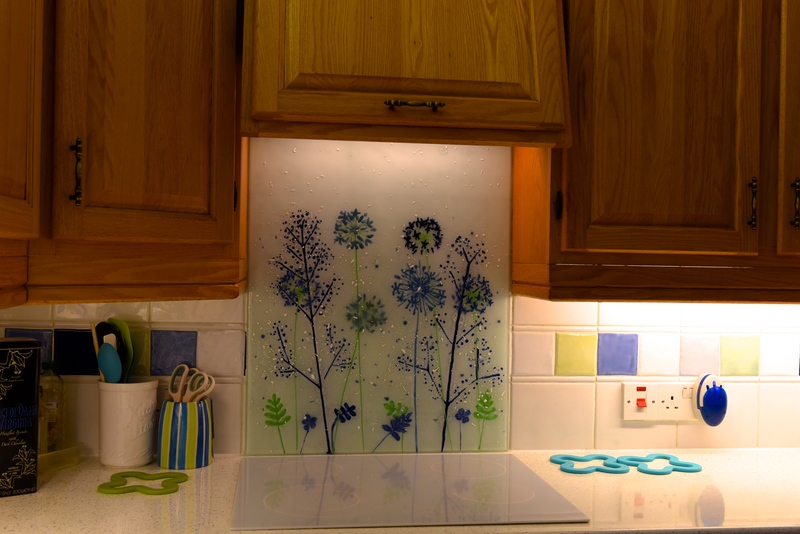 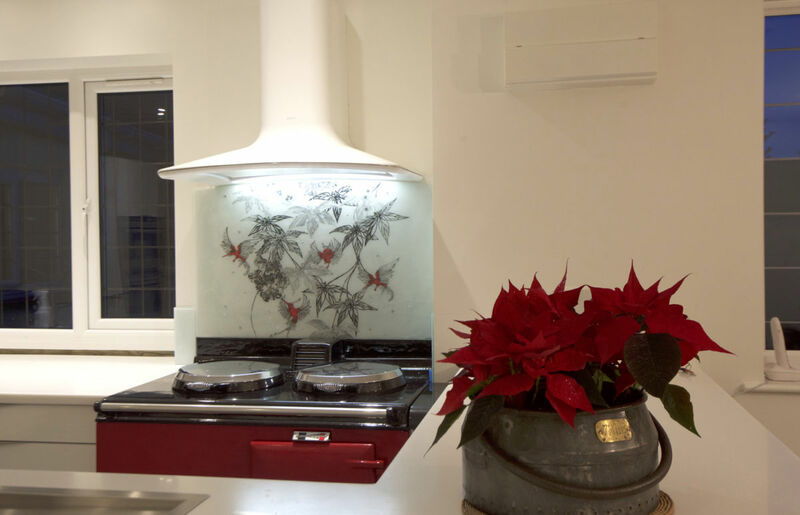 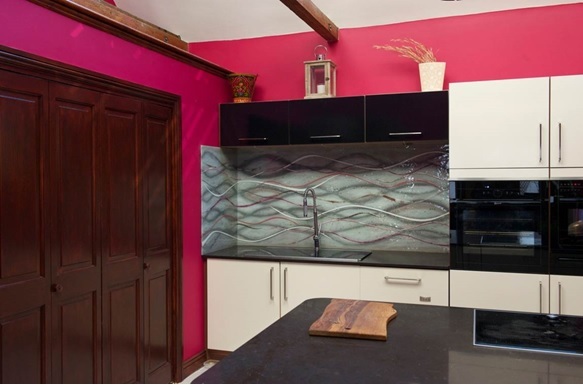 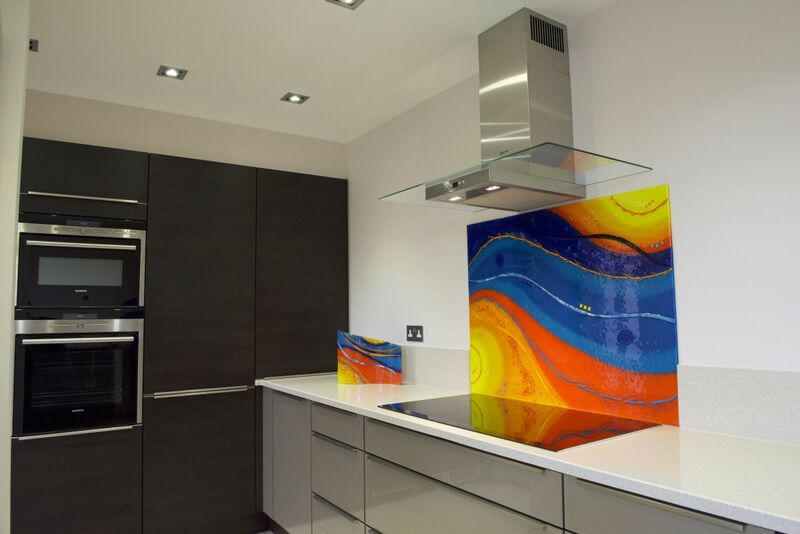 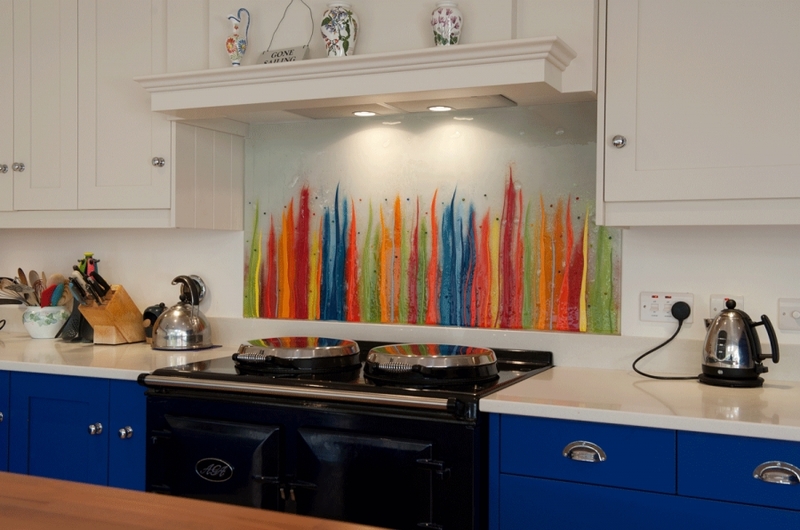 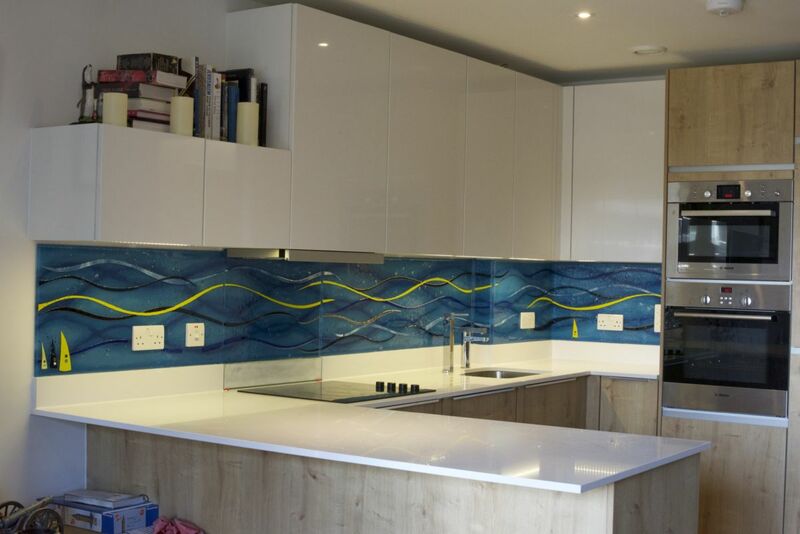 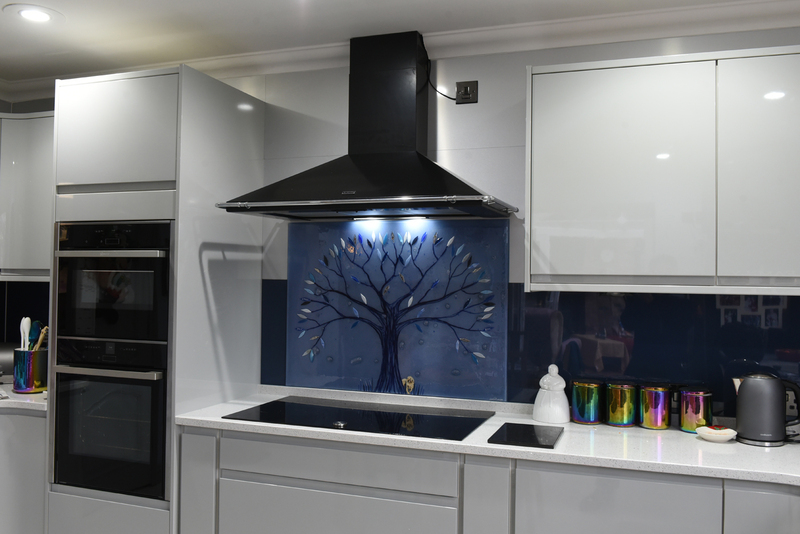 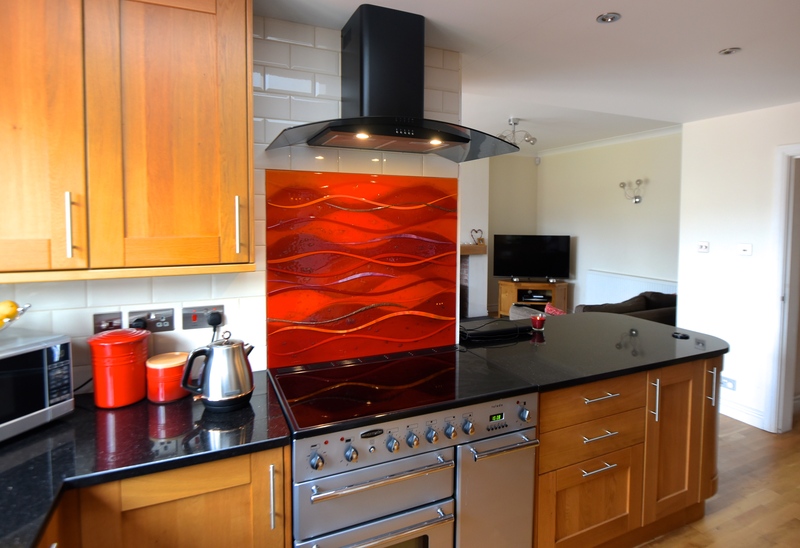 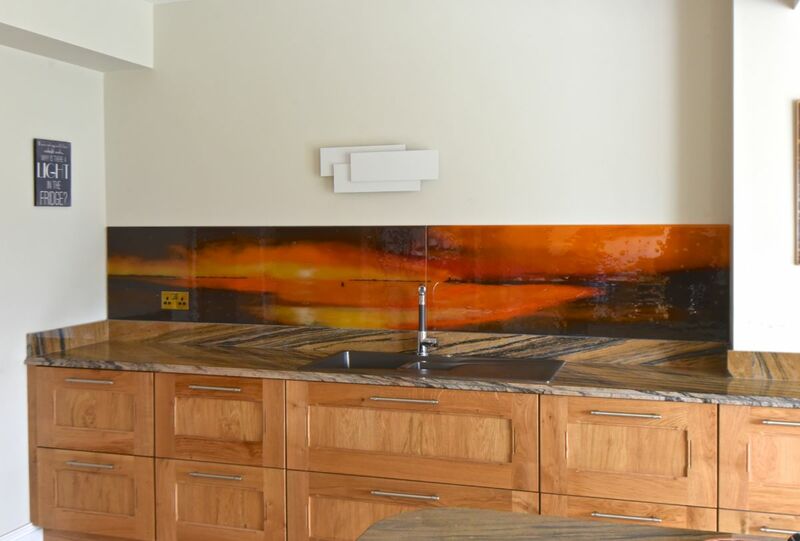 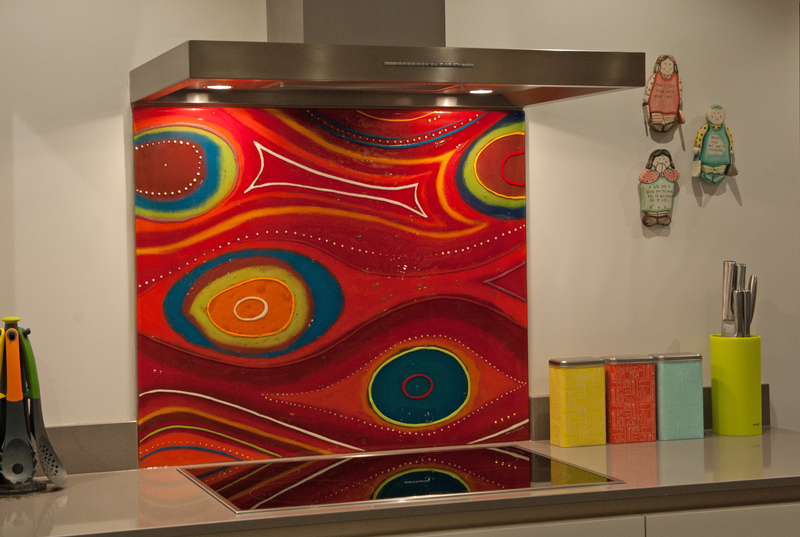 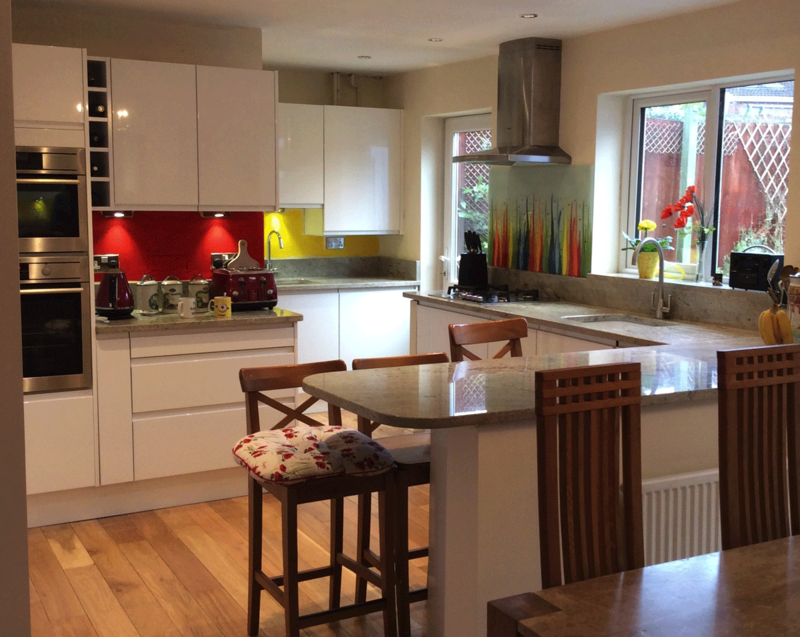 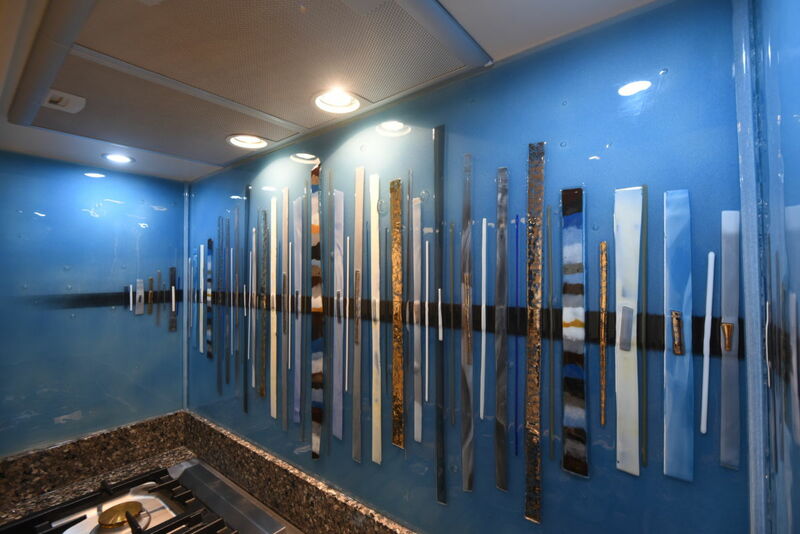 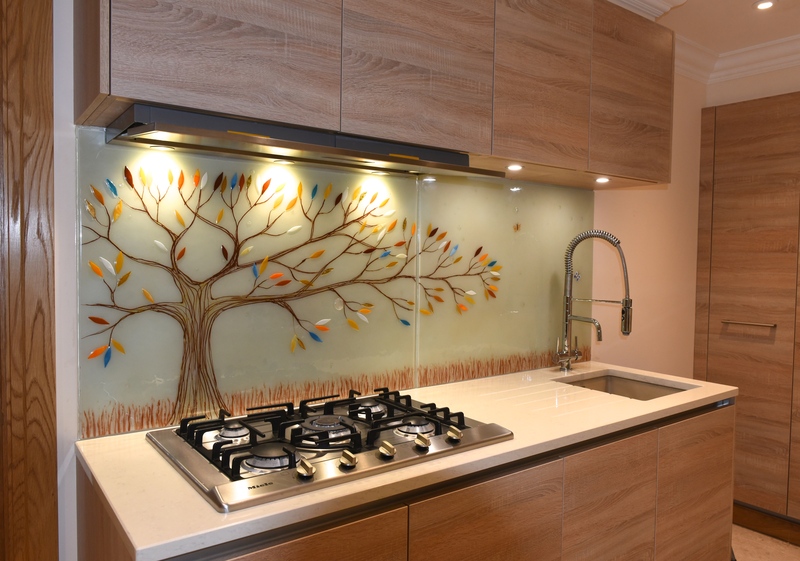 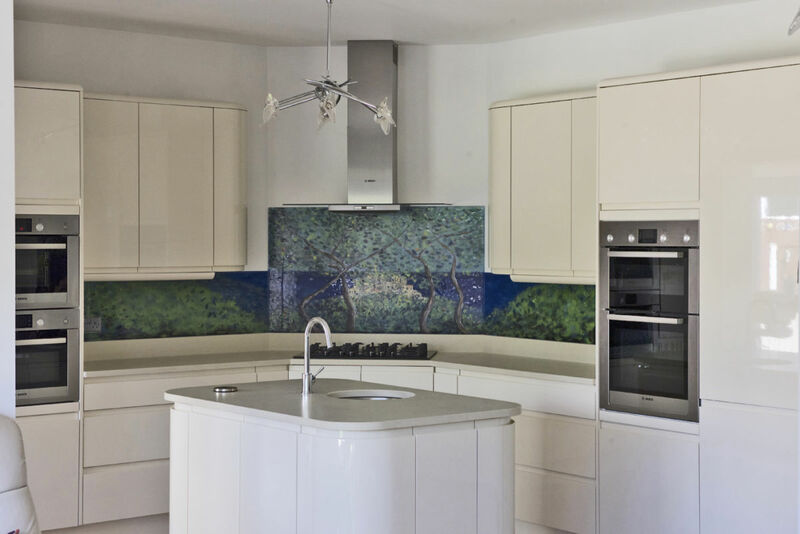 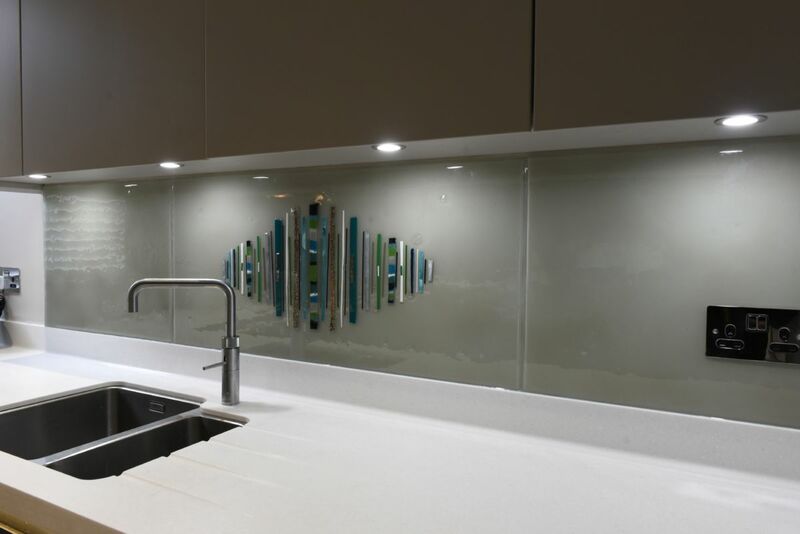 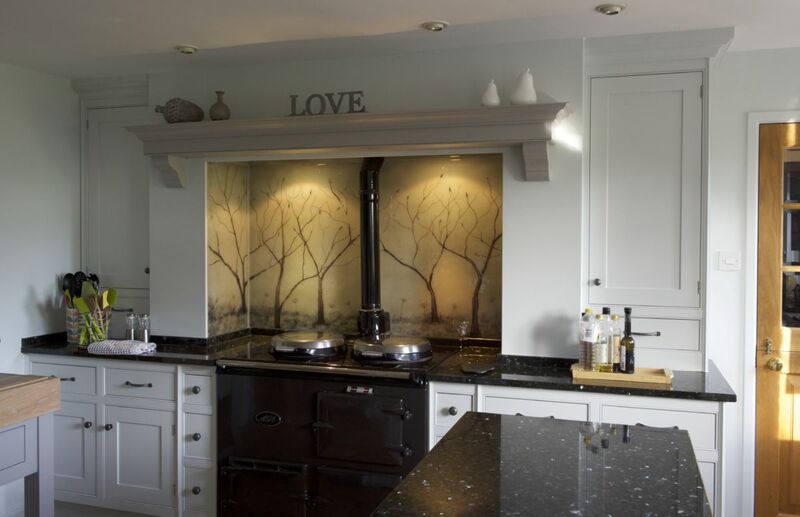 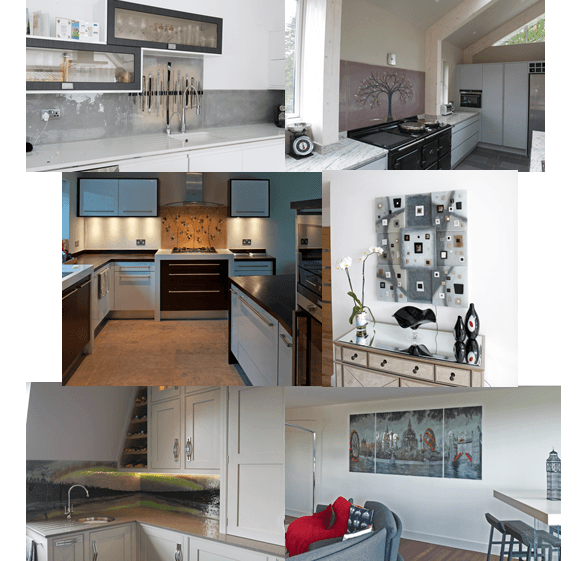 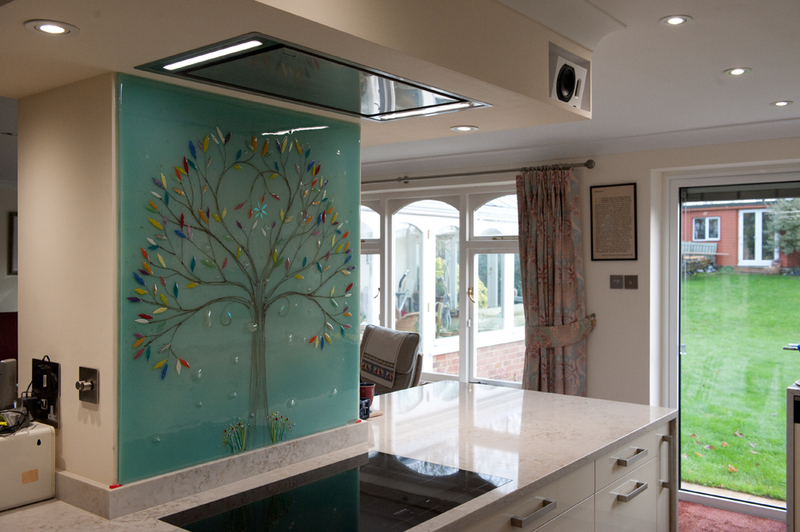 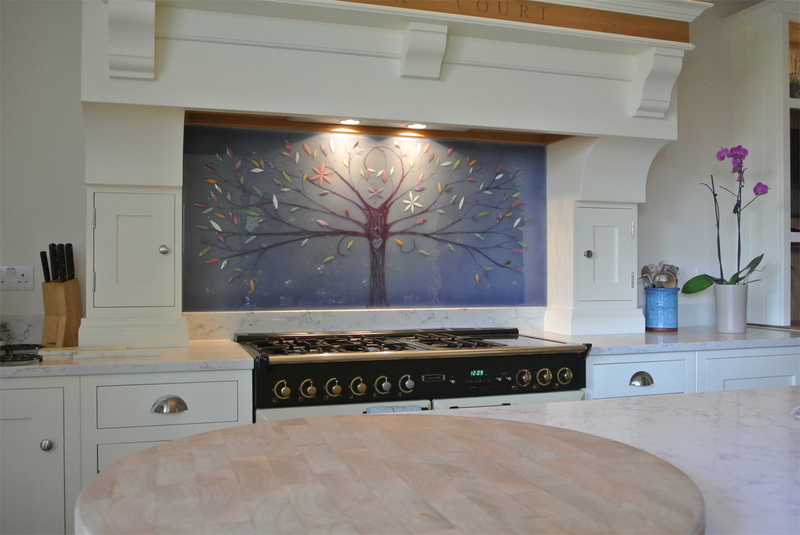 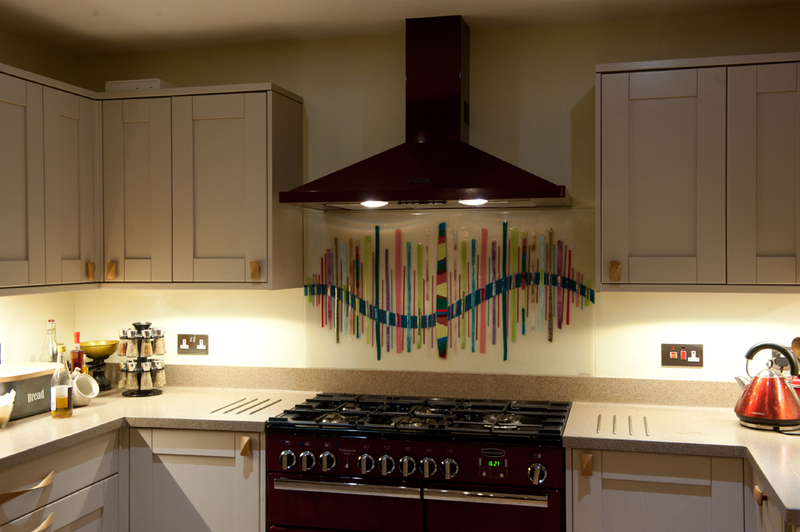 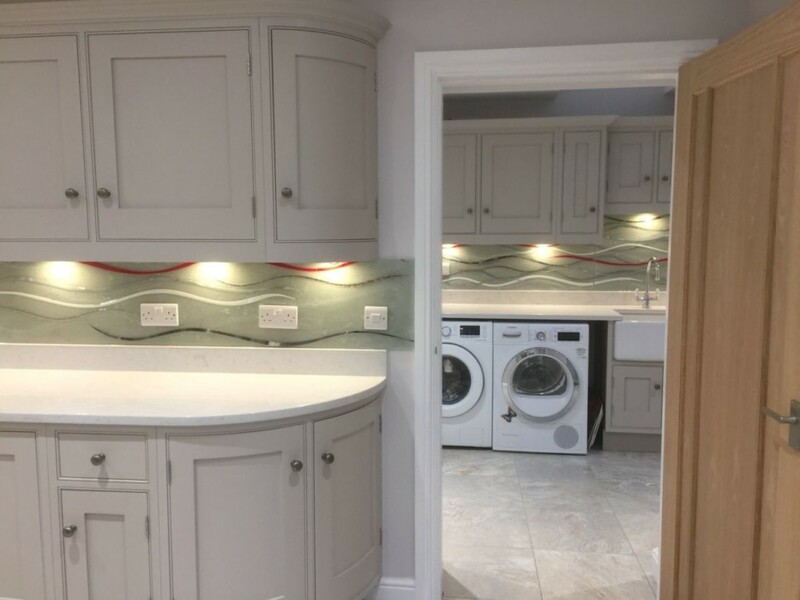 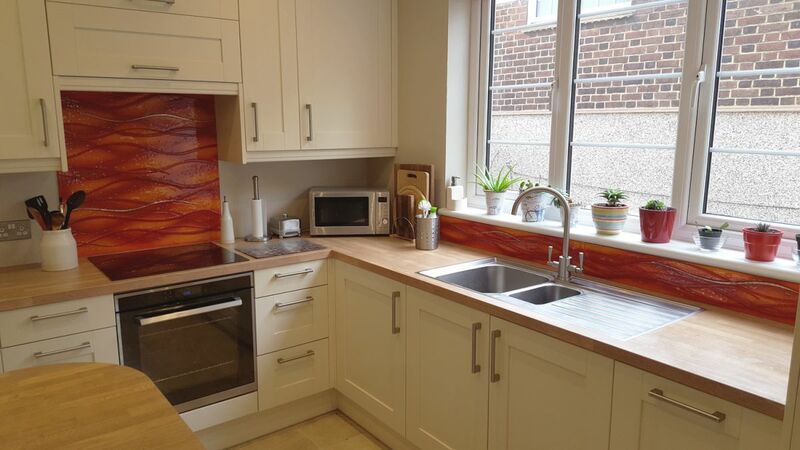 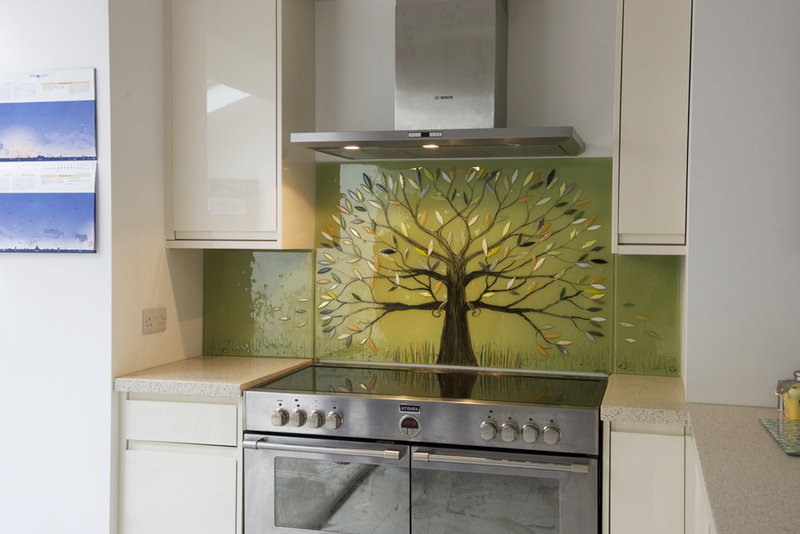 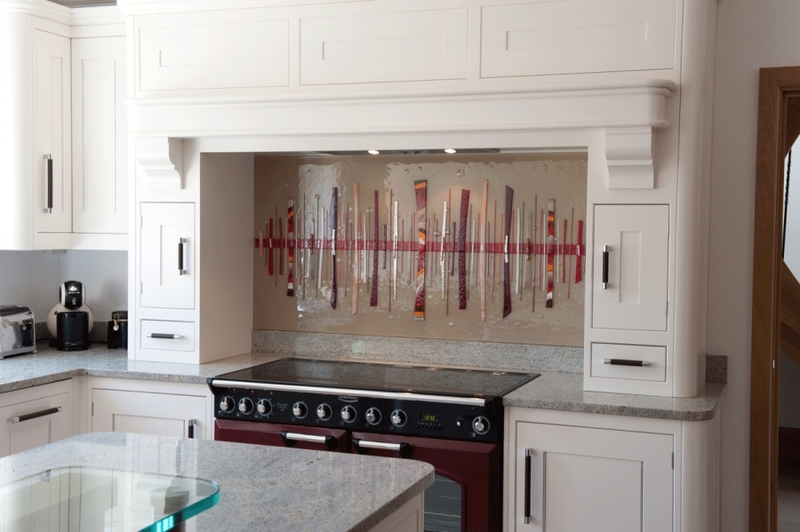 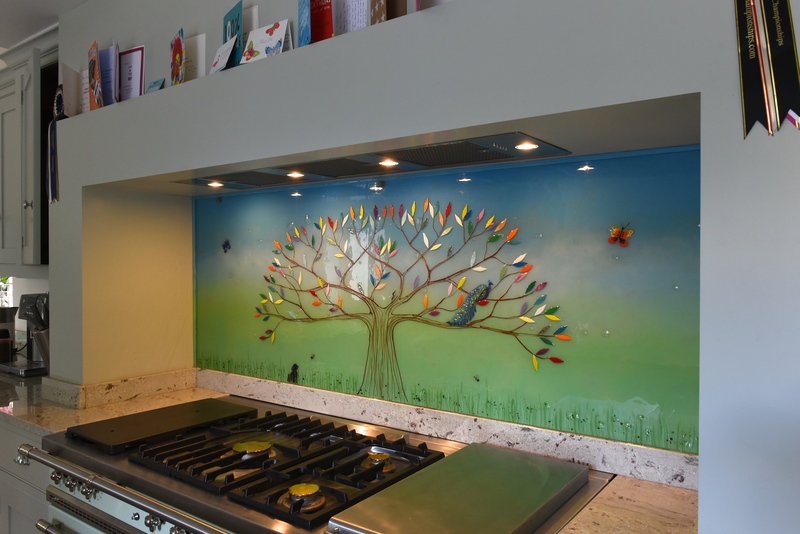 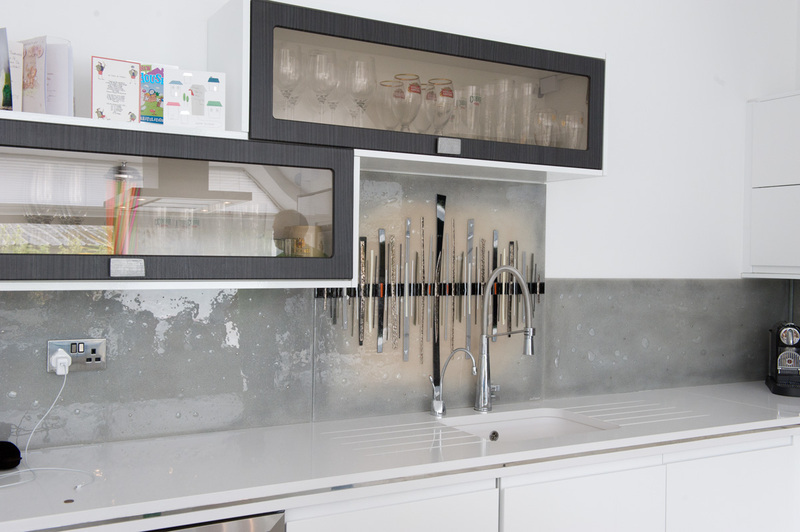 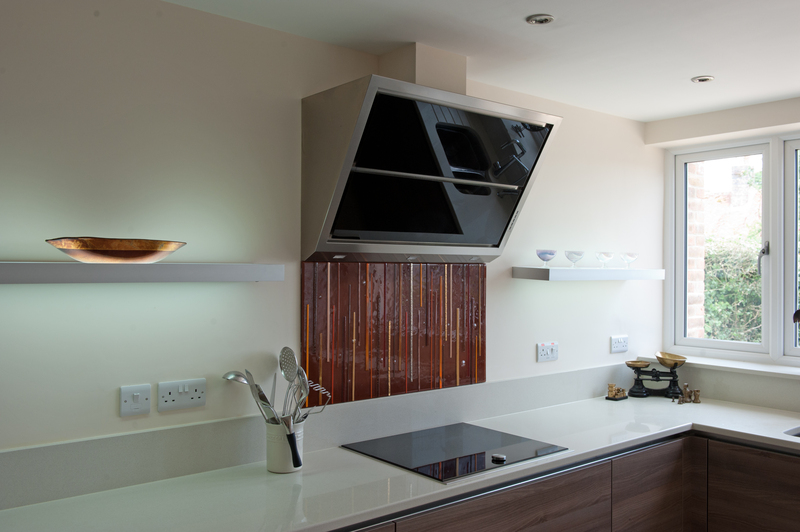 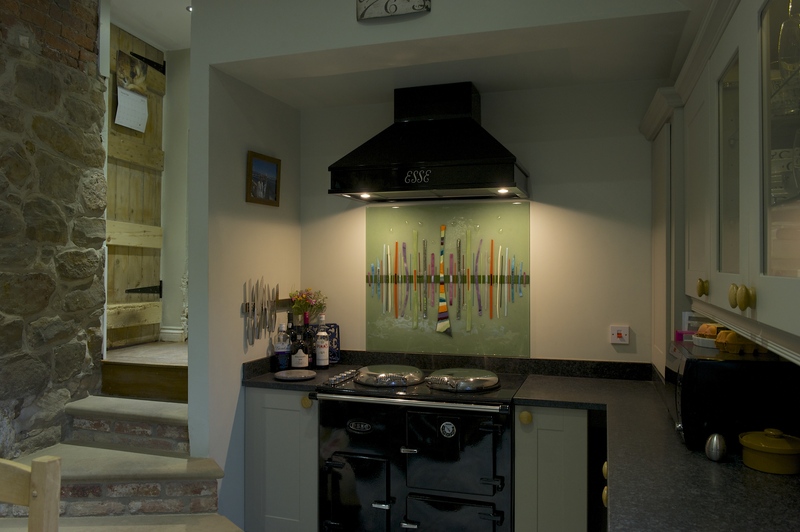 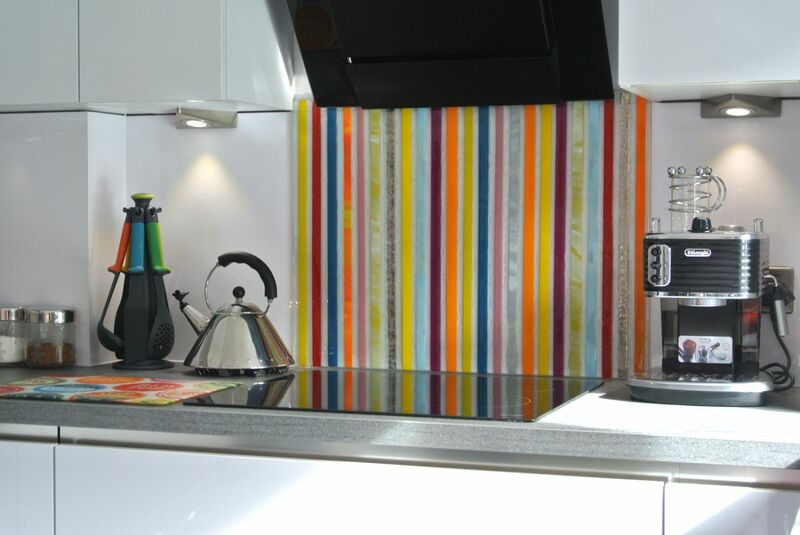 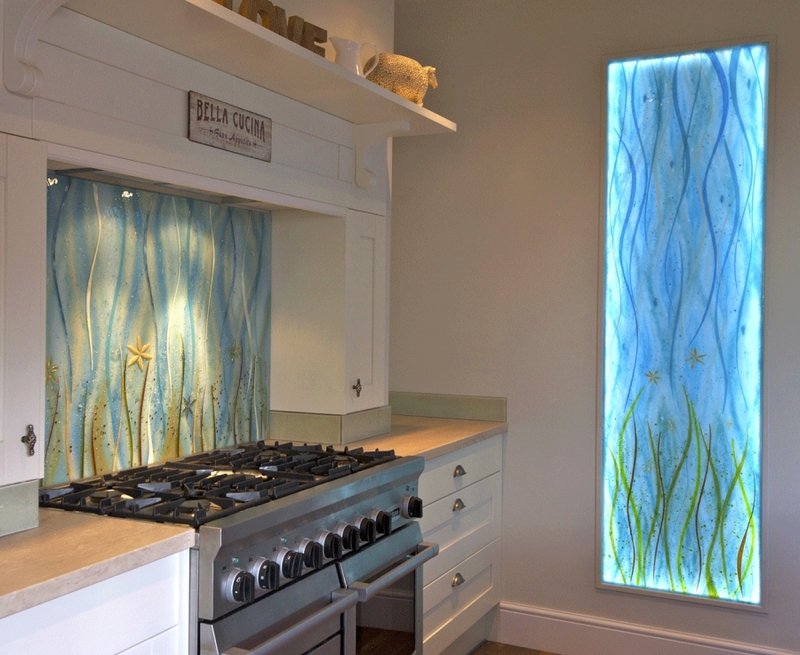 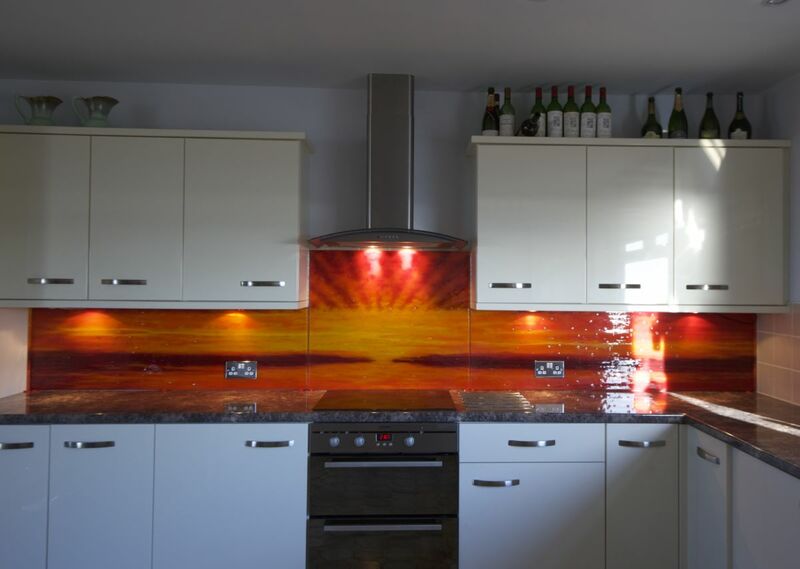 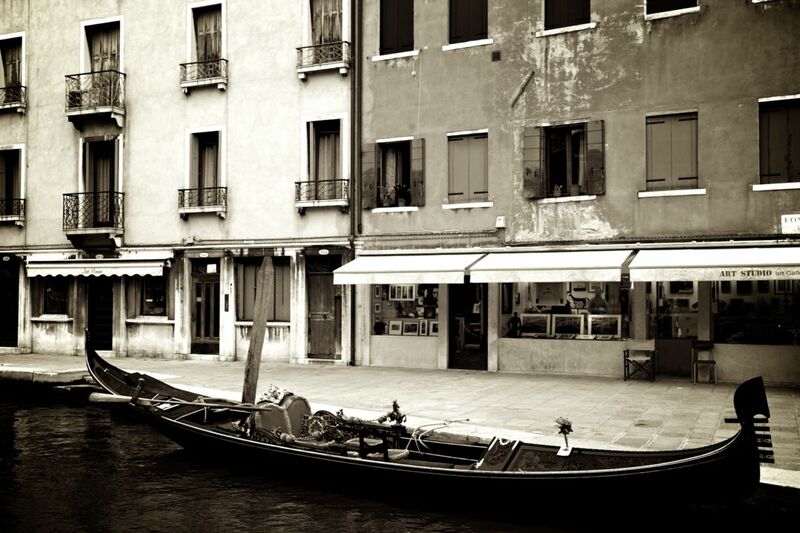 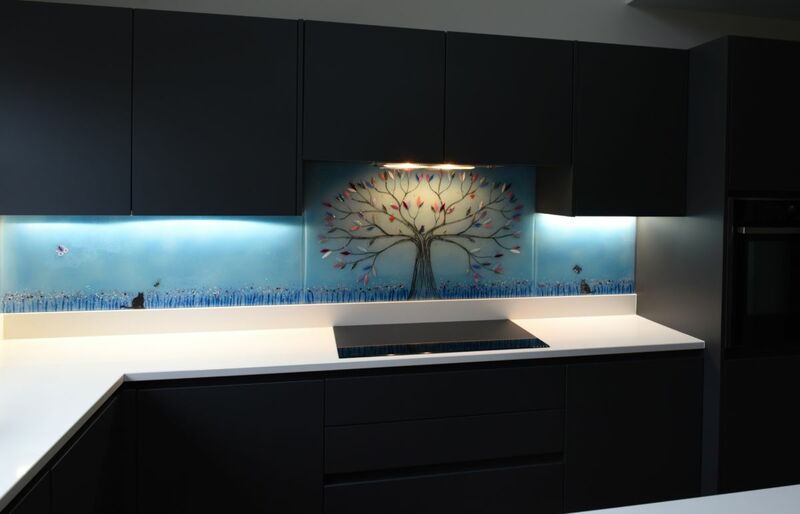 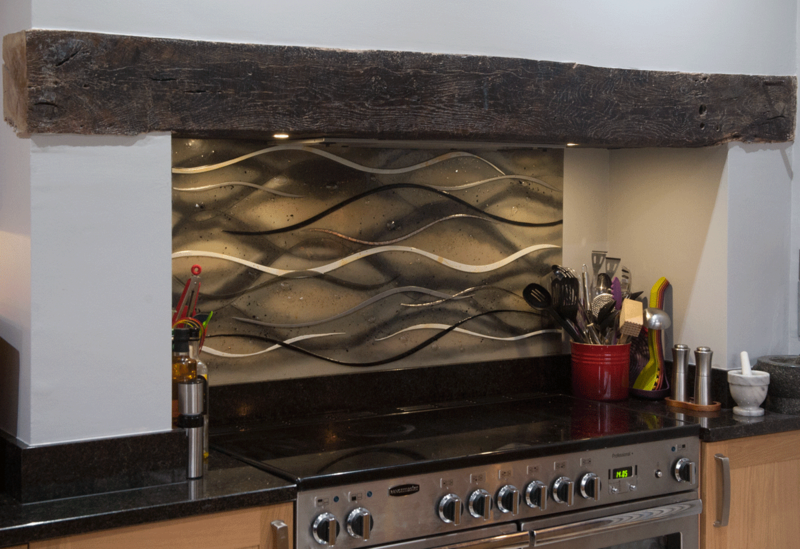 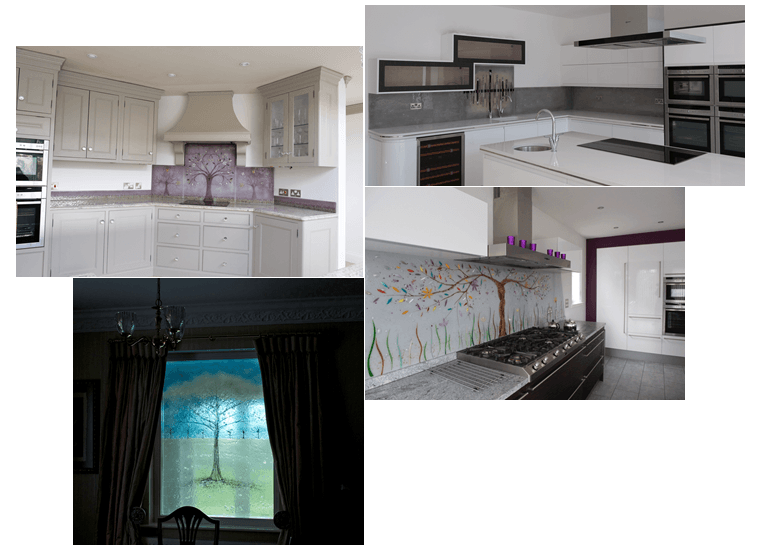 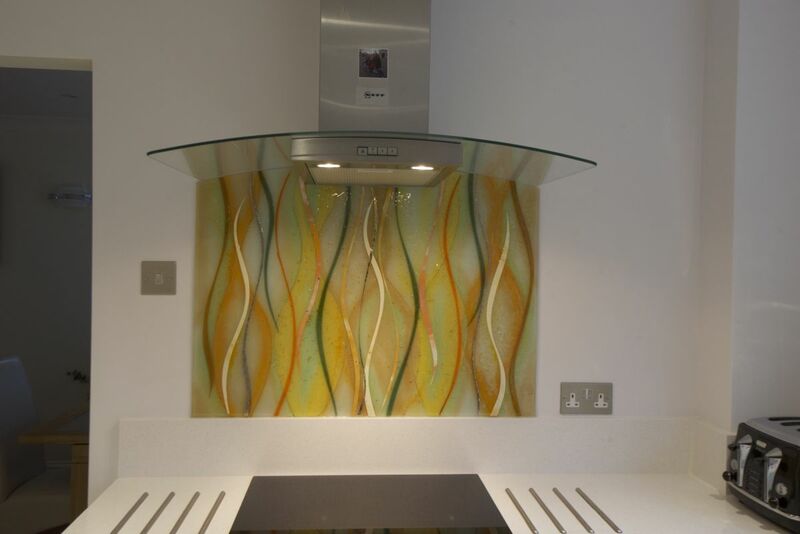 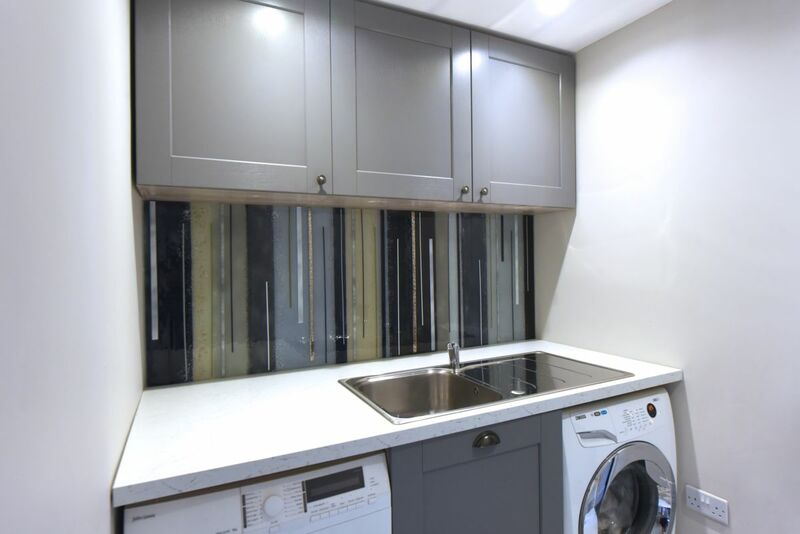 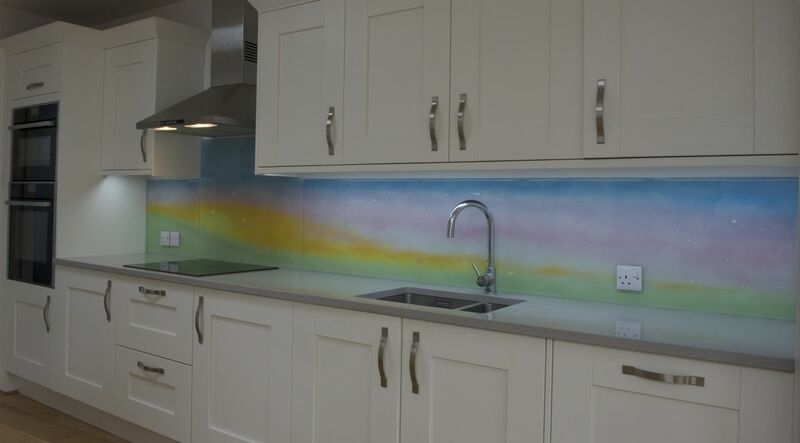 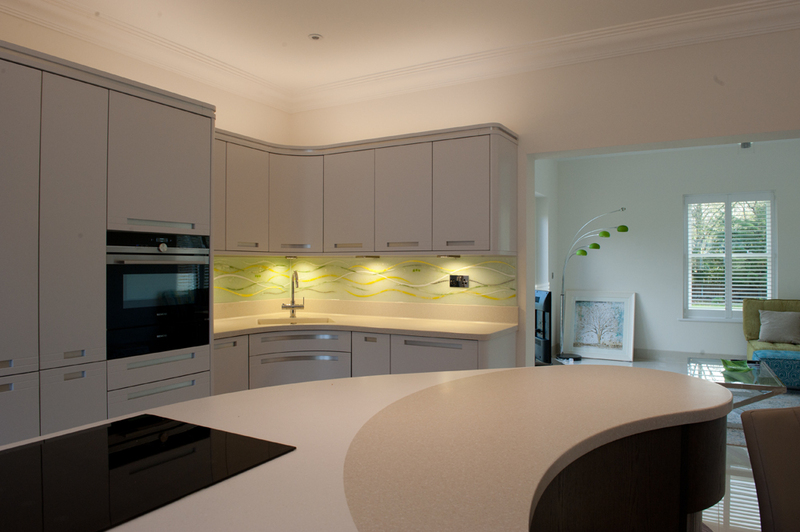 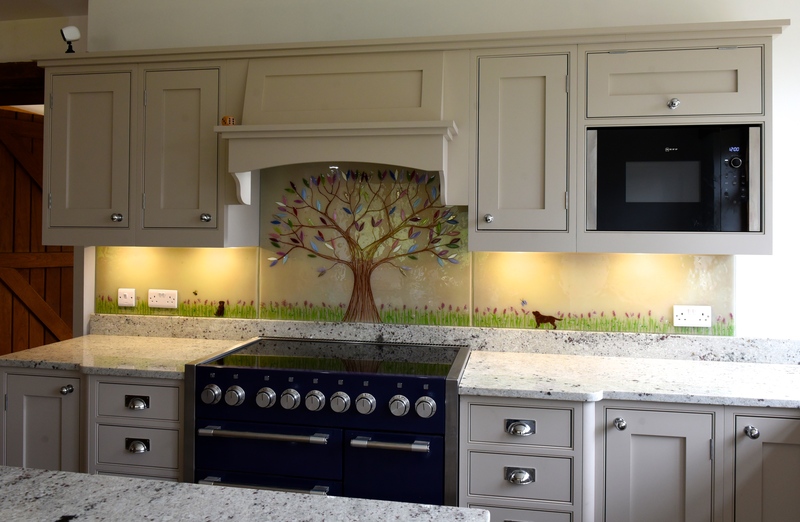 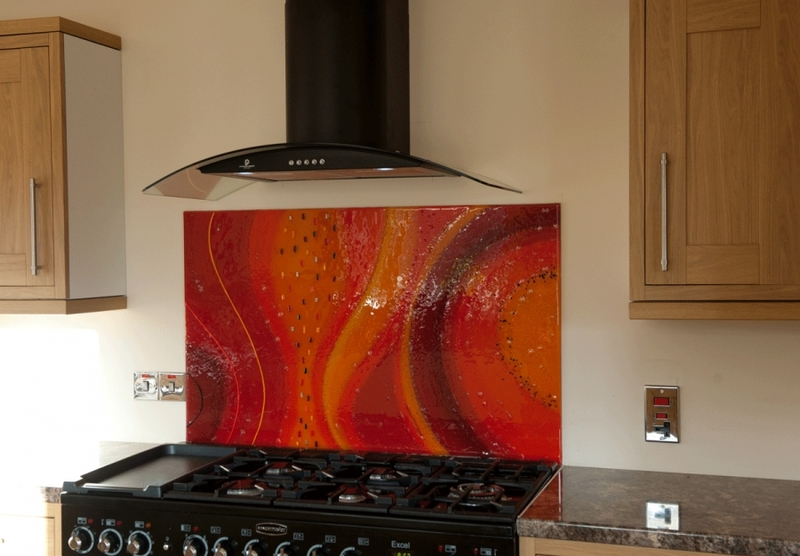 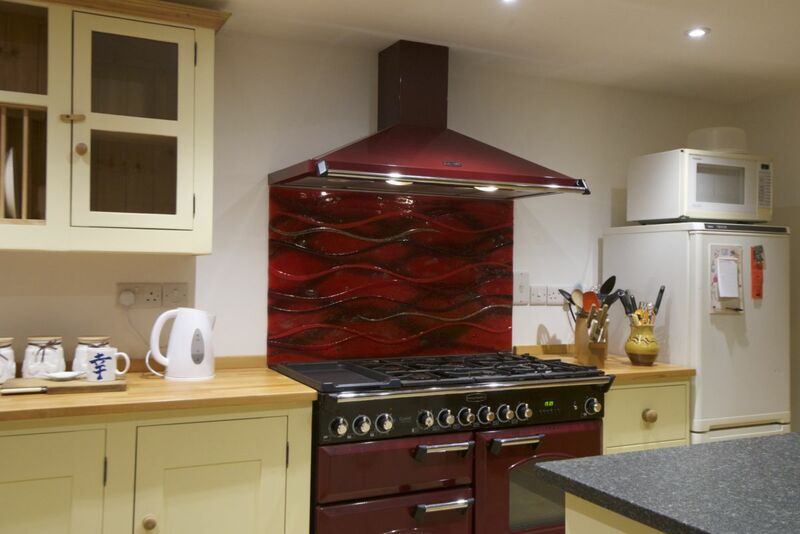 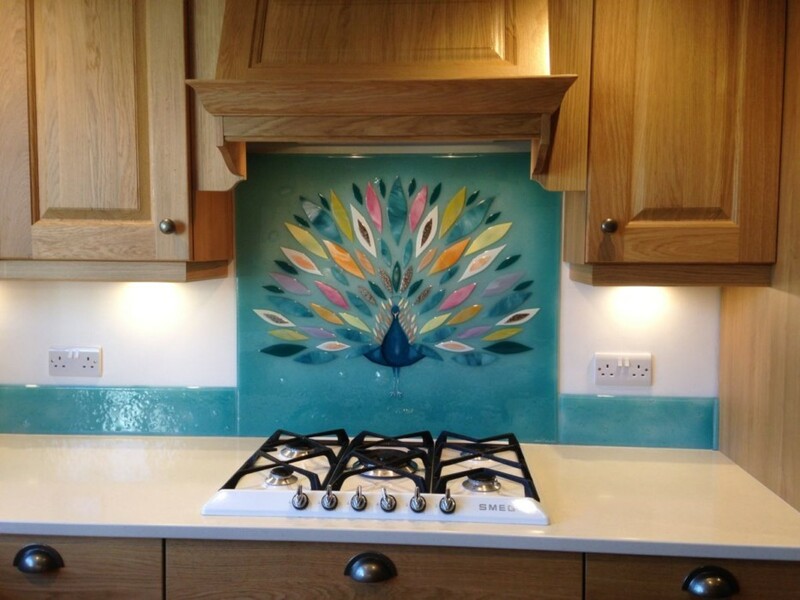 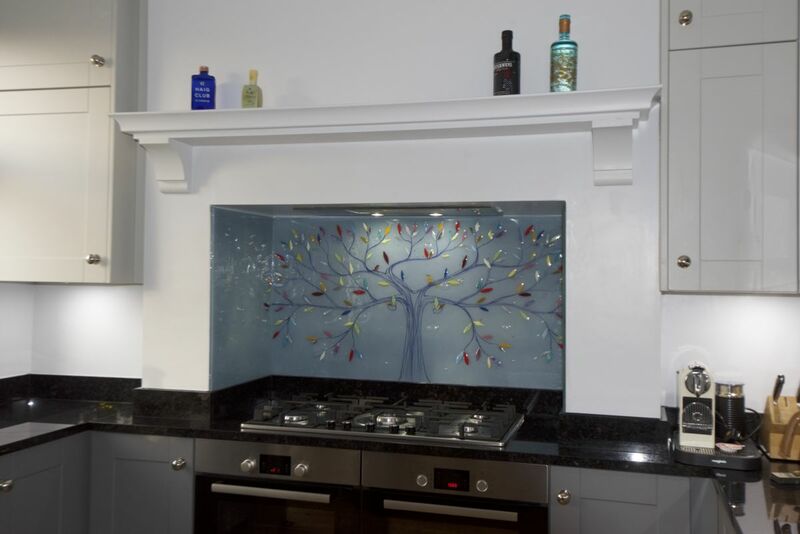 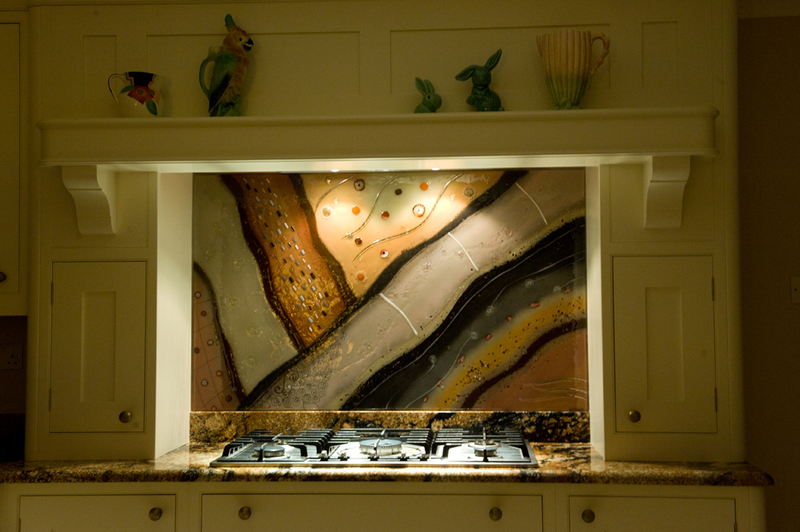 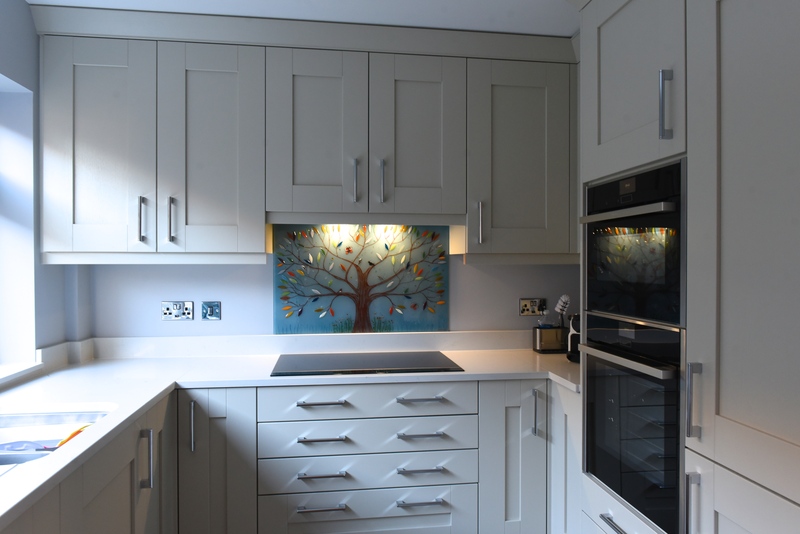 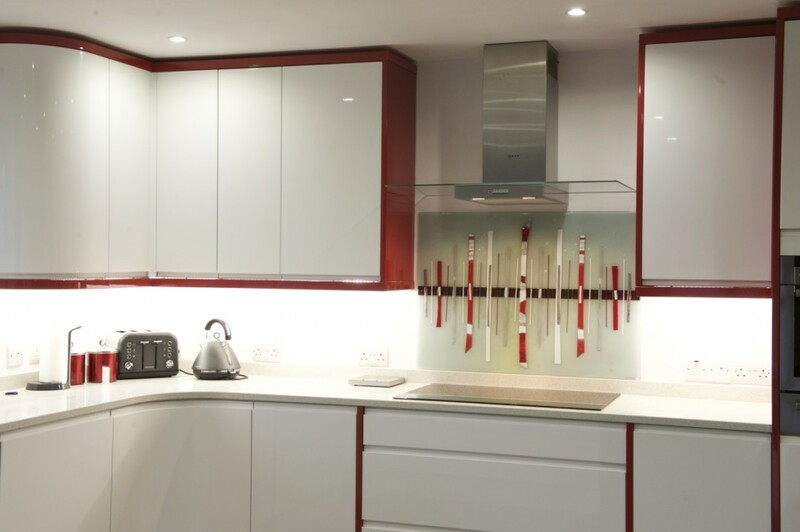 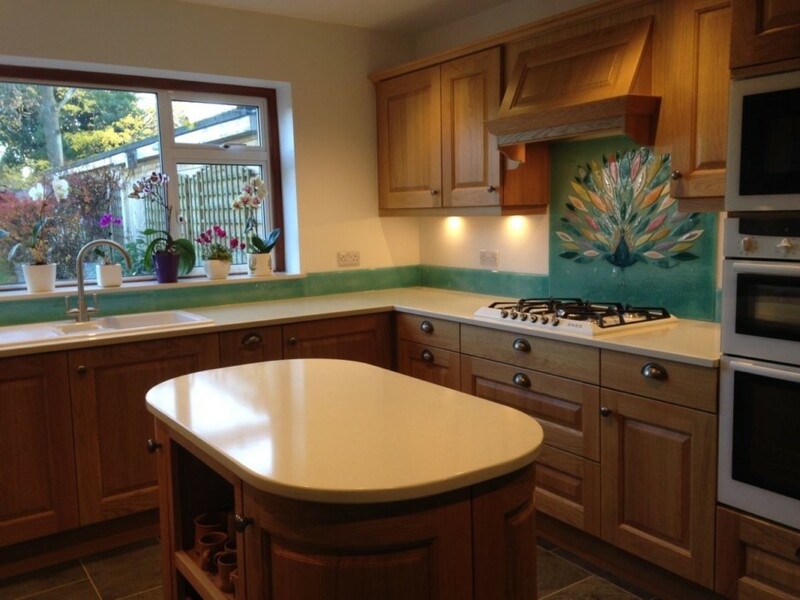 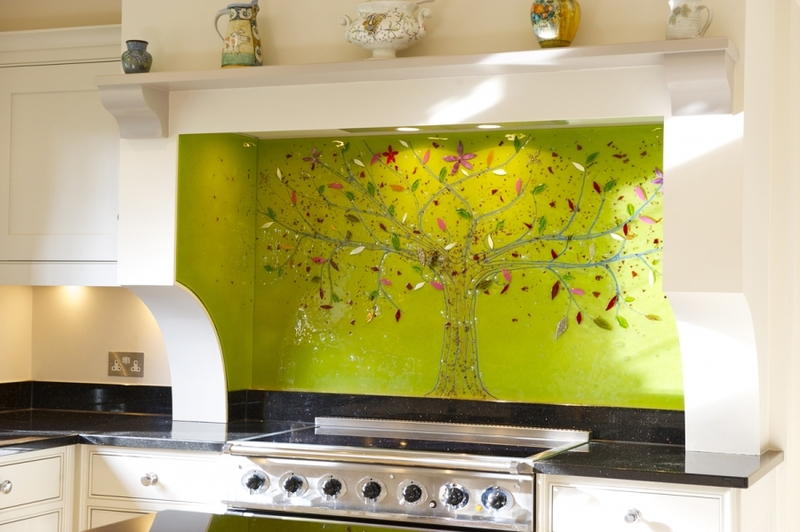 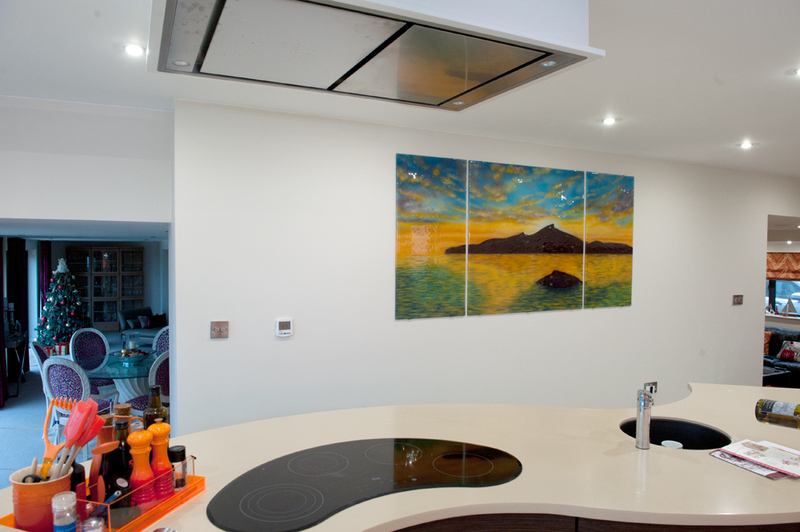 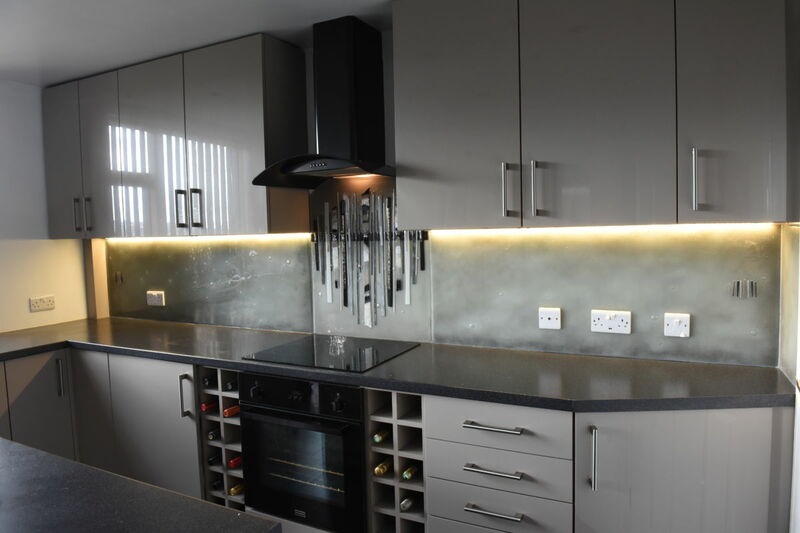 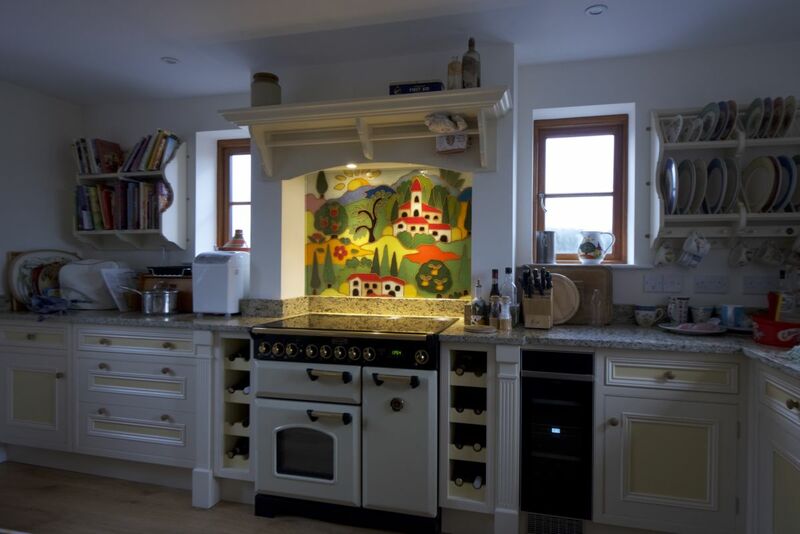 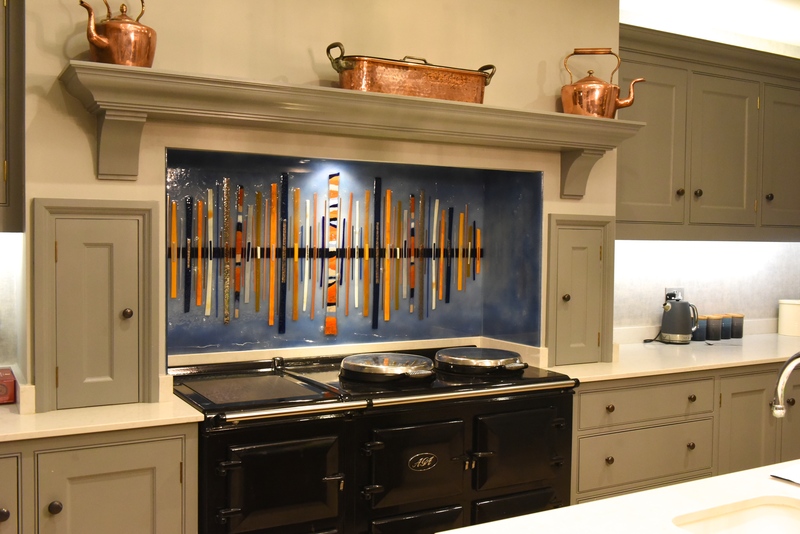 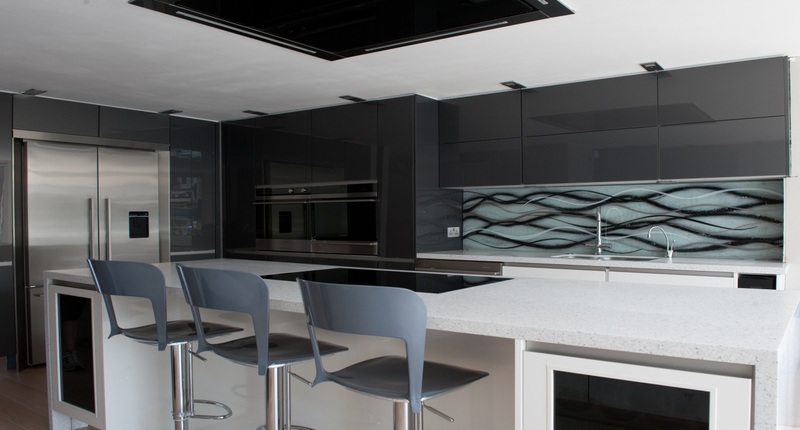 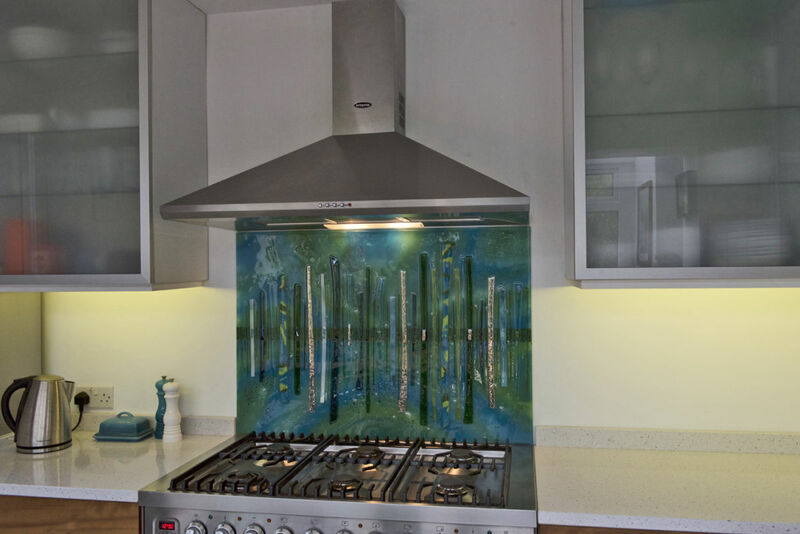 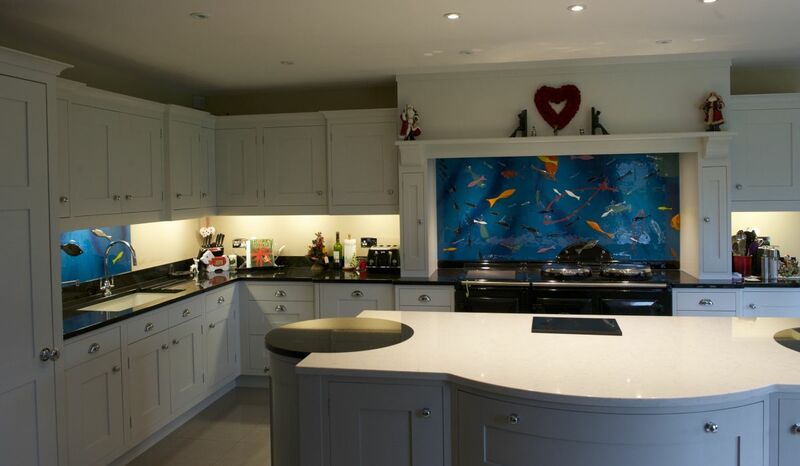 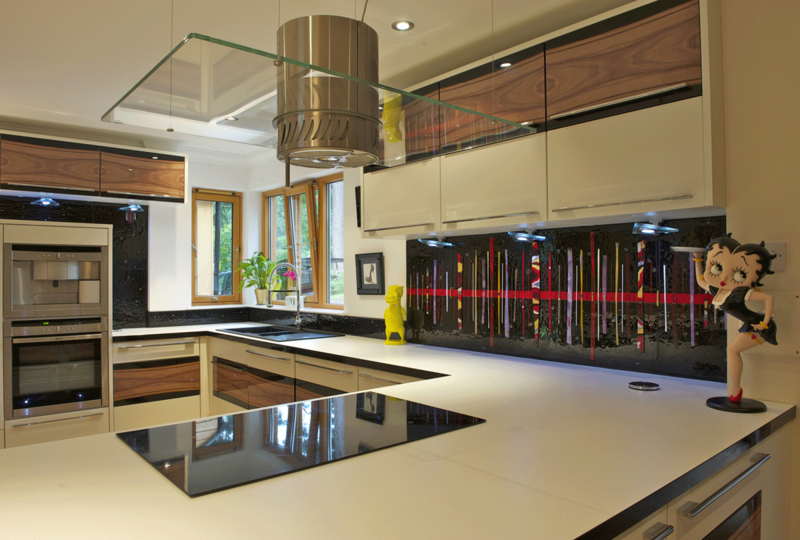 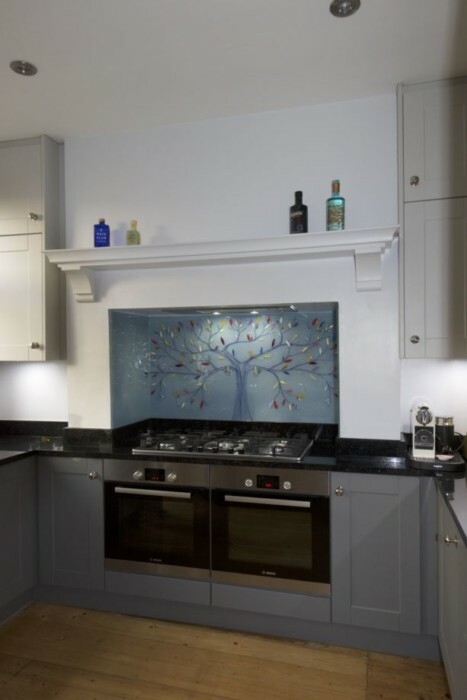 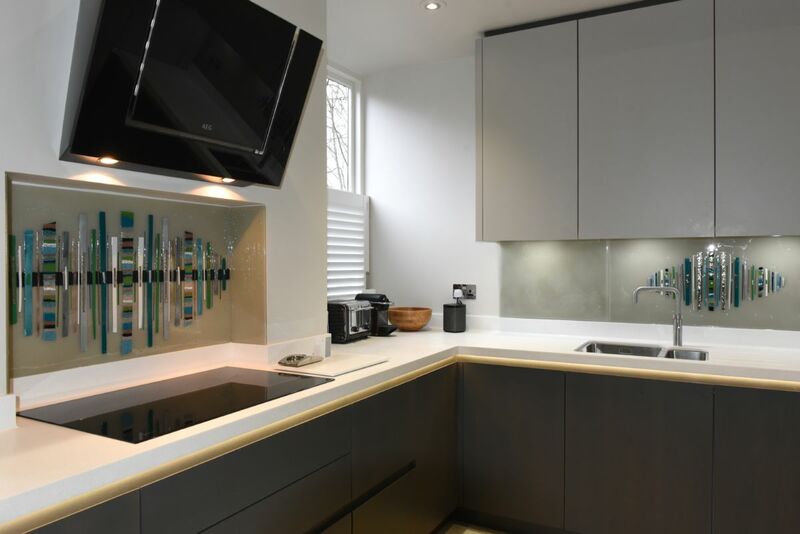 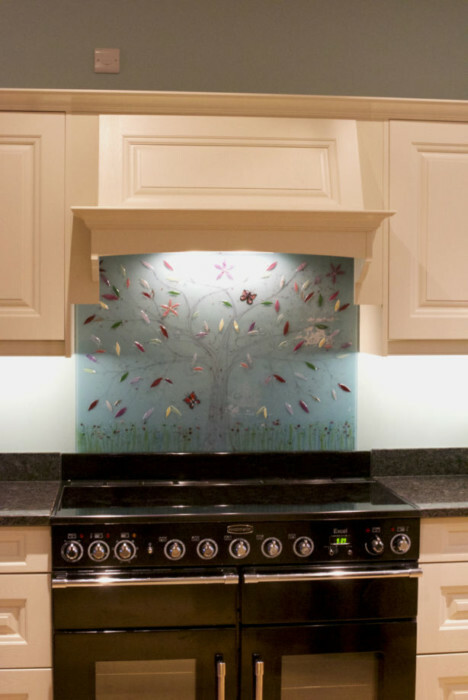 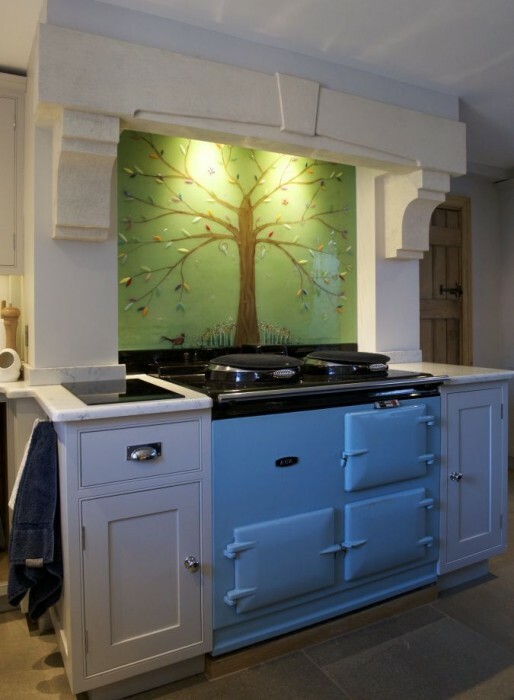 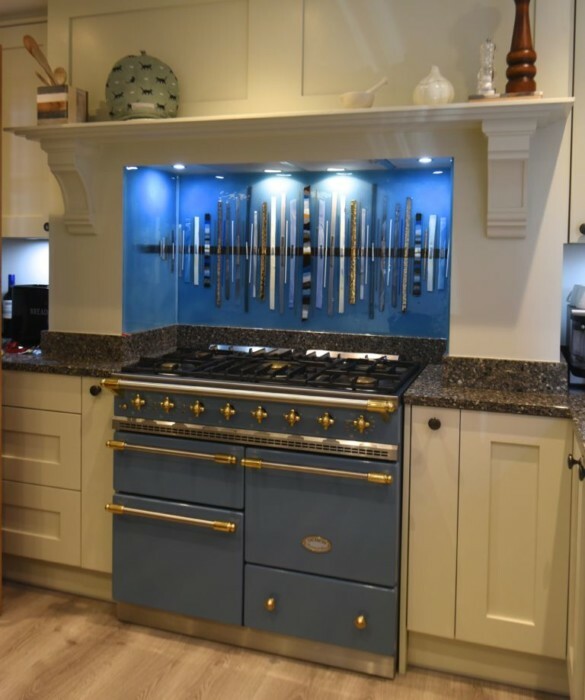 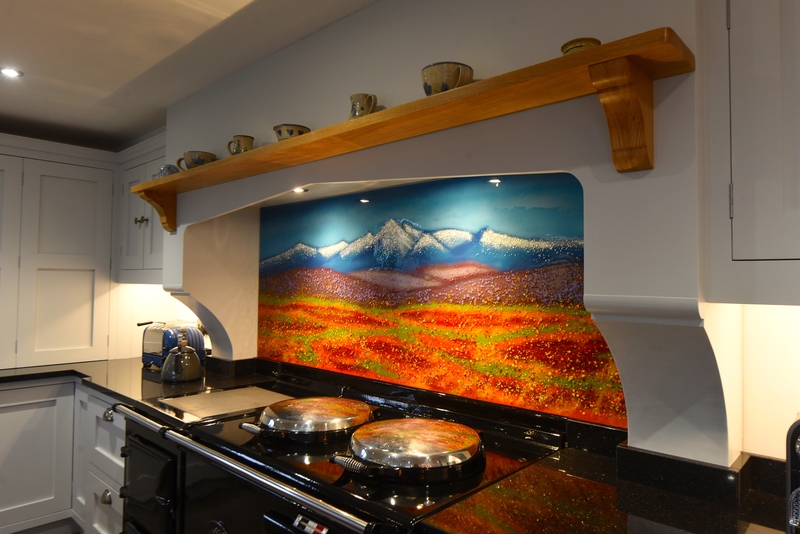 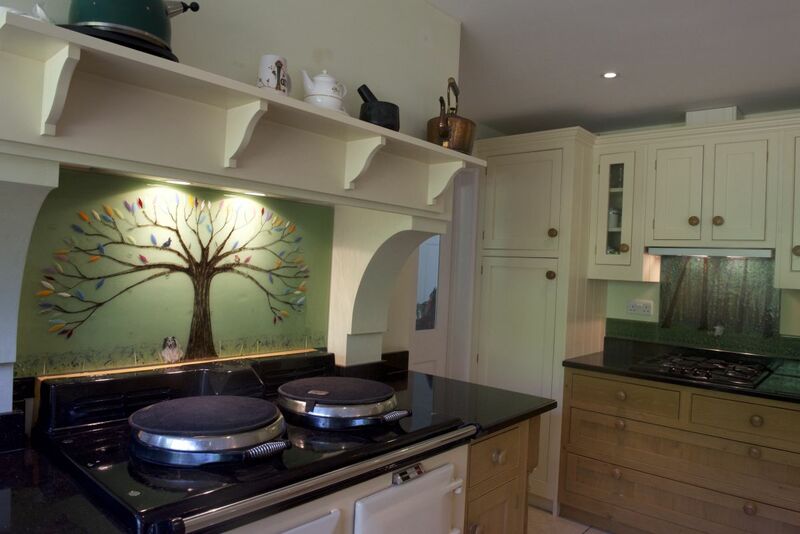 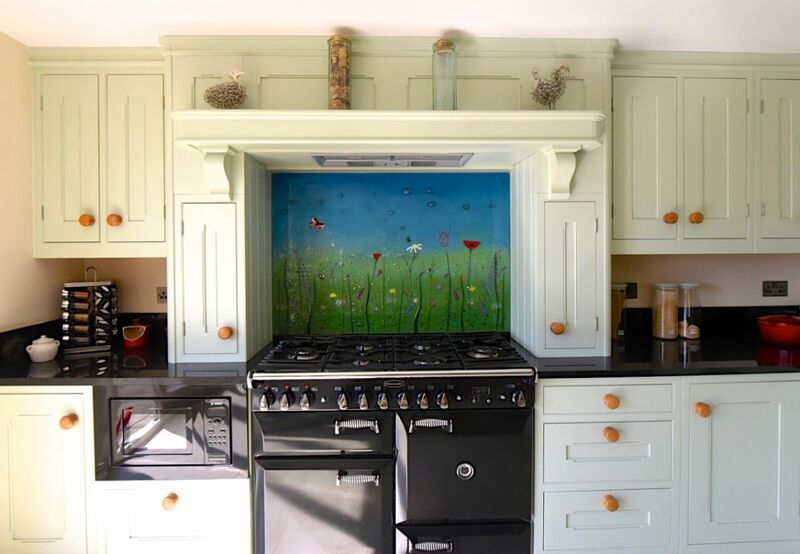 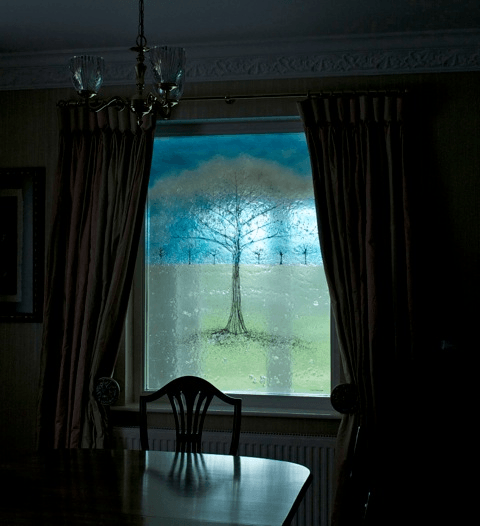 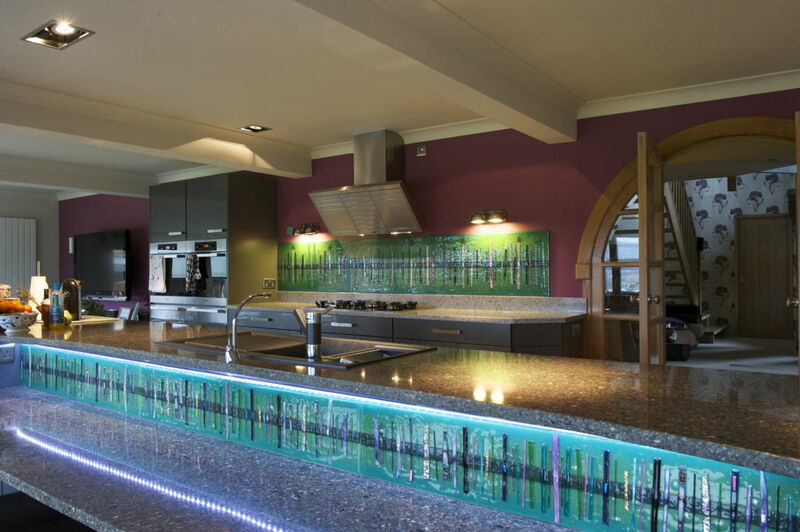 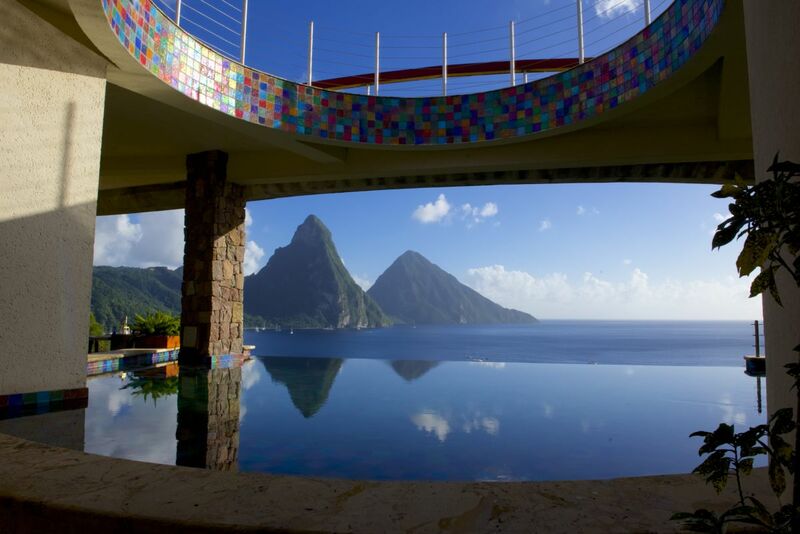 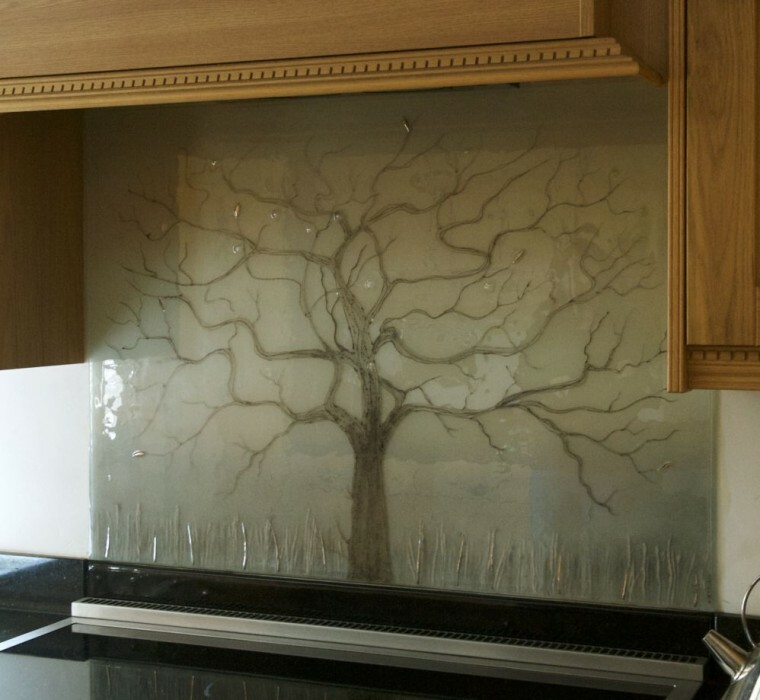 It’s definitely one of our very best glass splashbacks Cheshire-wide and beyond! 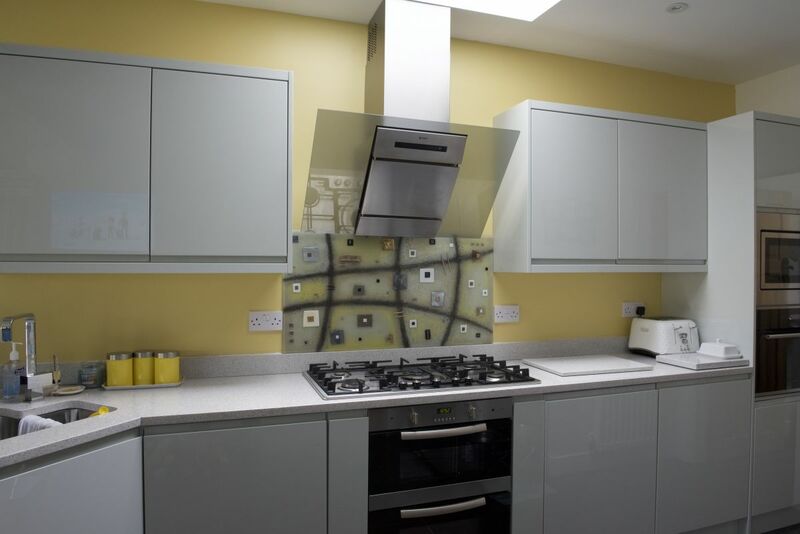 But more about the details! 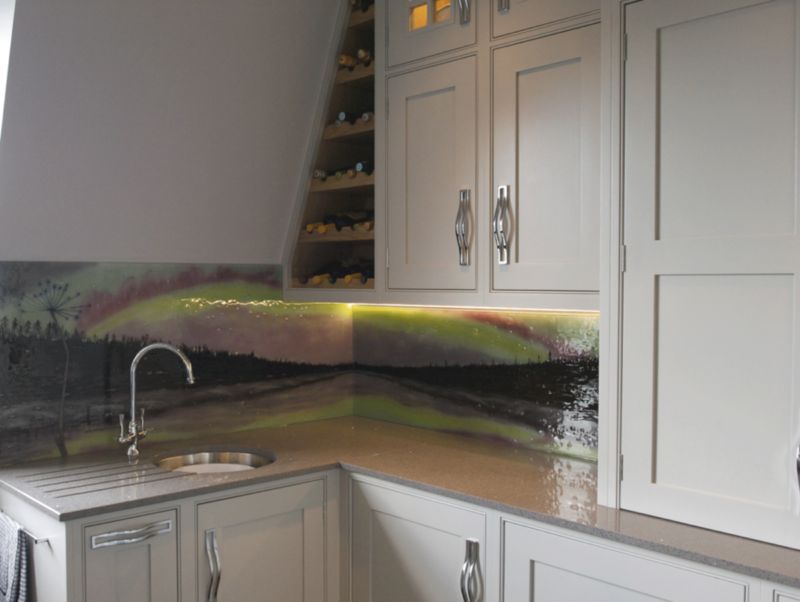 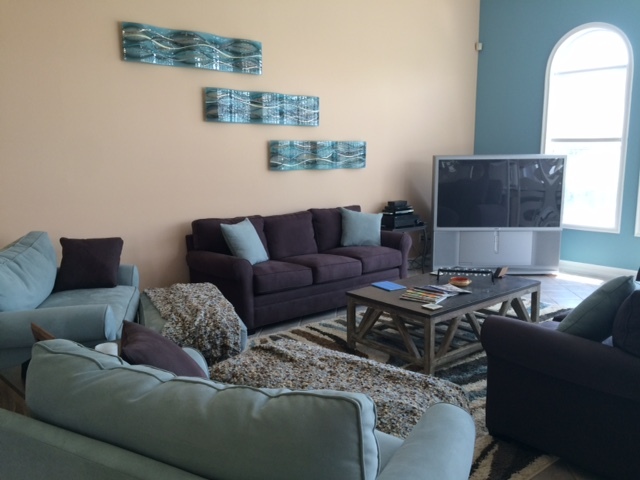 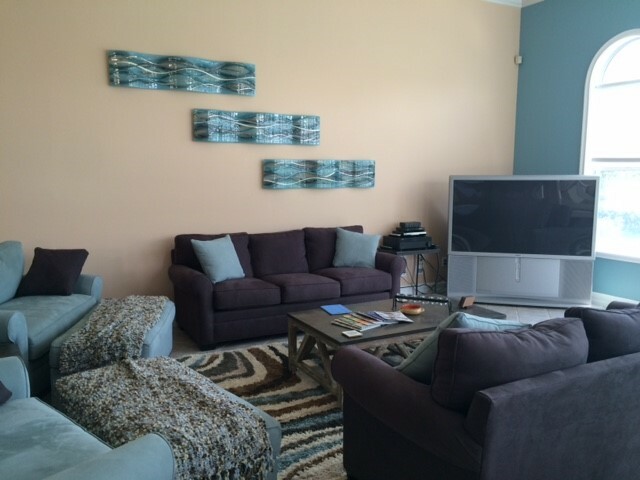 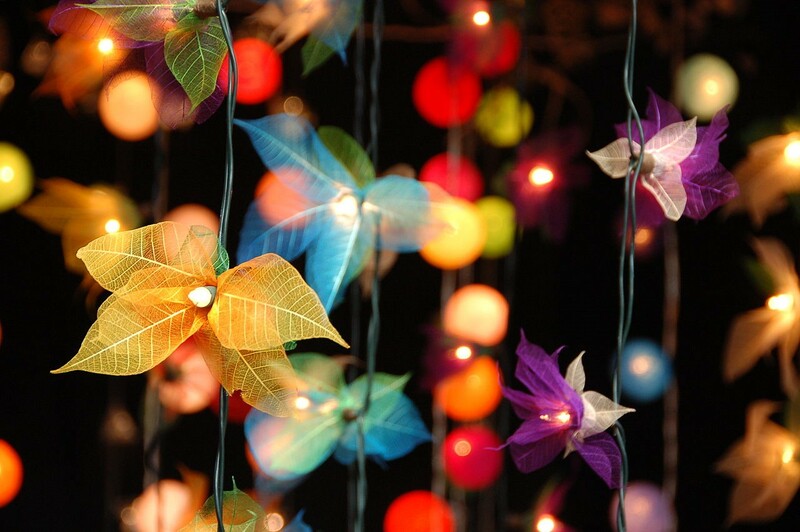 Flecks of white and sprinklings of very light accents show off where the sun is beaming through overhead. 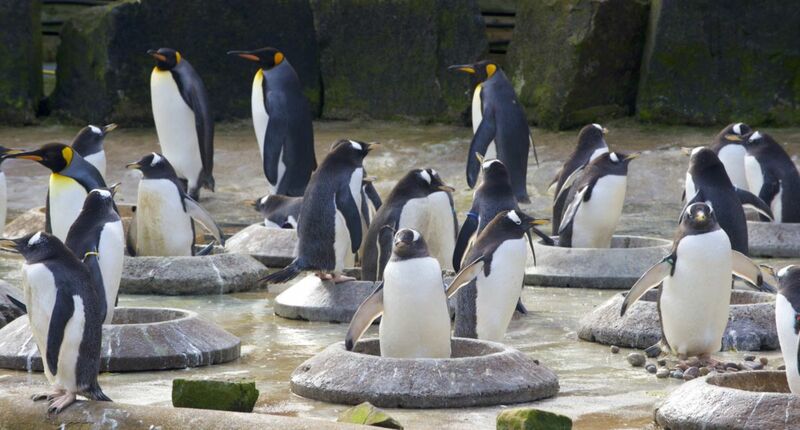 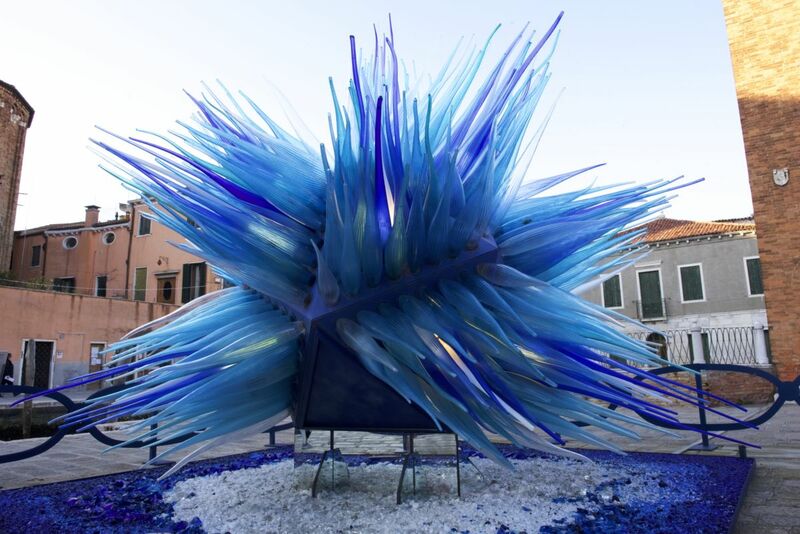 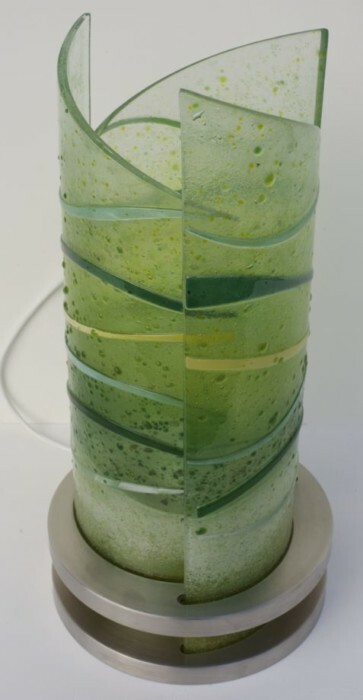 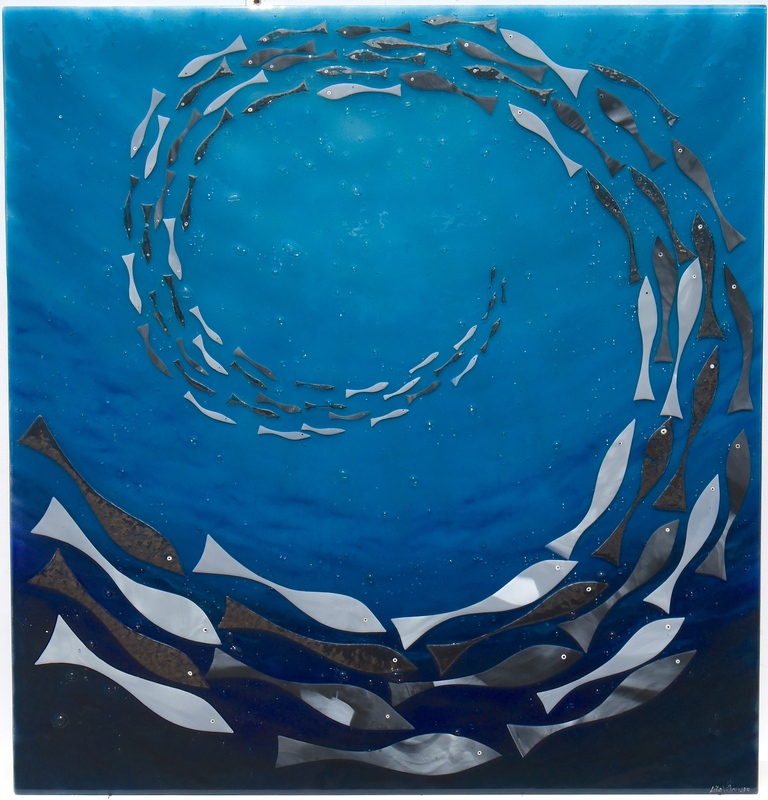 All the while, a shoal of fish swims upwards through the piece, spirally excitedly as they make their way upwards towards the surface in line. 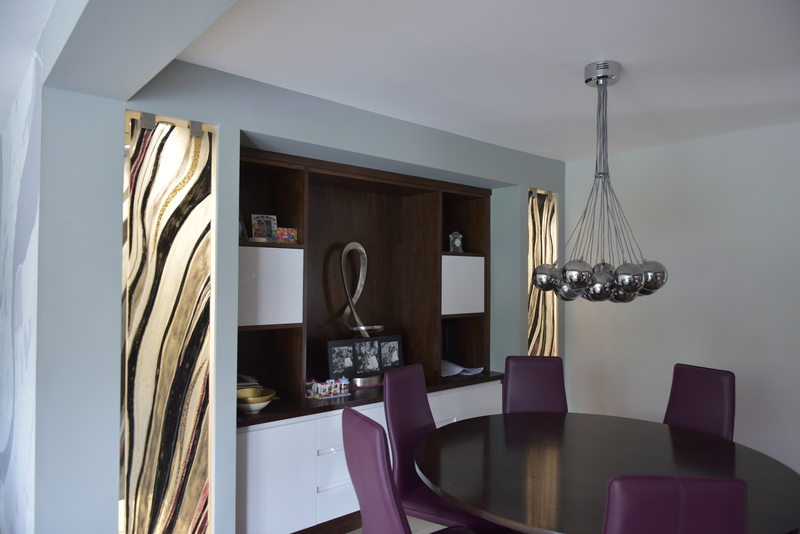 When you add silver shades and the clever use of metallics into the mix, you get something truly special. 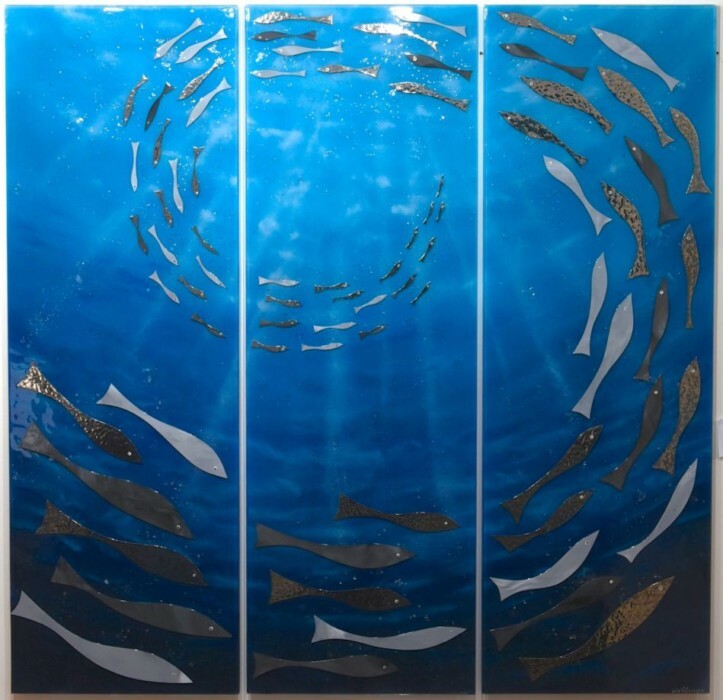 It really helps the fish to stand out, and when the light catches them it really does look like sunlight from above is actually bouncing off their scales. 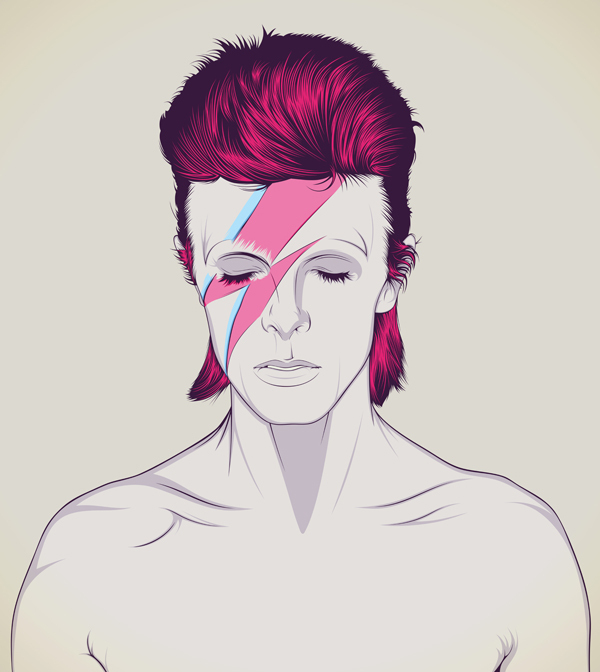 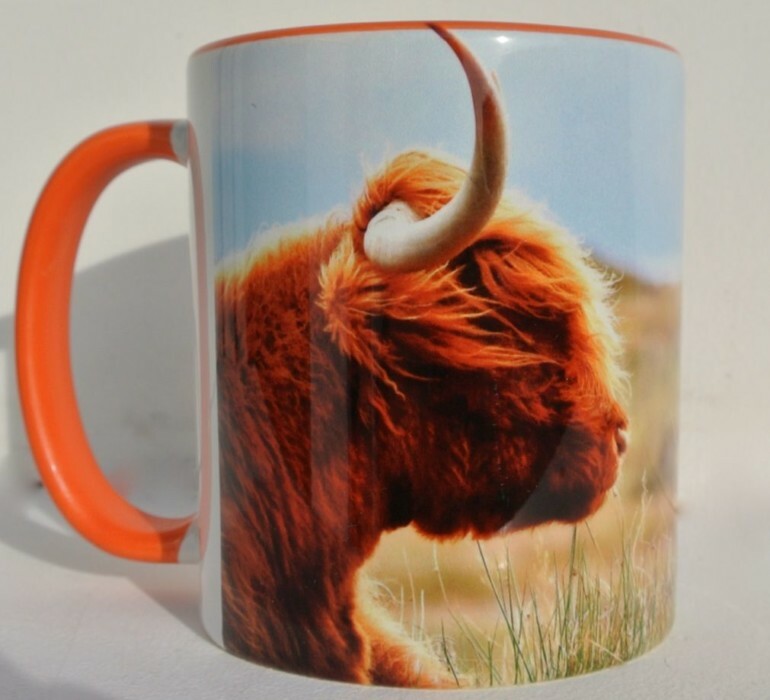 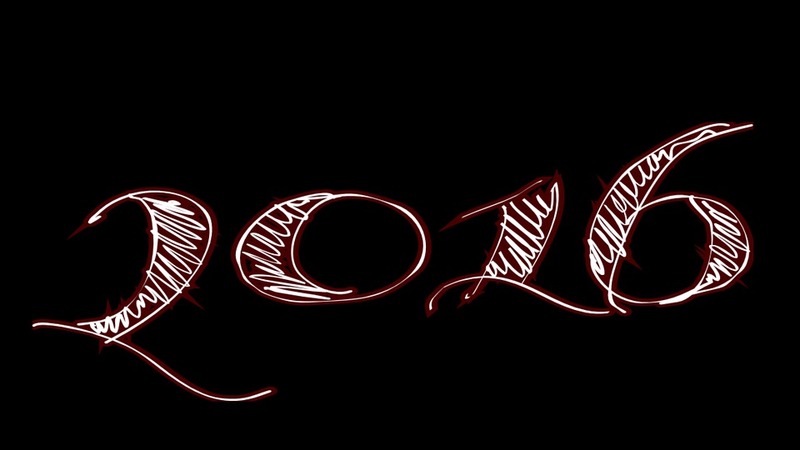 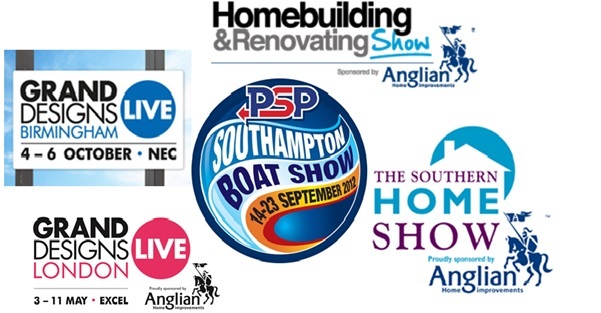 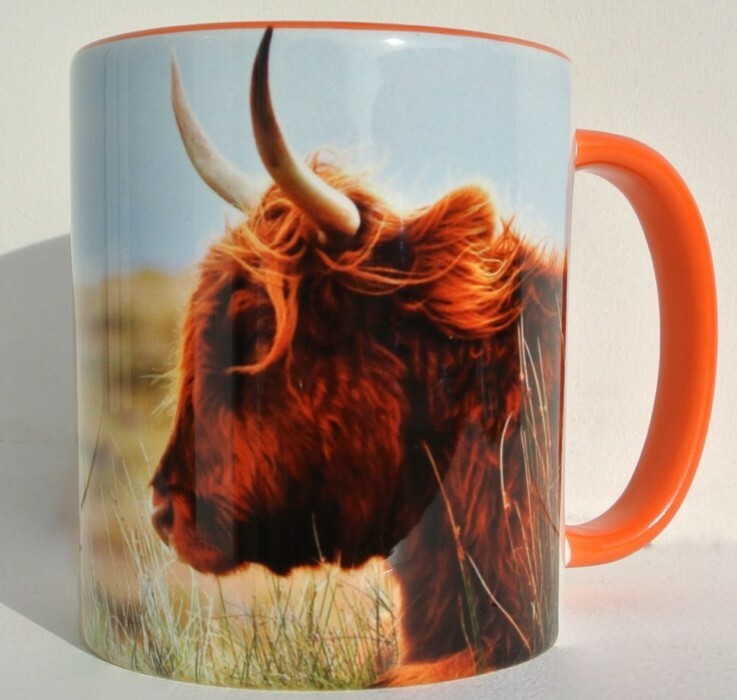 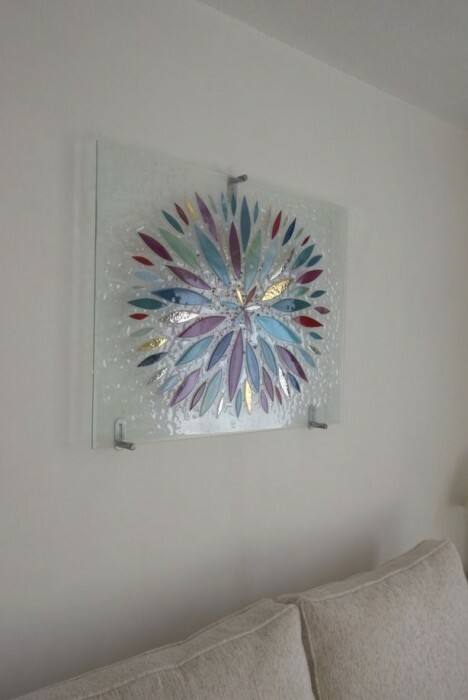 If you’re looking to get your hands on something just like this, or even if you’re after a design that’s completely different, then we’d absolutely love to hear from you. 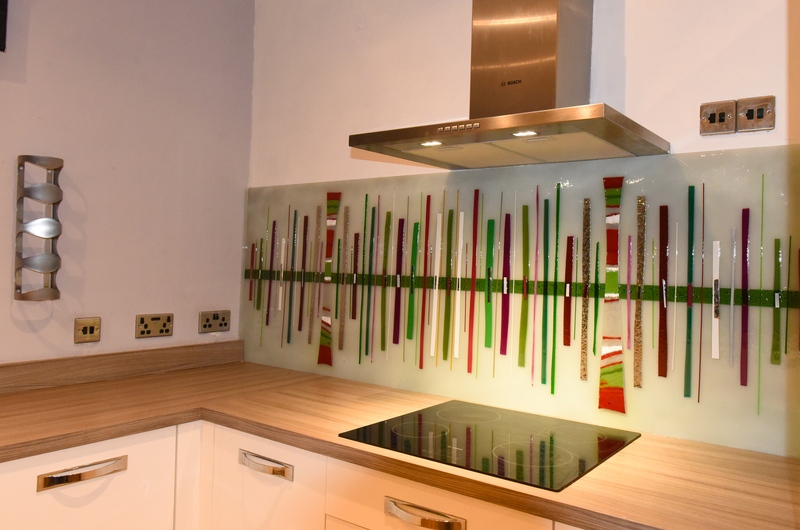 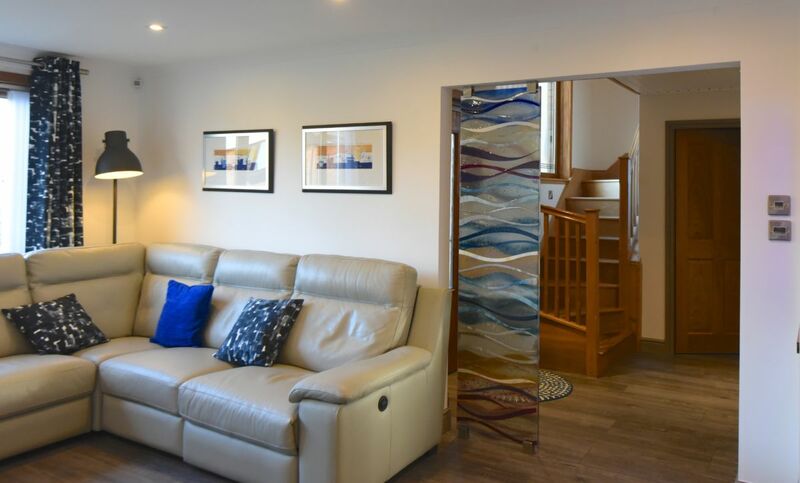 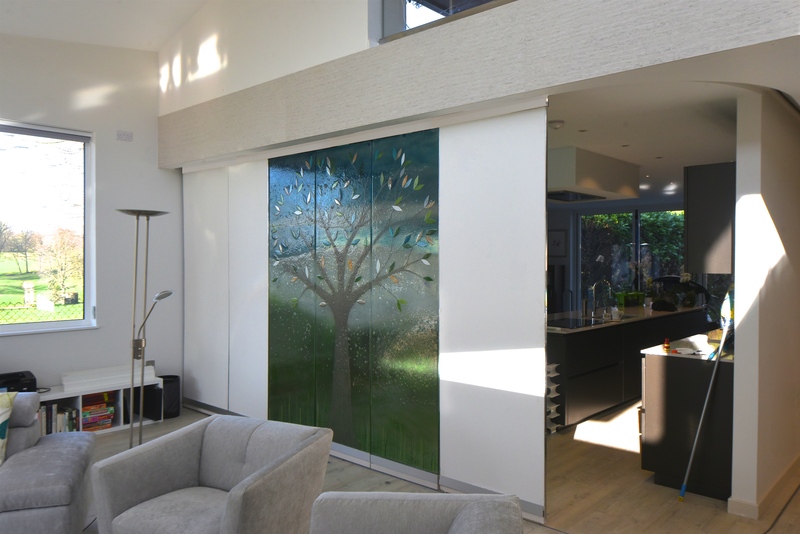 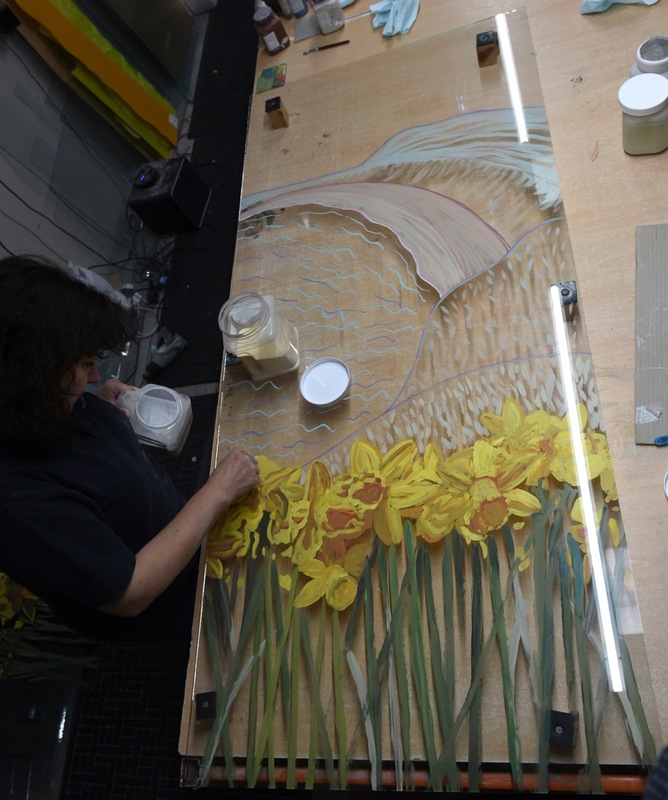 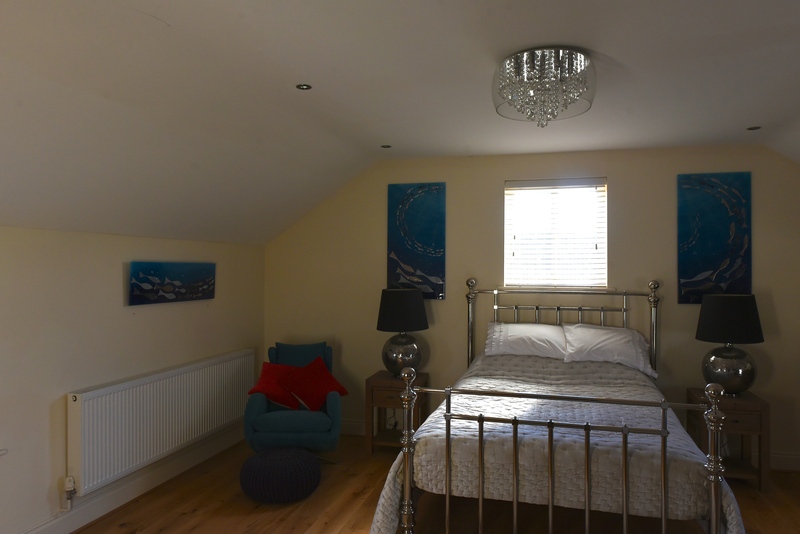 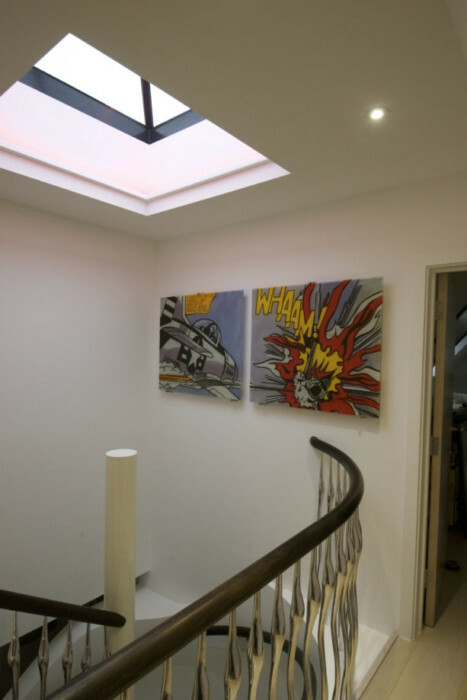 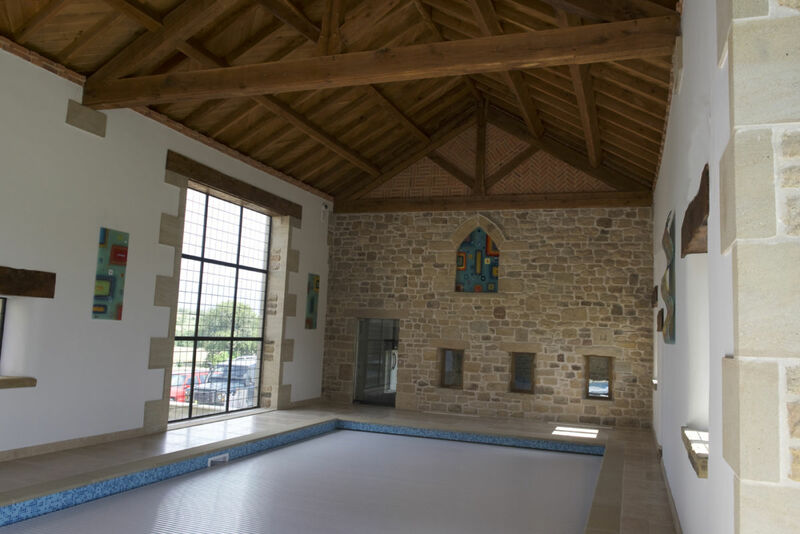 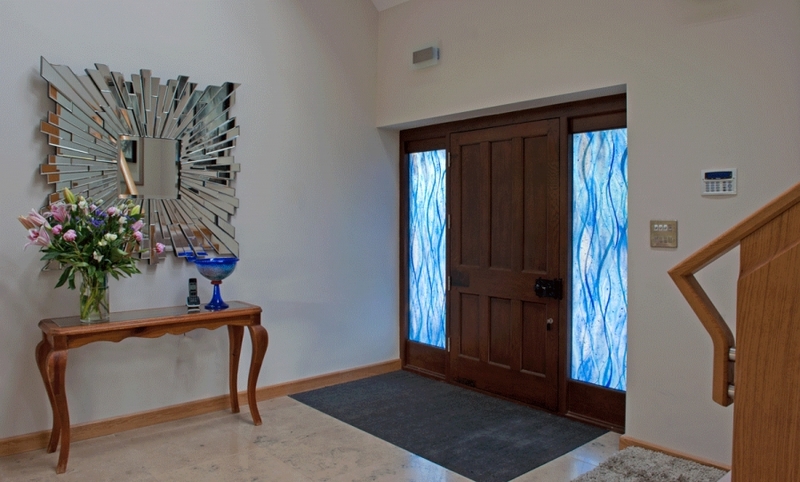 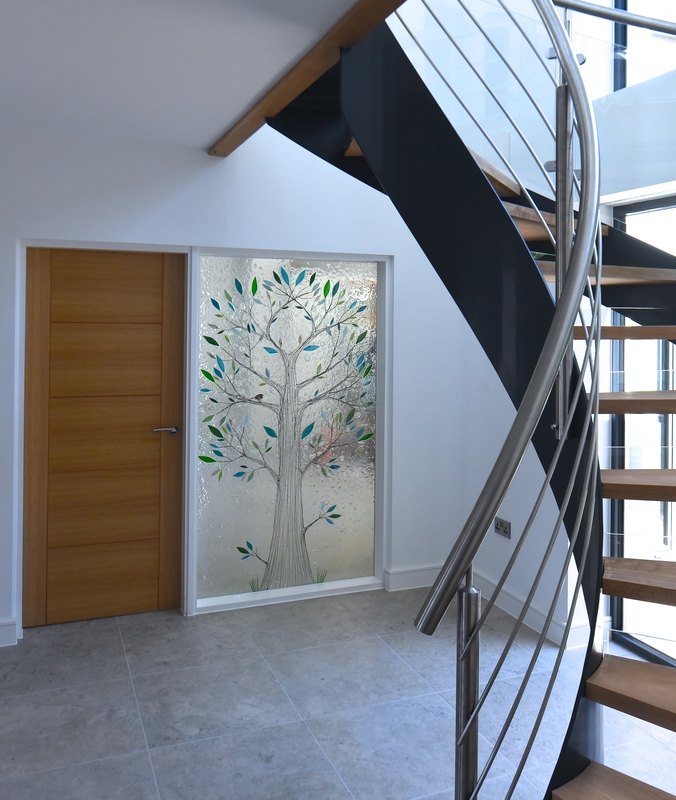 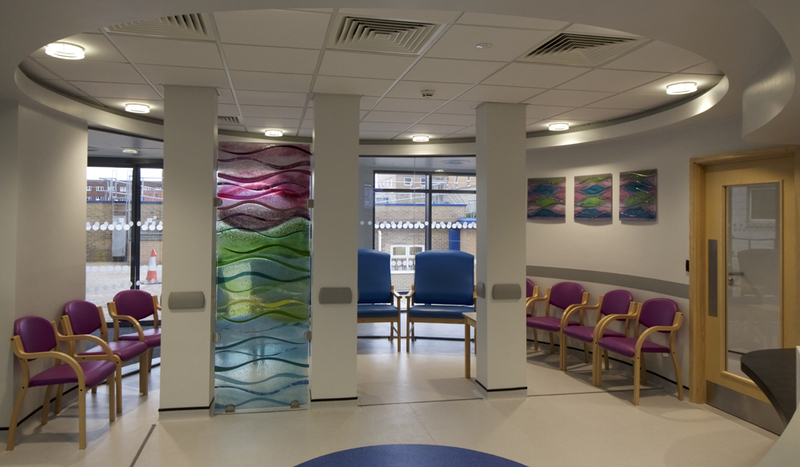 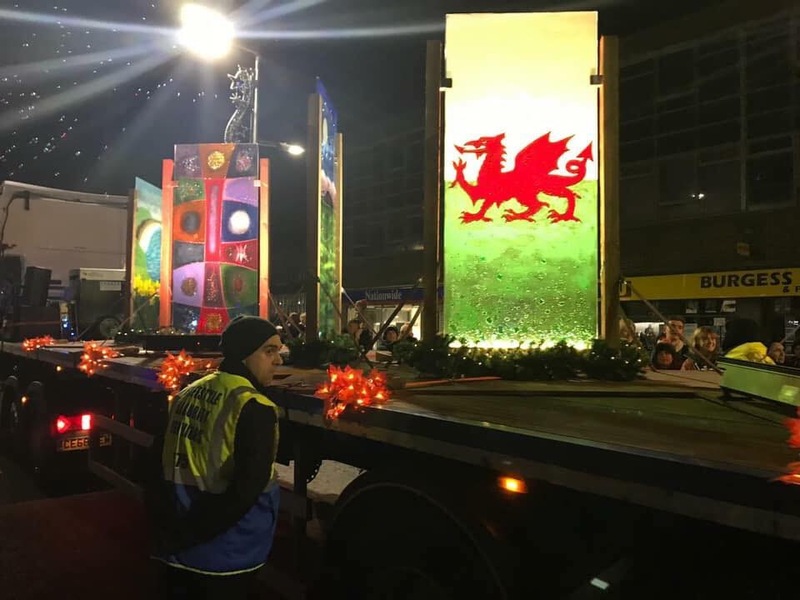 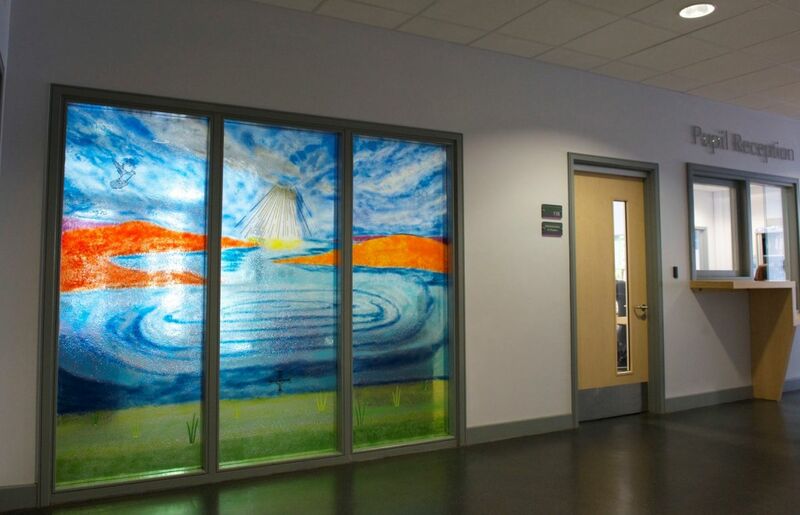 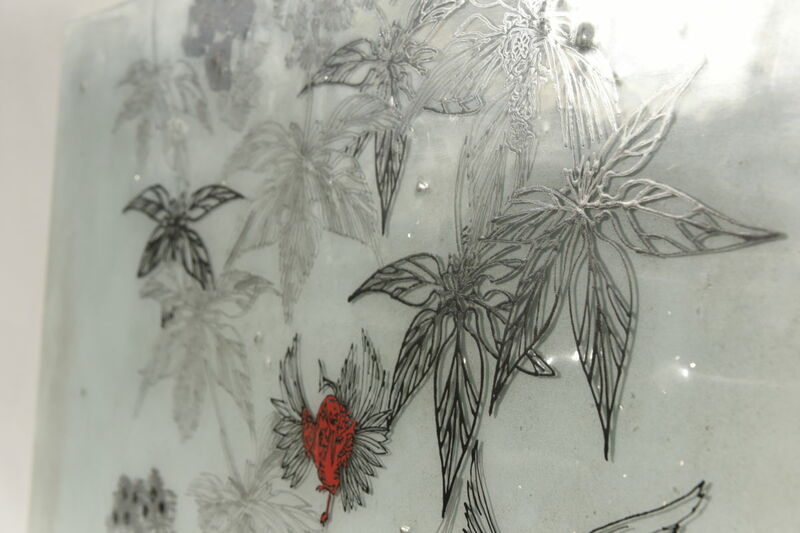 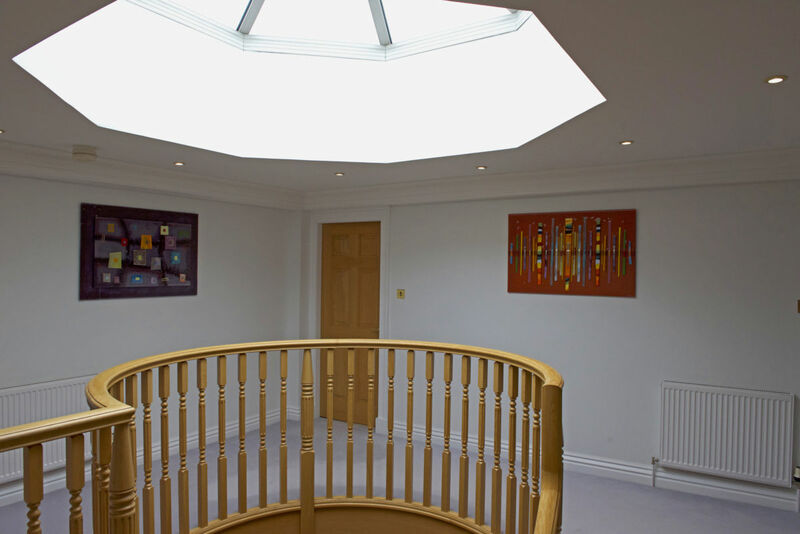 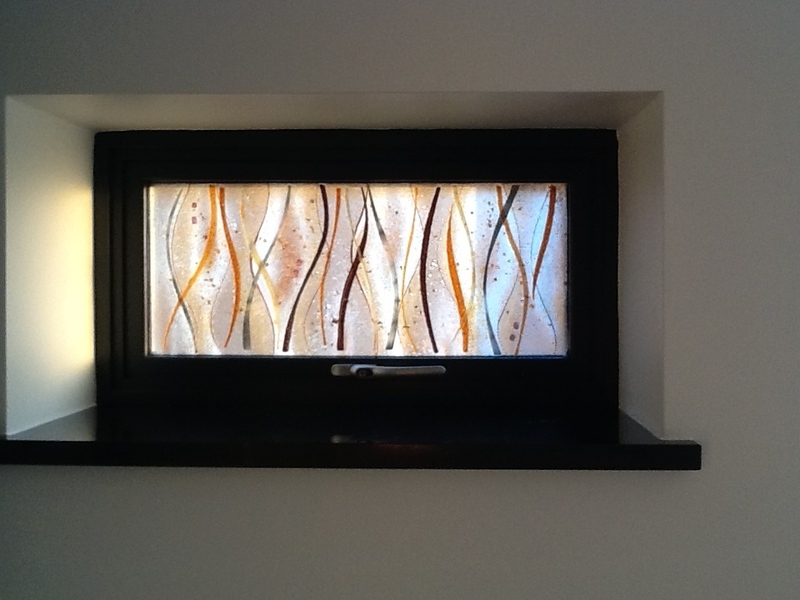 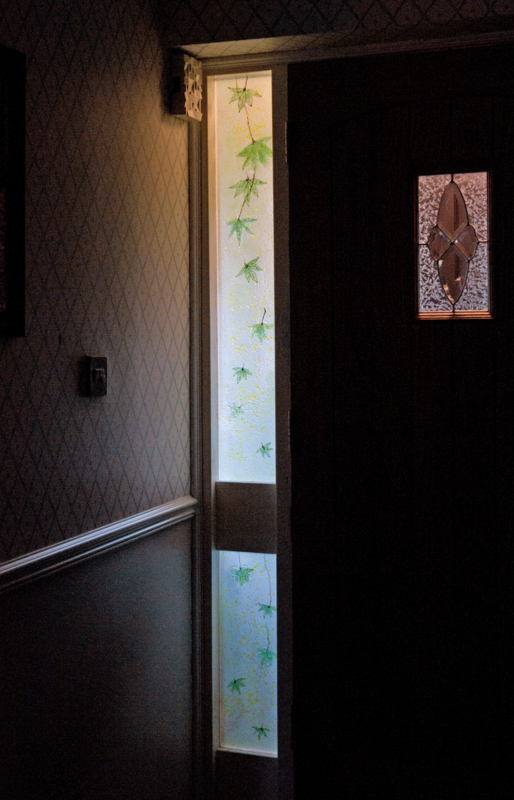 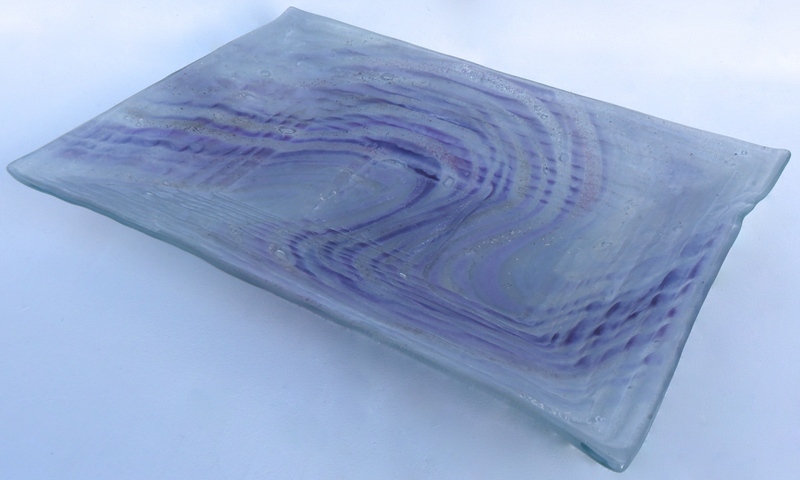 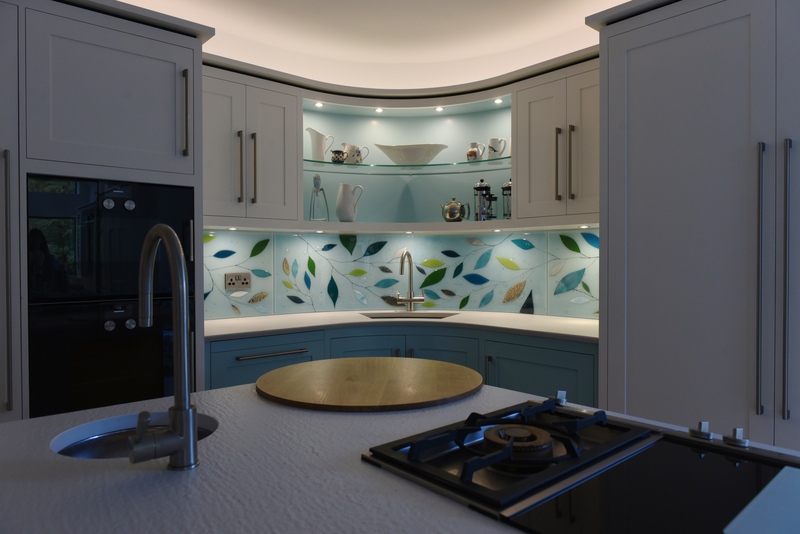 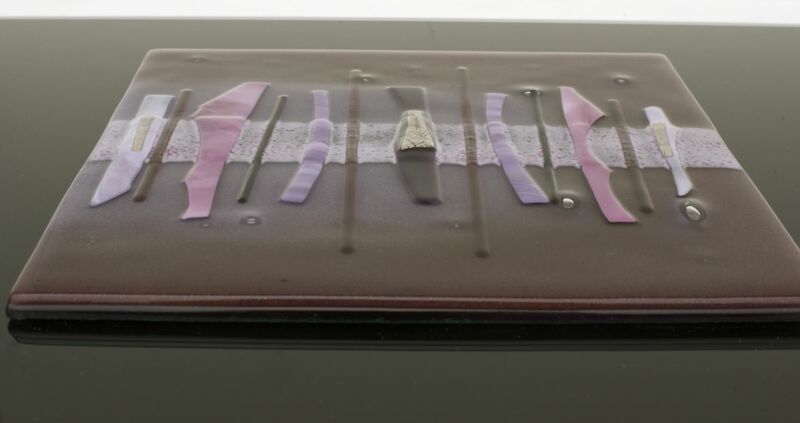 All of our glass pieces are made to match what you’re looking for, with fully bespoke design ensuring that the end result is a highly personalised panel that perfectly matches the space you want to put it in. 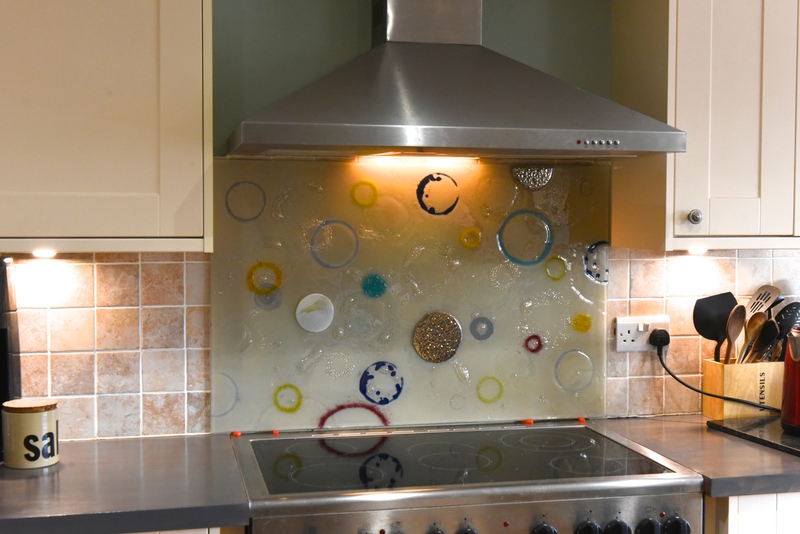 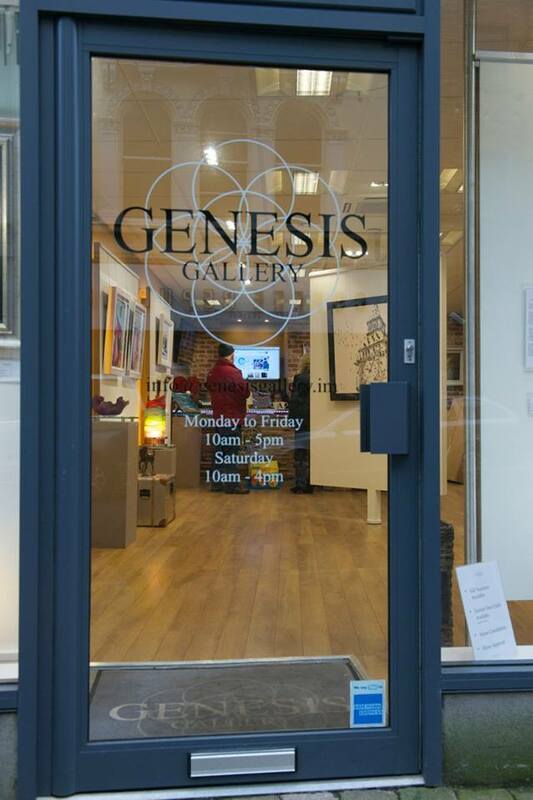 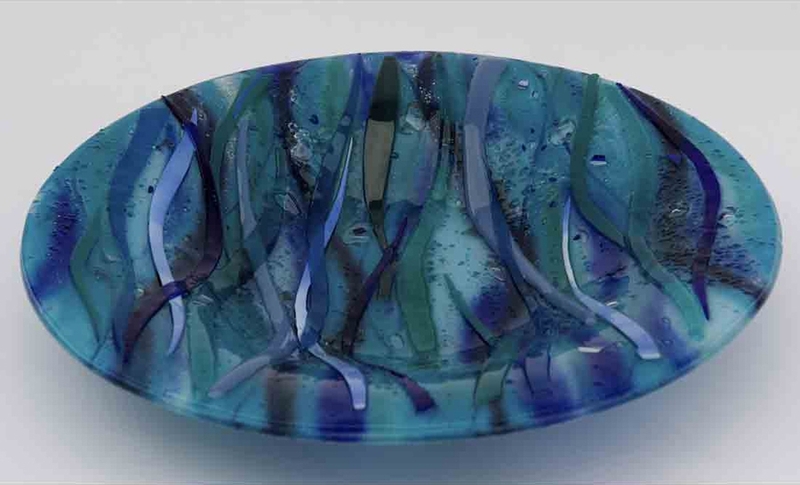 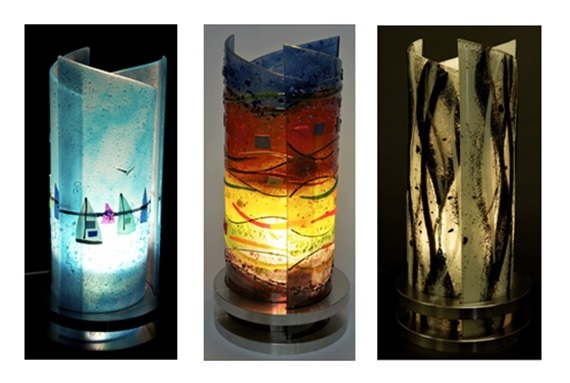 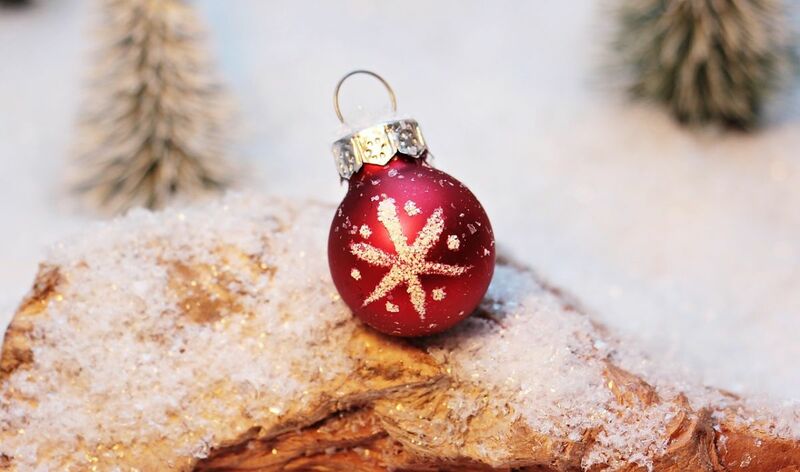 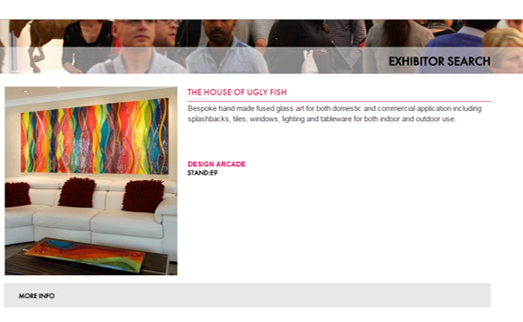 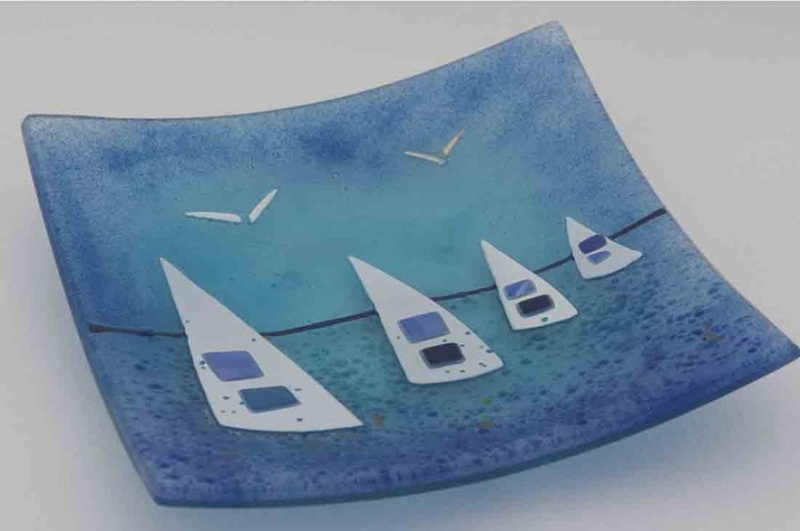 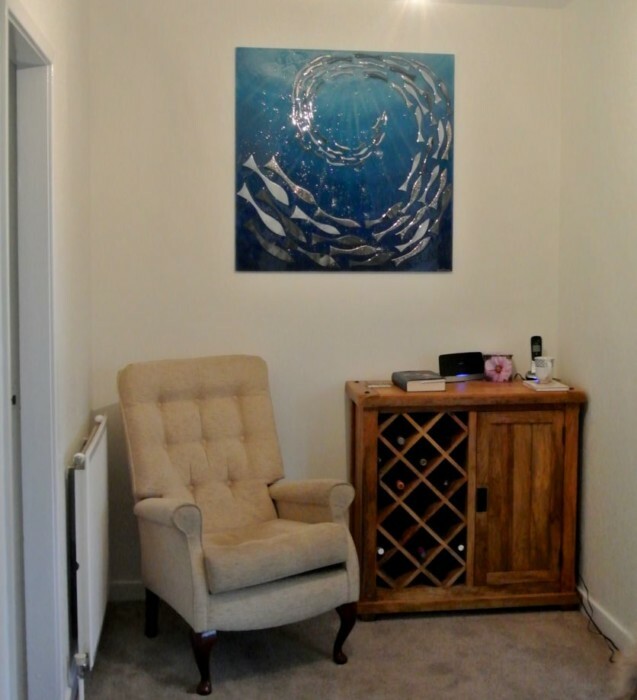 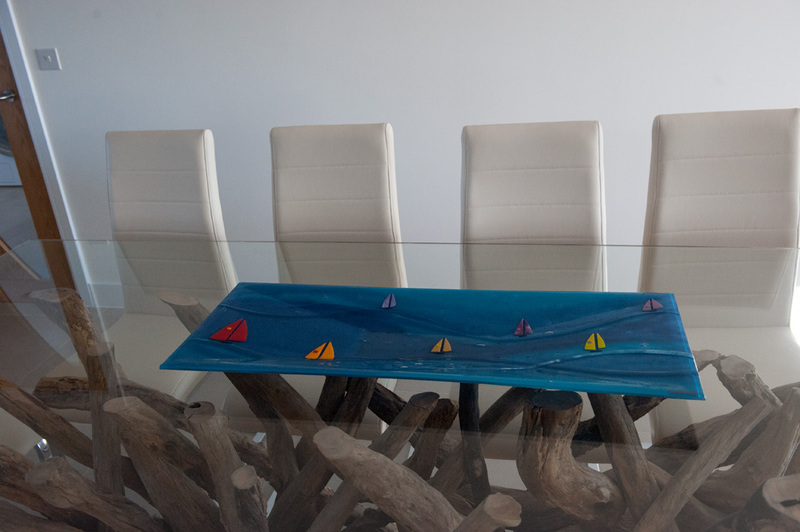 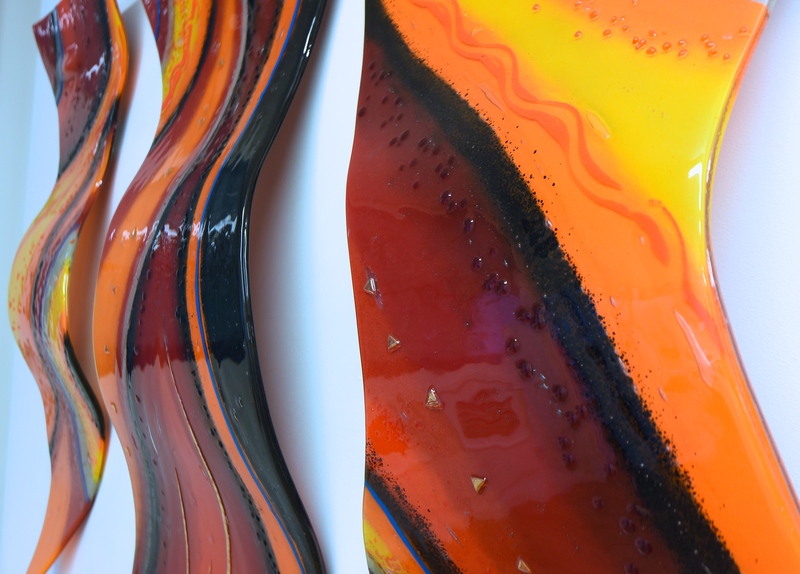 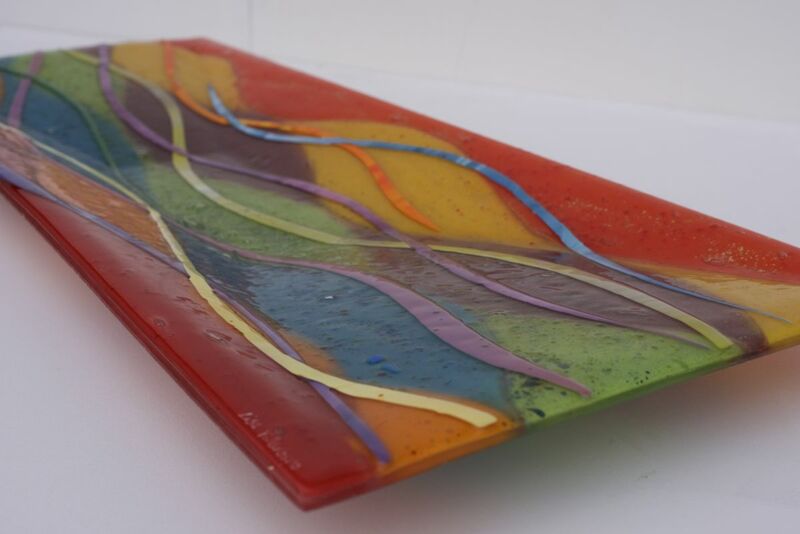 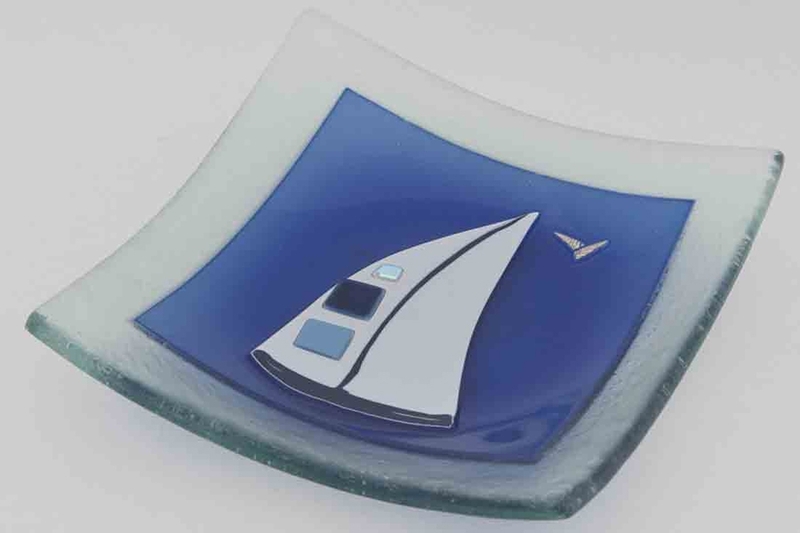 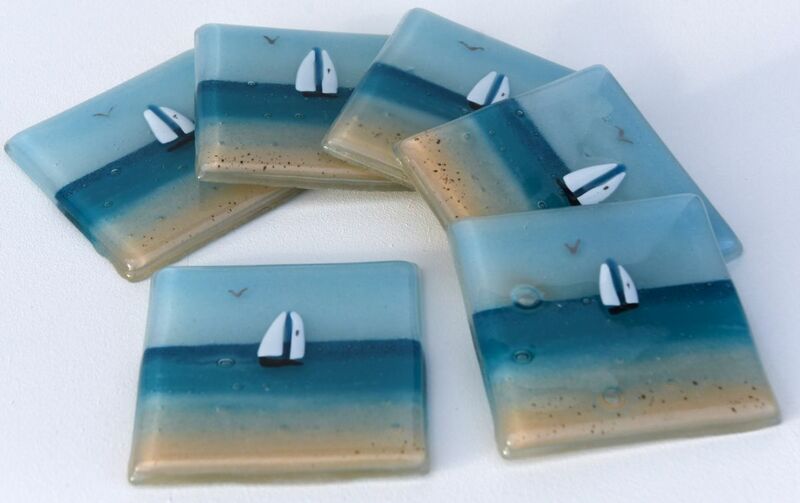 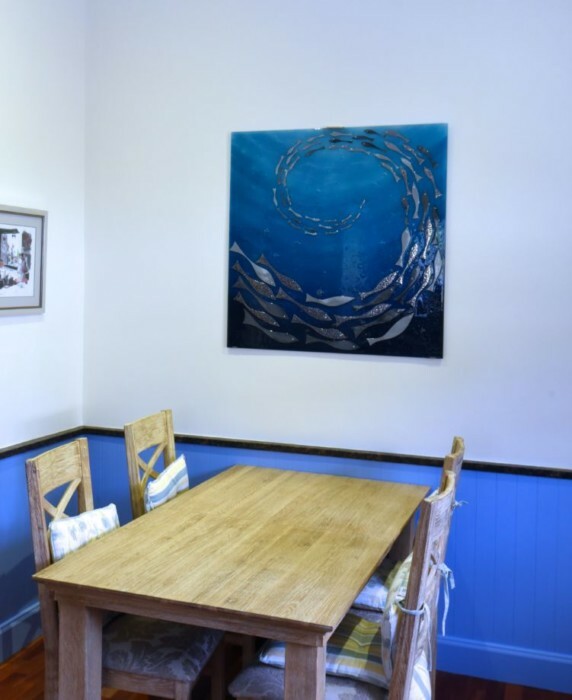 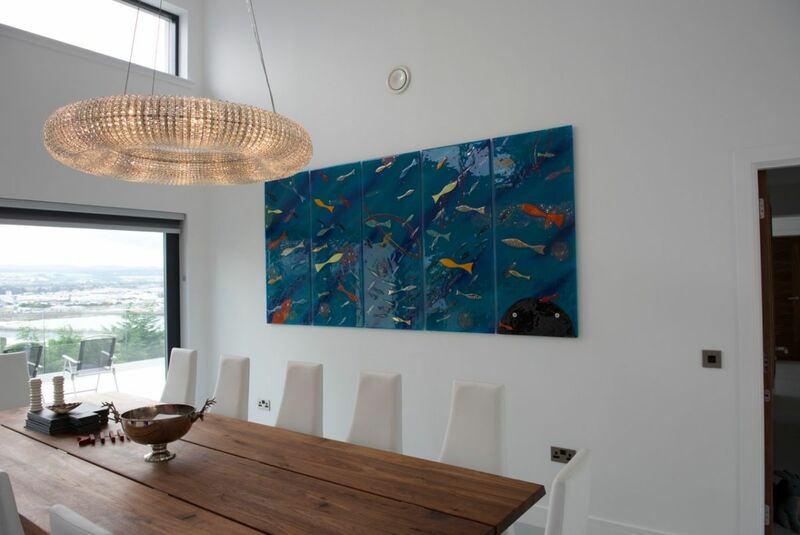 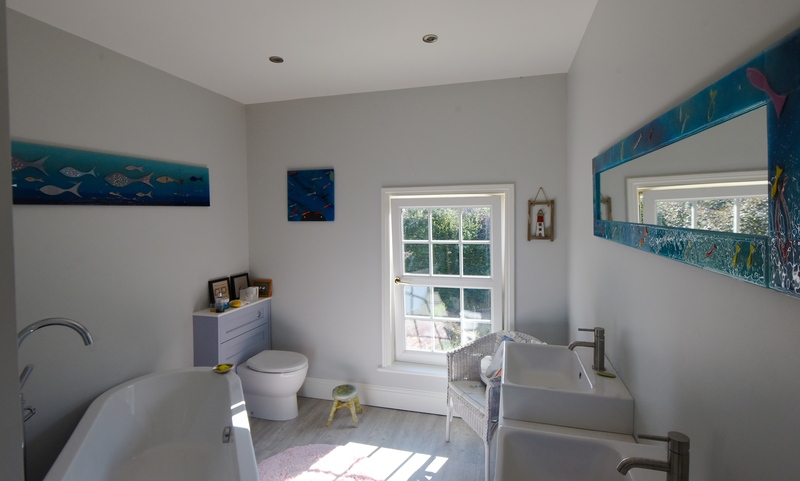 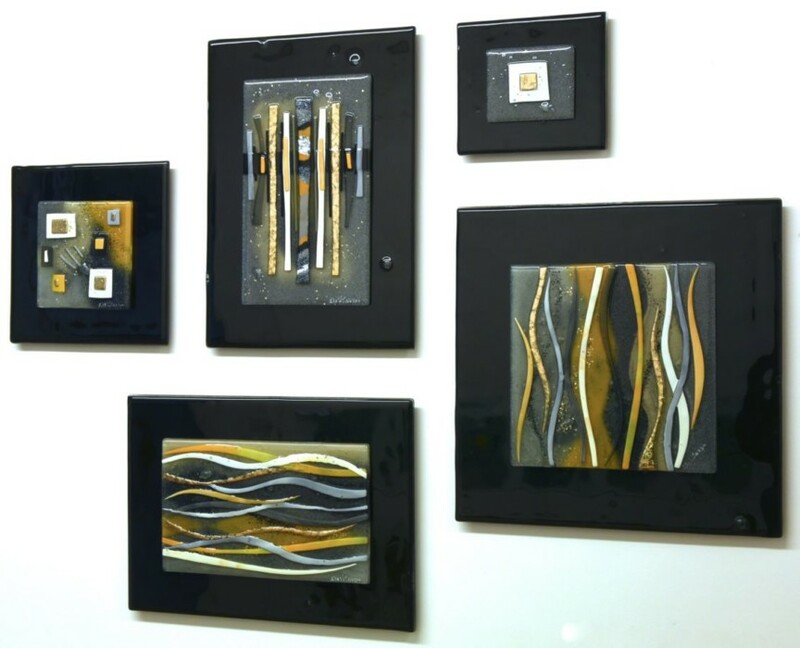 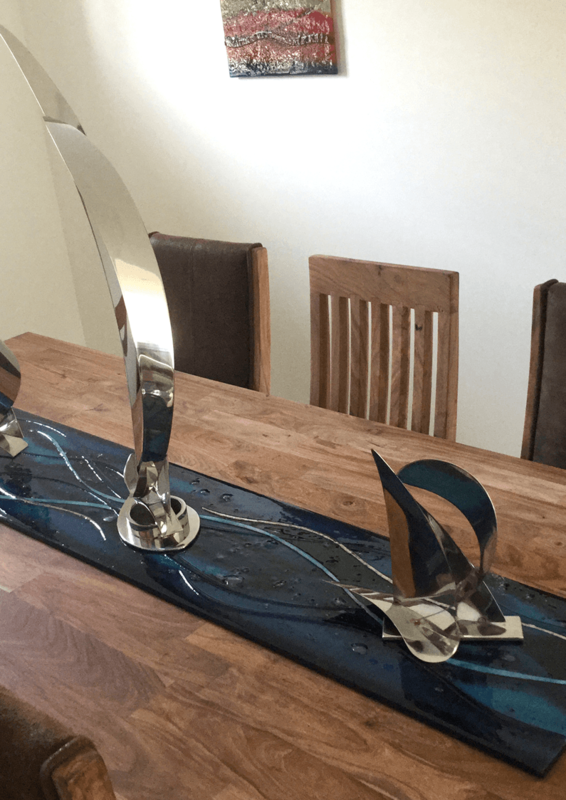 The House of Ugly Fish specialises in incredible works of fused glass art that are bespoke, hand crafted and delicately designed to match your vision of the perfect piece of glass. 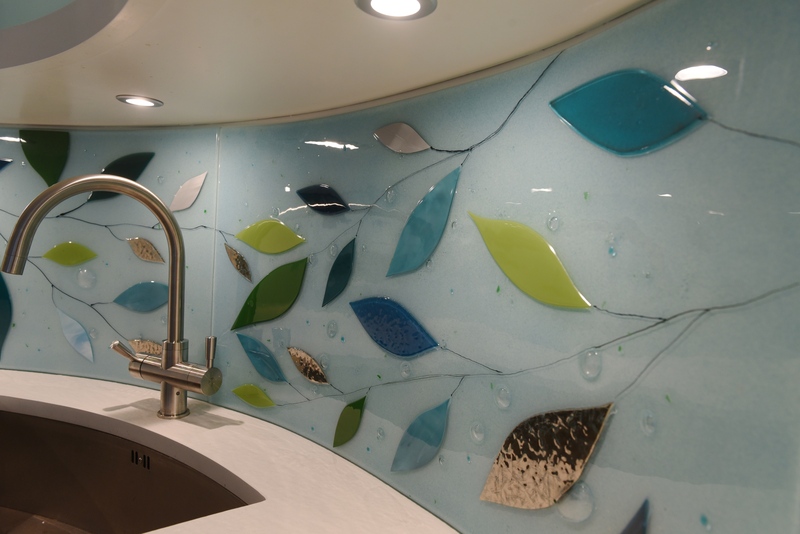 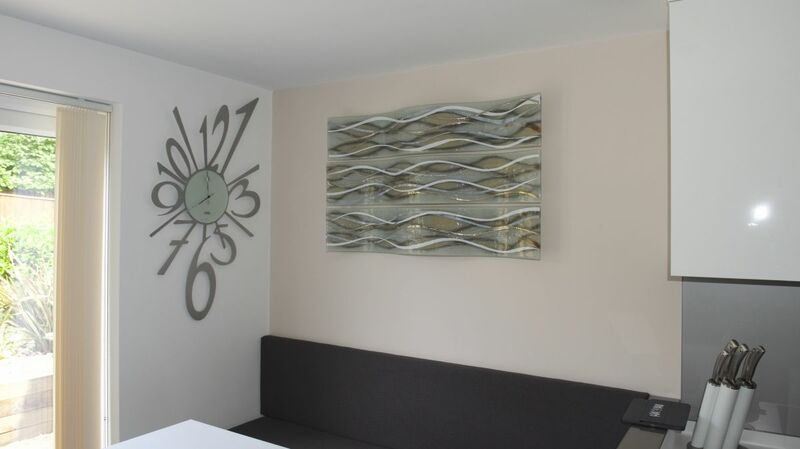 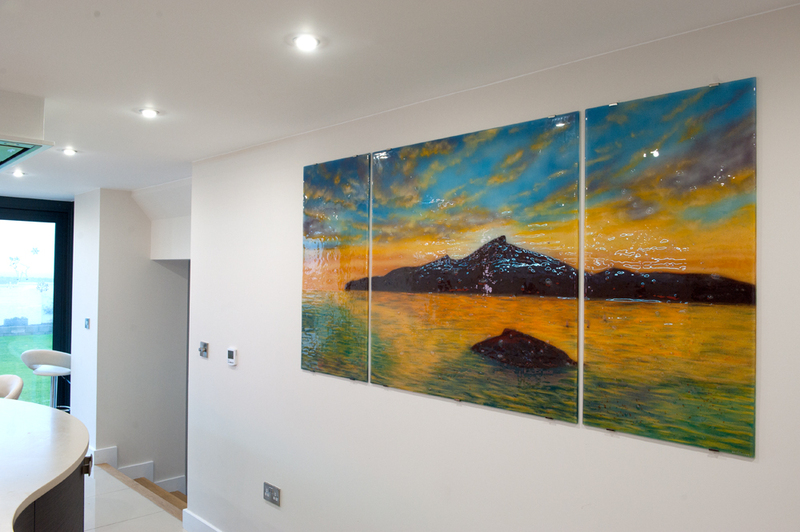 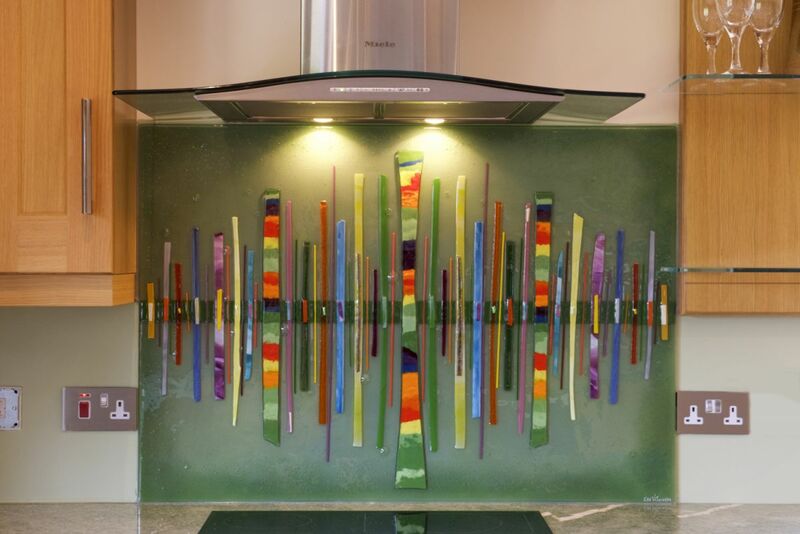 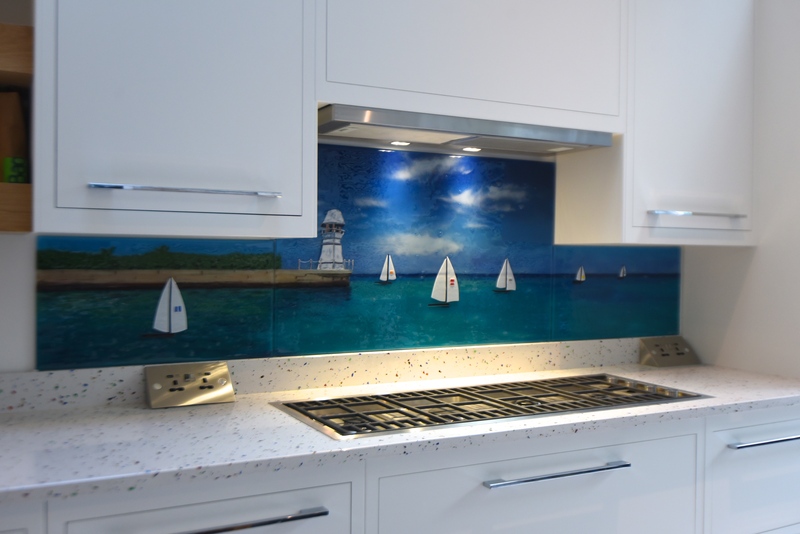 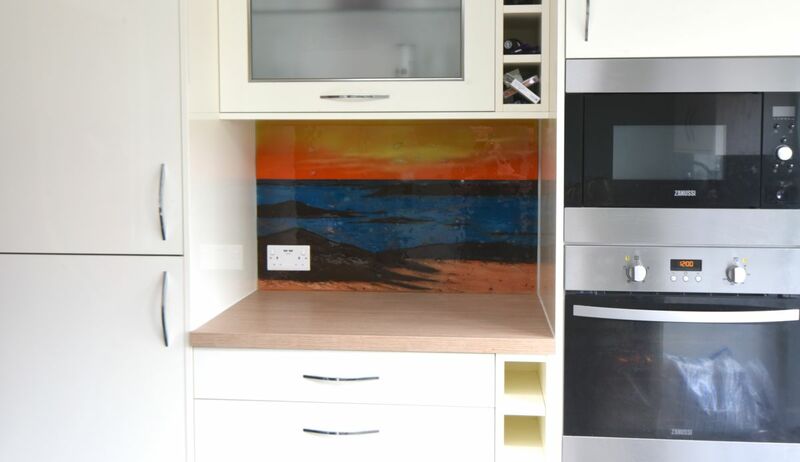 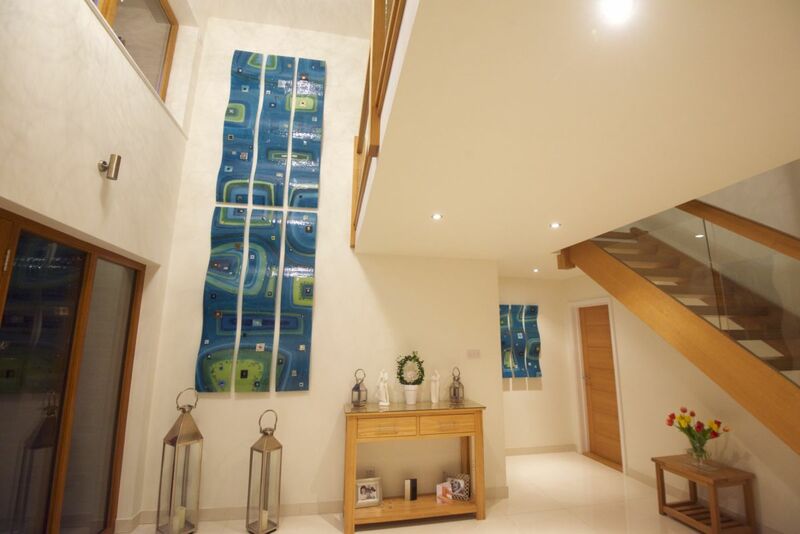 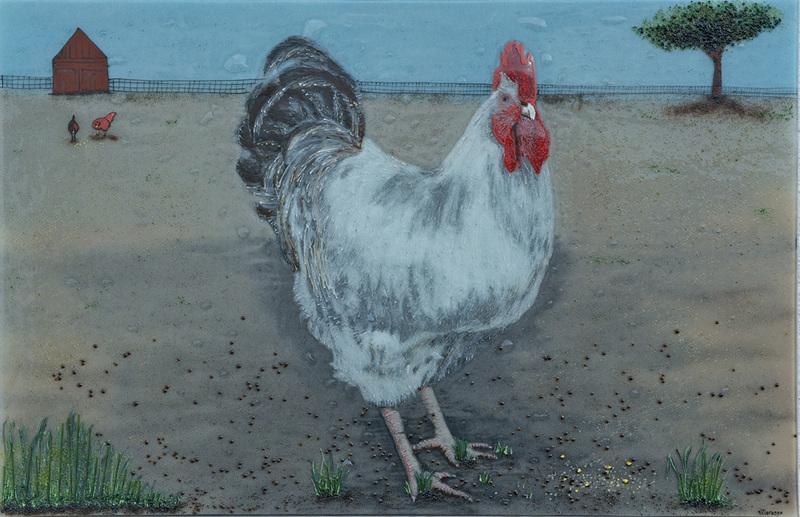 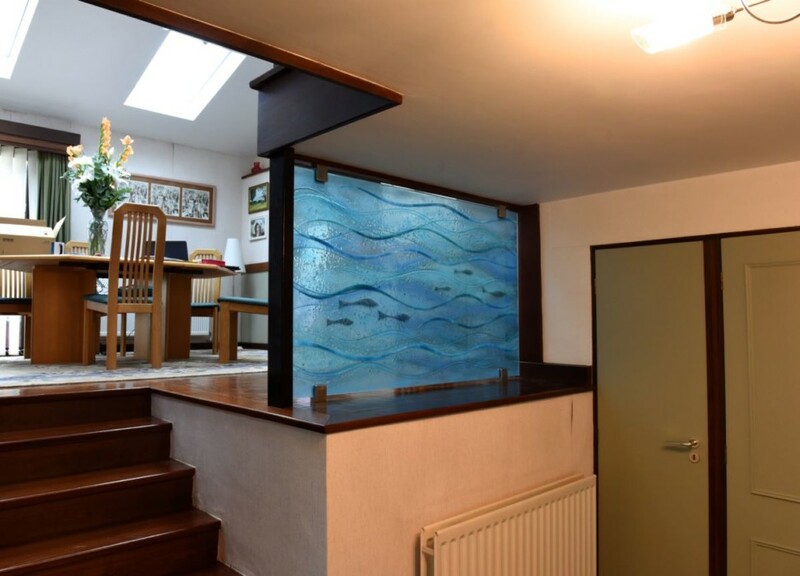 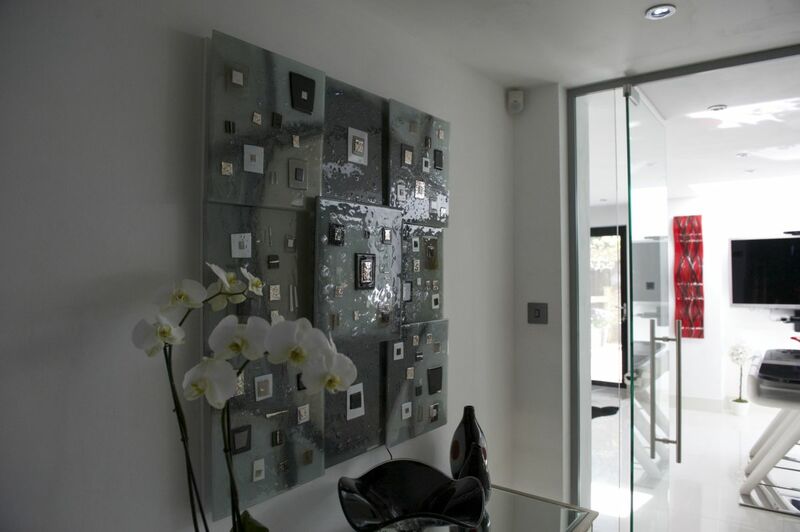 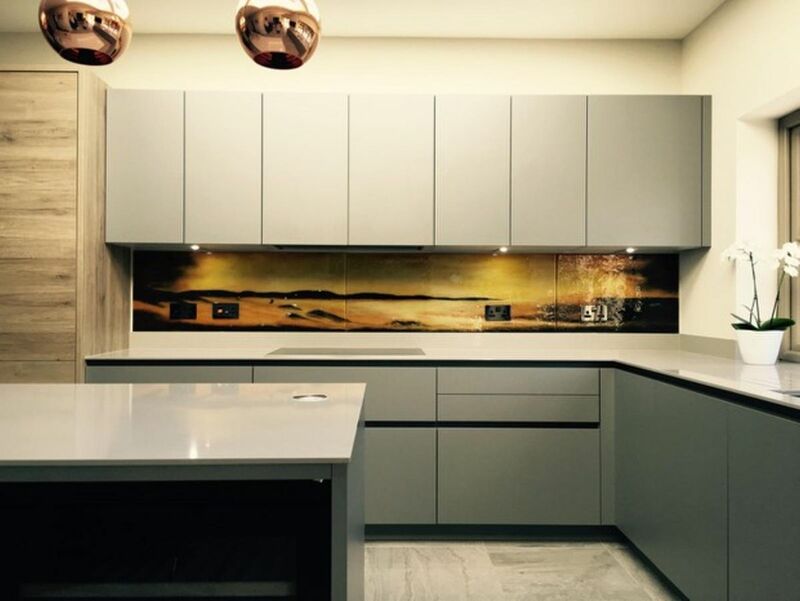 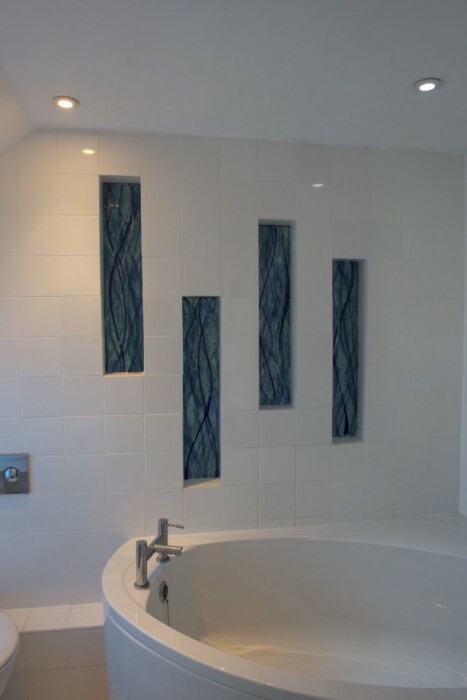 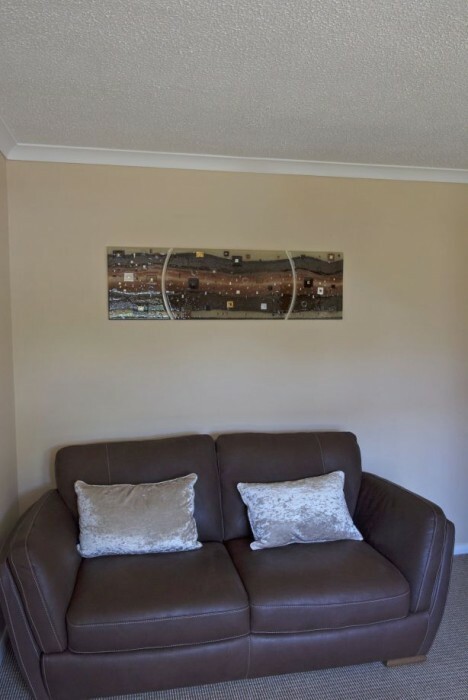 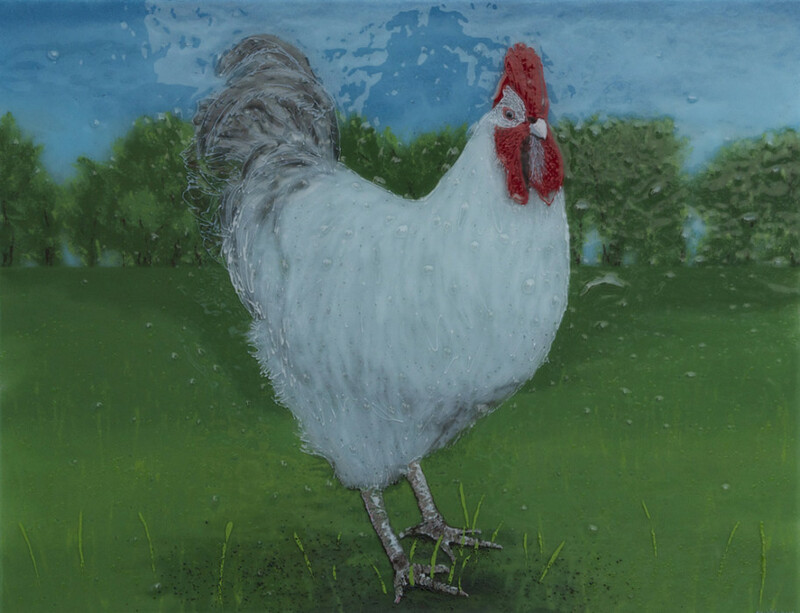 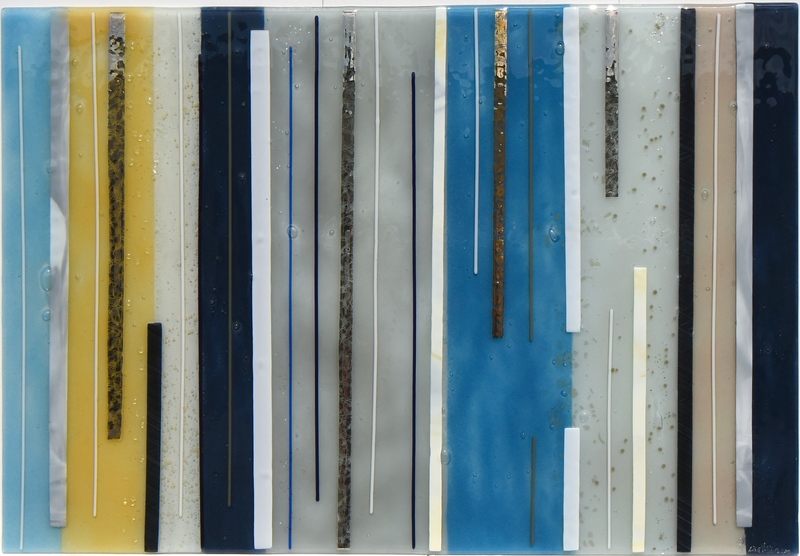 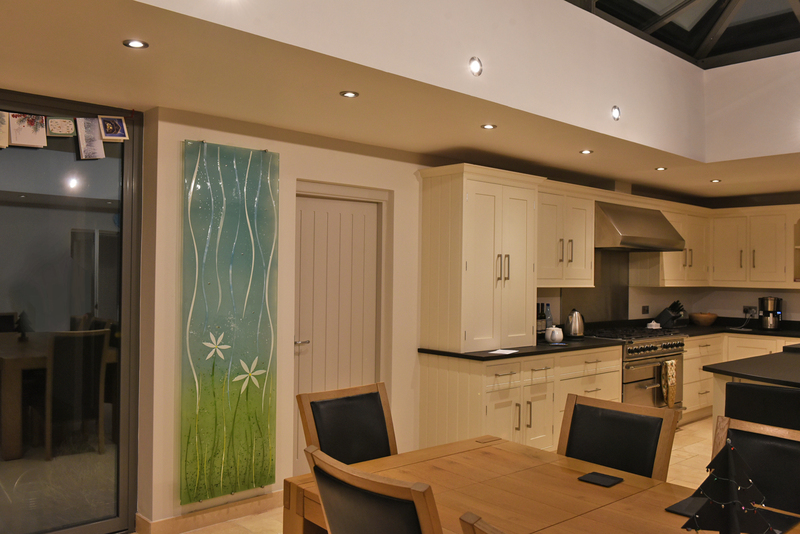 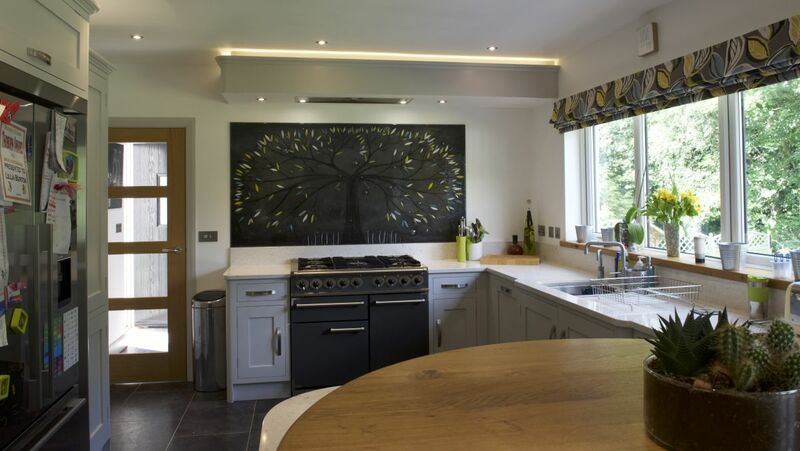 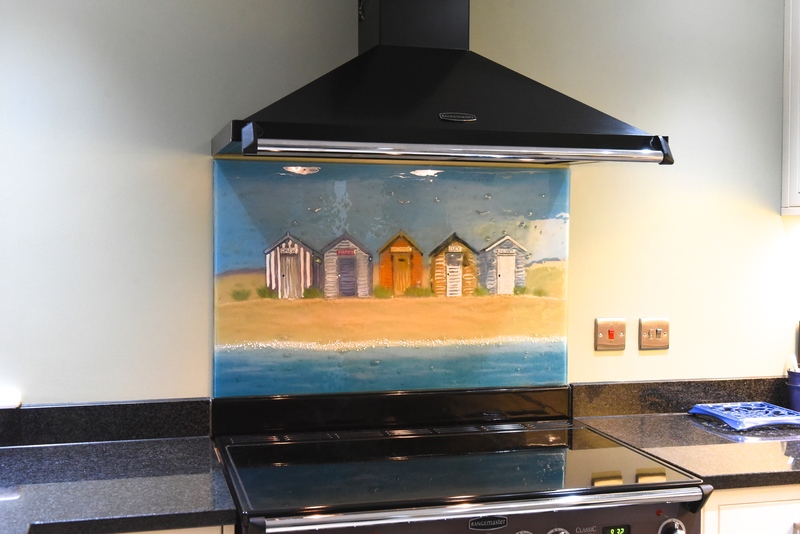 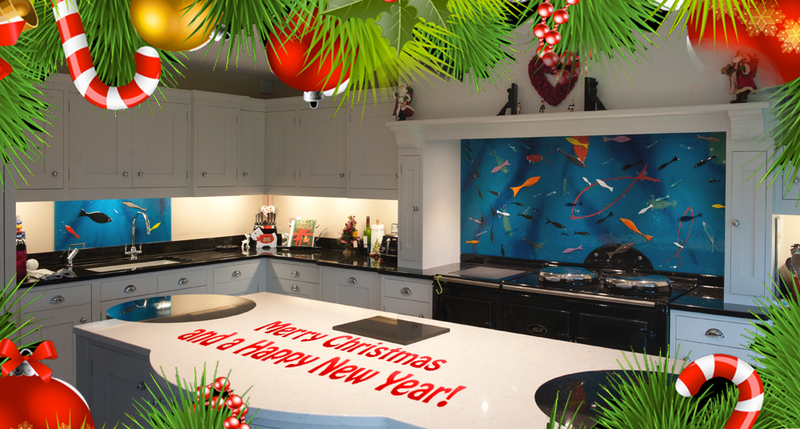 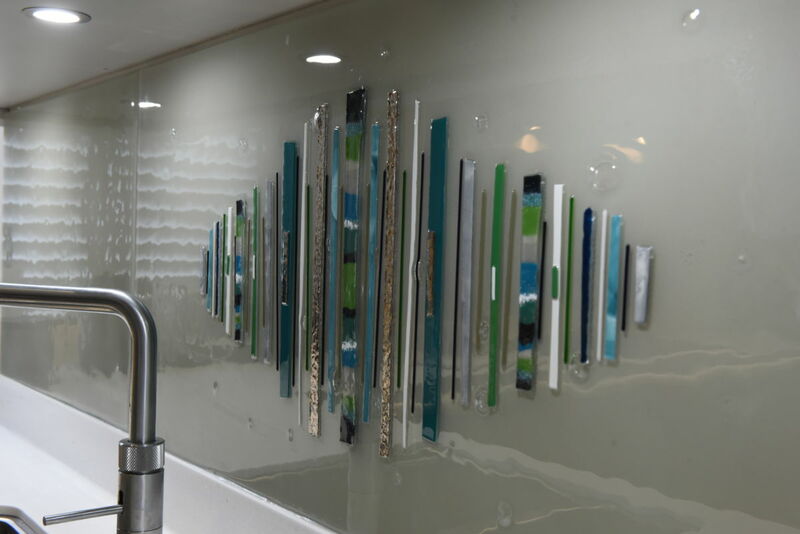 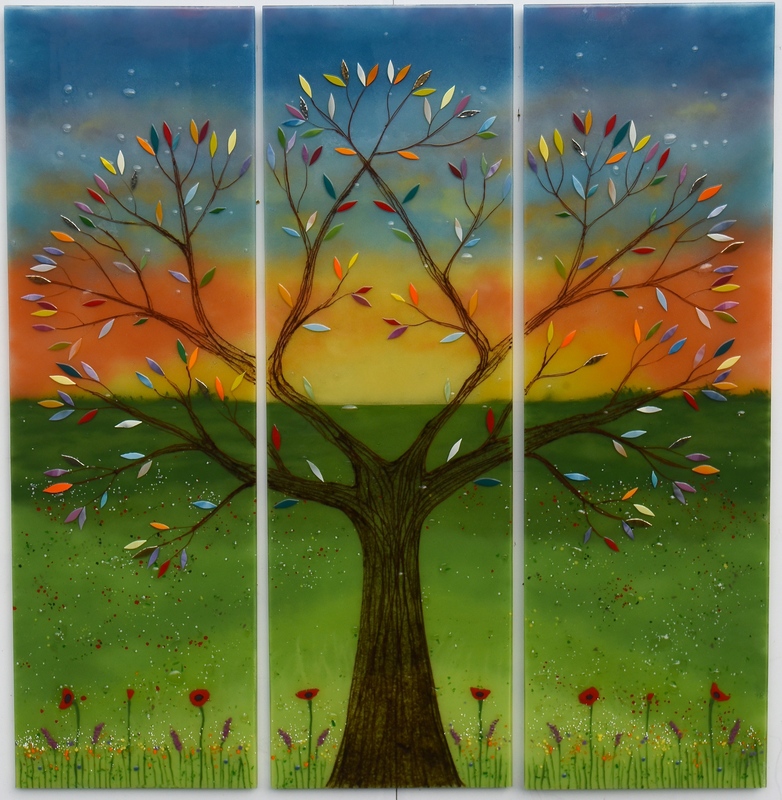 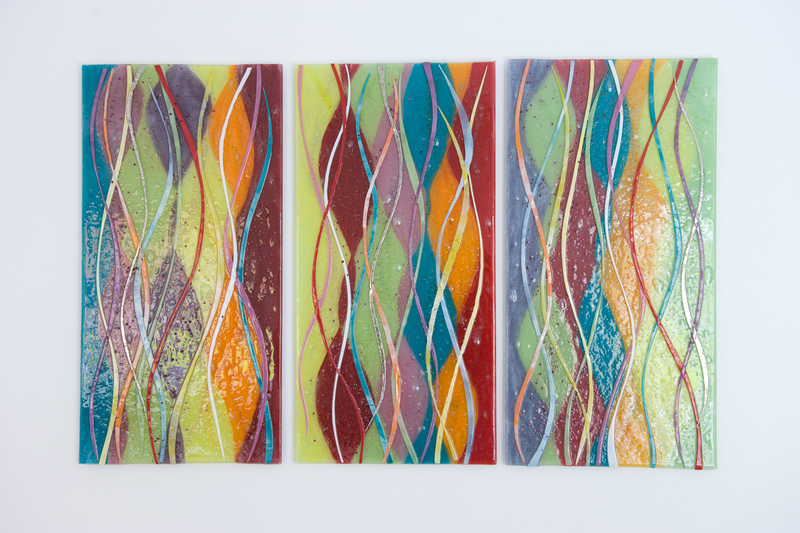 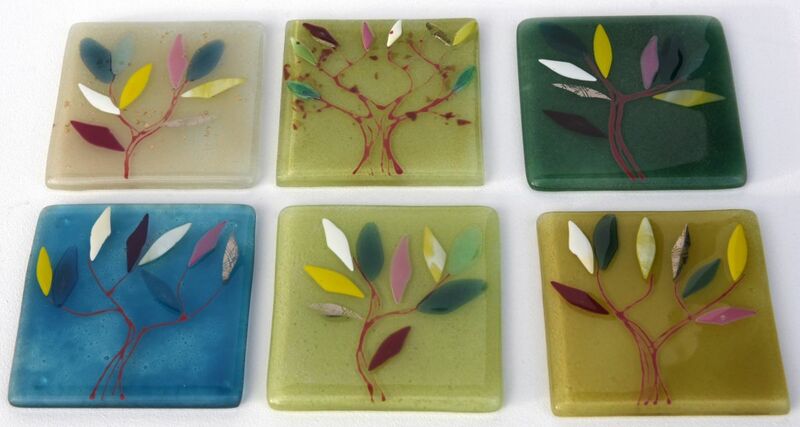 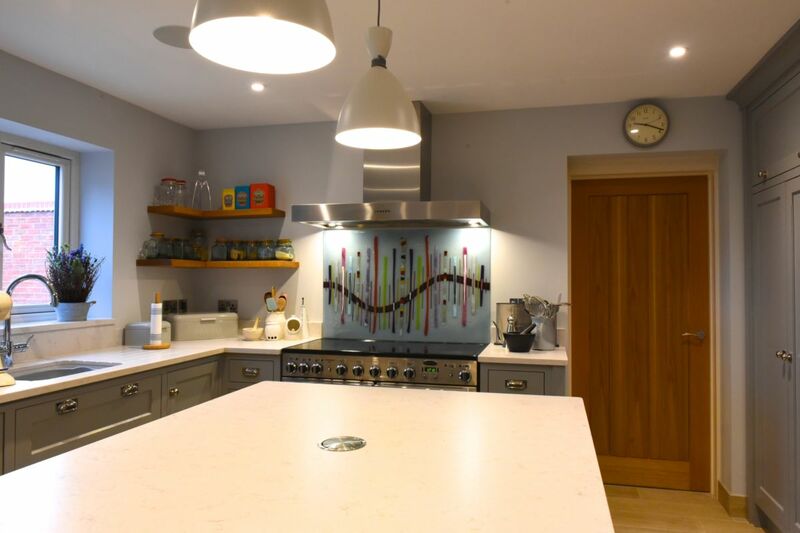 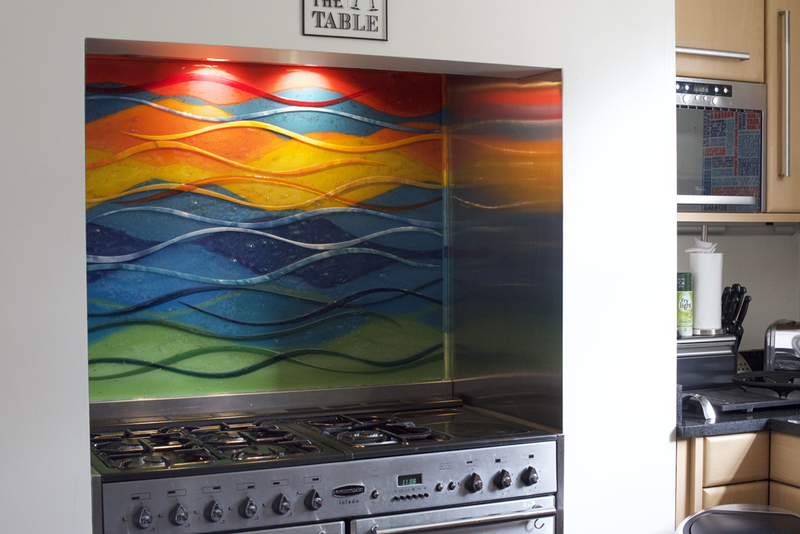 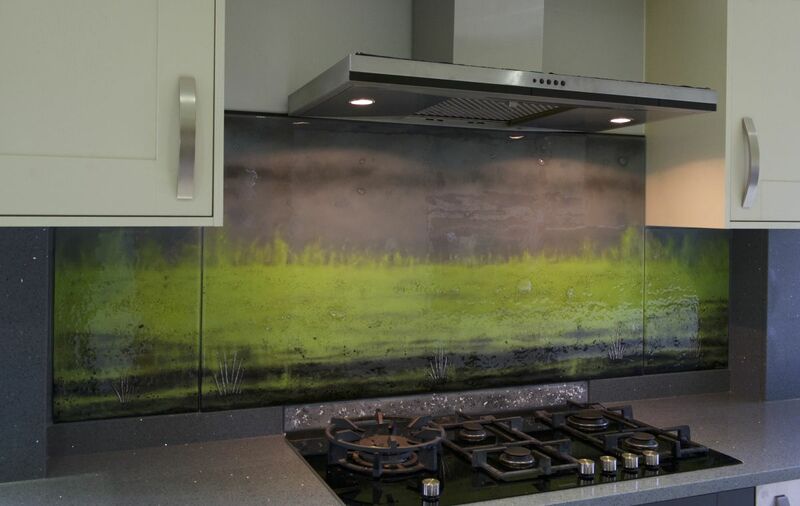 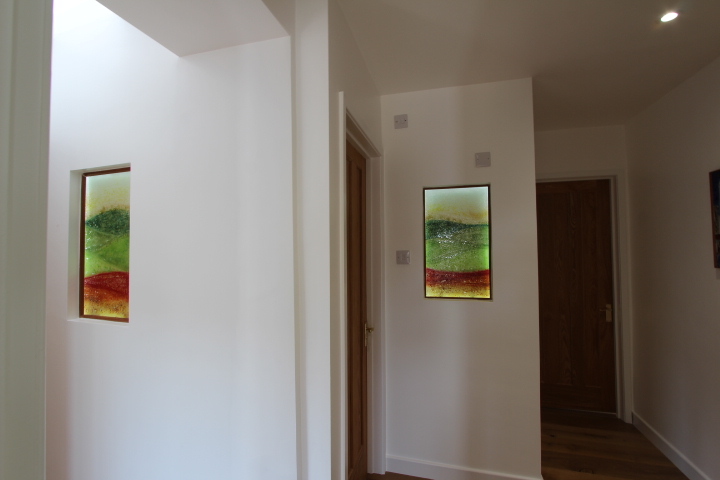 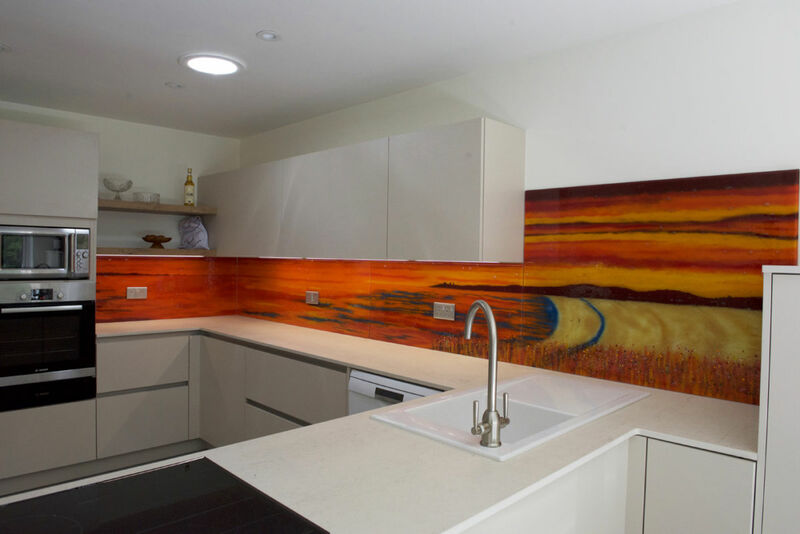 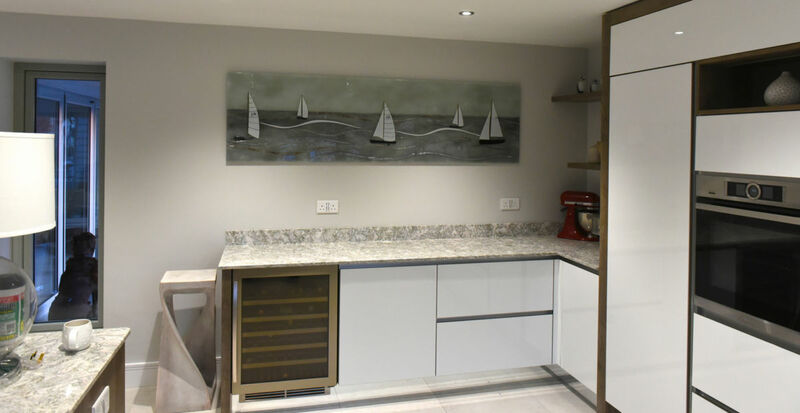 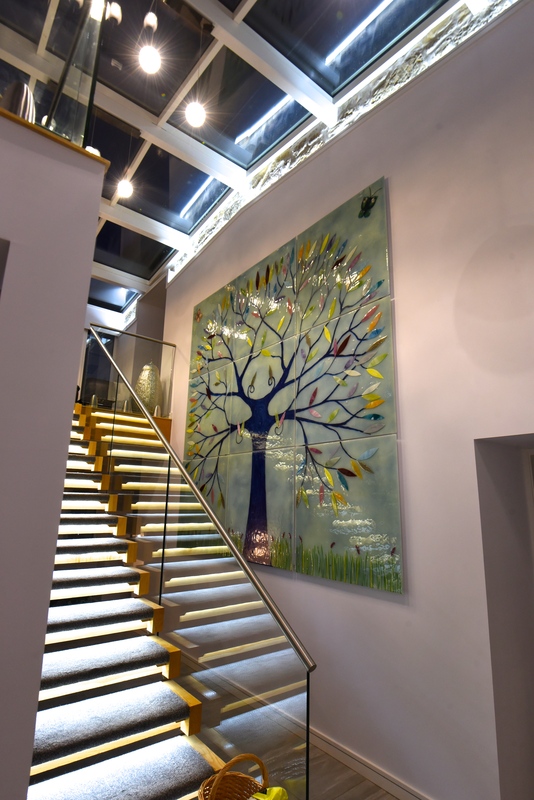 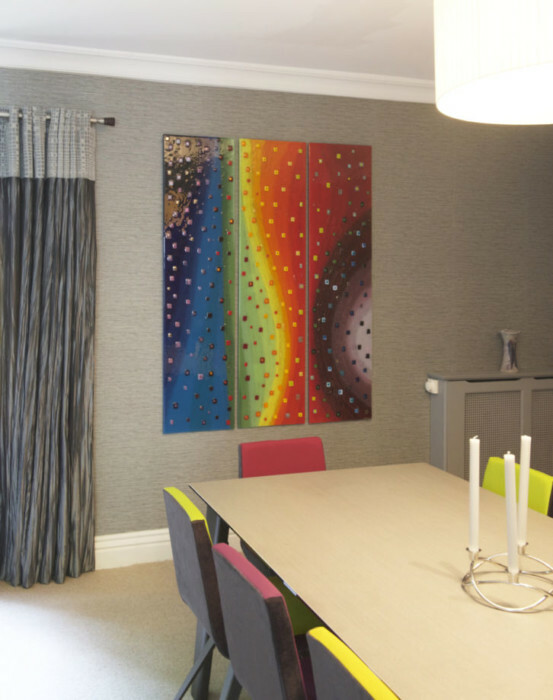 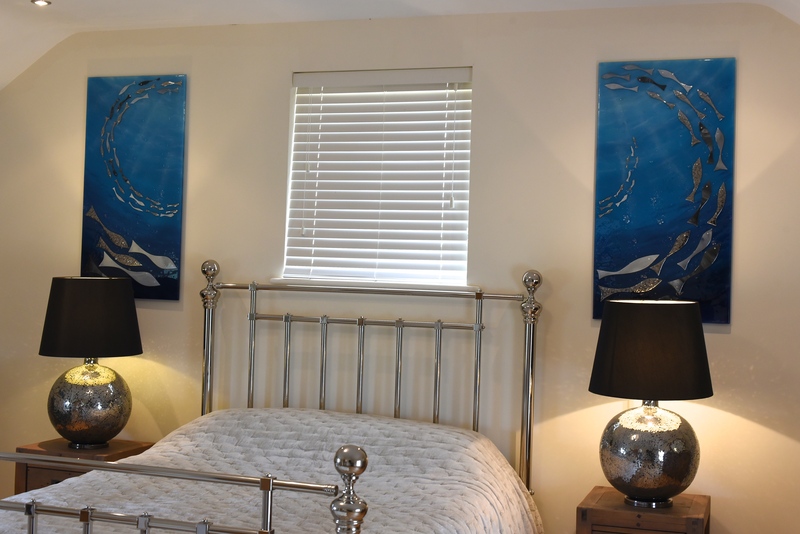 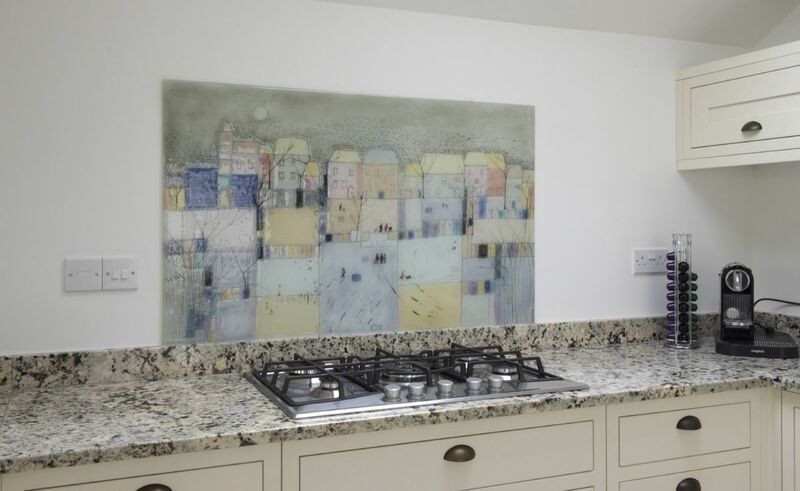 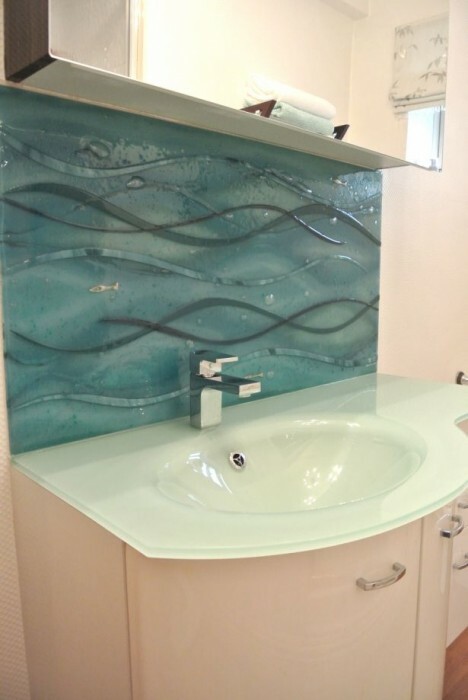 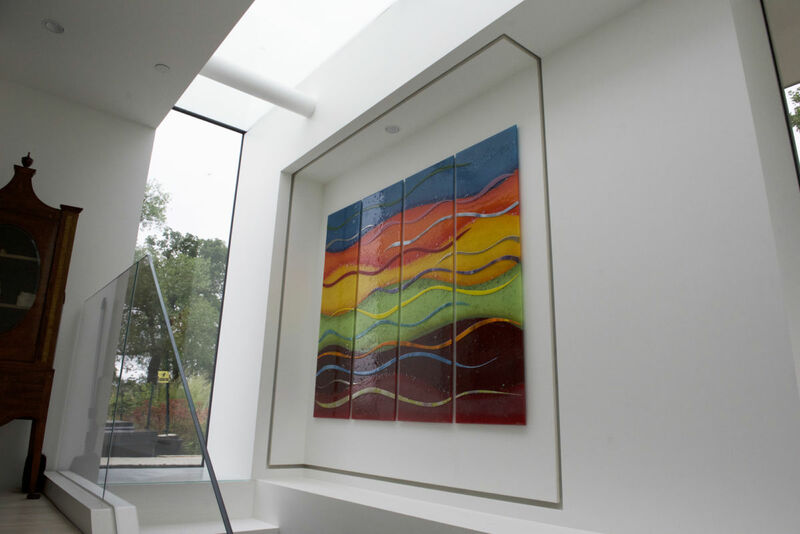 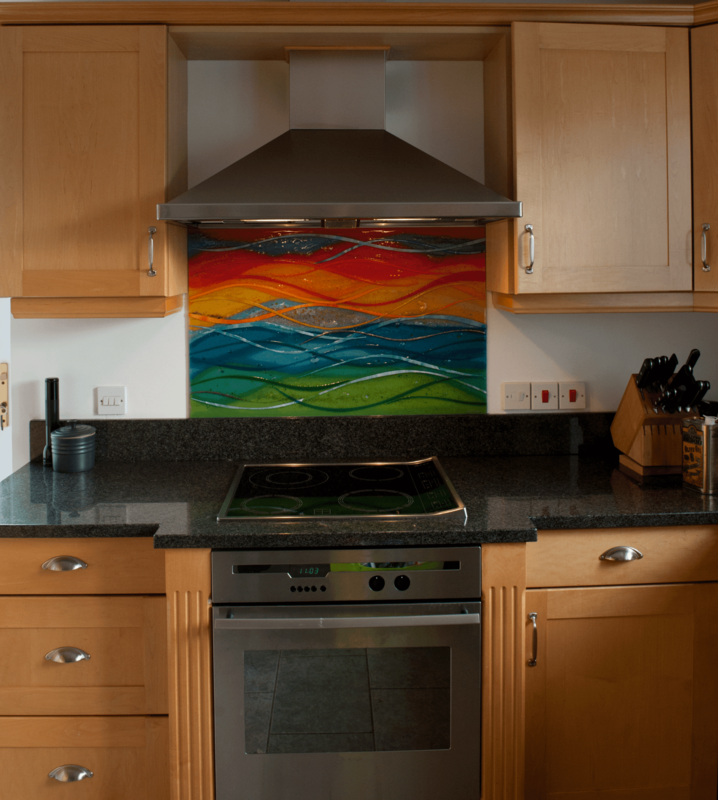 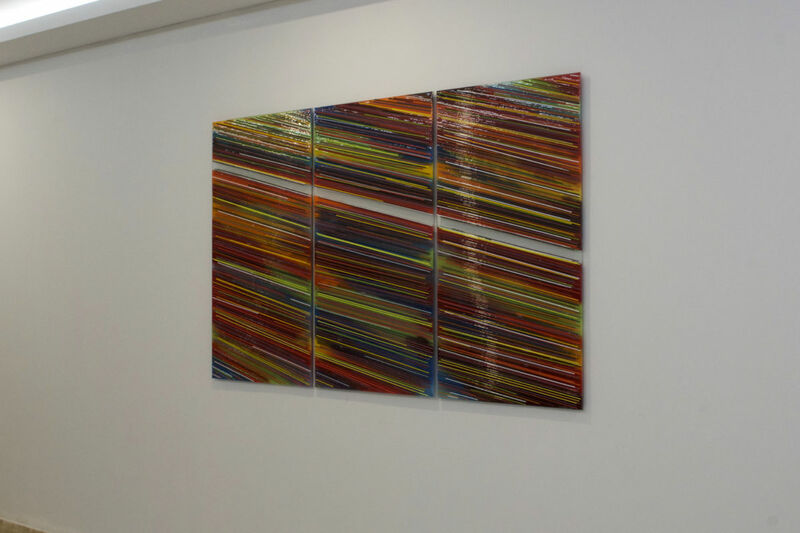 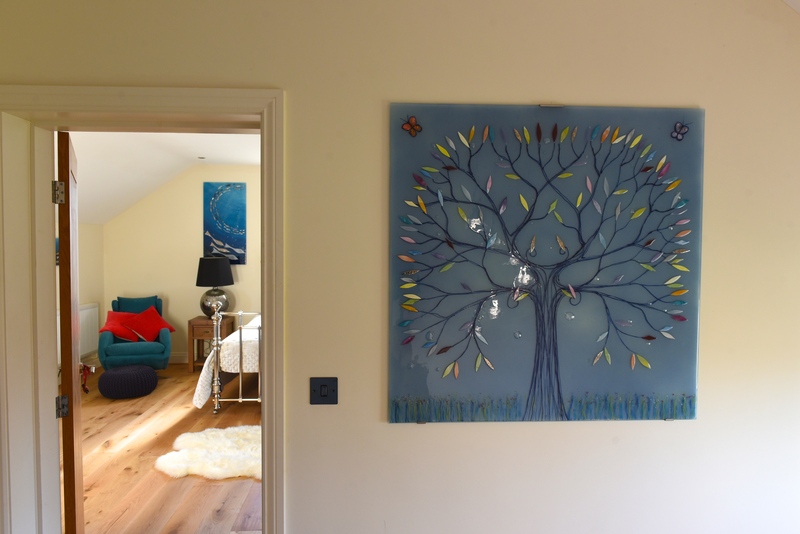 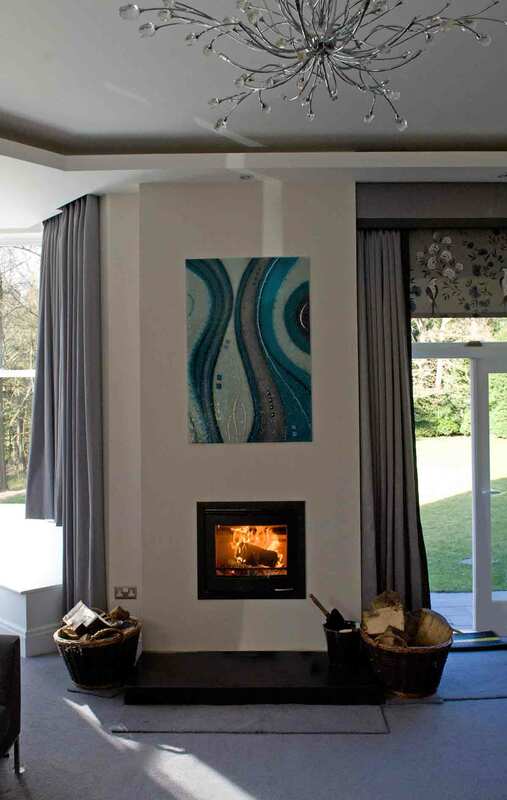 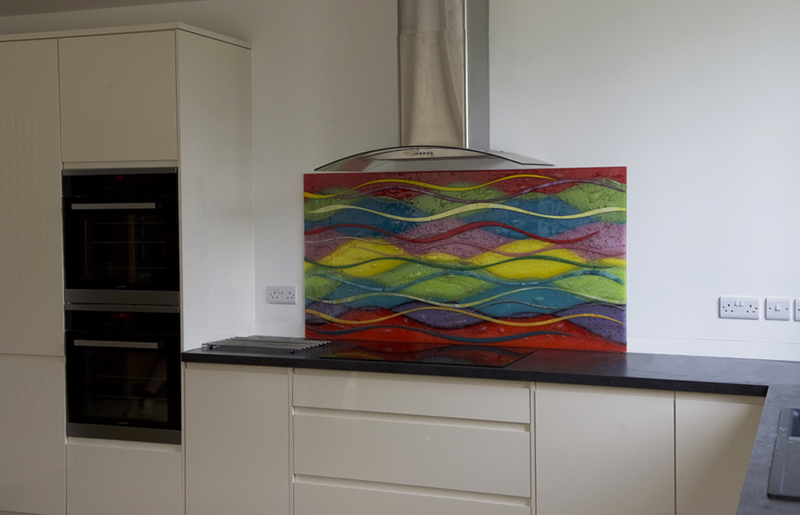 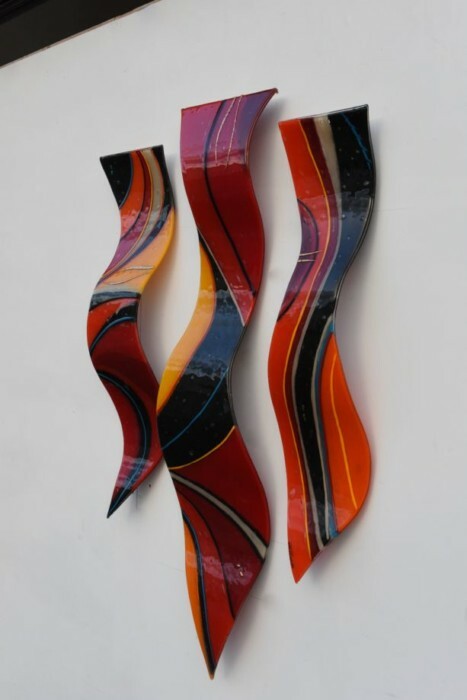 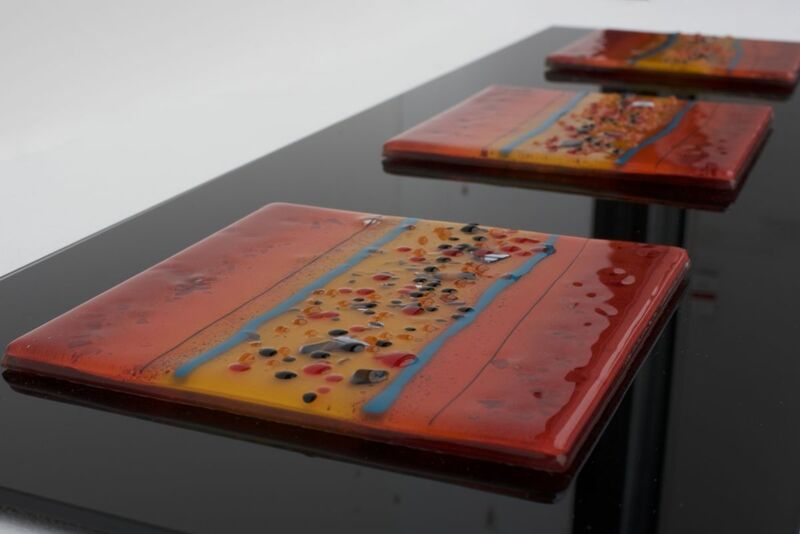 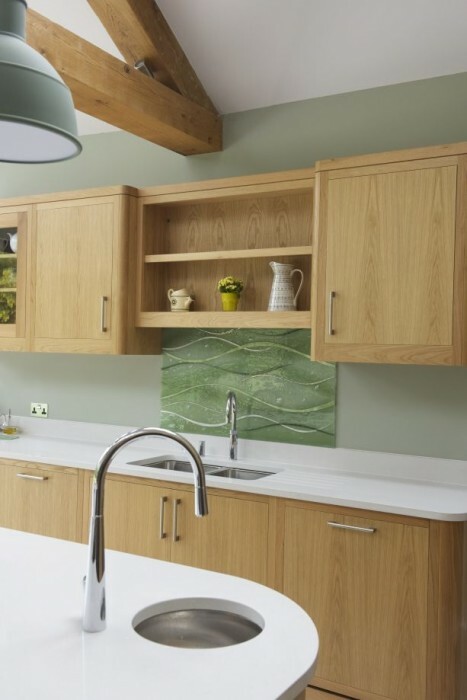 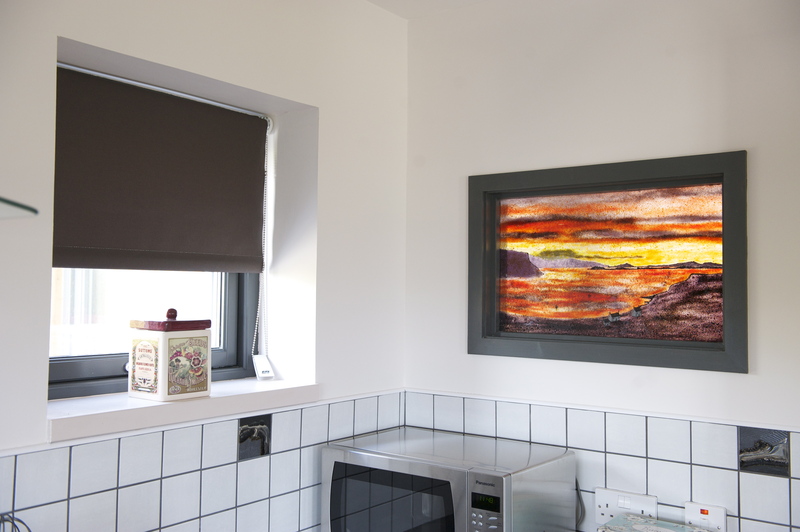 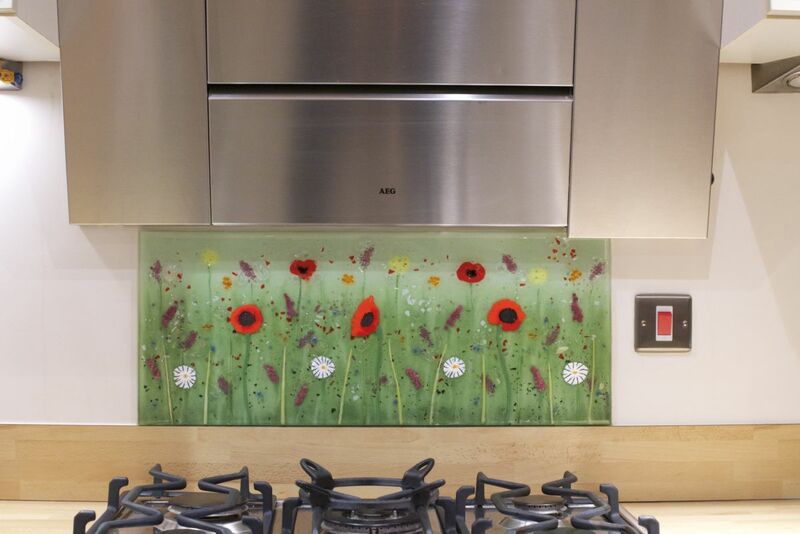 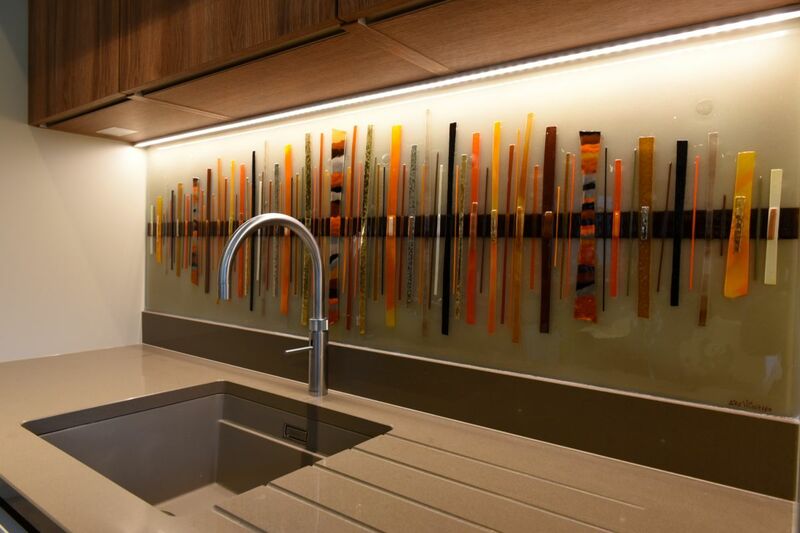 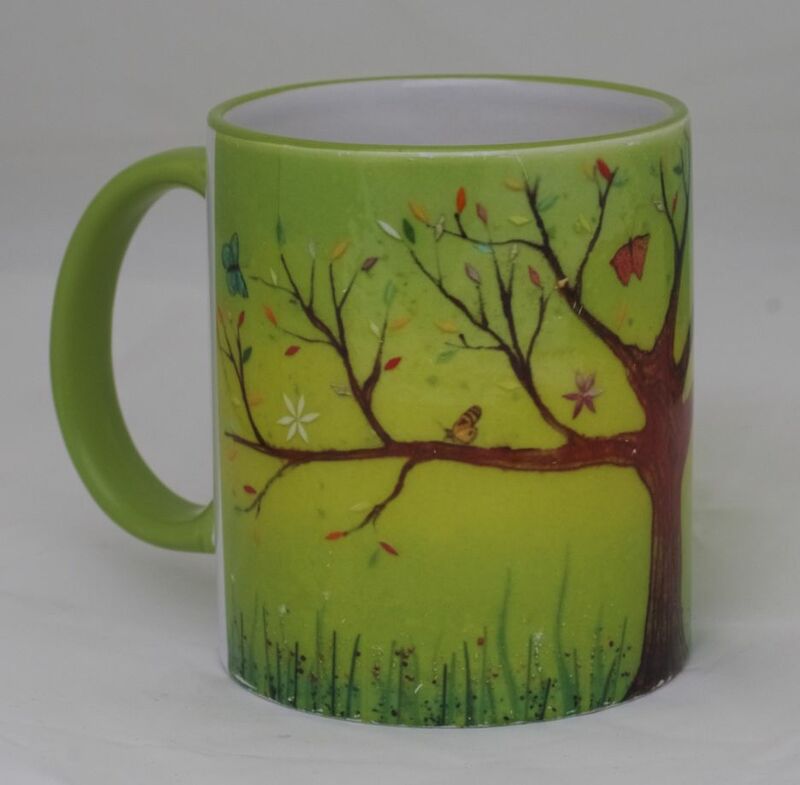 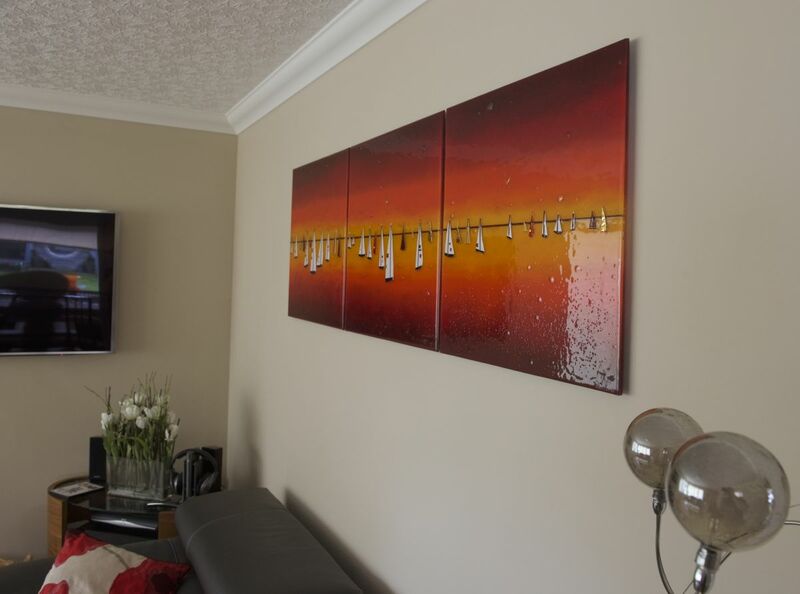 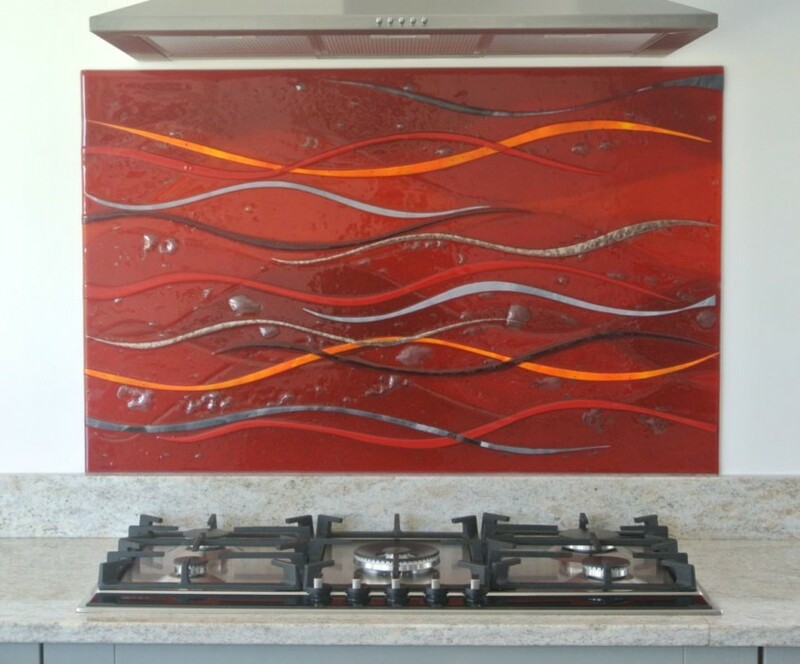 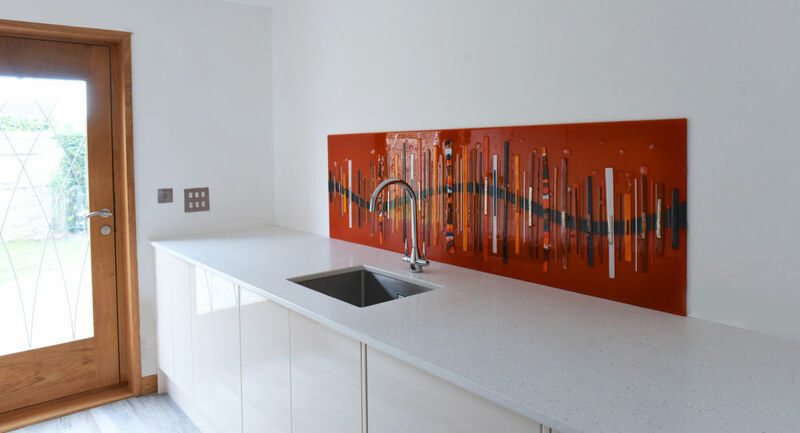 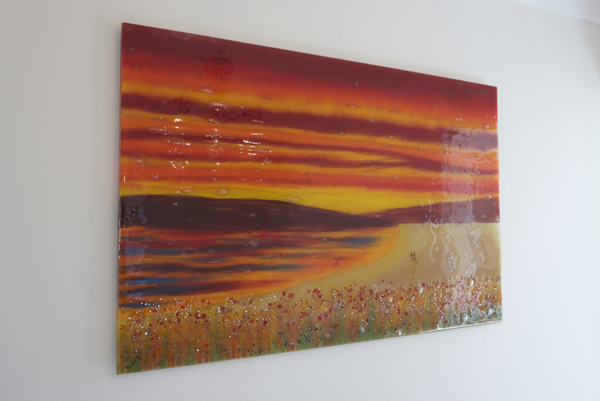 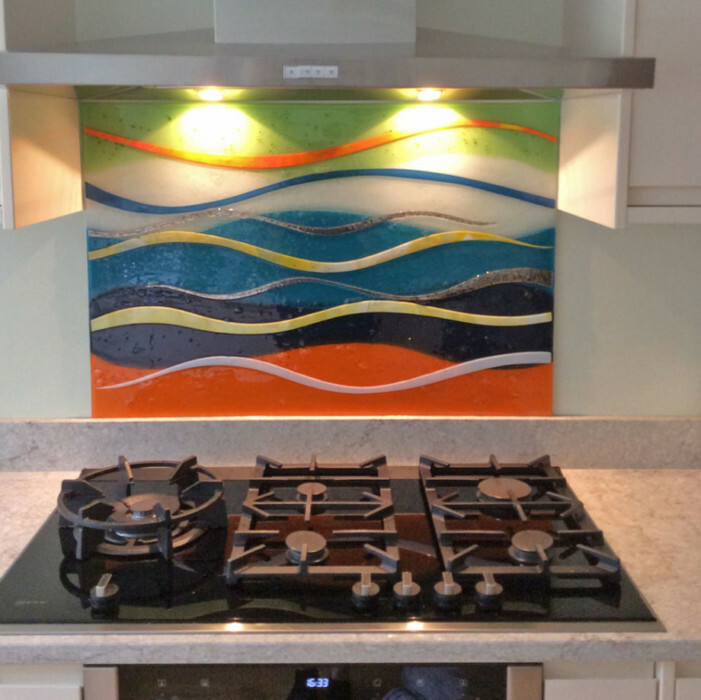 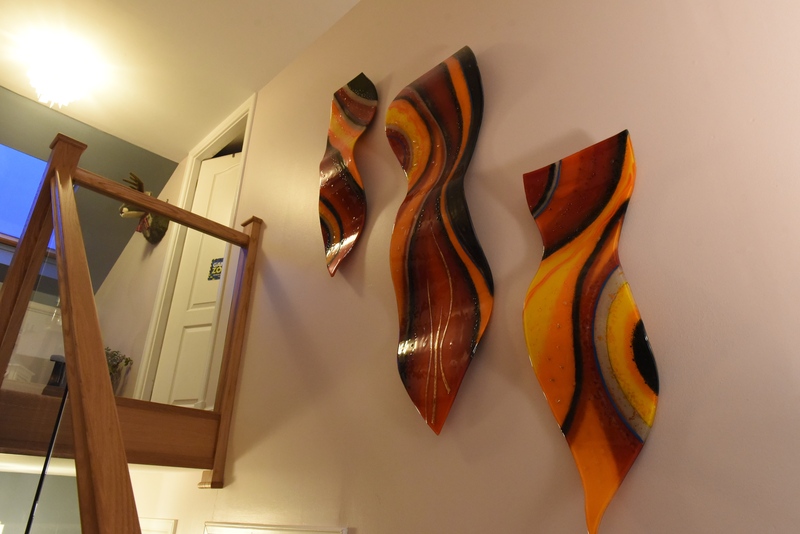 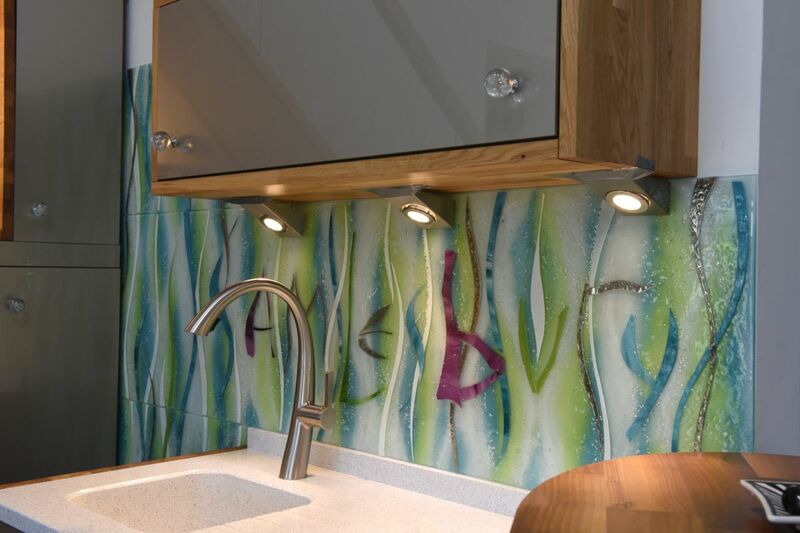 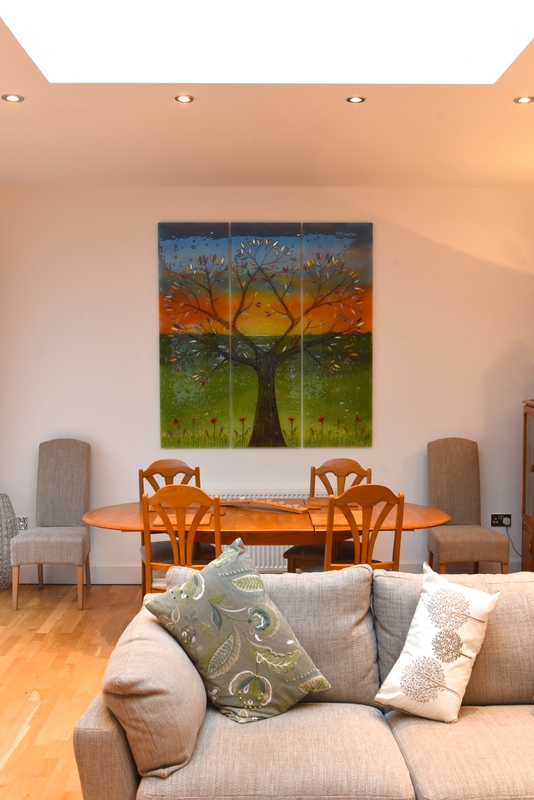 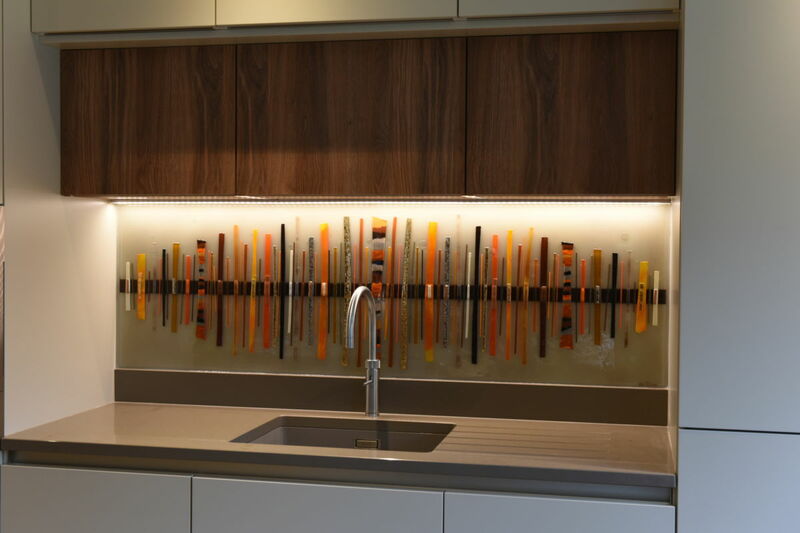 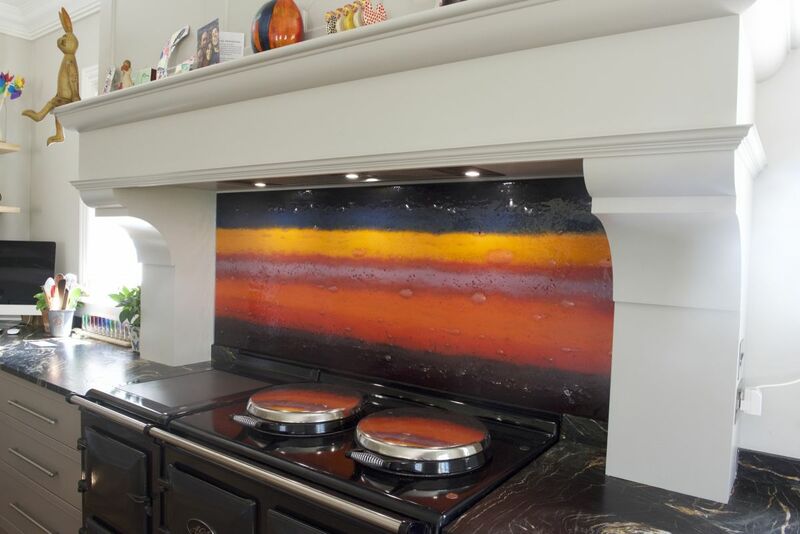 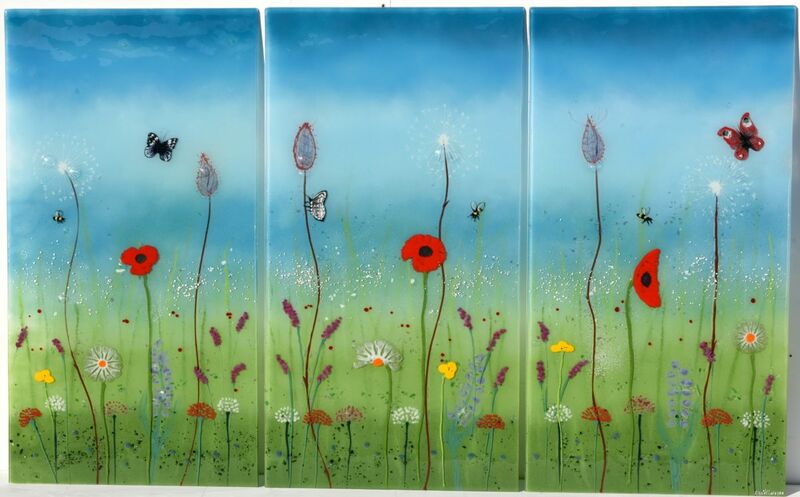 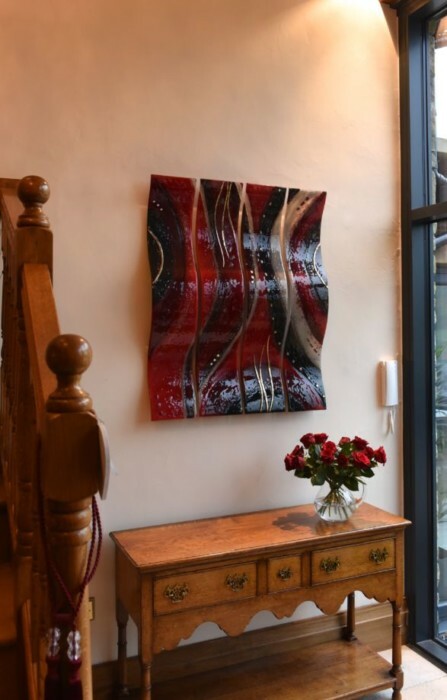 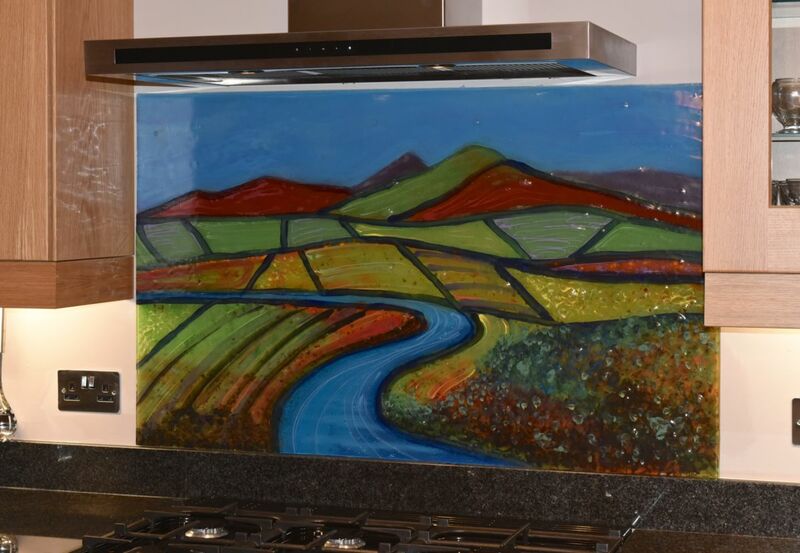 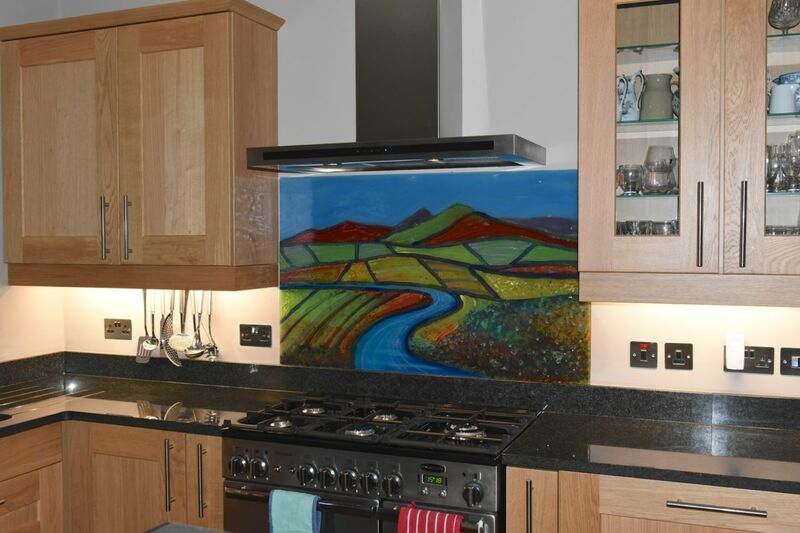 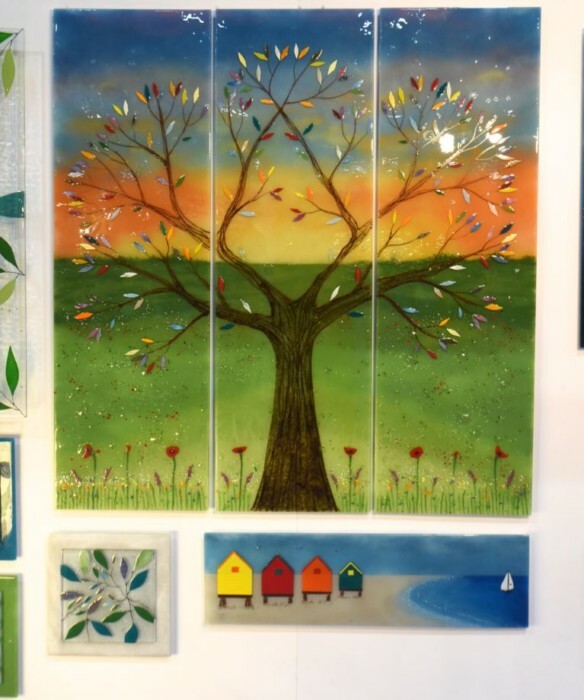 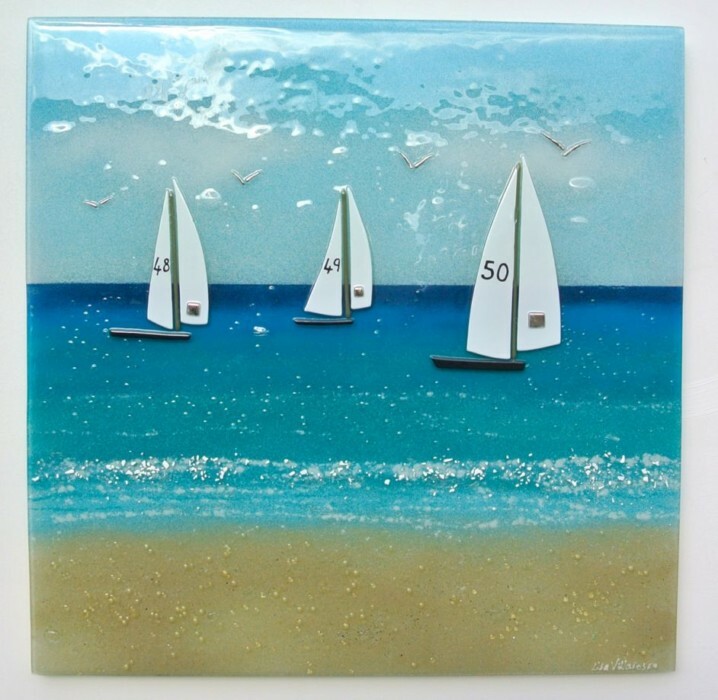 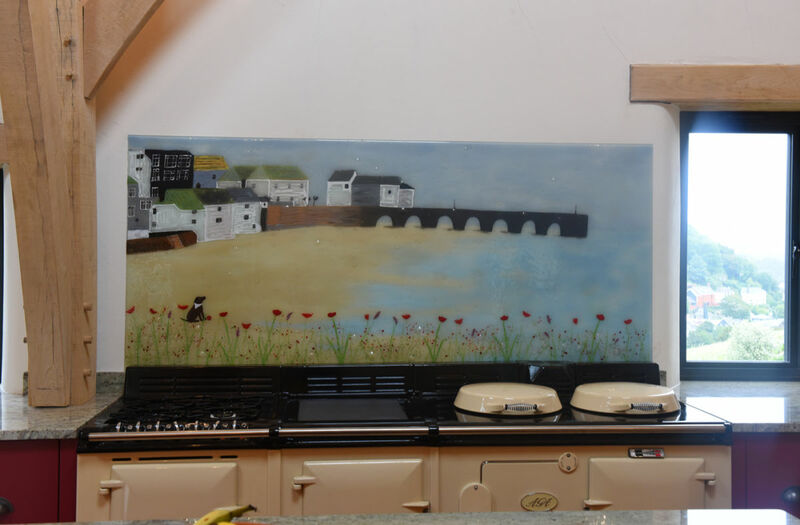 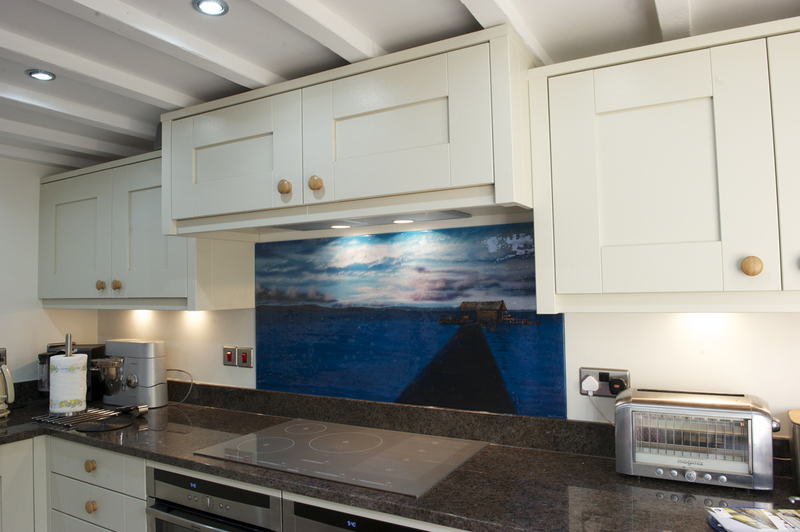 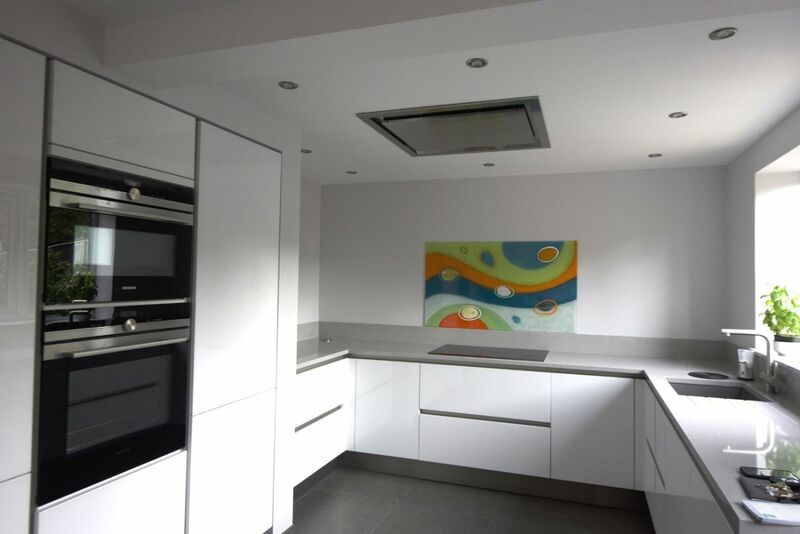 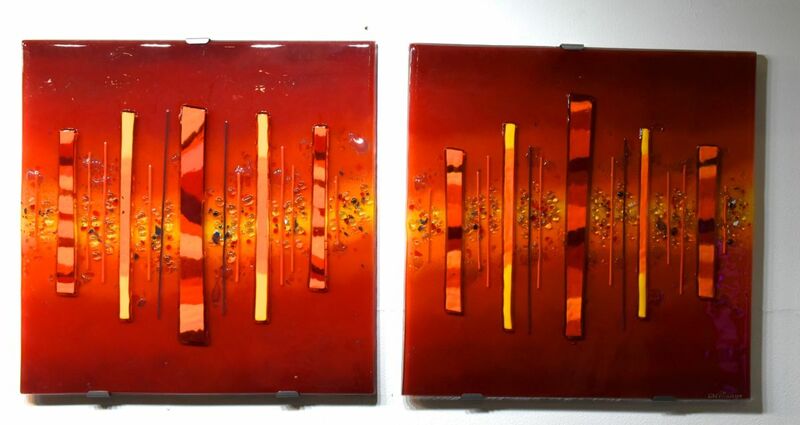 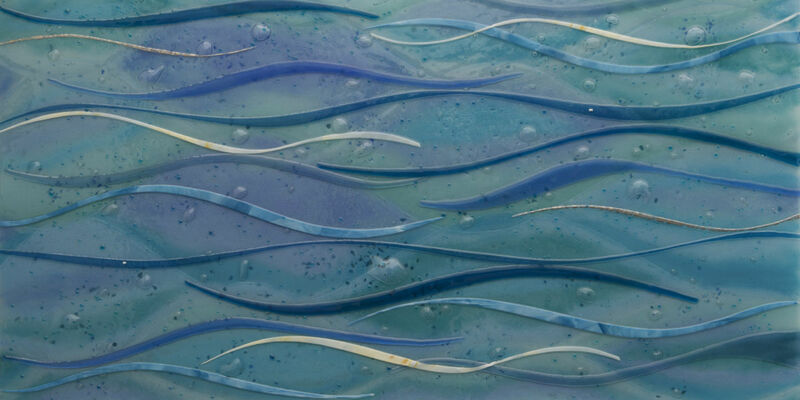 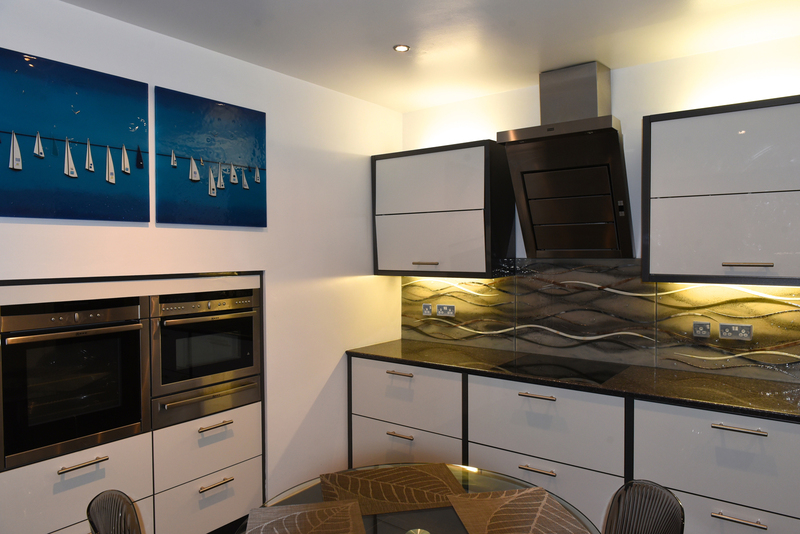 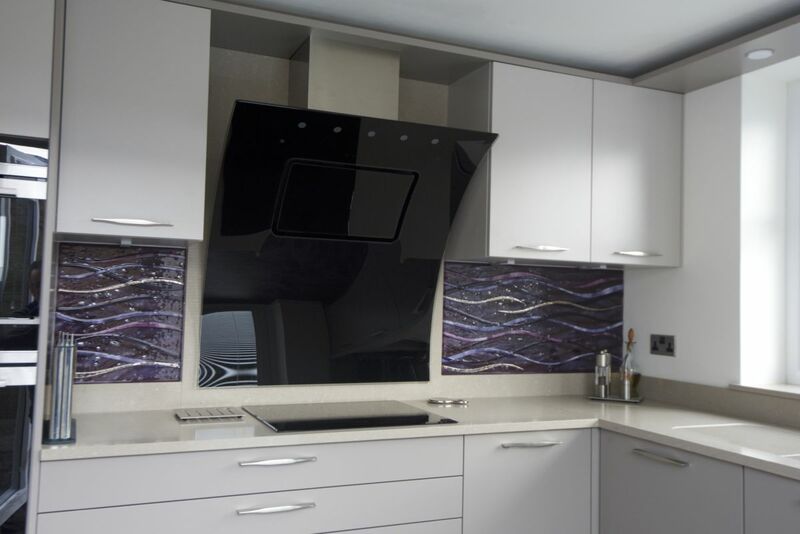 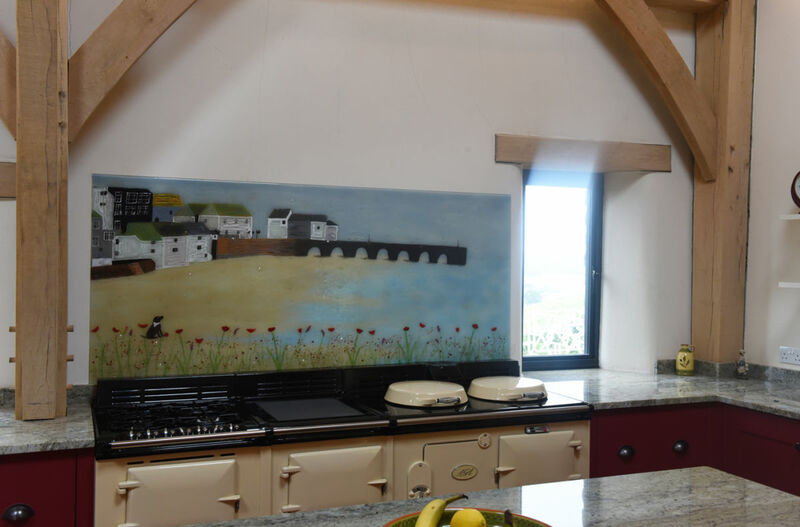 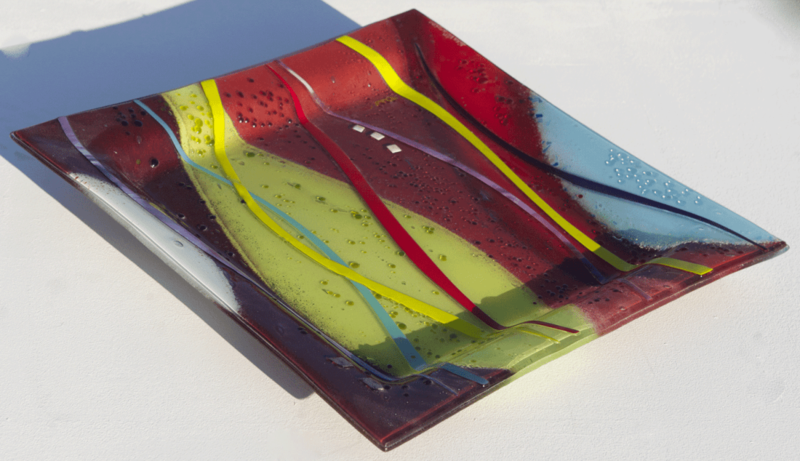 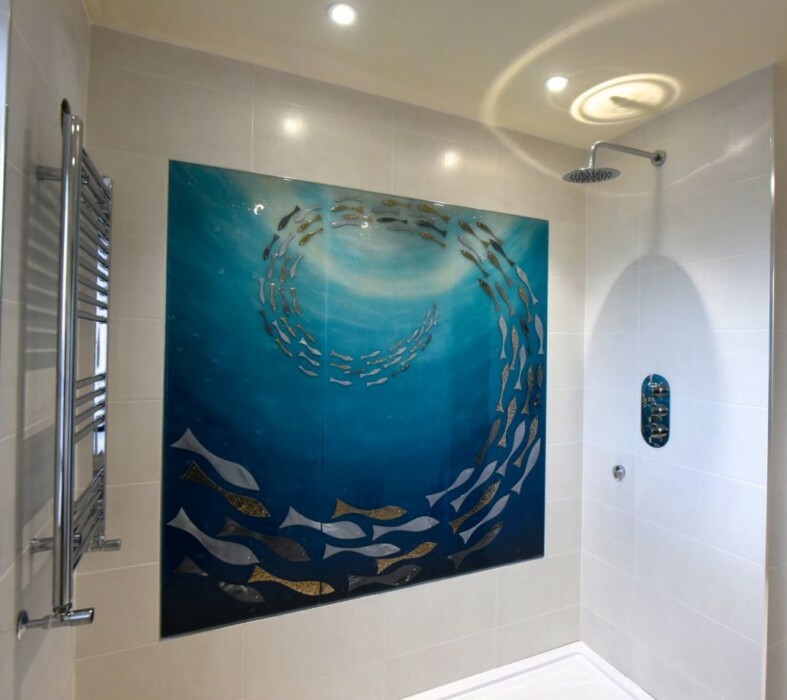 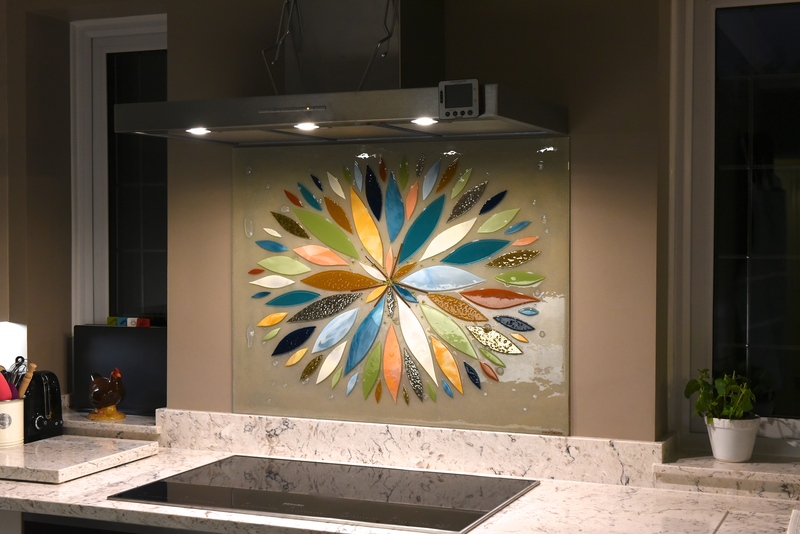 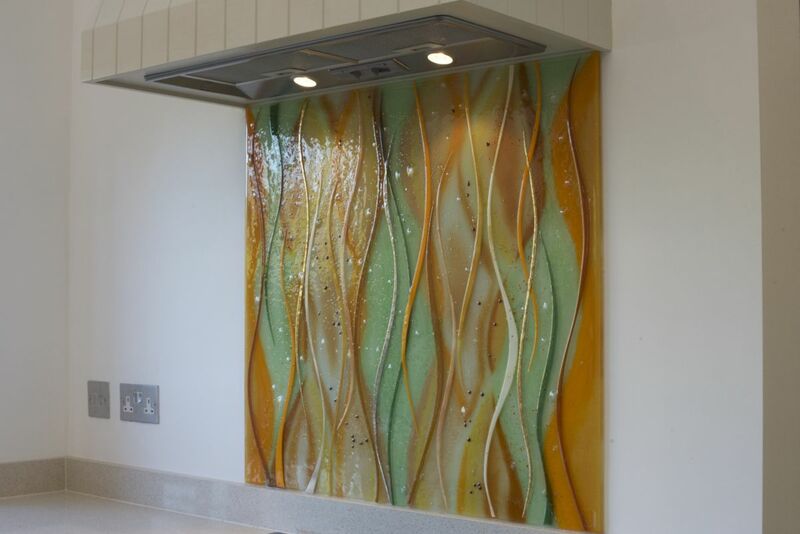 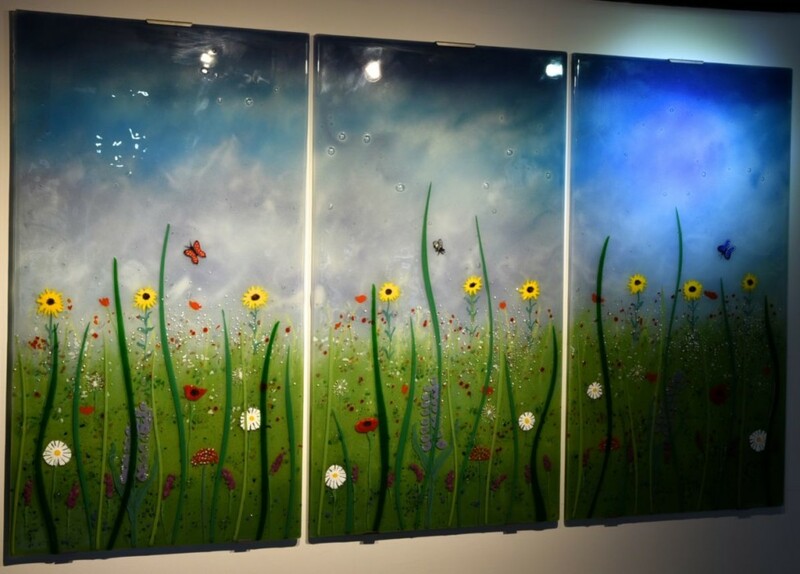 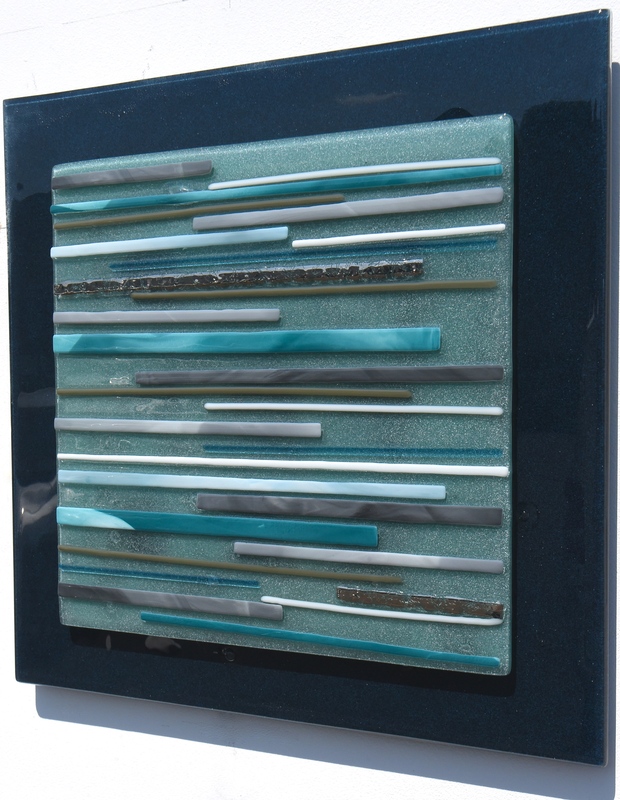 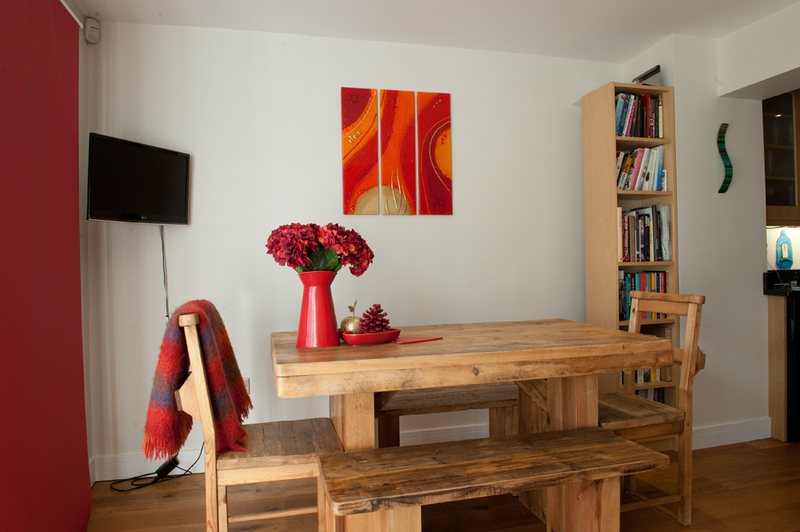 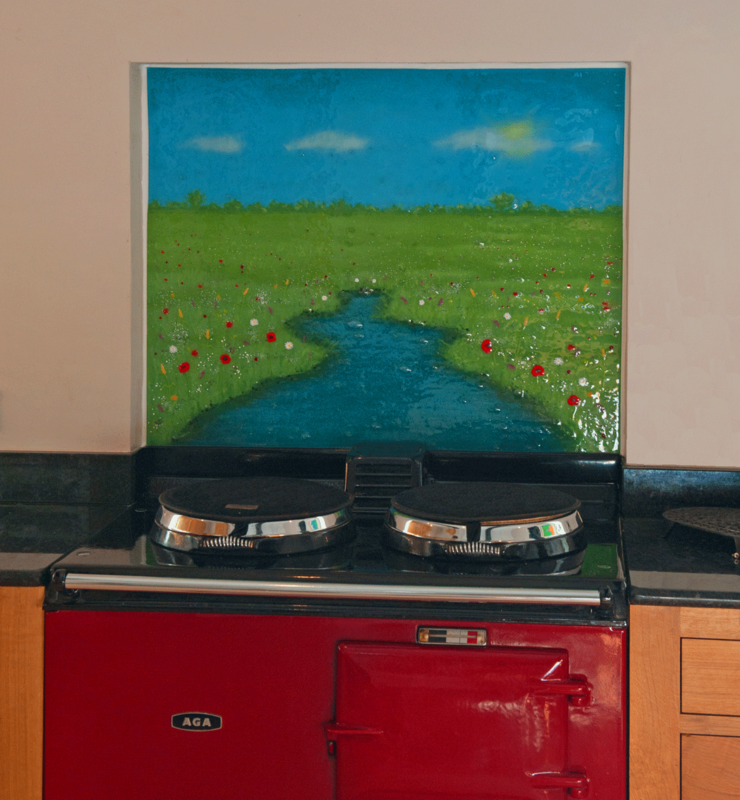 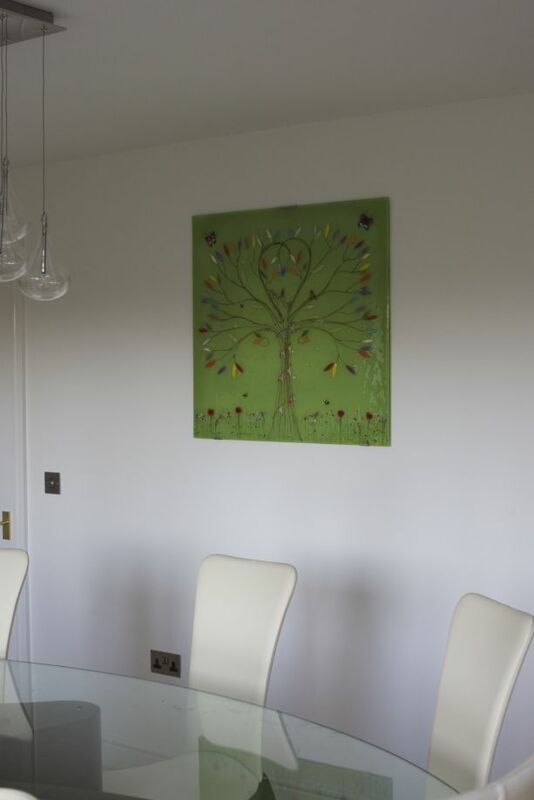 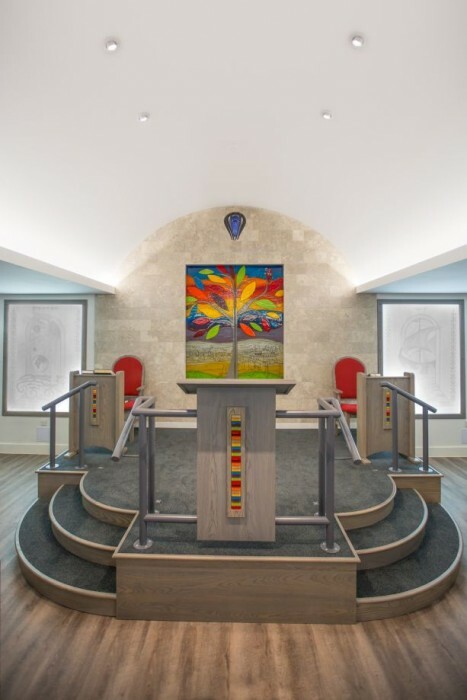 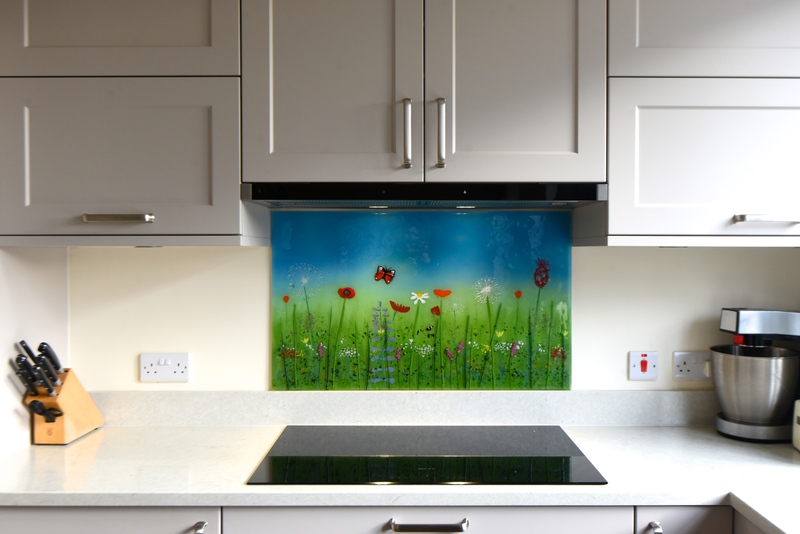 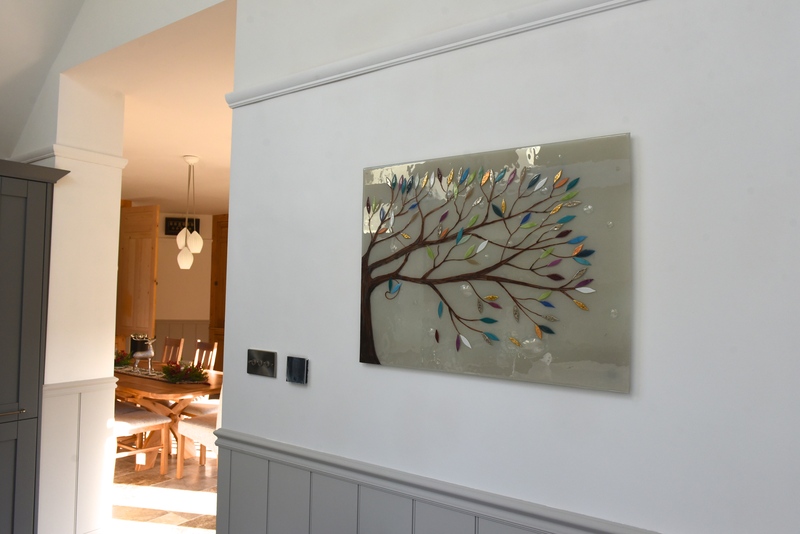 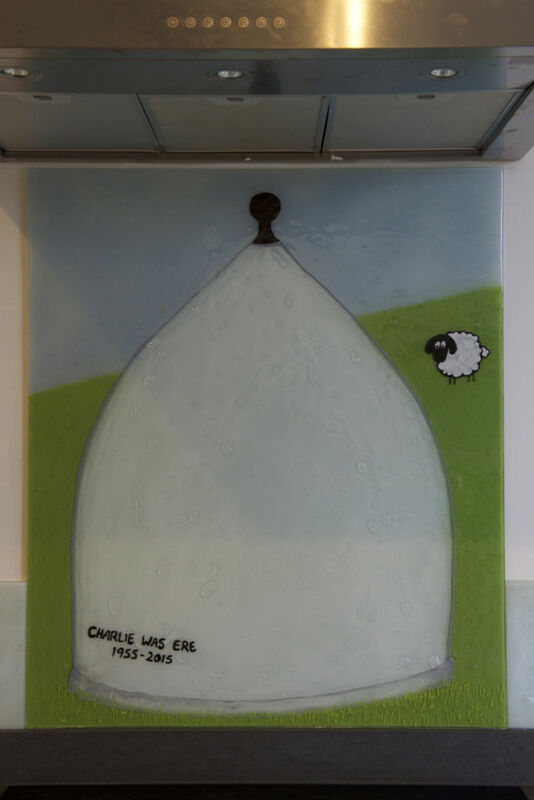 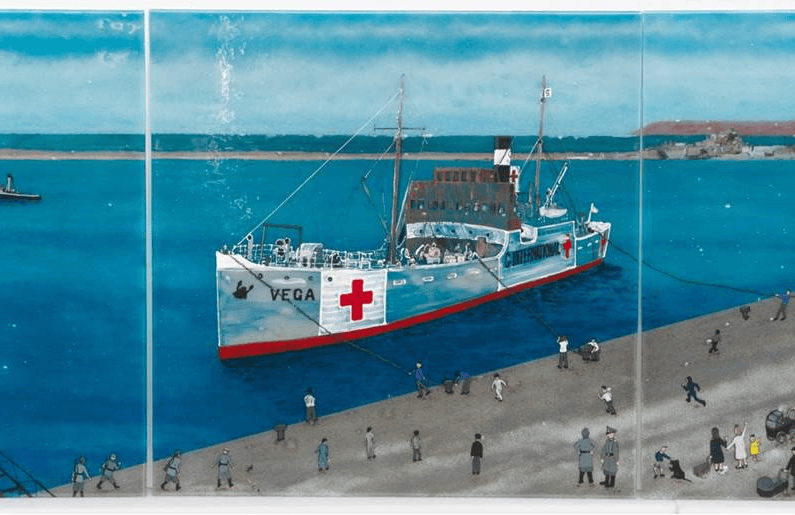 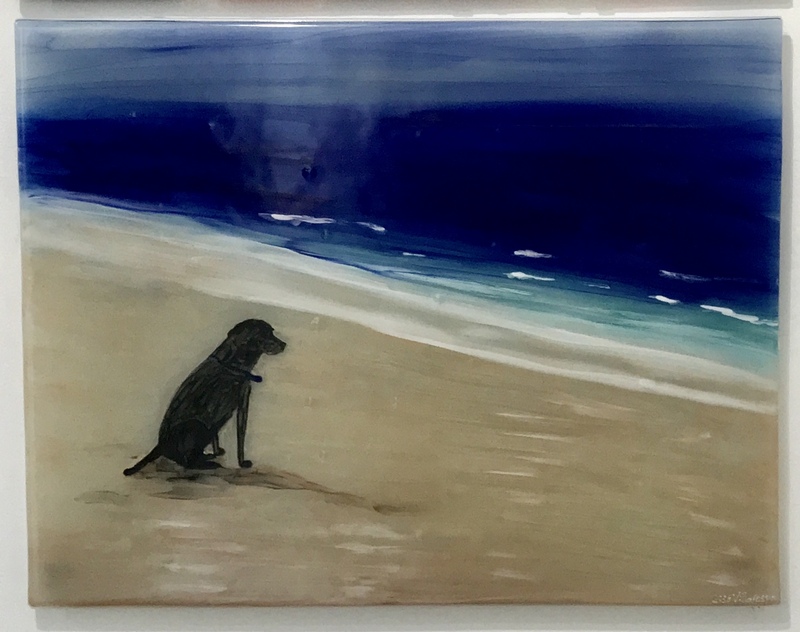 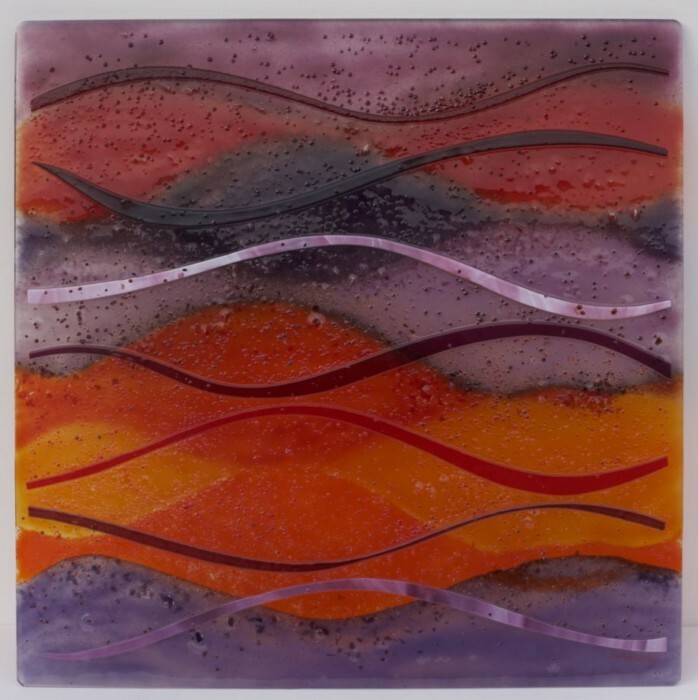 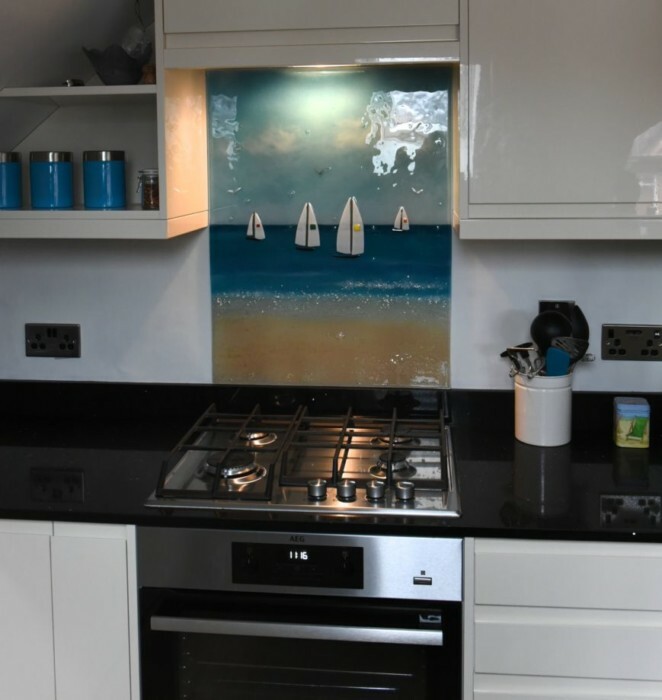 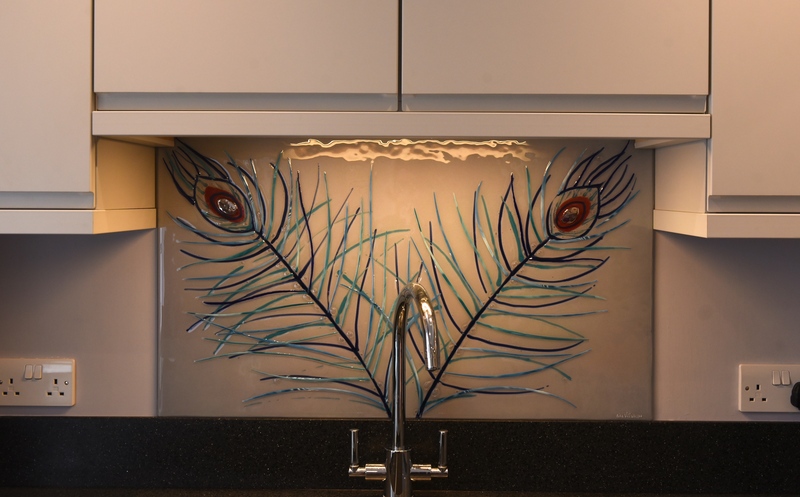 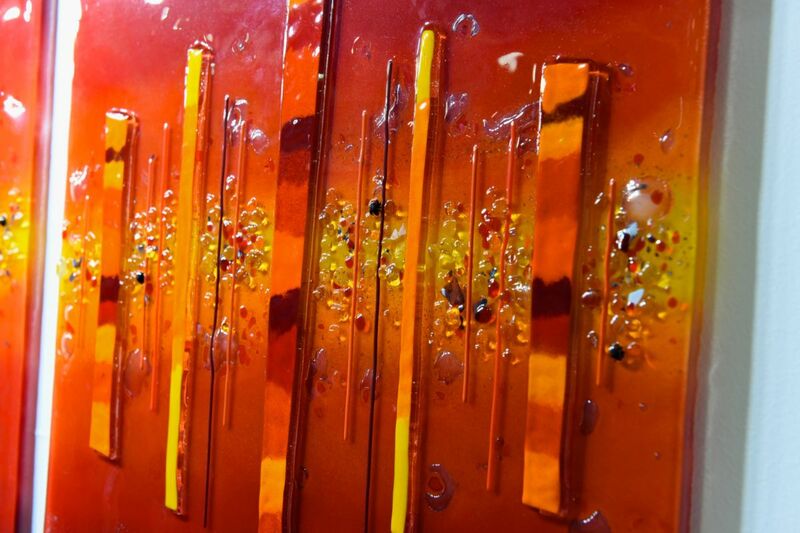 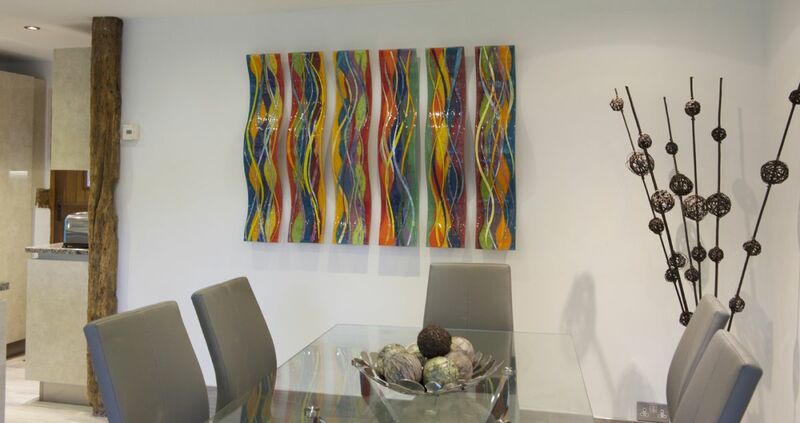 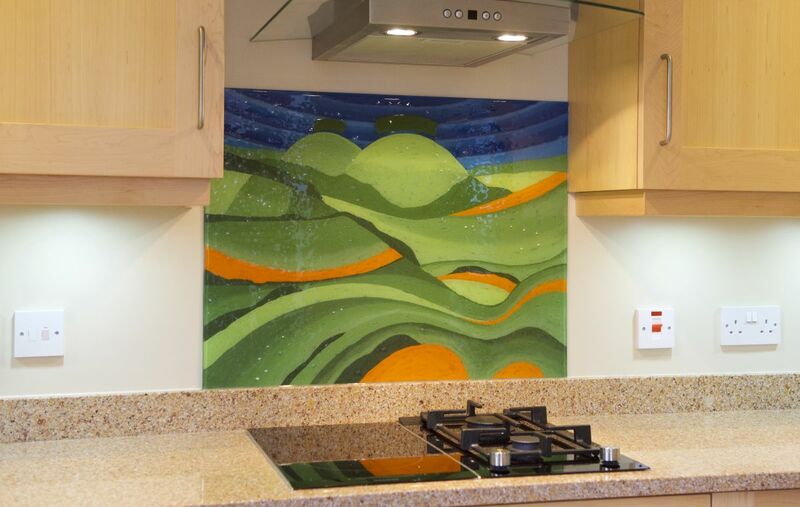 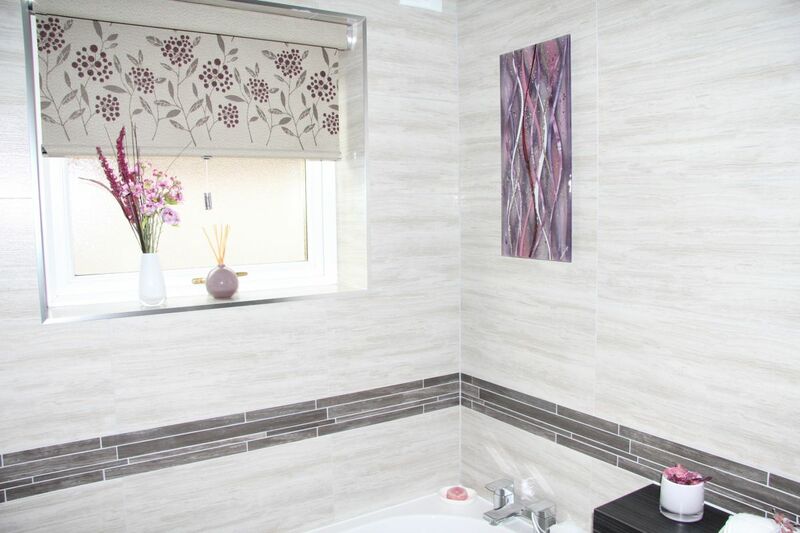 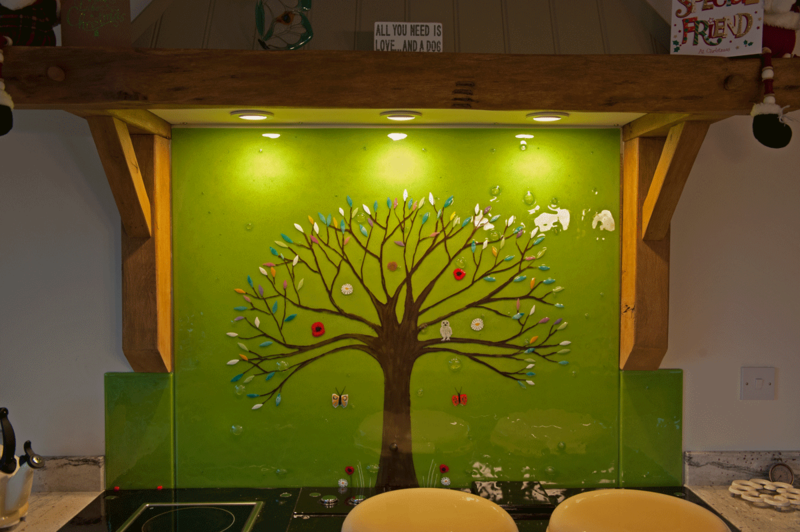 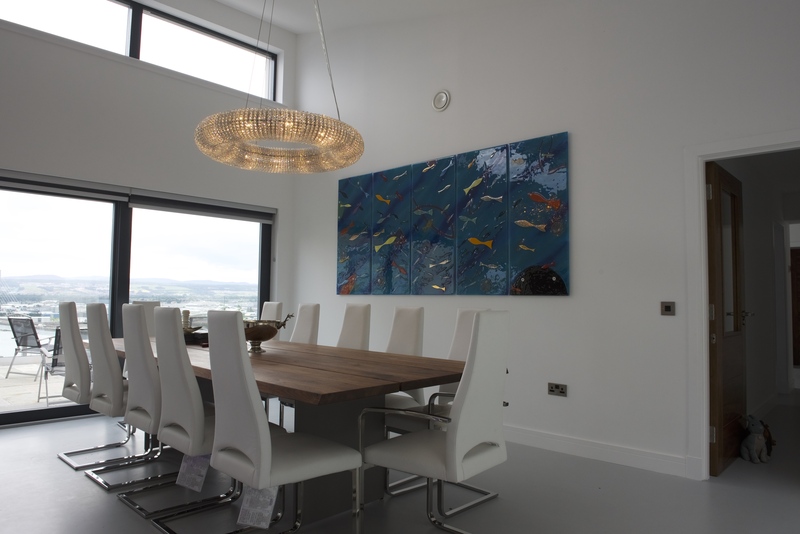 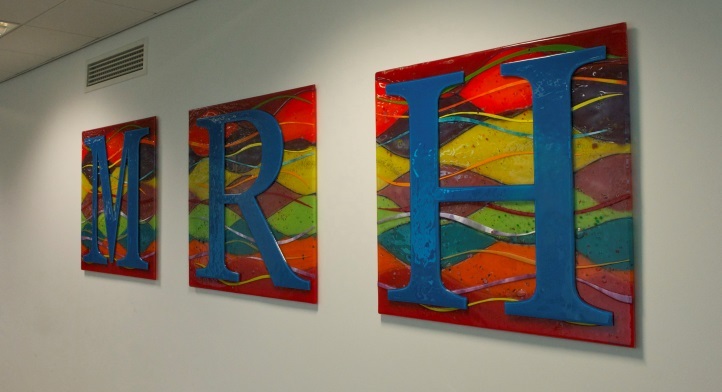 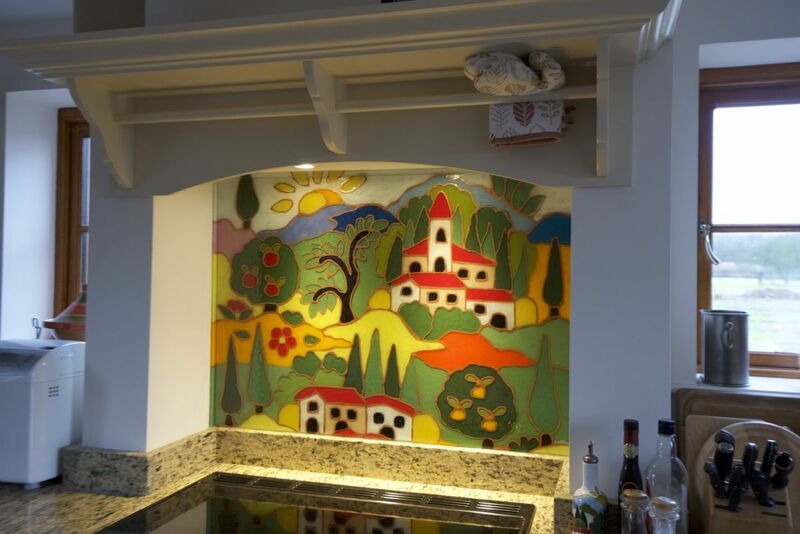 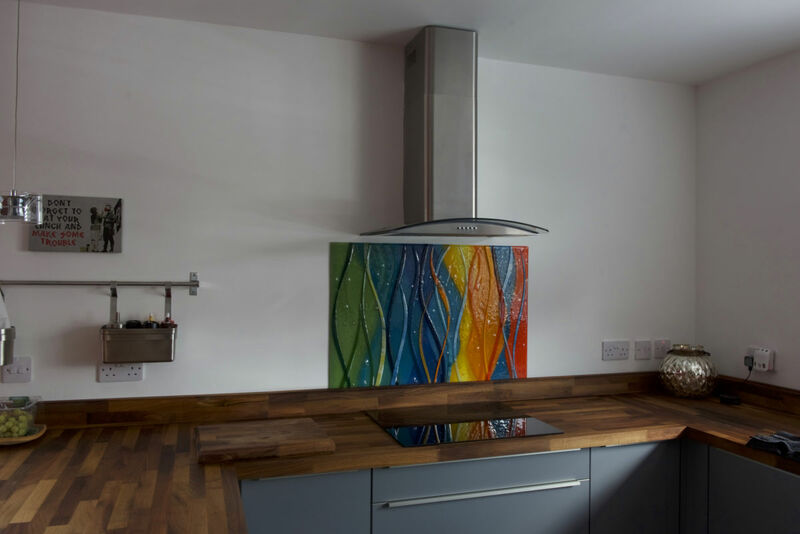 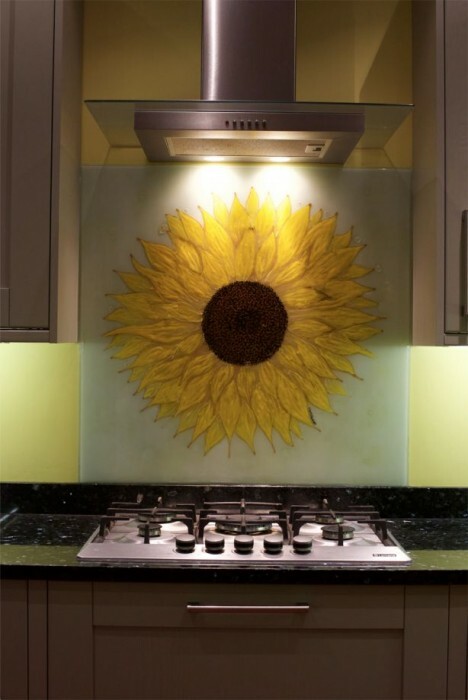 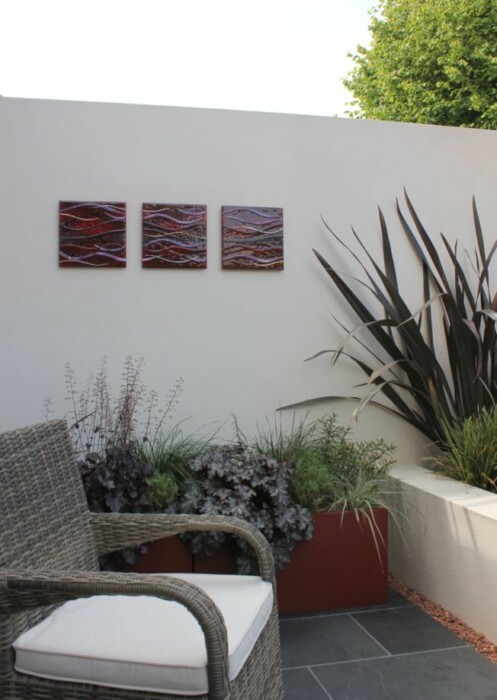 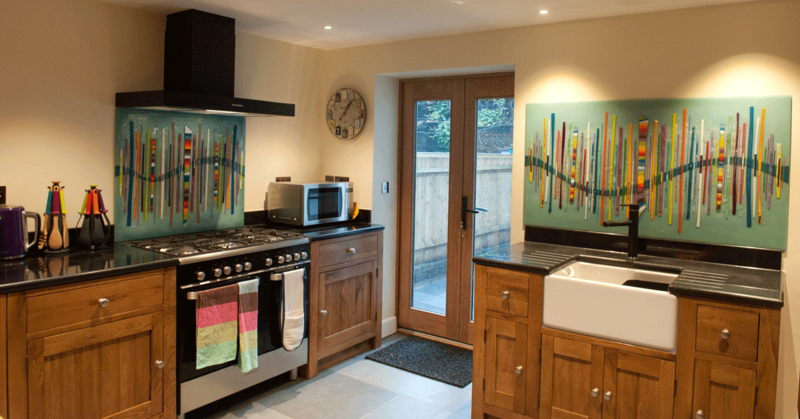 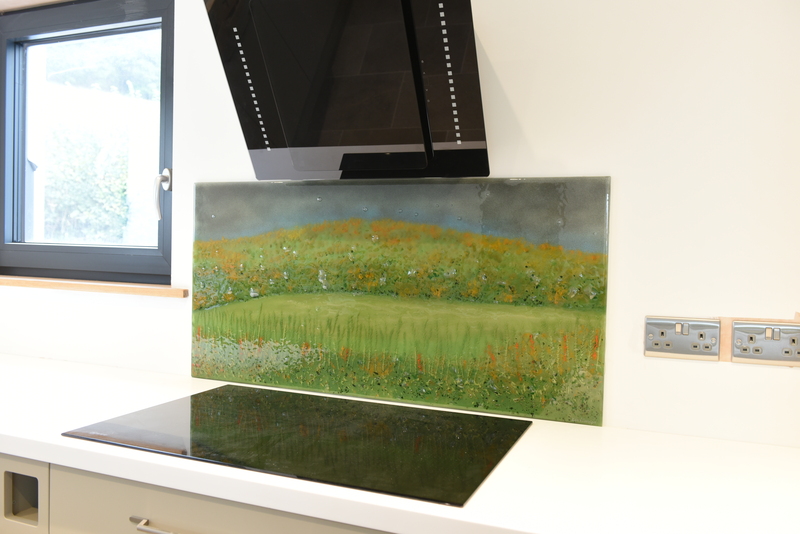 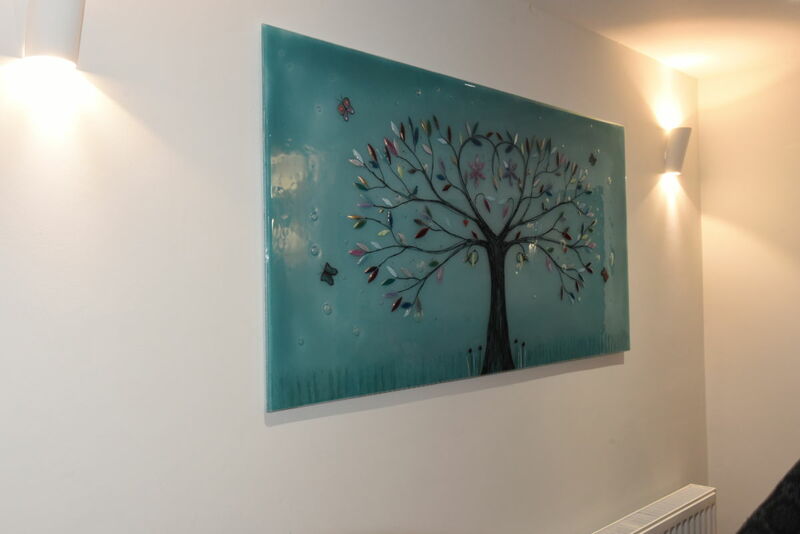 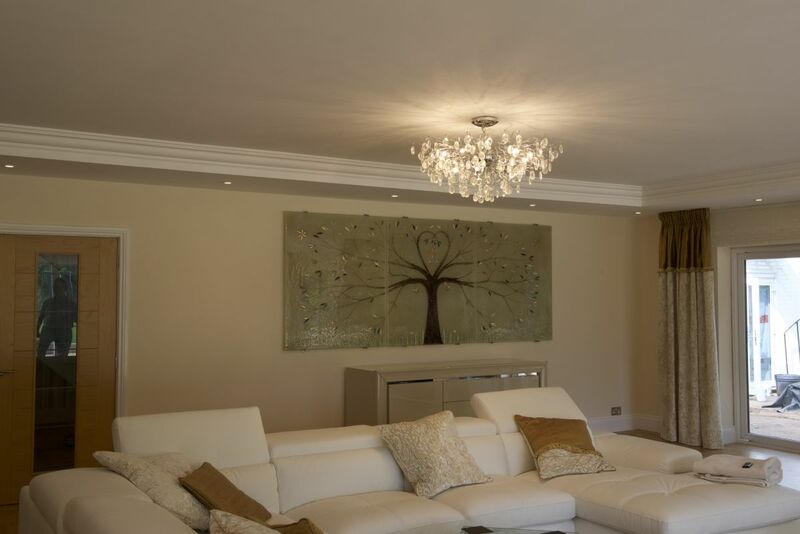 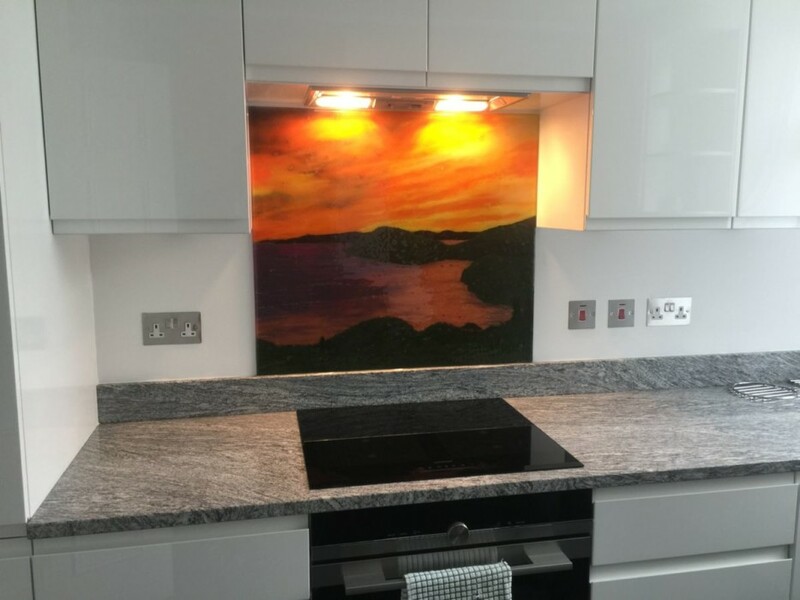 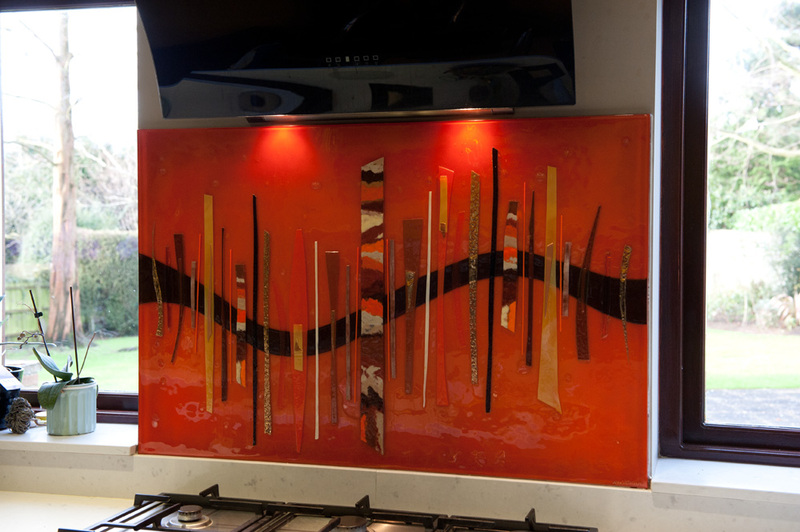 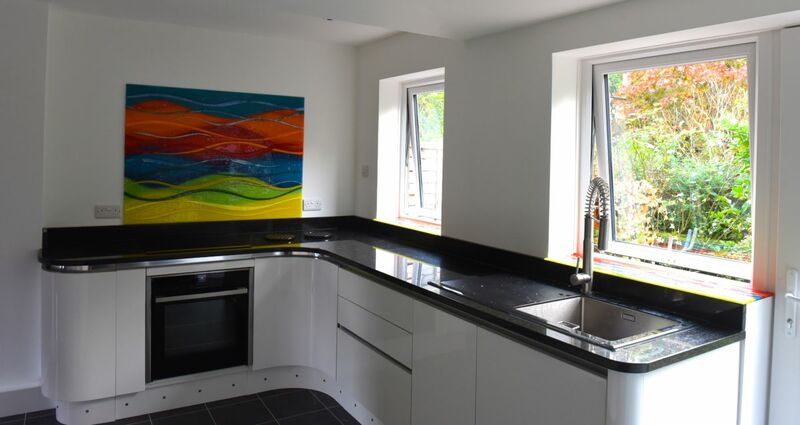 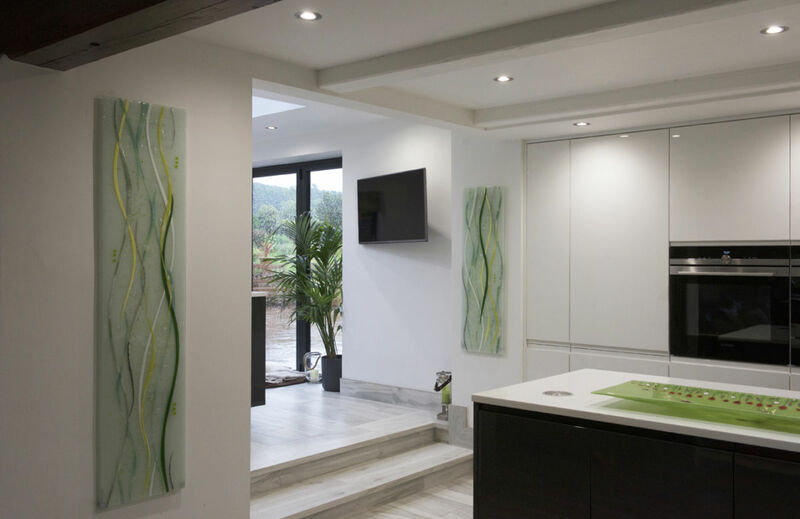 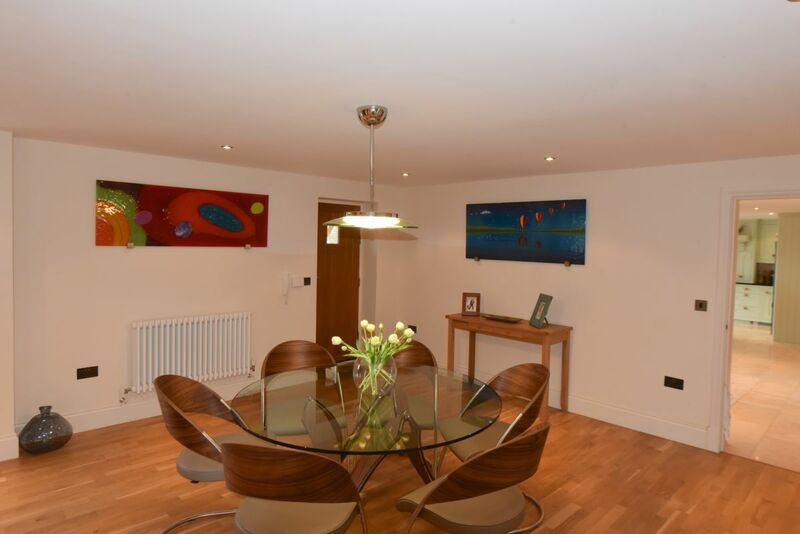 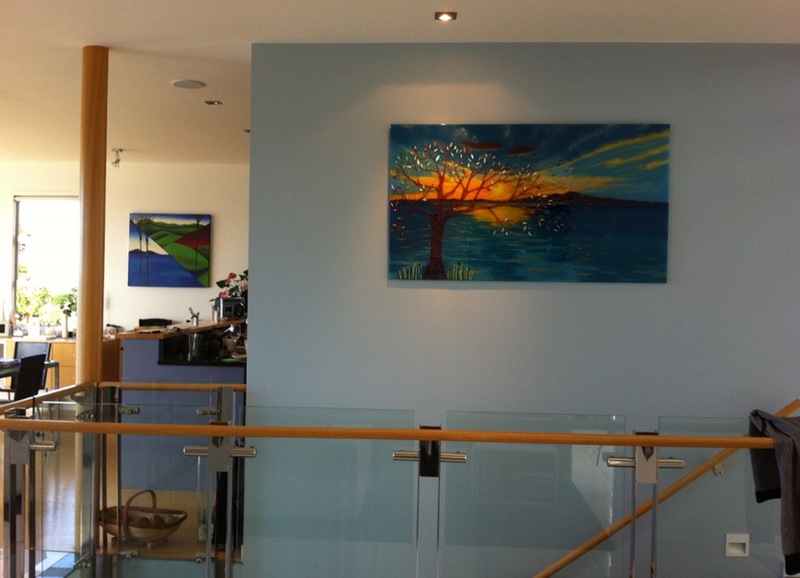 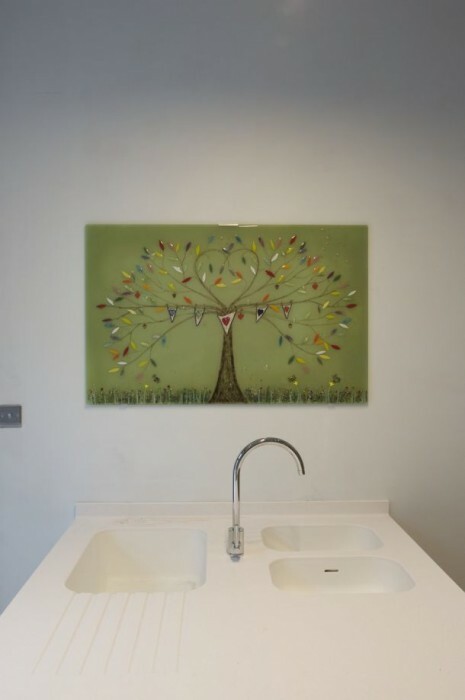 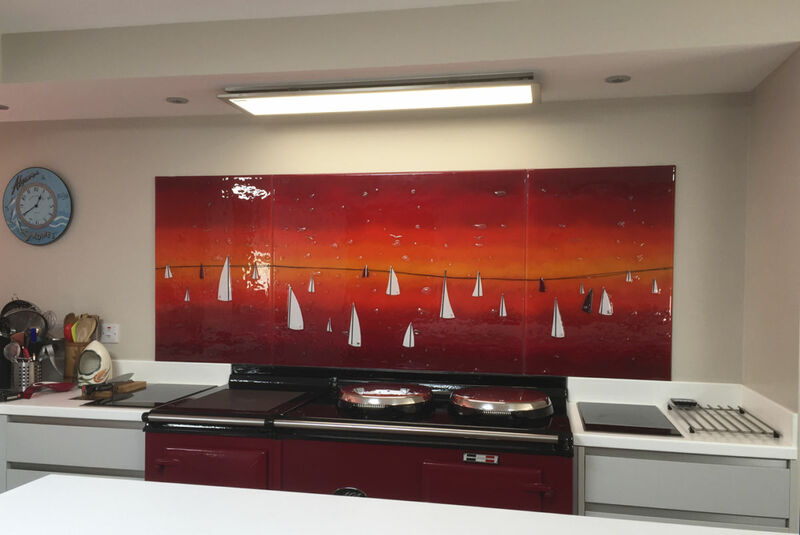 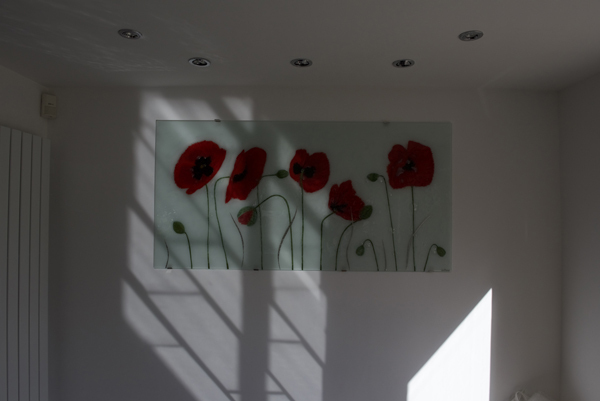 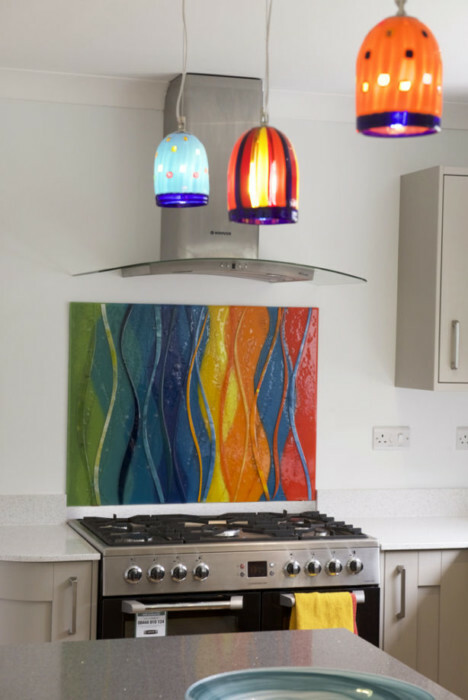 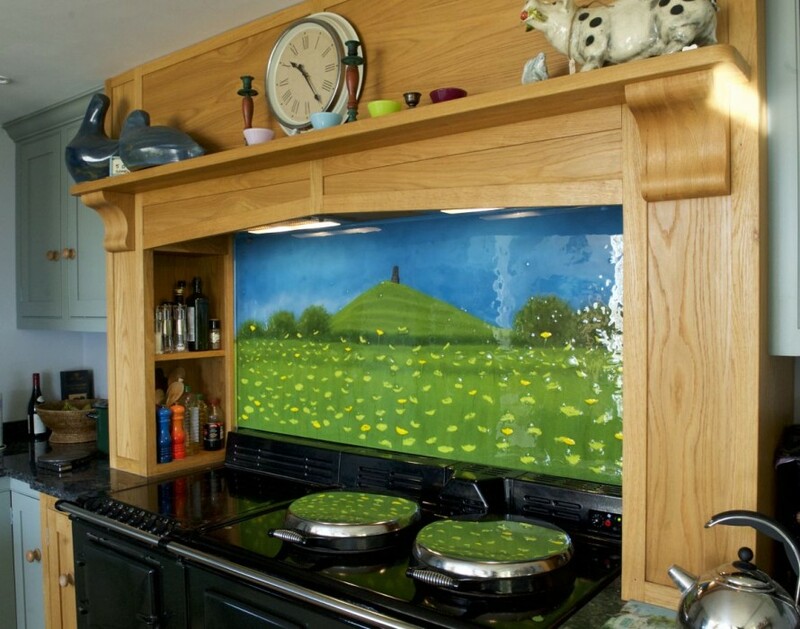 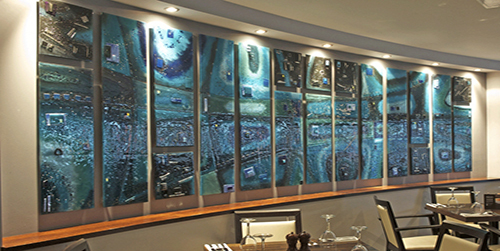 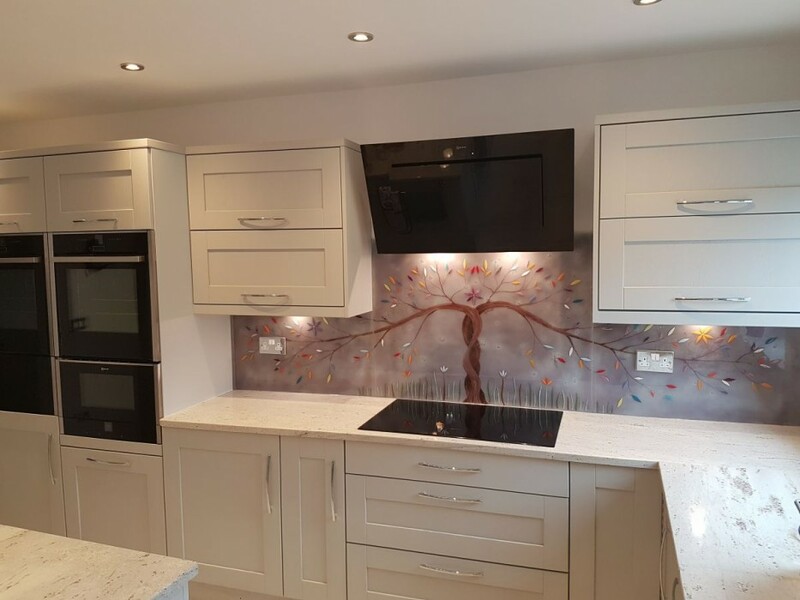 From memorial bowls, drinks coasters and other accessories all the way to grand kitchen art, wall panels and glass splashbacks Cheshire-wide, like this one, there’s not much we can’t do for you. 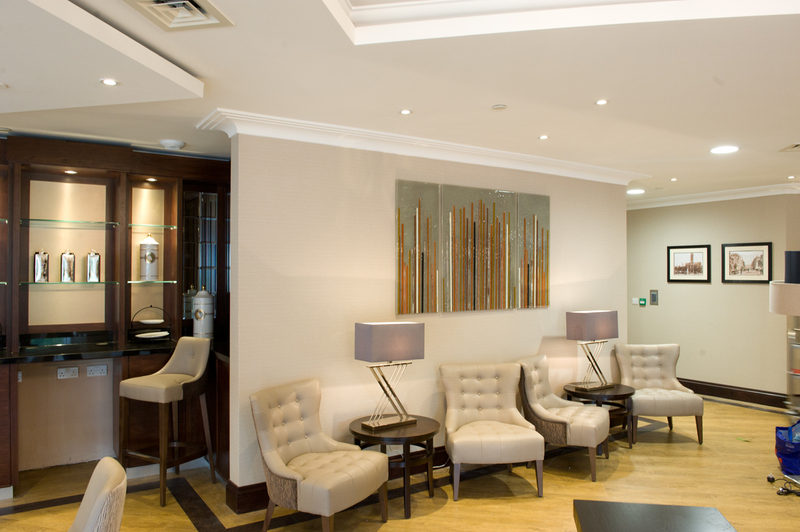 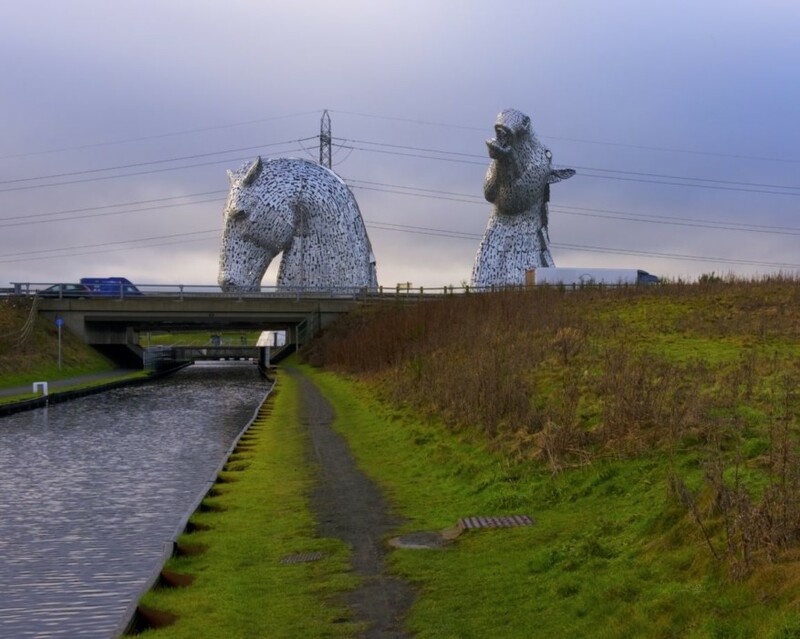 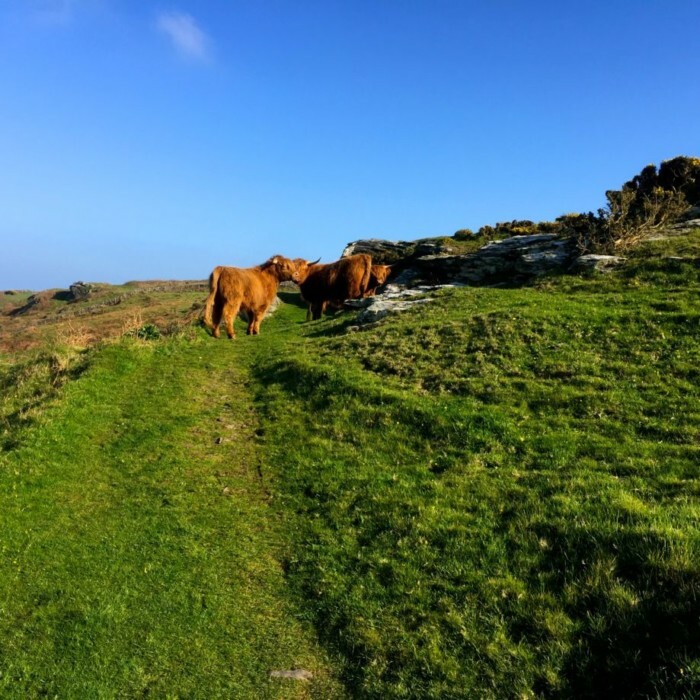 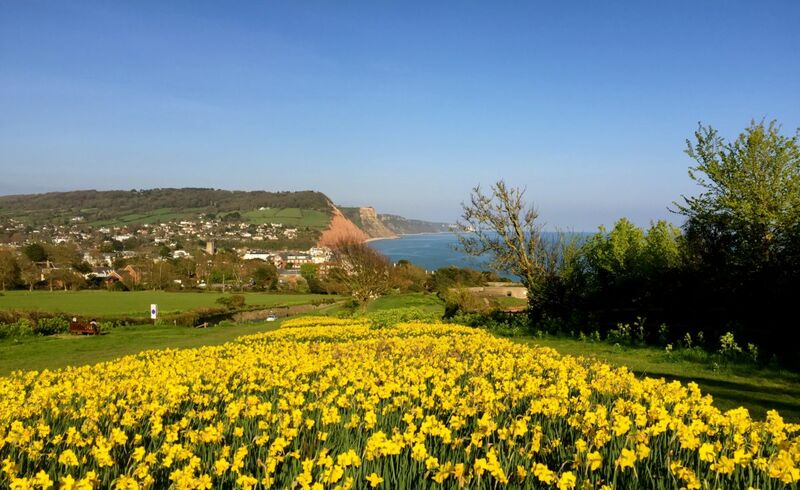 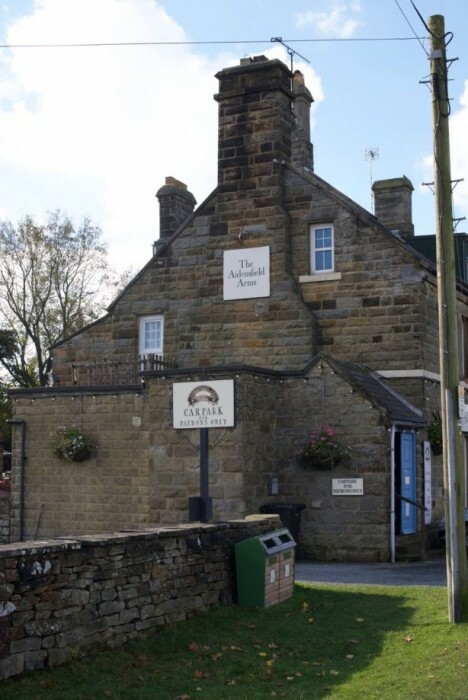 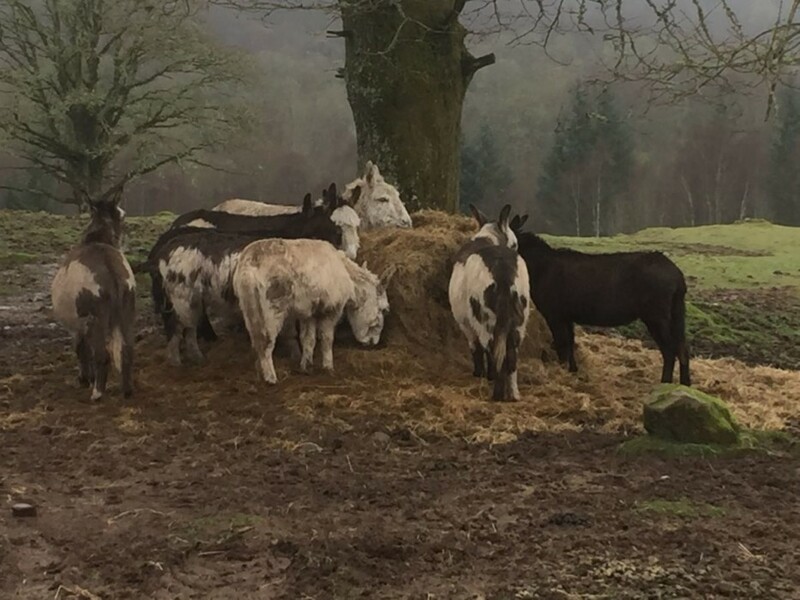 All we need is to hear your best ideas as soon as possible, so don’t wait to pick up the phone and get in touch as soon as you can!